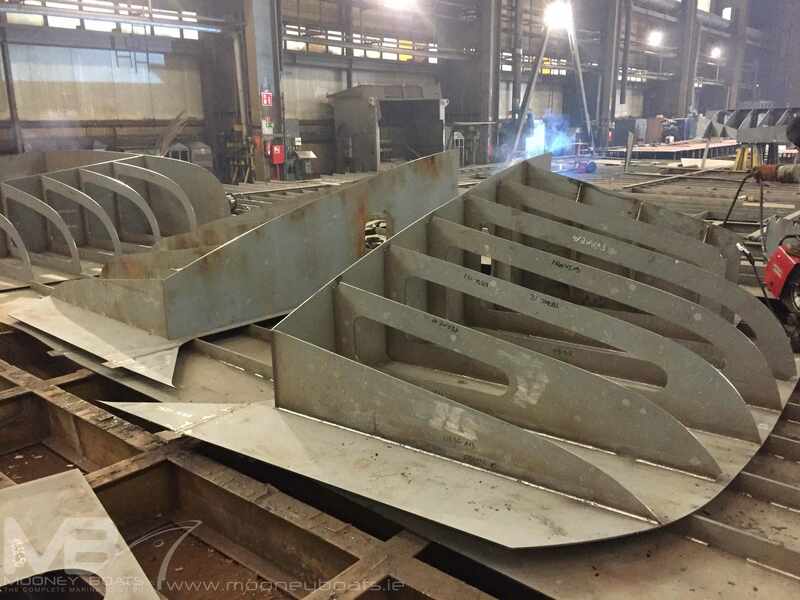 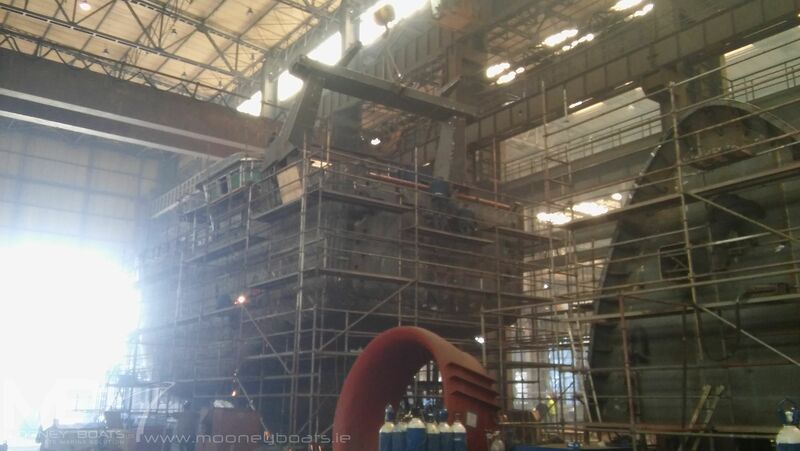 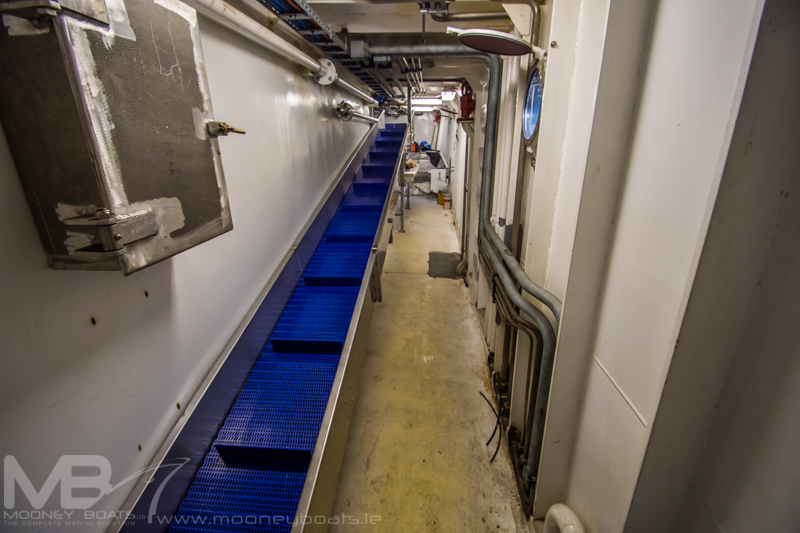 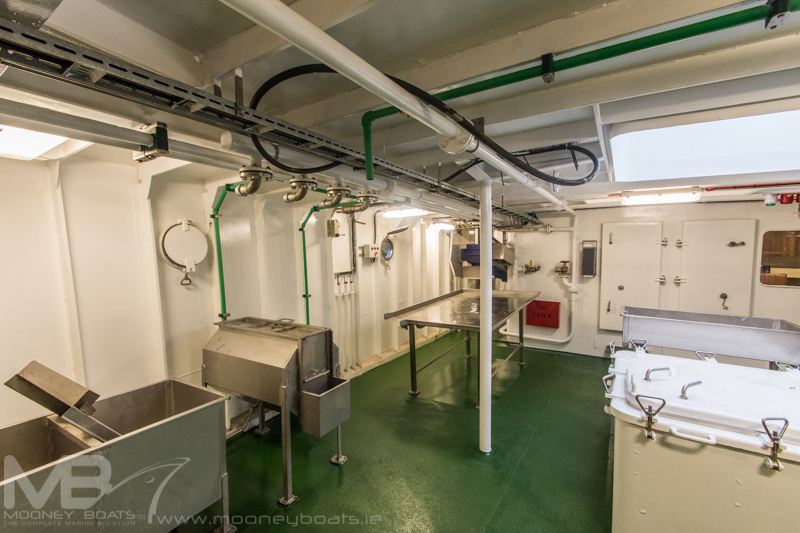 Mooney Boats Ltd has just completed their third purpose built prawn freezer trawler. 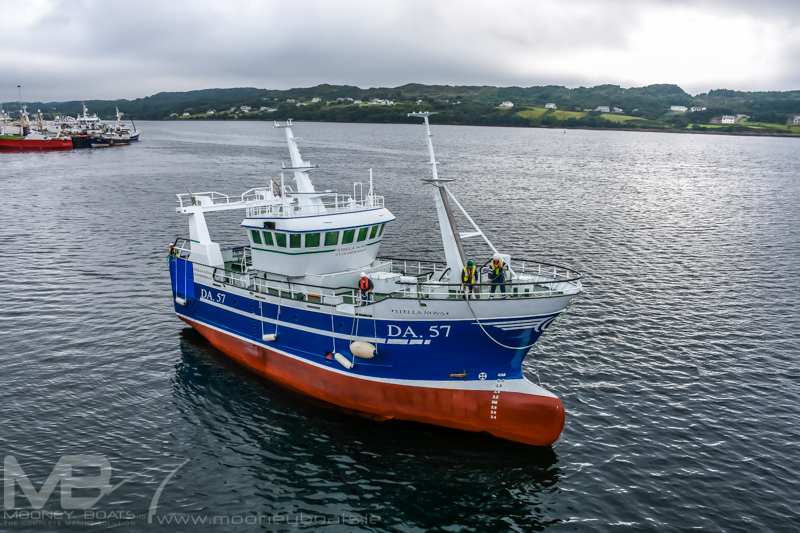 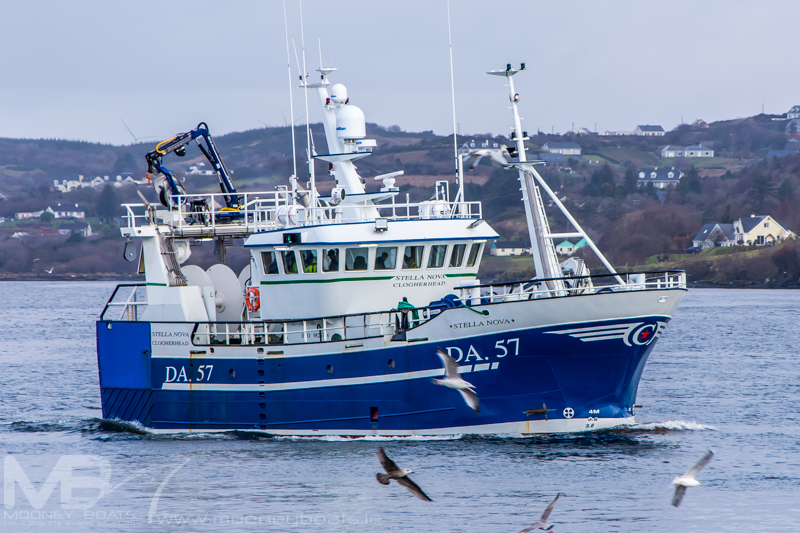 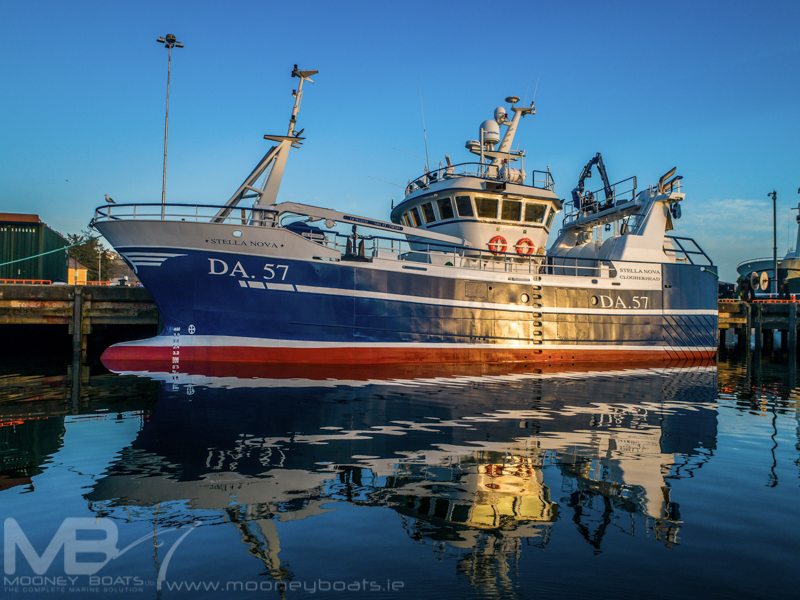 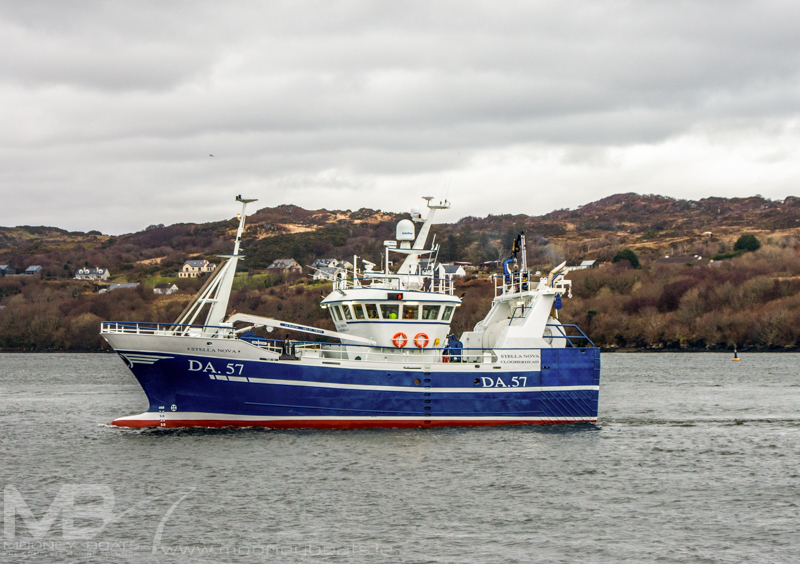 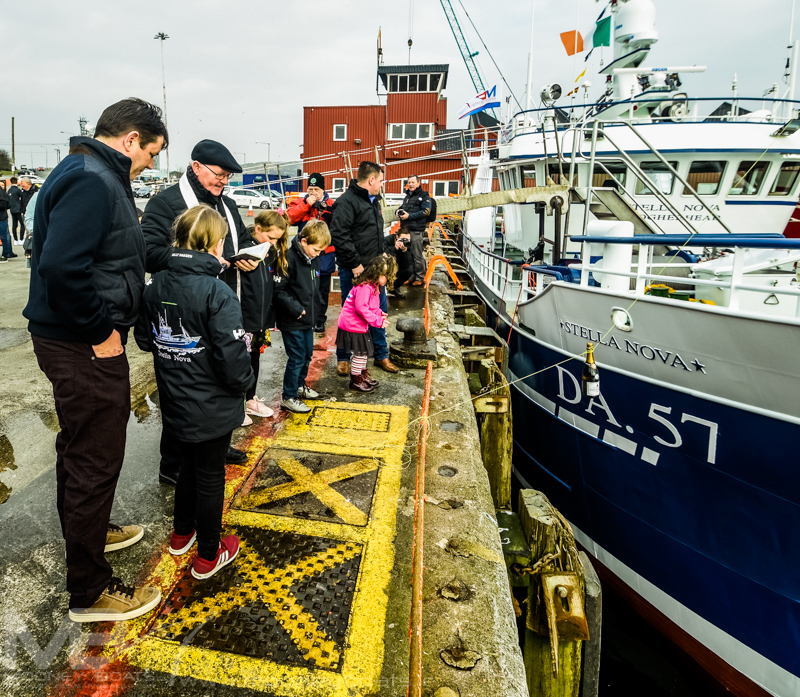 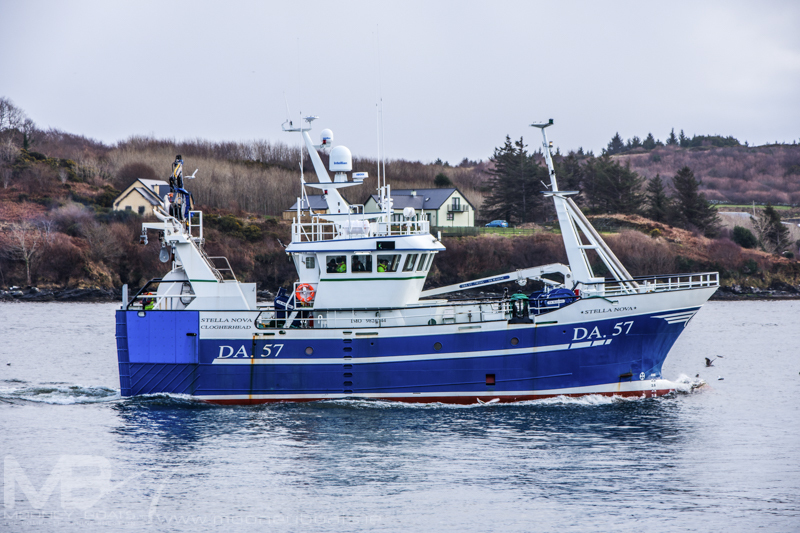 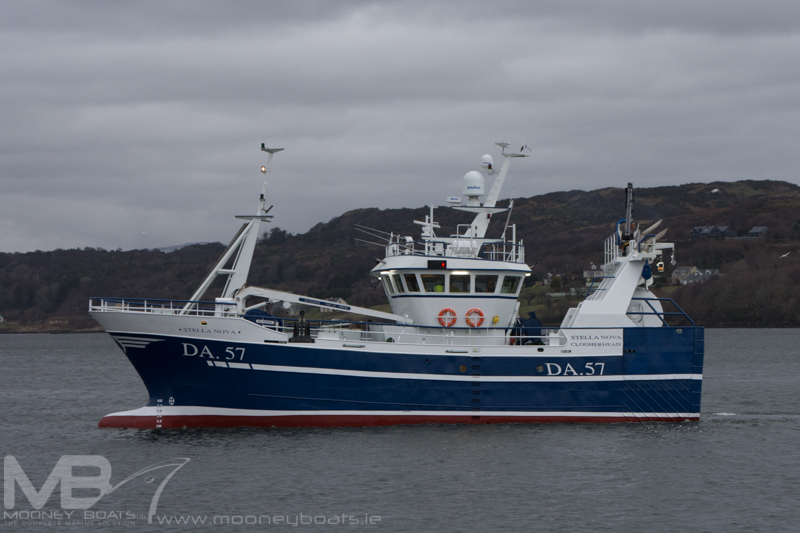 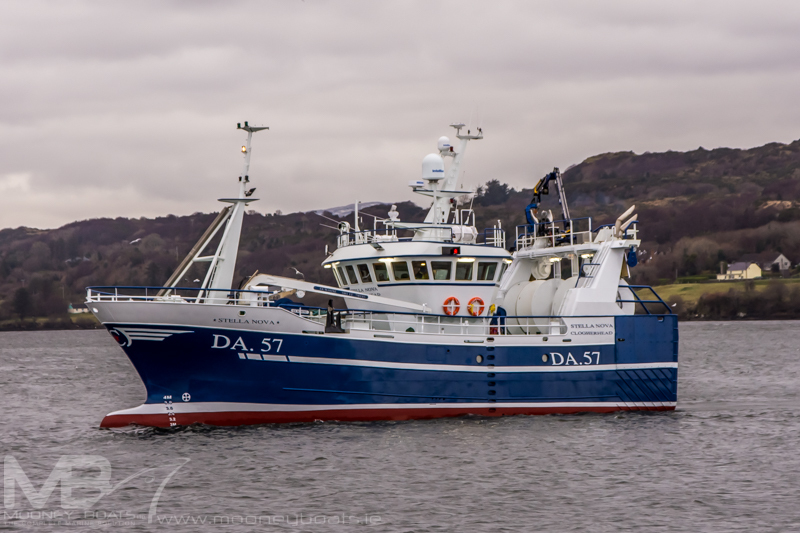 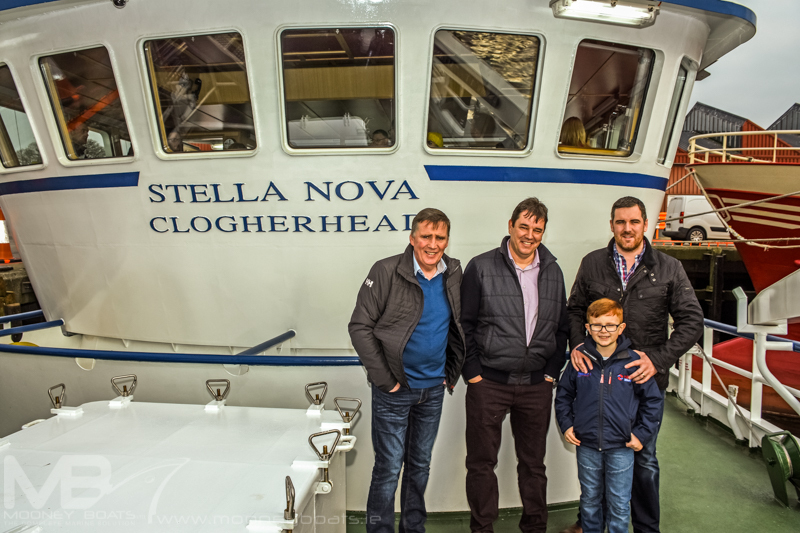 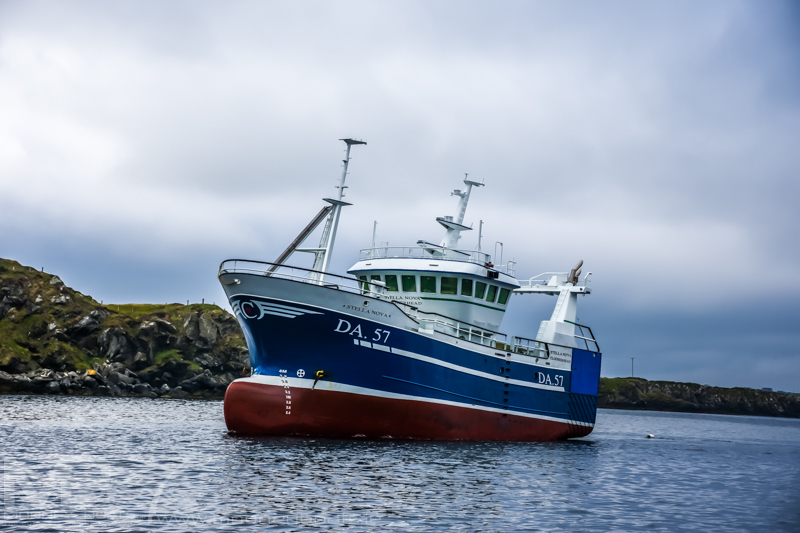 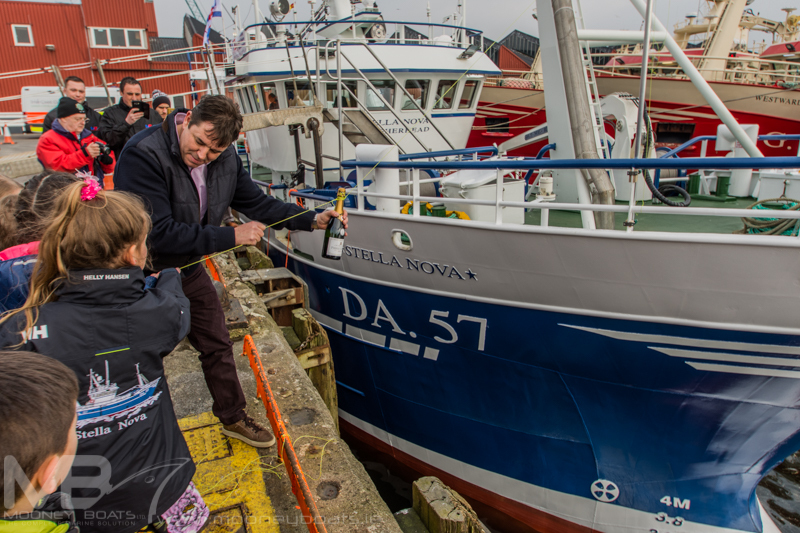 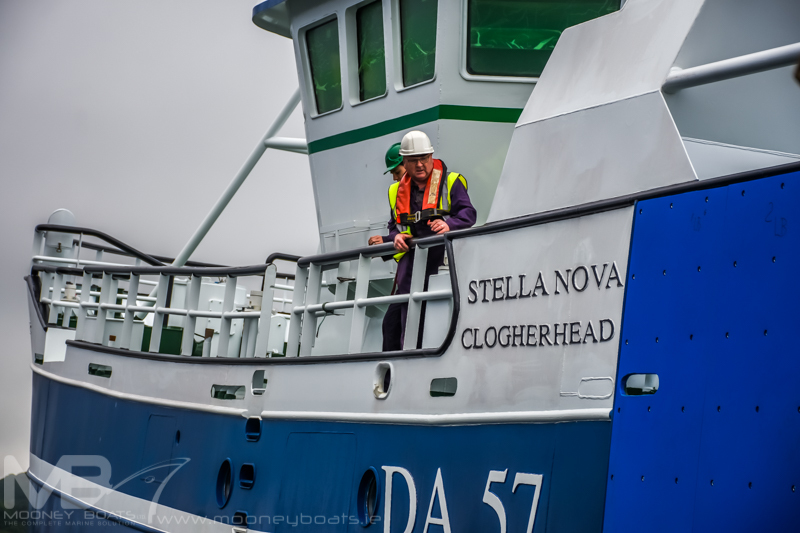 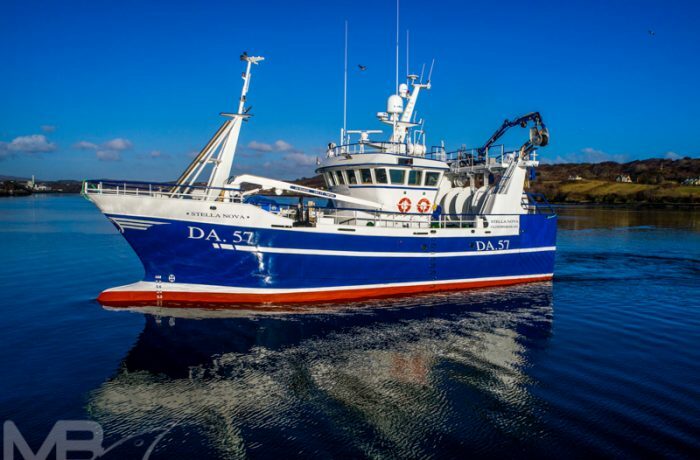 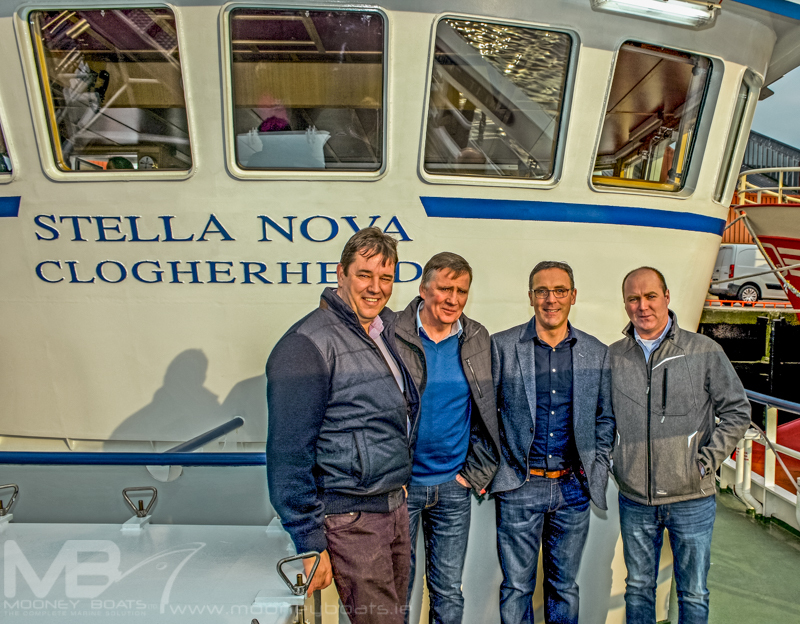 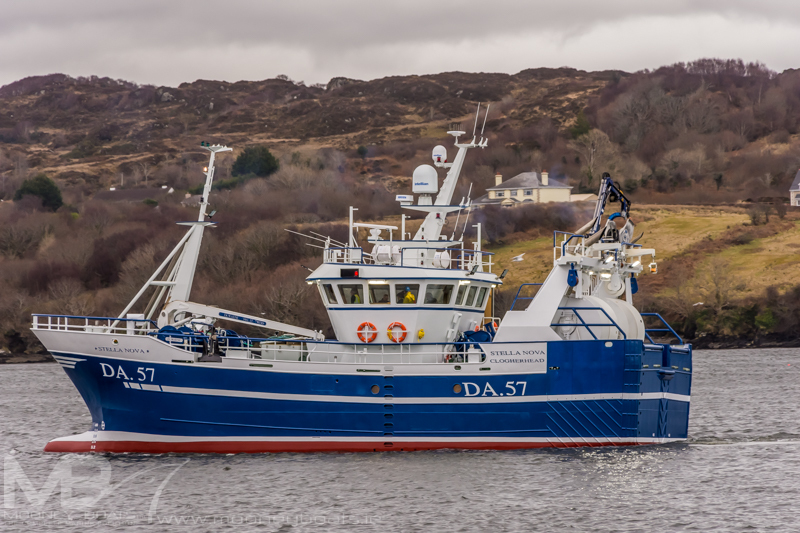 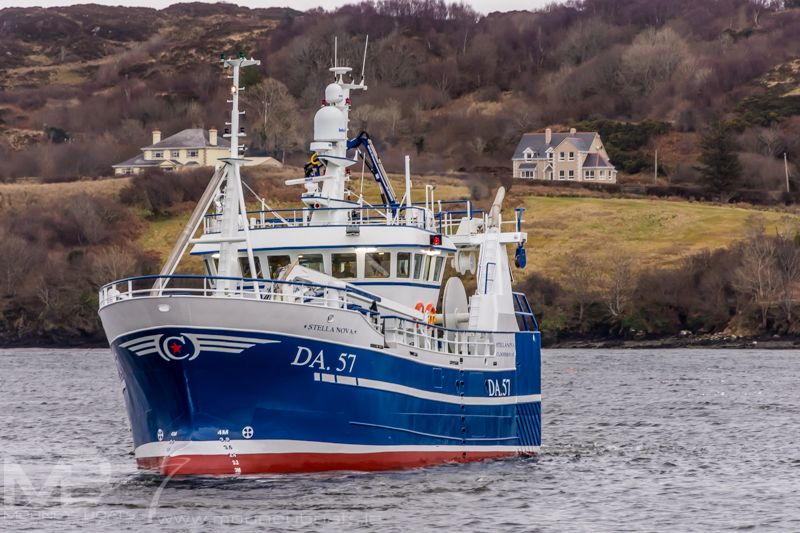 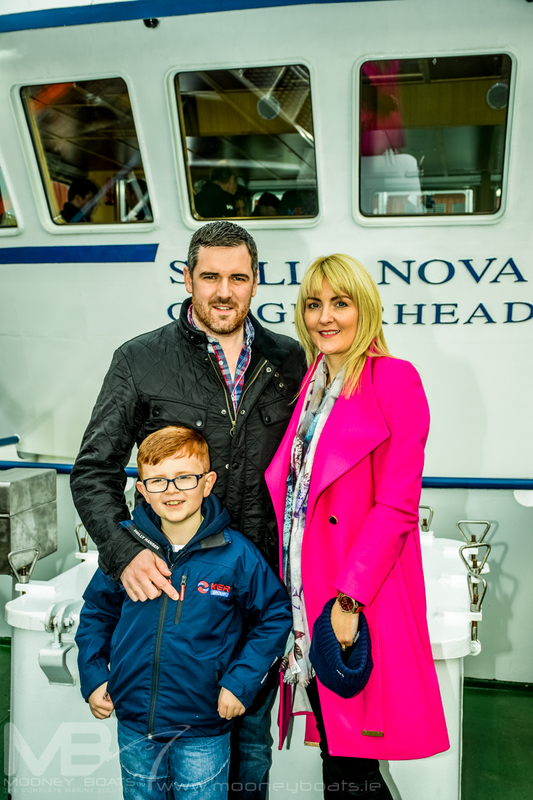 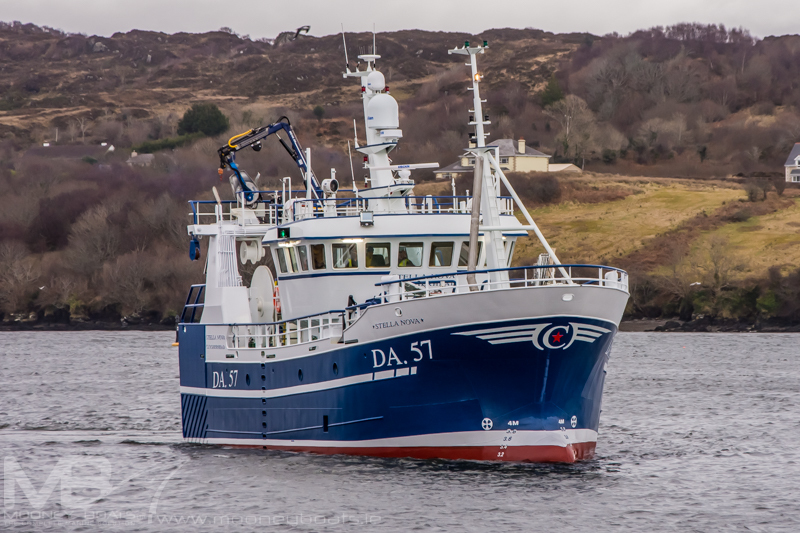 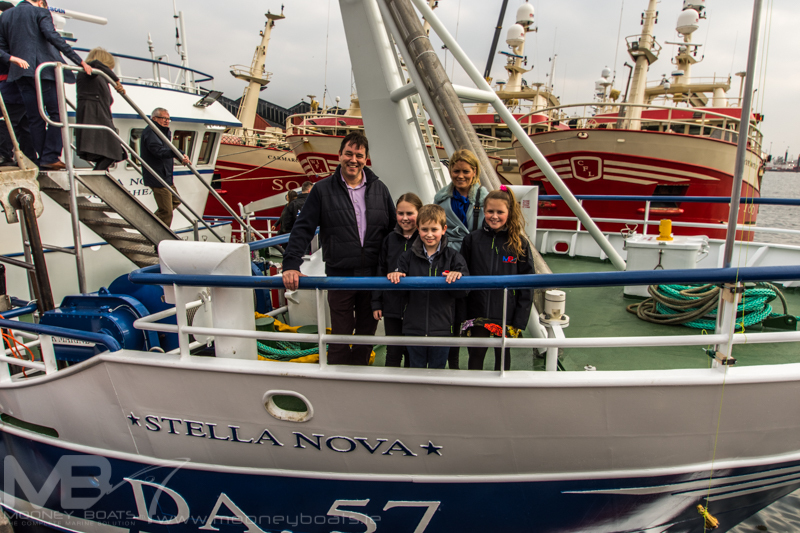 The beautifully crafted 24-metre ‘Stella Nova’ DA 57 joins the Irish fleet and was built for the Supreme Fishing Company of Clogherhead. 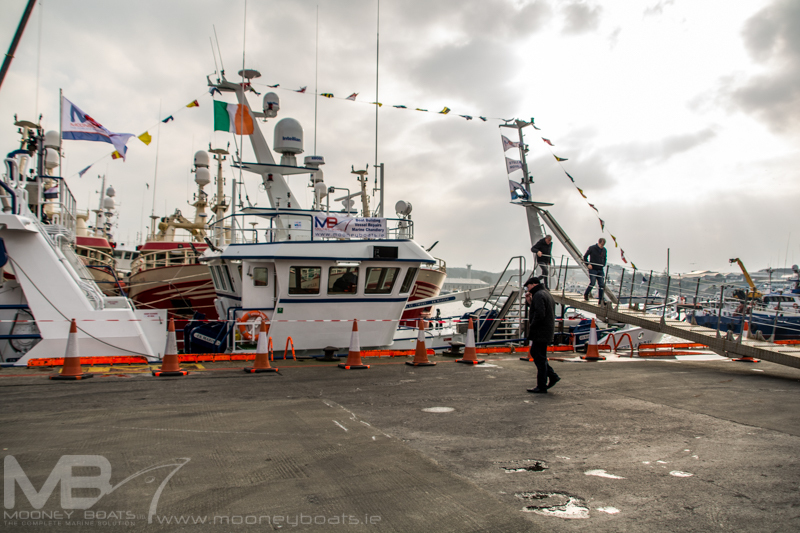 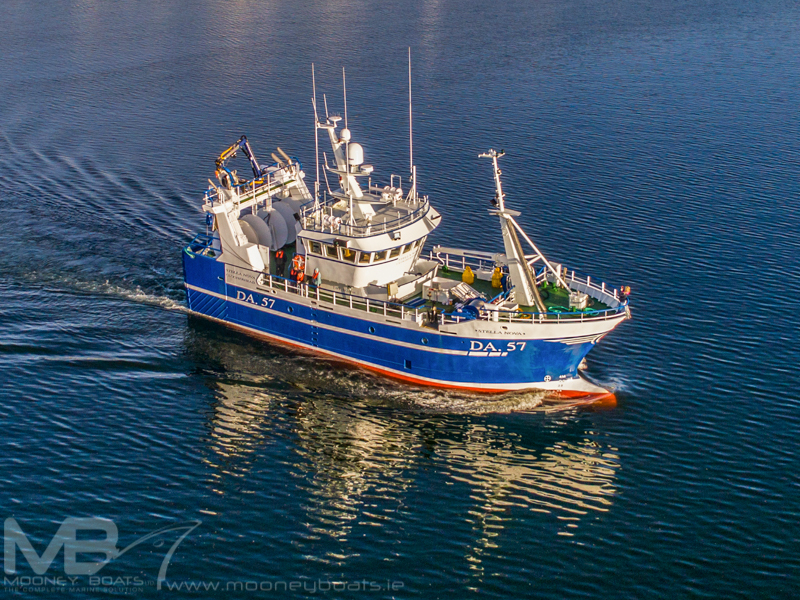 Supreme Fishing Company Ltd which is operated by Niall Connolly and Seamus Connolly Jnr is currently fishing the 22-metre ‘Margaret Mary’ DA 56 and the 24-metre‘Patrick C’ DA 107.The ‘Stella Nova’ is the second boat for the company to carry the same name with the previous ‘Stella Nova’ was sold to Union Hall last year and renamed ‘Emerald Isle II’. 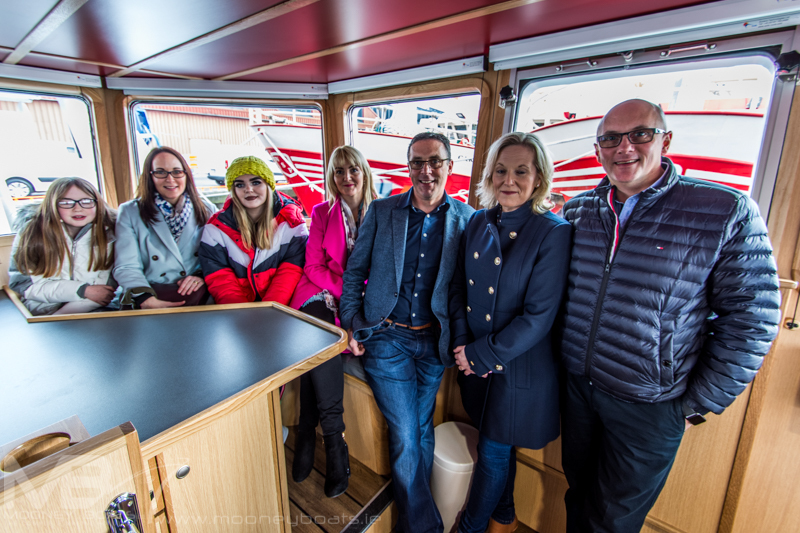 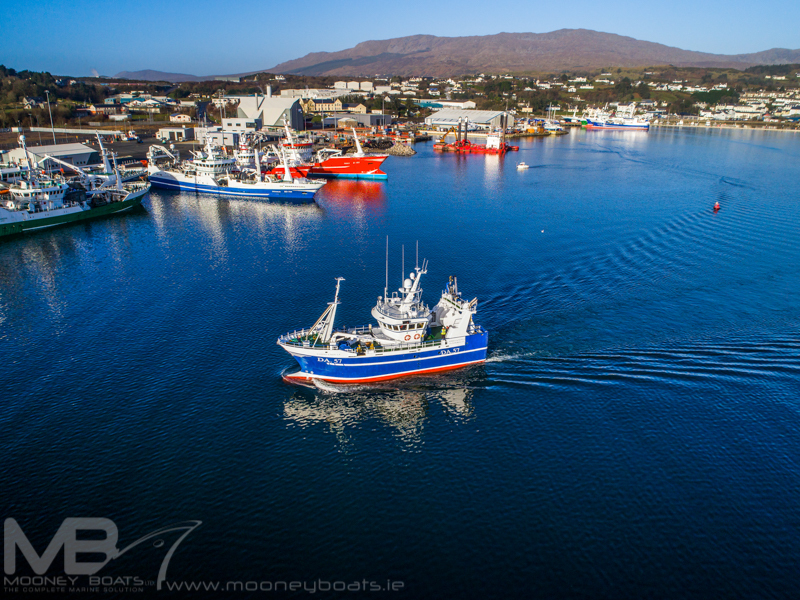 When choosing a boat design and builder, Supreme Fishing had no hesitation in renewing their acquaintance with Mooney Boats Ltd who had built the companies previous boat, the ‘Patrick C’ back which was delivered in December 2014. 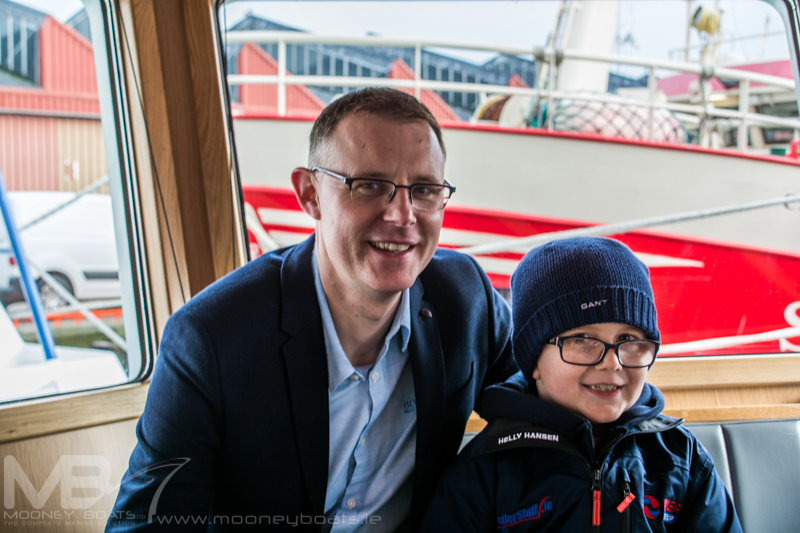 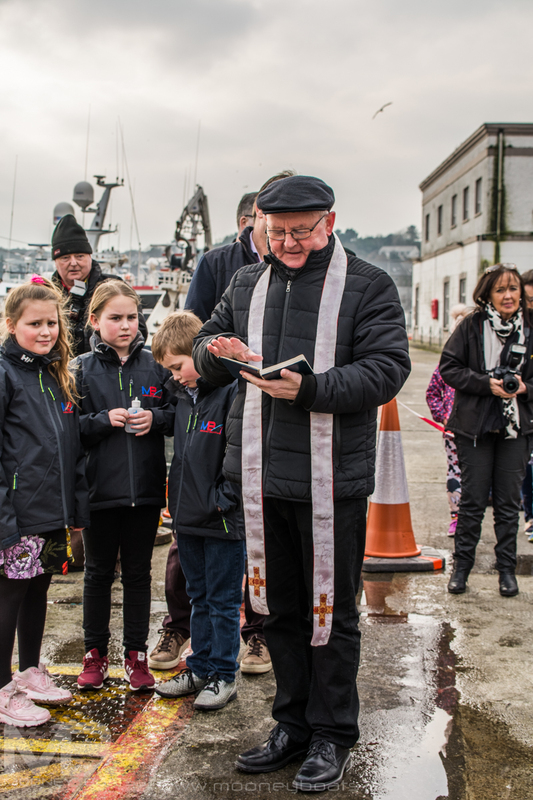 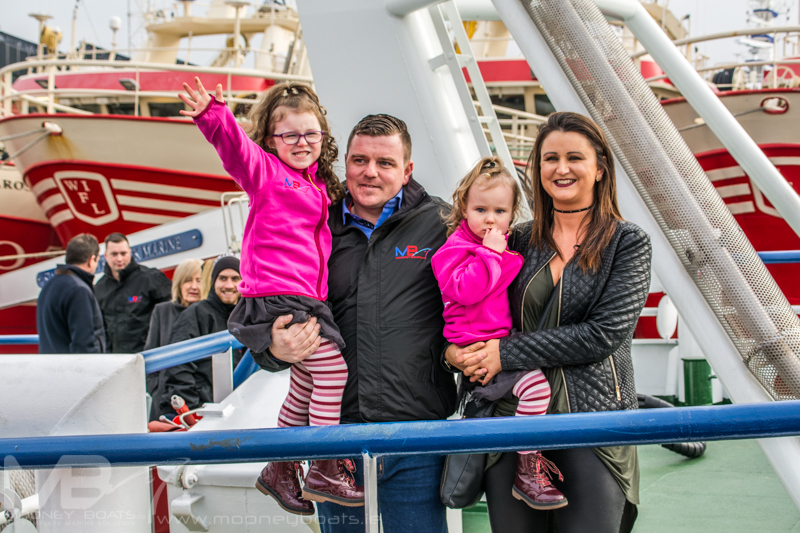 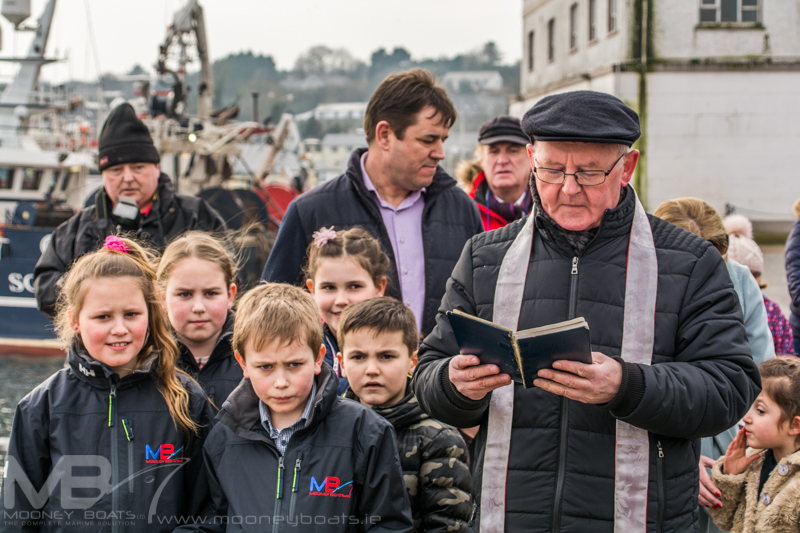 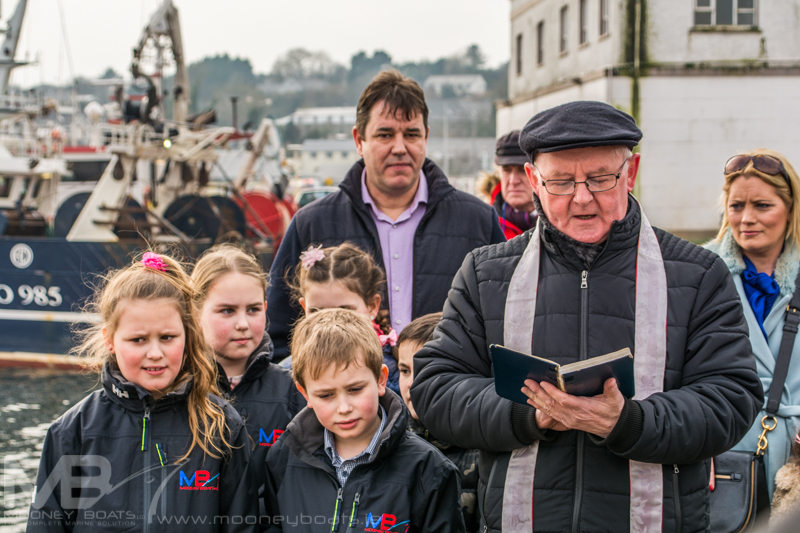 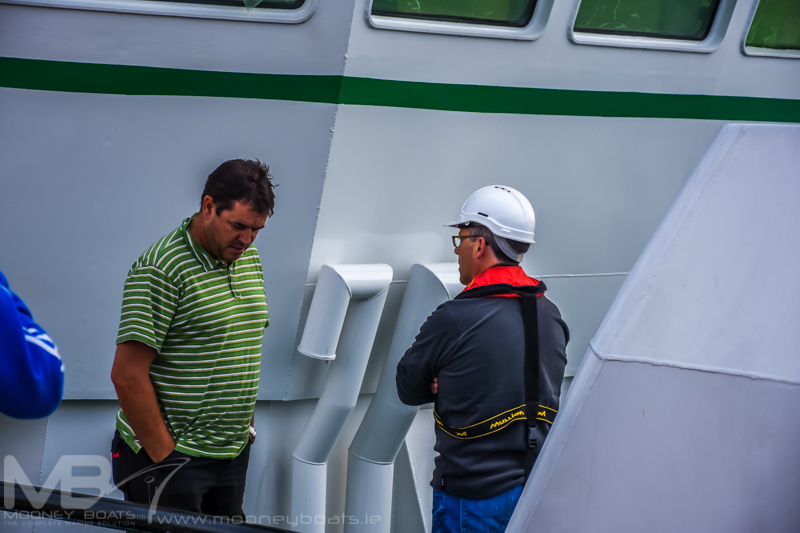 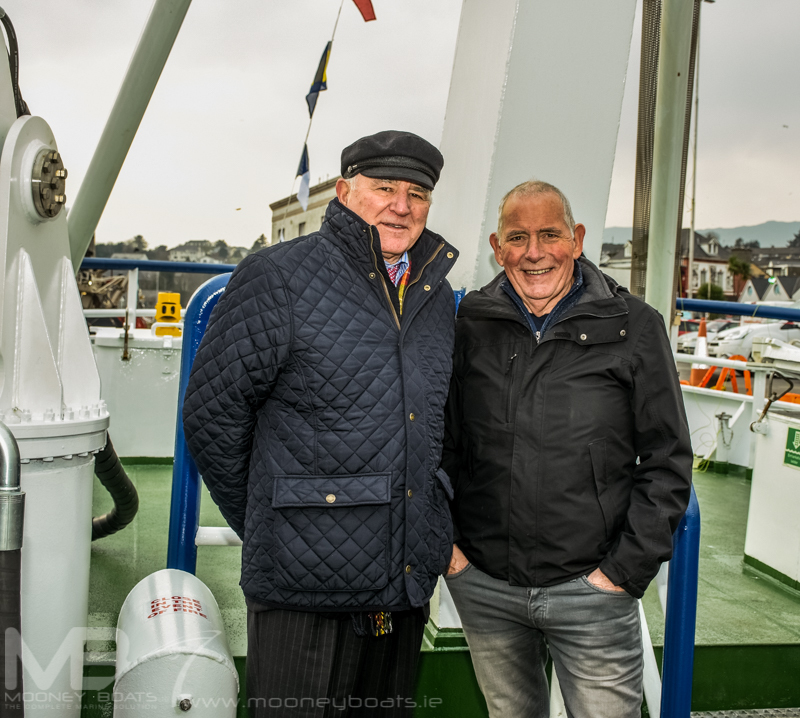 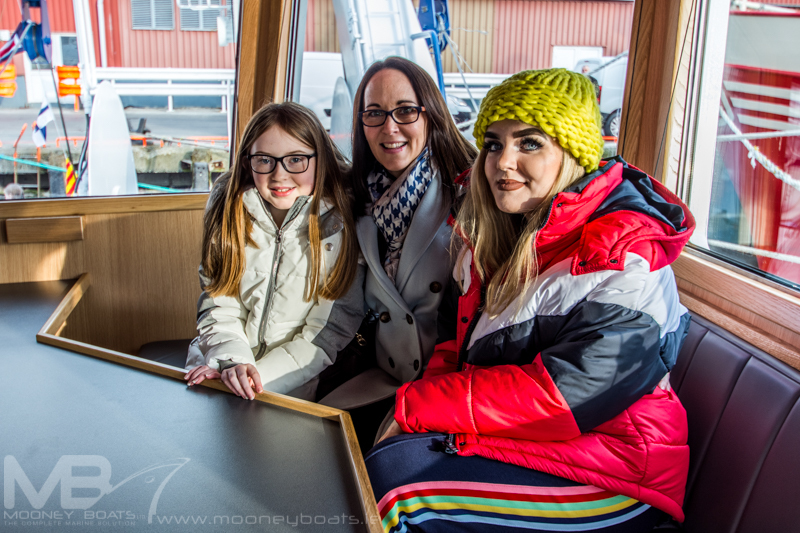 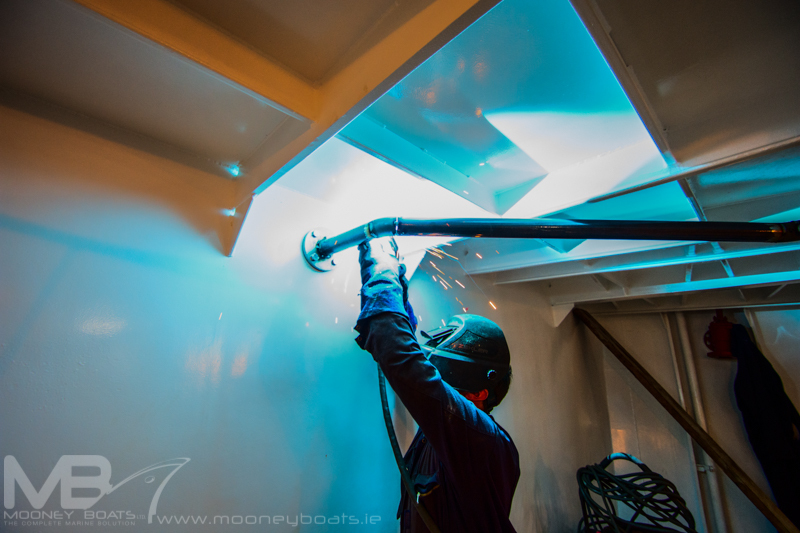 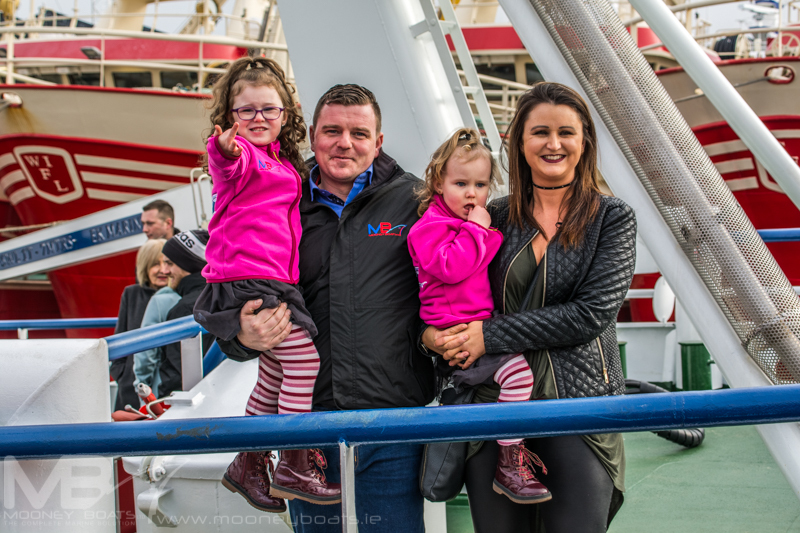 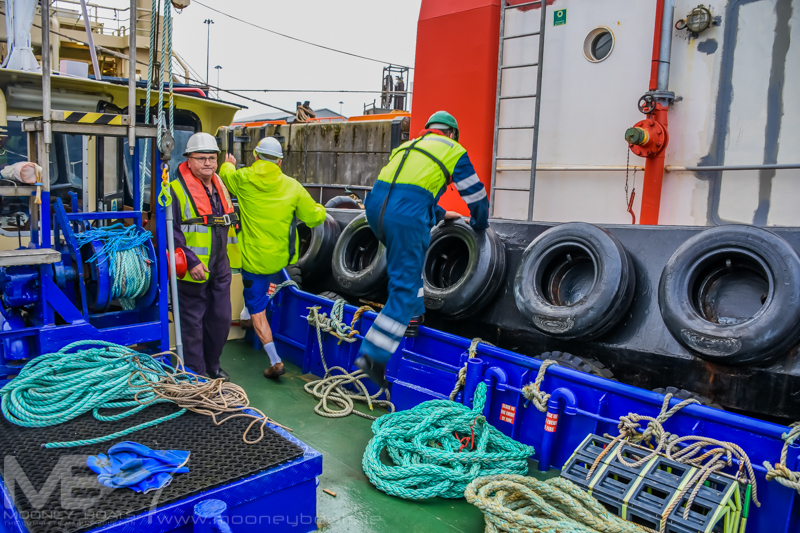 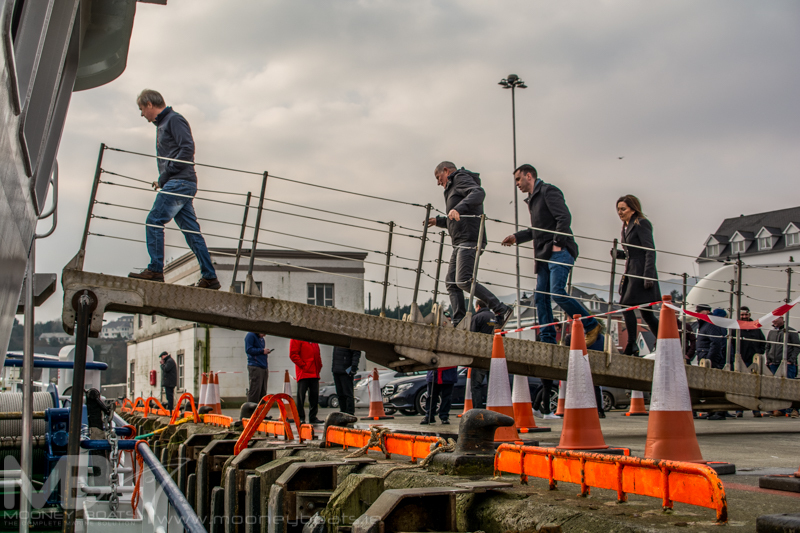 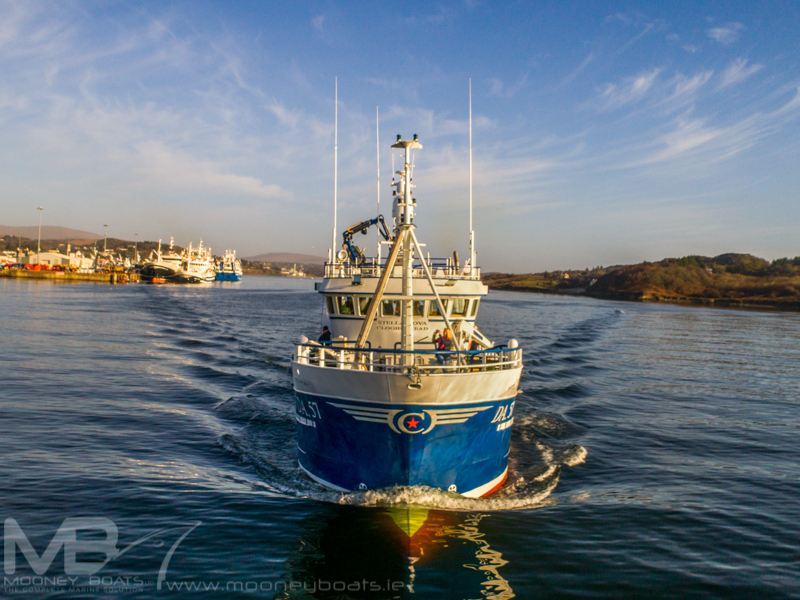 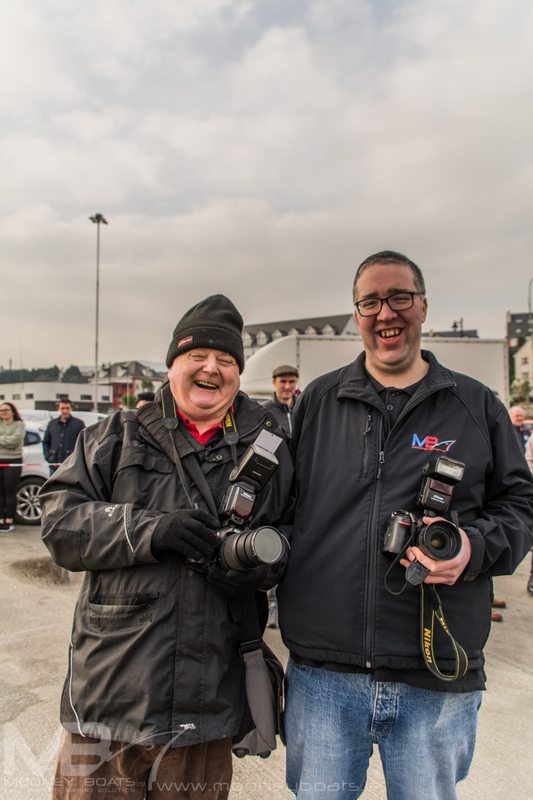 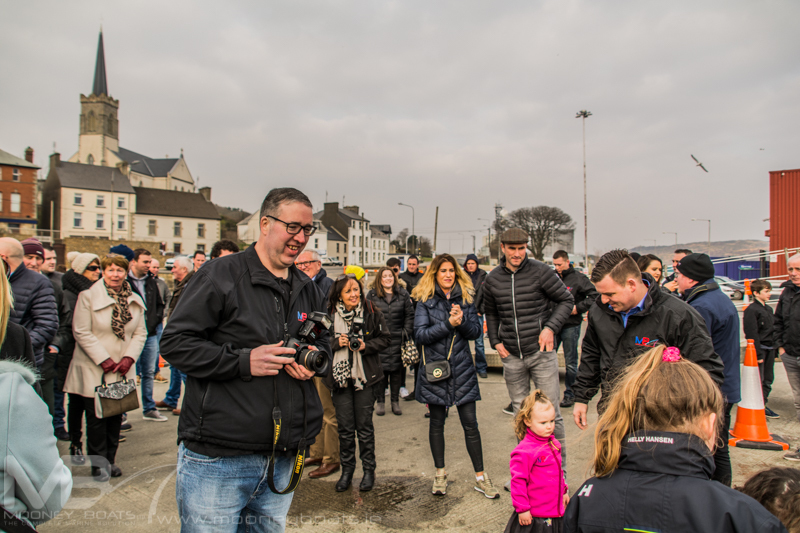 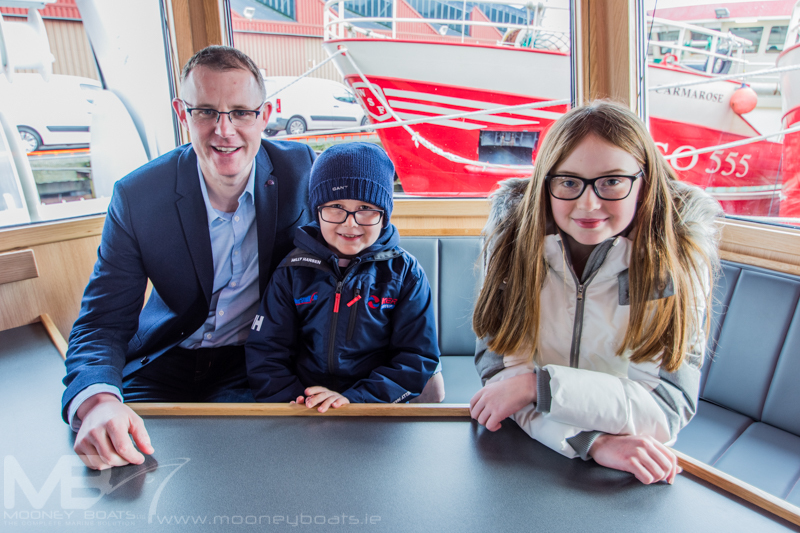 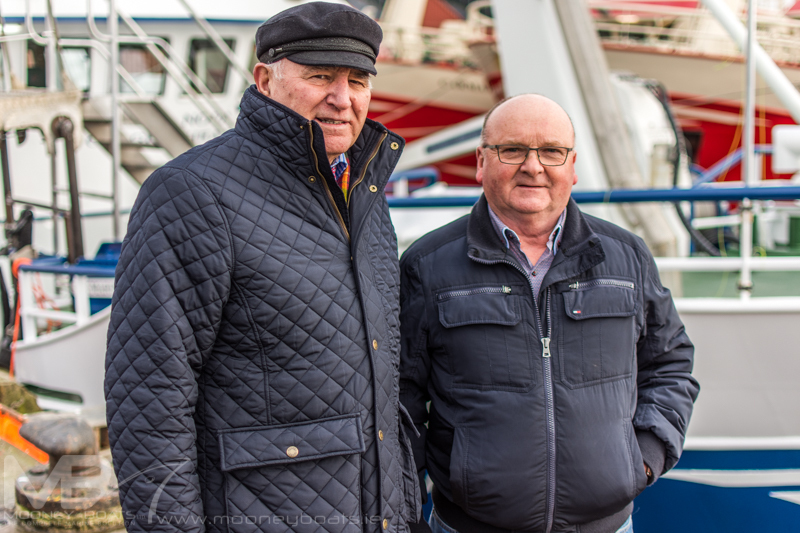 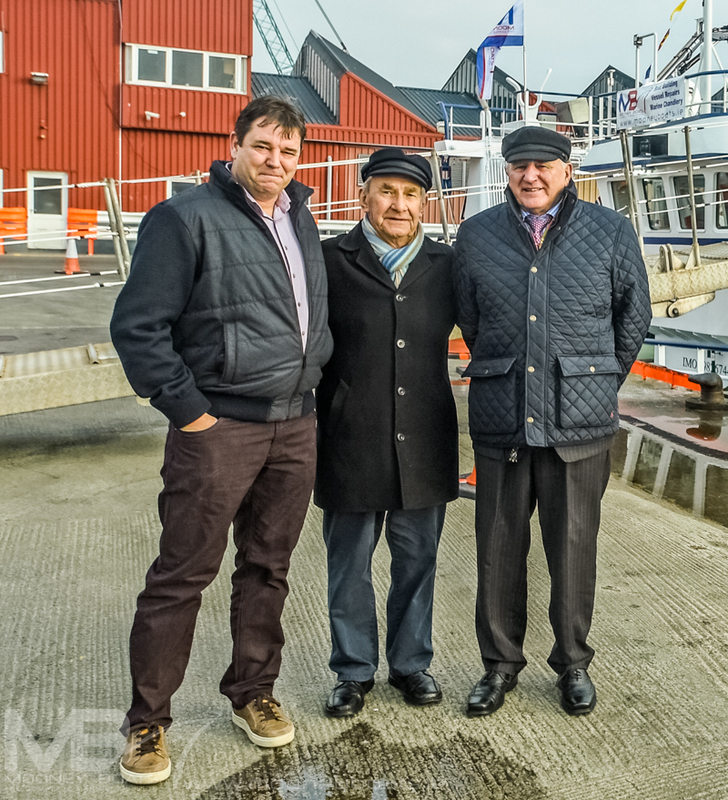 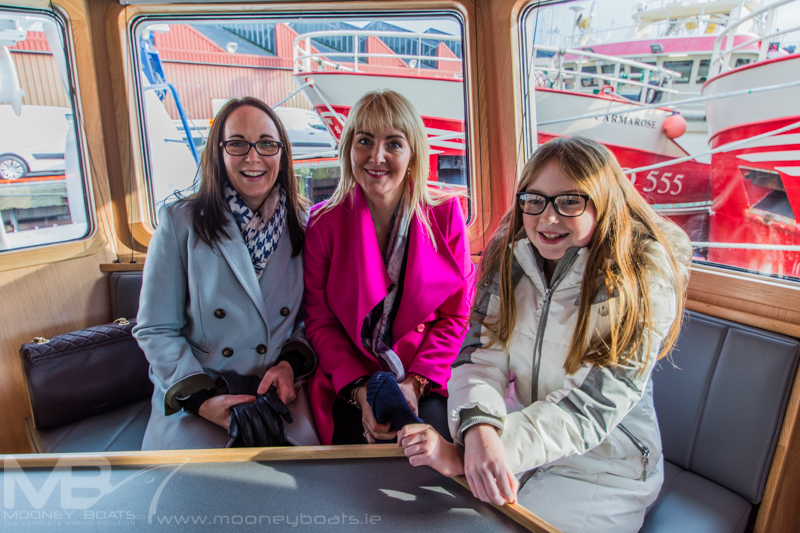 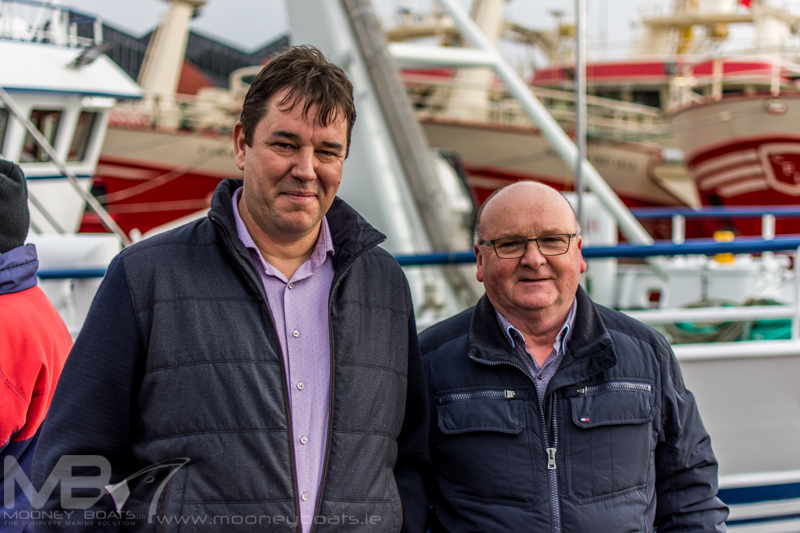 “We went back to Mooney Boats because they built our previous boat the Patrick C and we were very happy with the build and quality of work” says Niall Connolly speaking to the Skipper at Mooney’s boatyard in Killybegs. 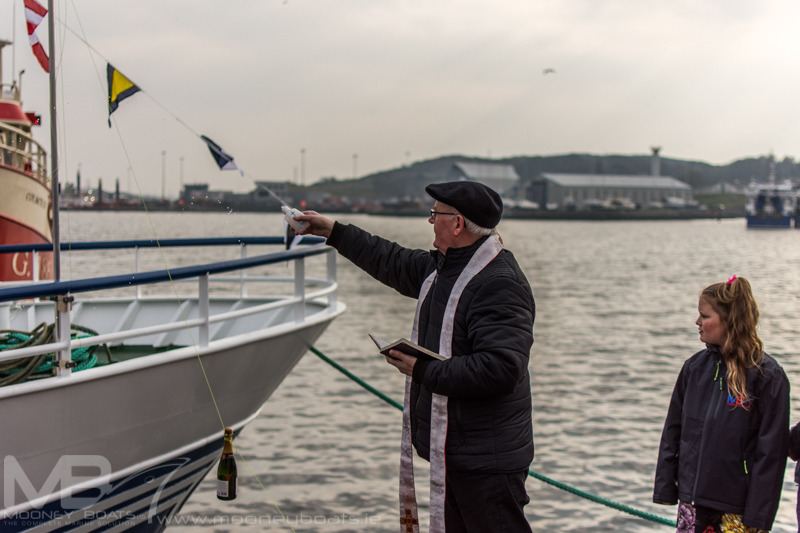 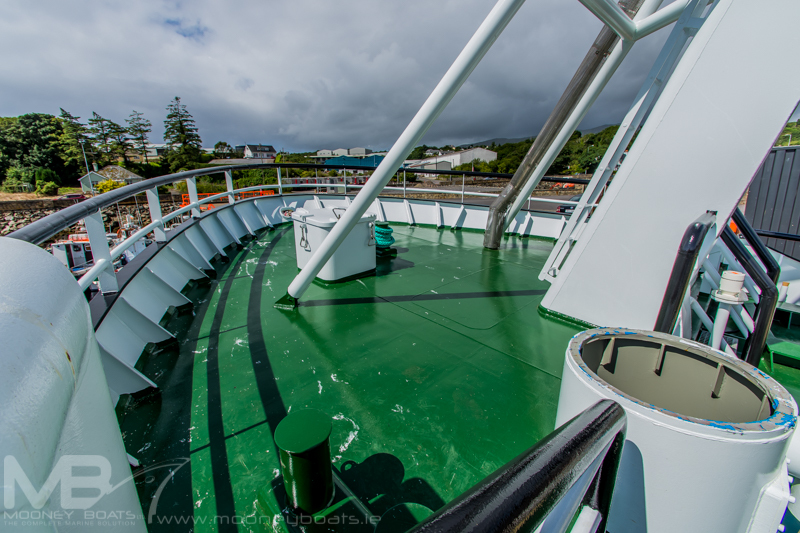 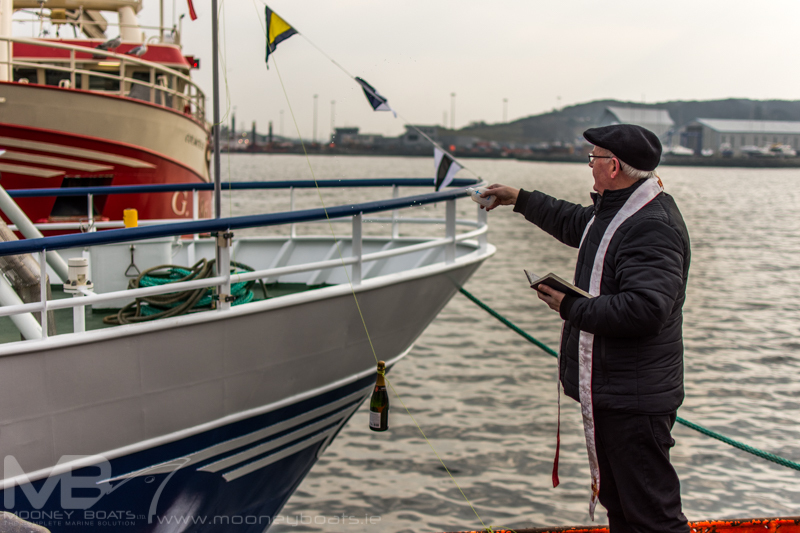 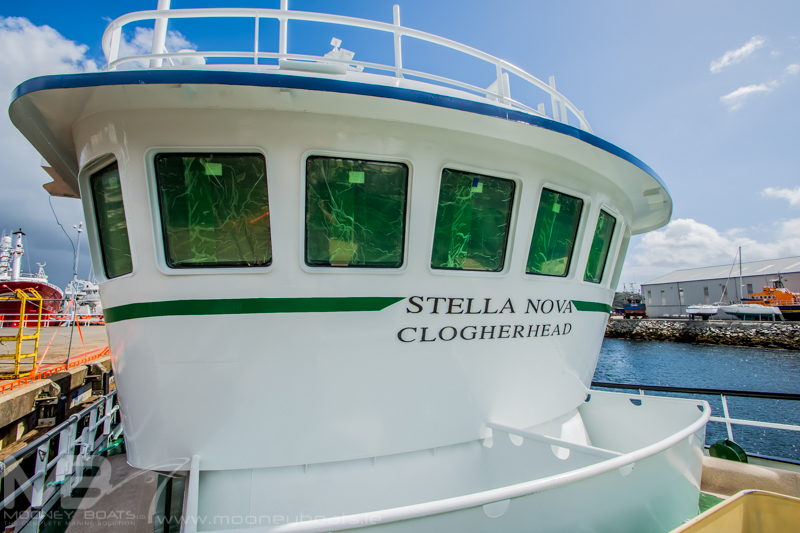 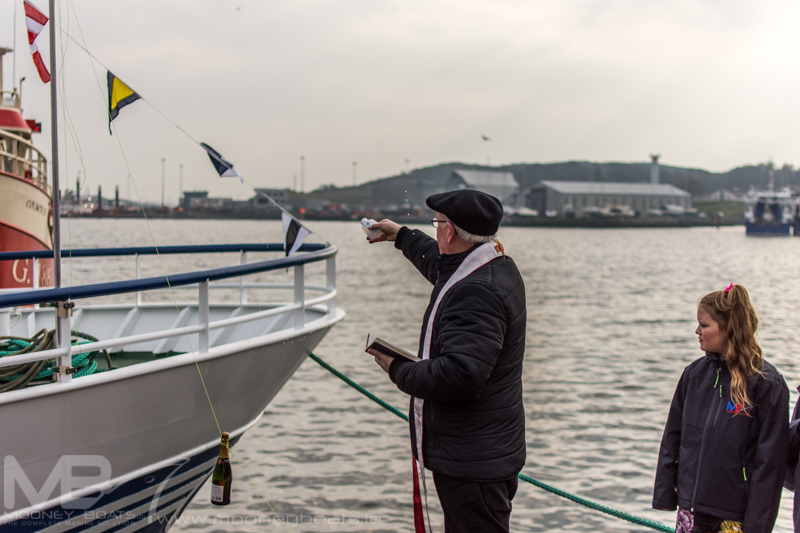 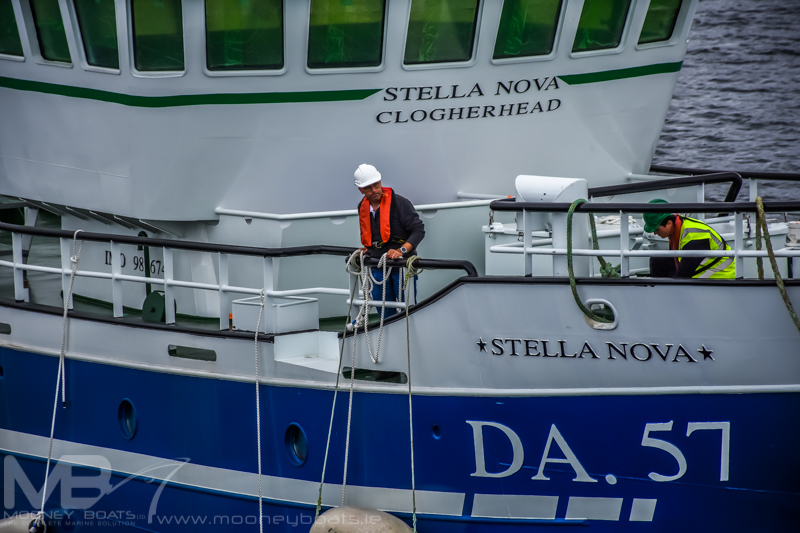 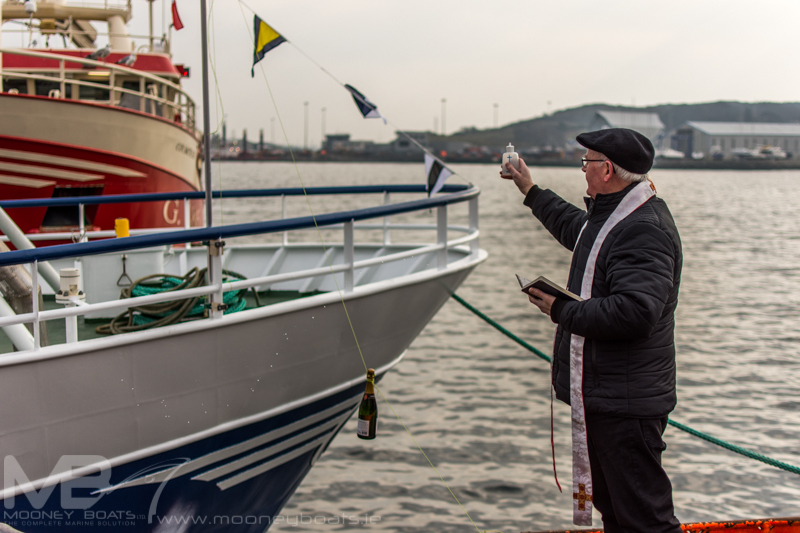 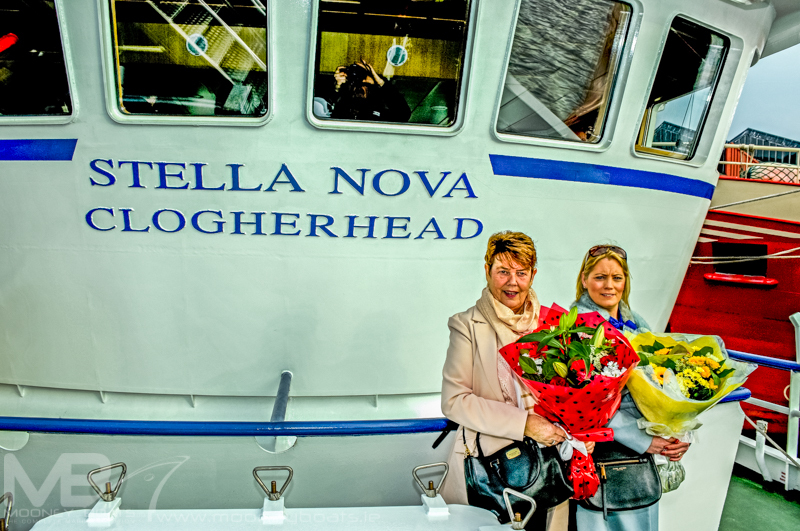 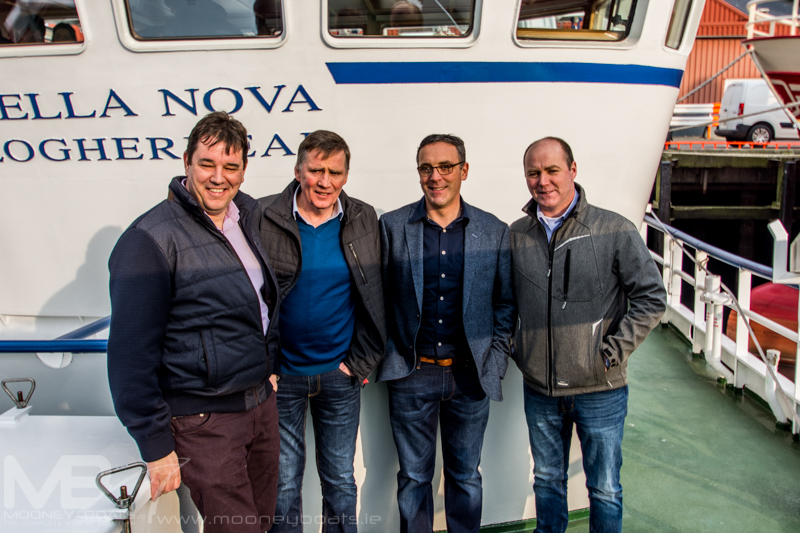 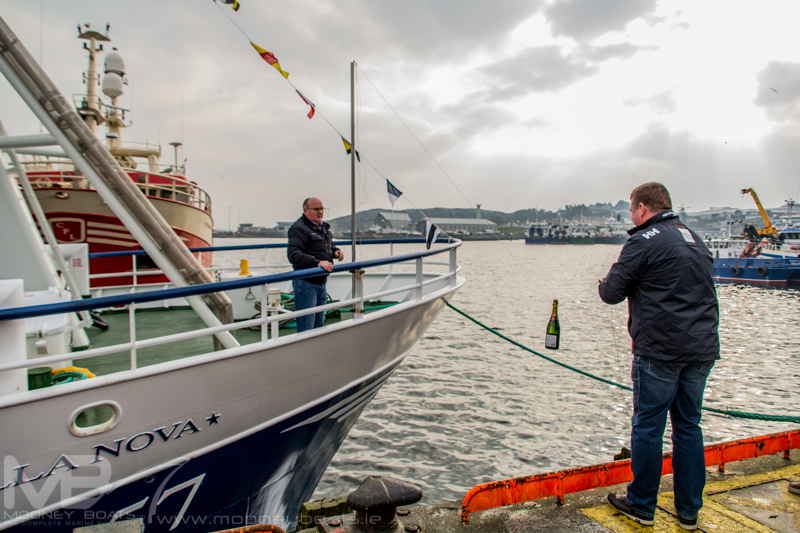 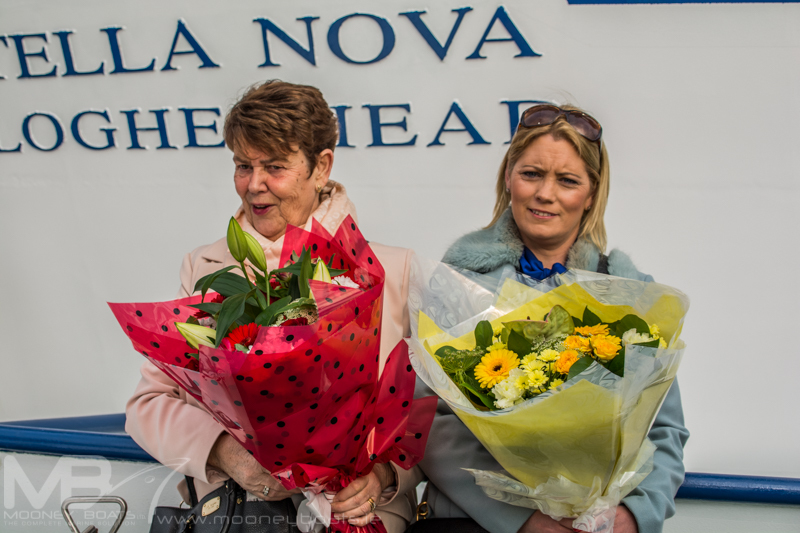 “The new Stella Nova is a sister-ship to the Patrick C and we were very happy with the design and layout. 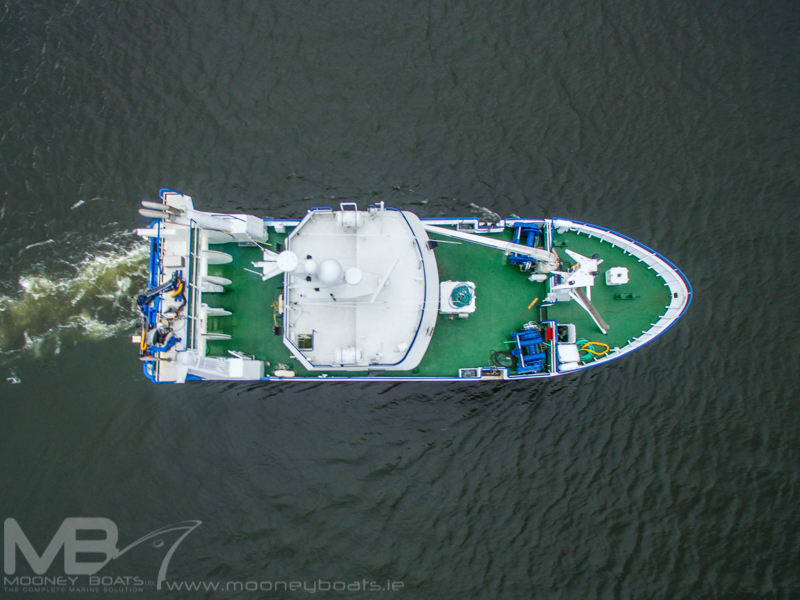 The Patrick C performed well and has proven to be very efficient, which was the main reason that we came back to this design with Mooney Boats Ltd. 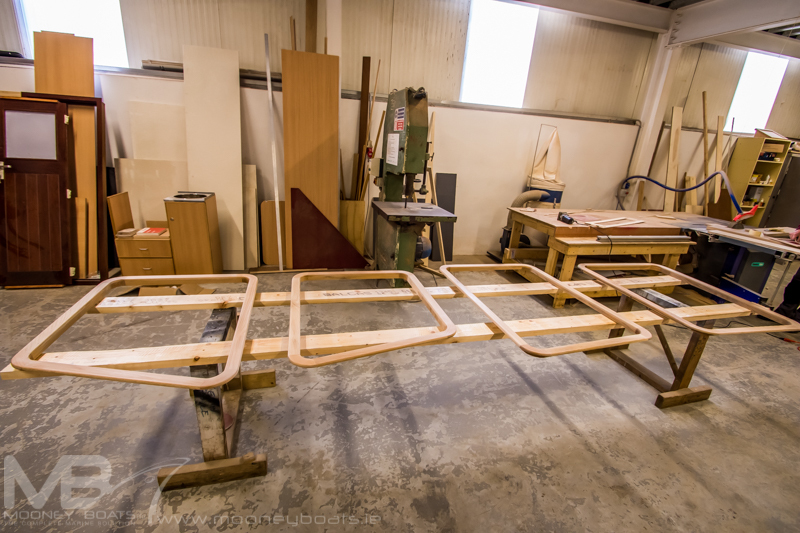 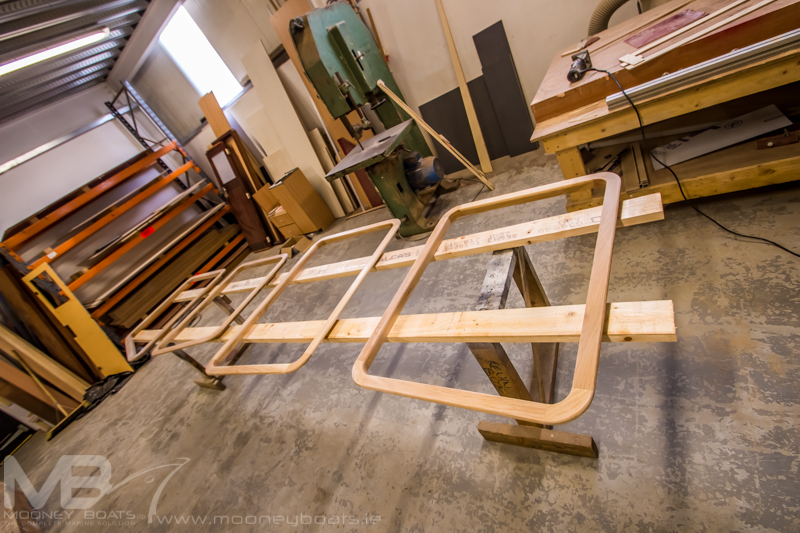 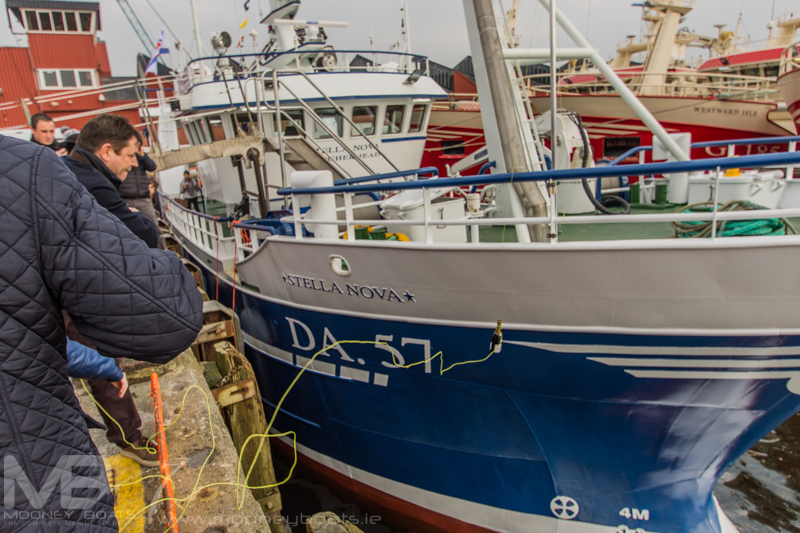 This is the fourth boat designed for the family run company by Danish designer, Ove Christiansen of Vestværftet ApS. 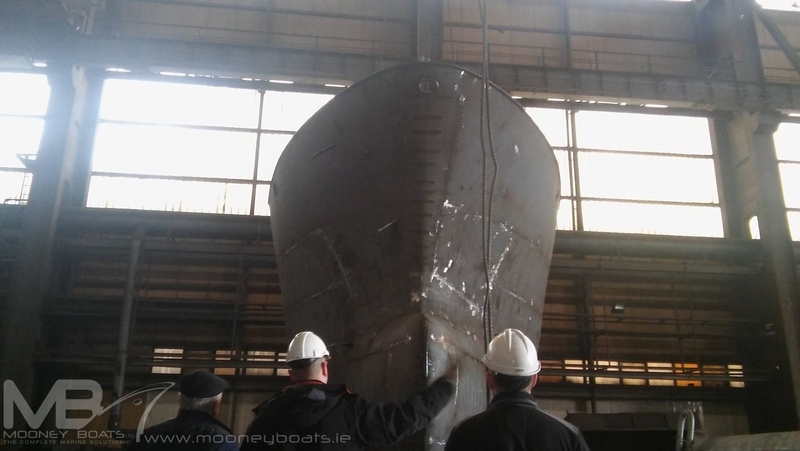 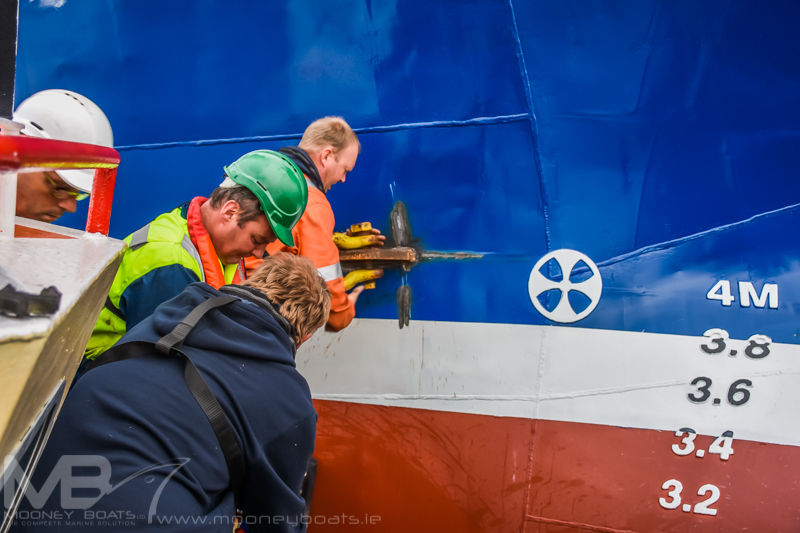 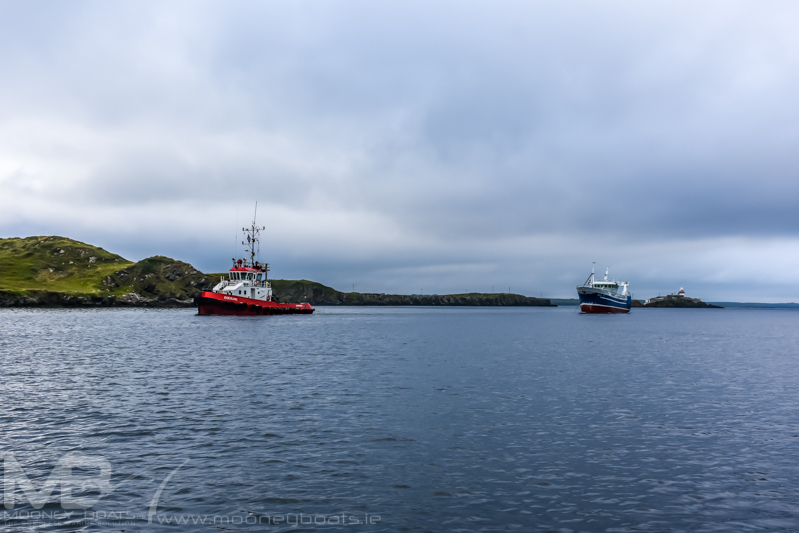 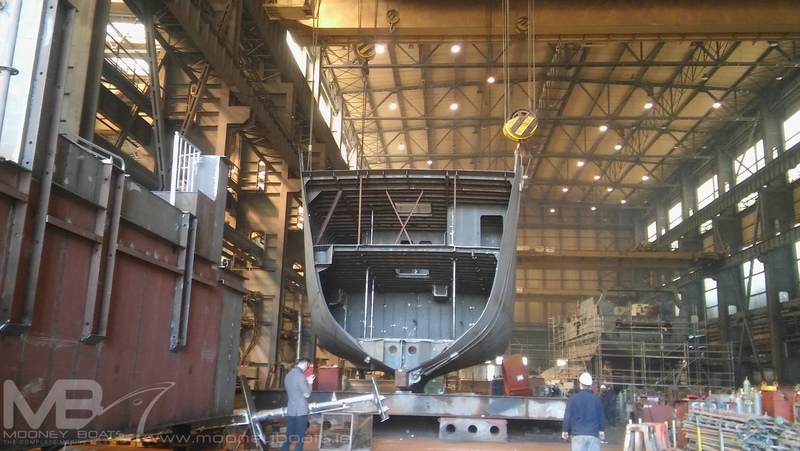 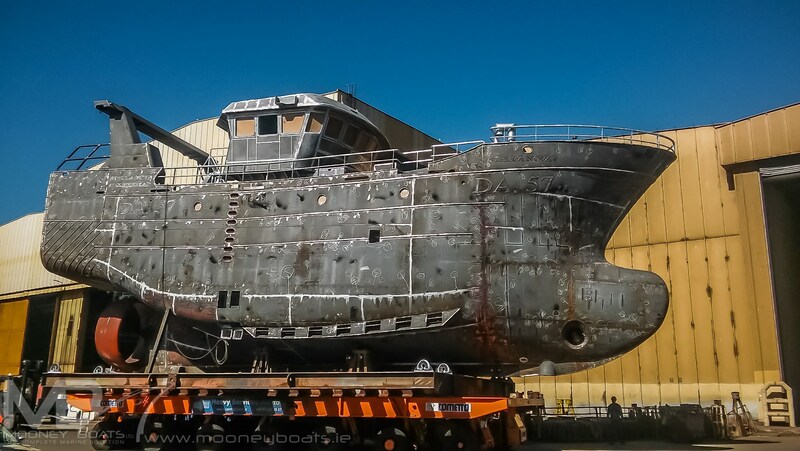 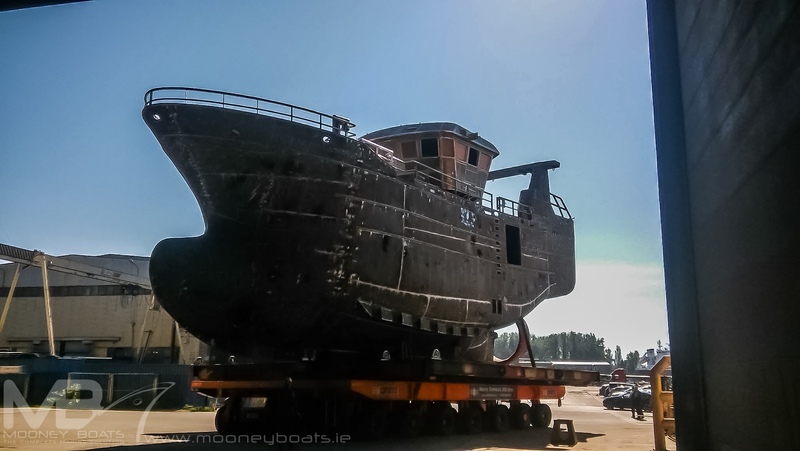 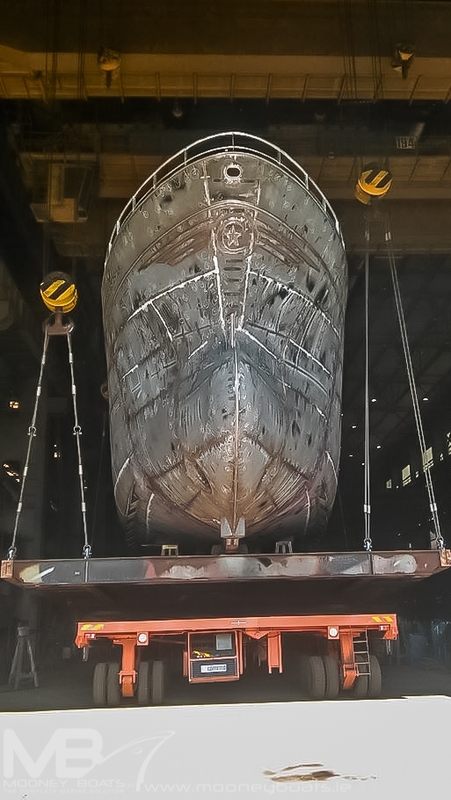 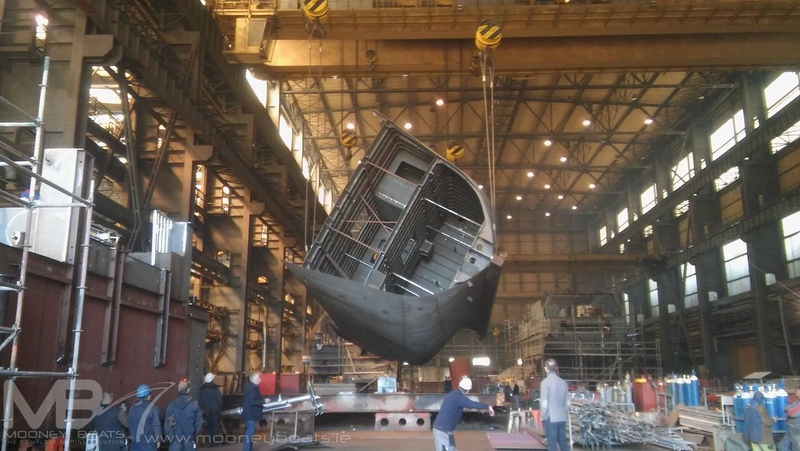 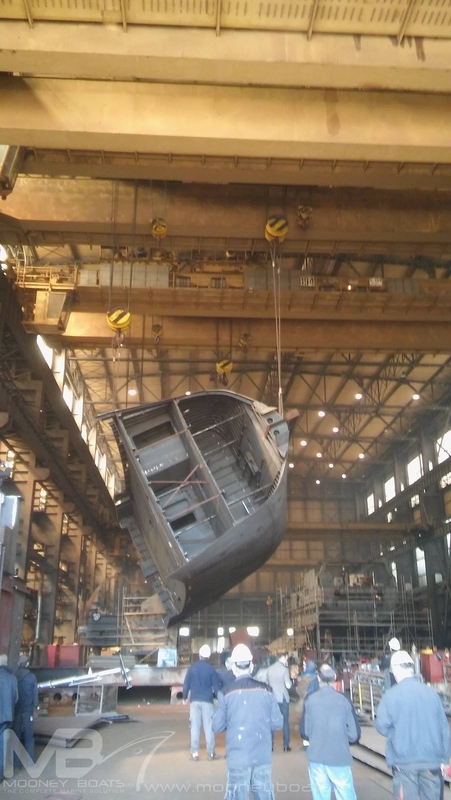 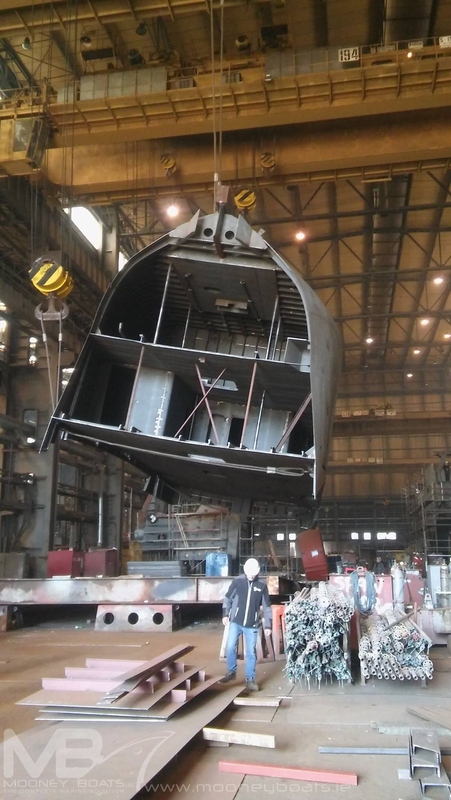 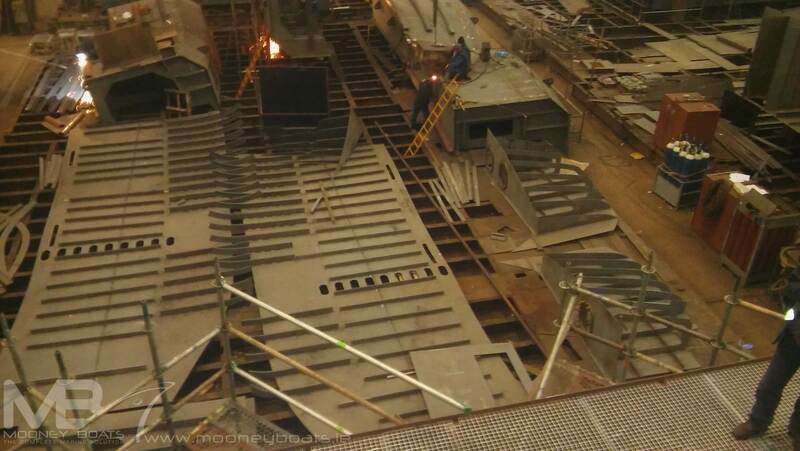 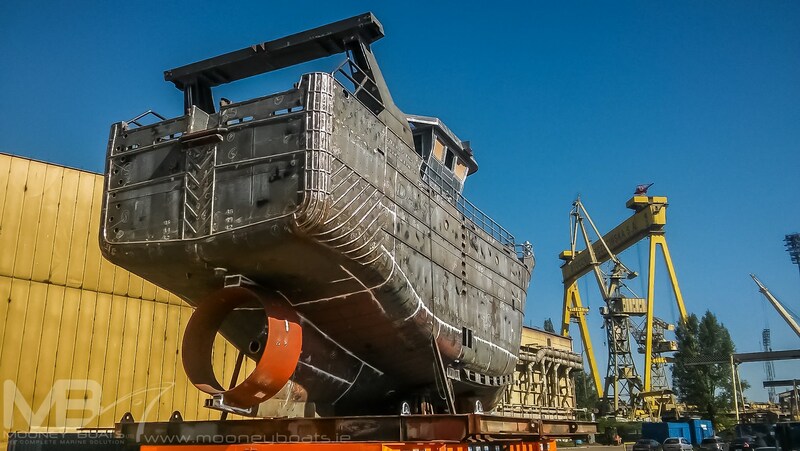 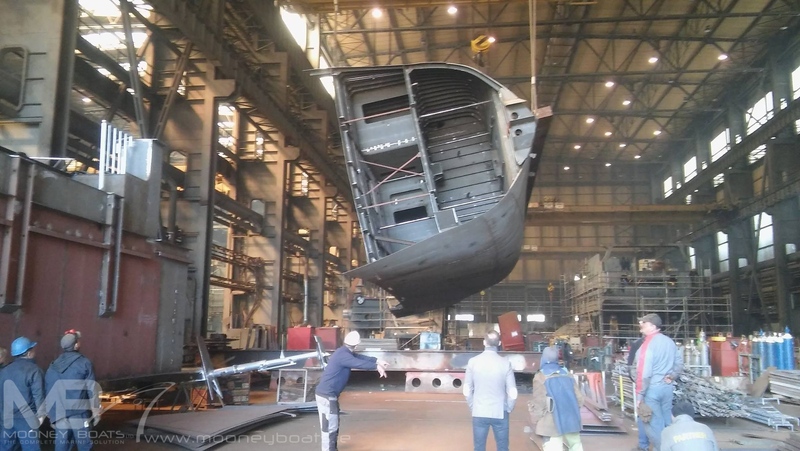 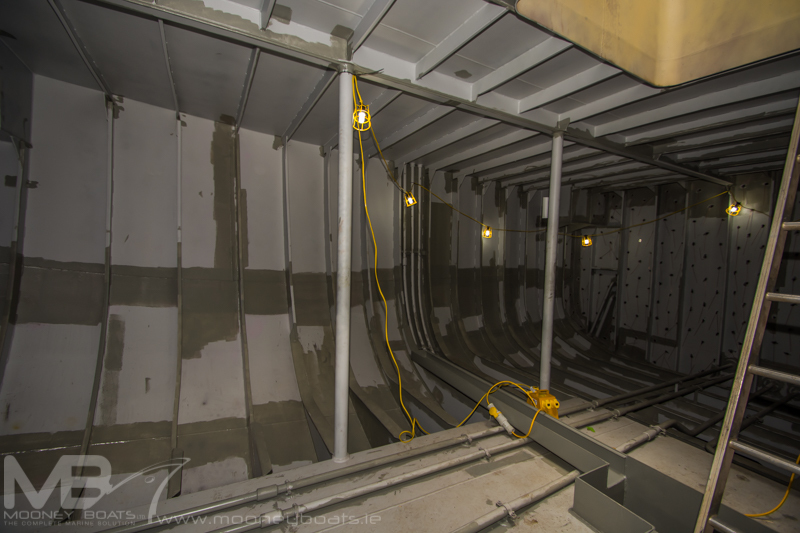 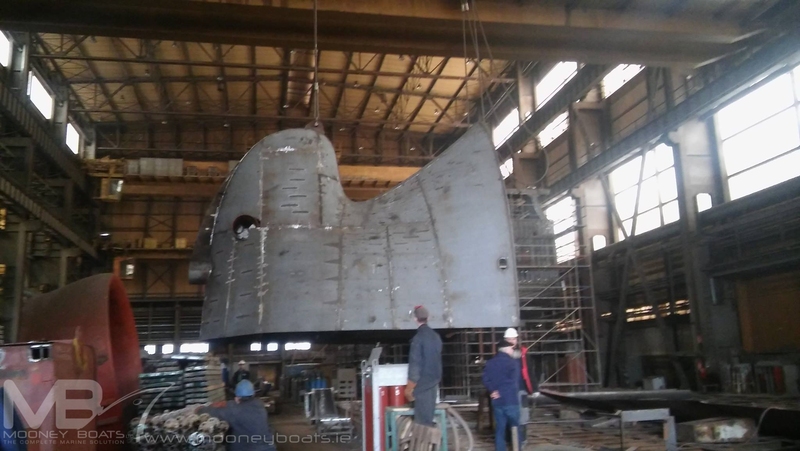 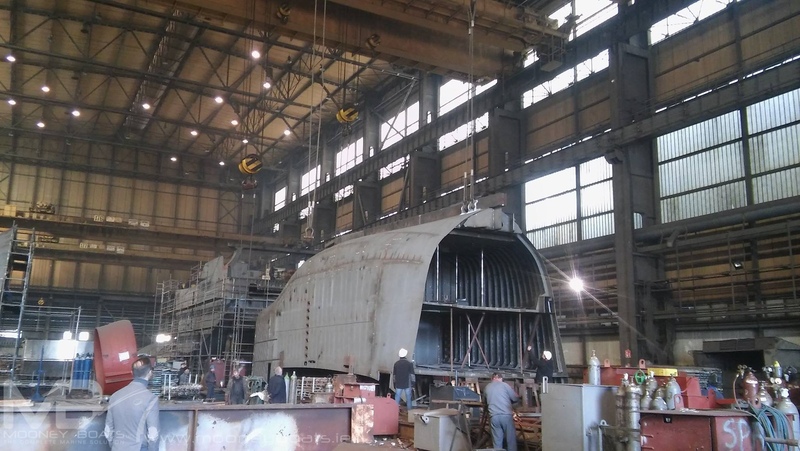 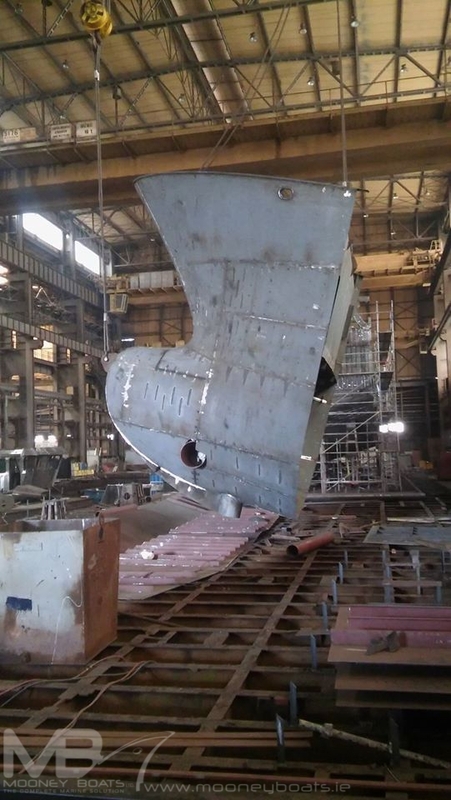 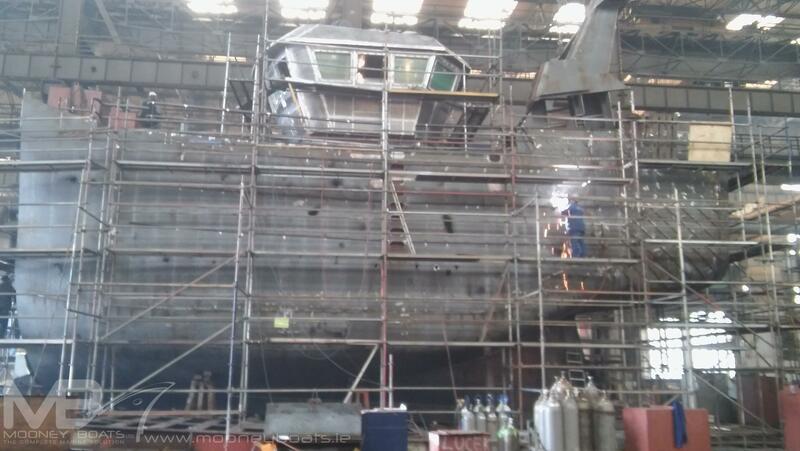 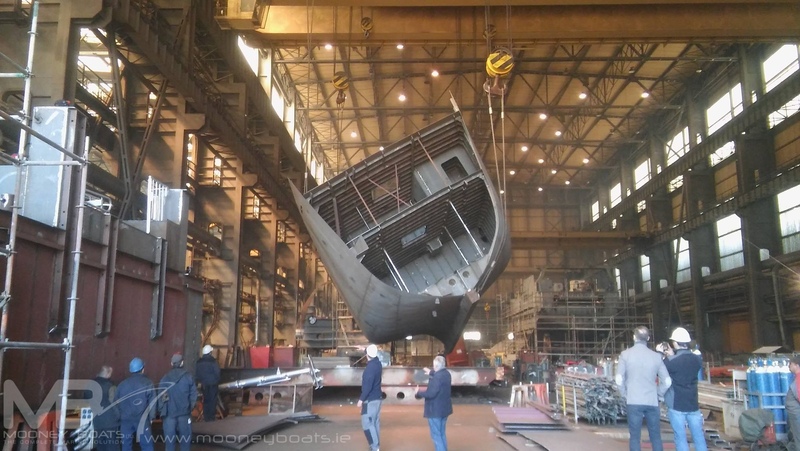 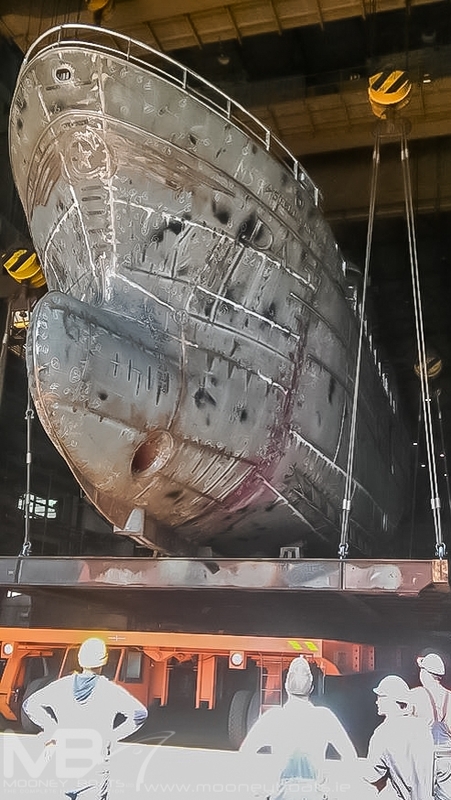 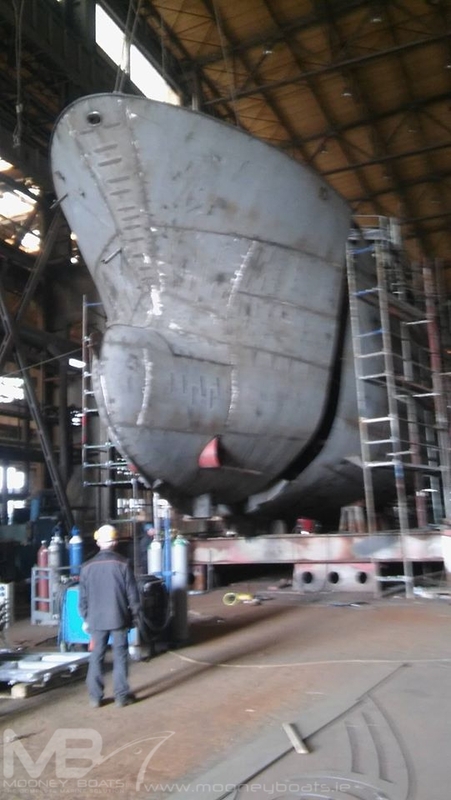 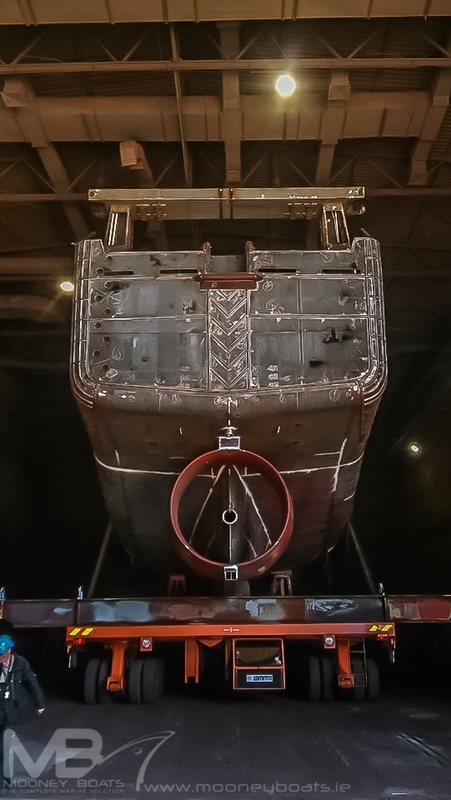 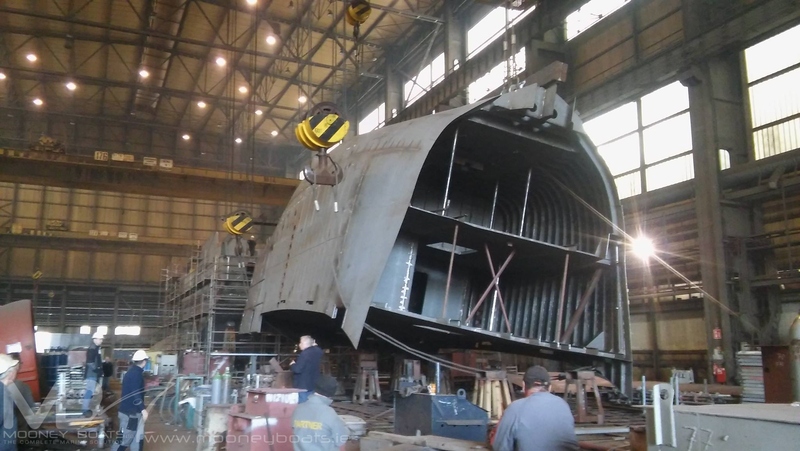 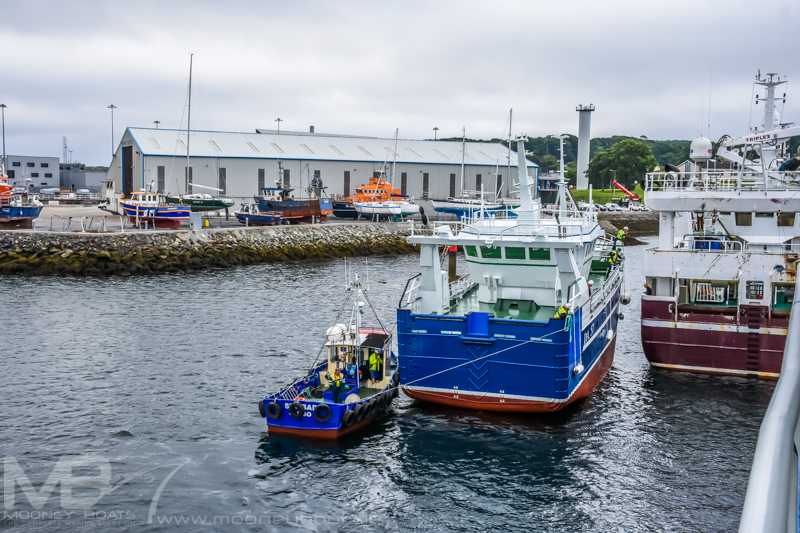 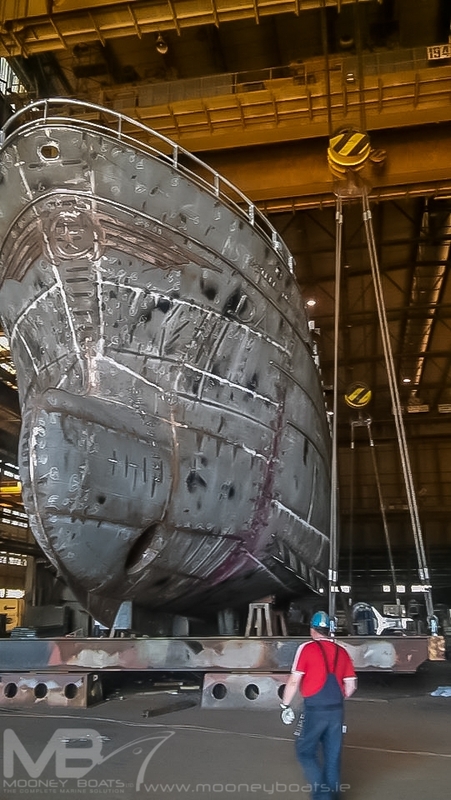 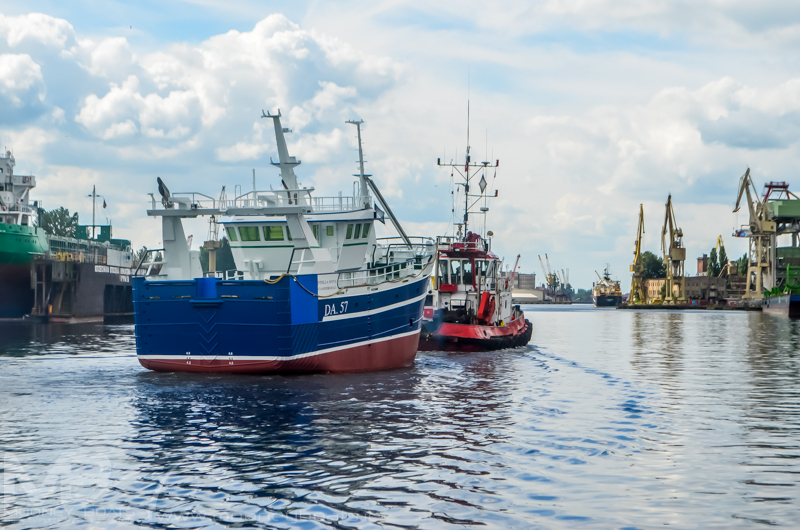 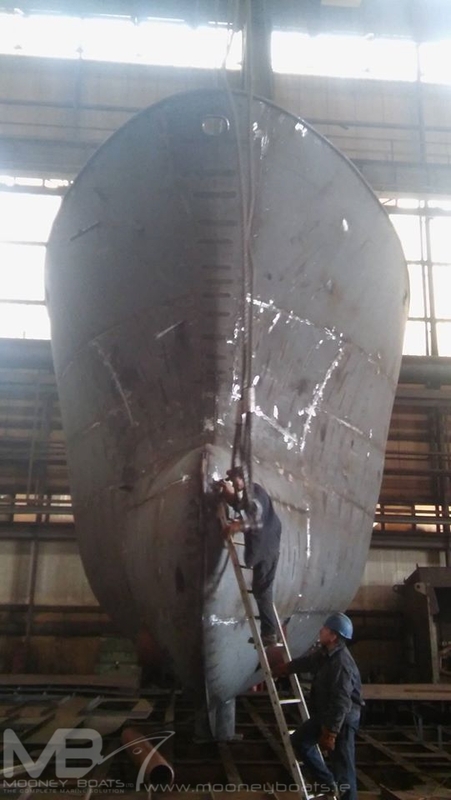 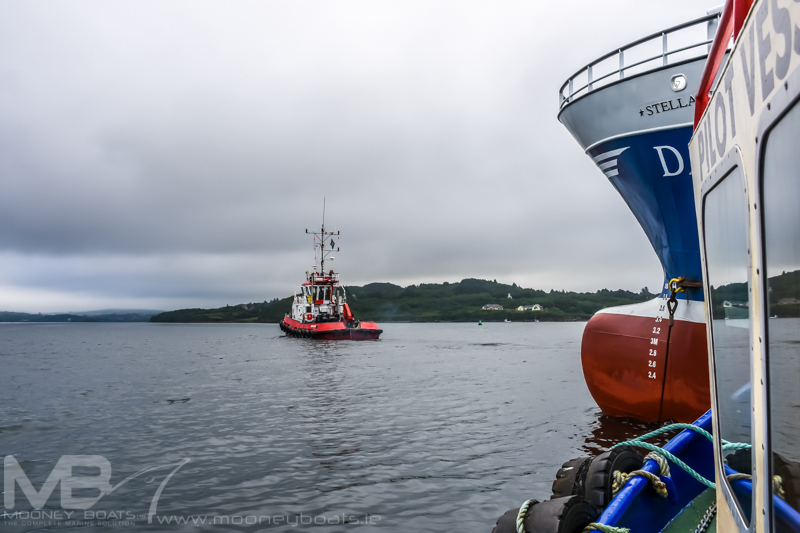 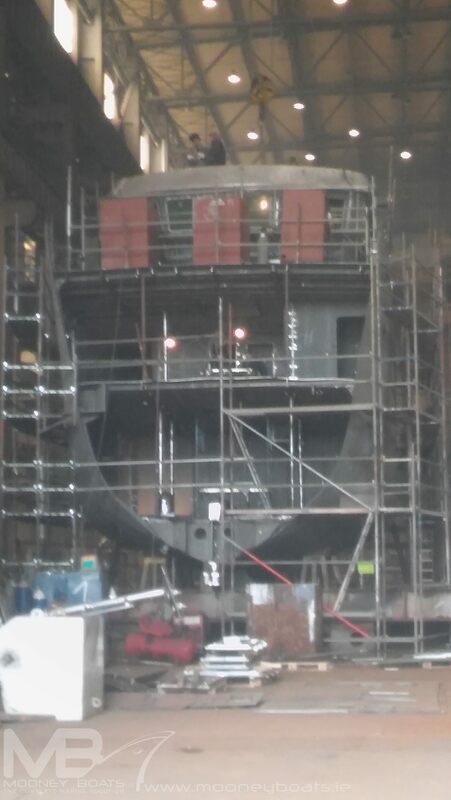 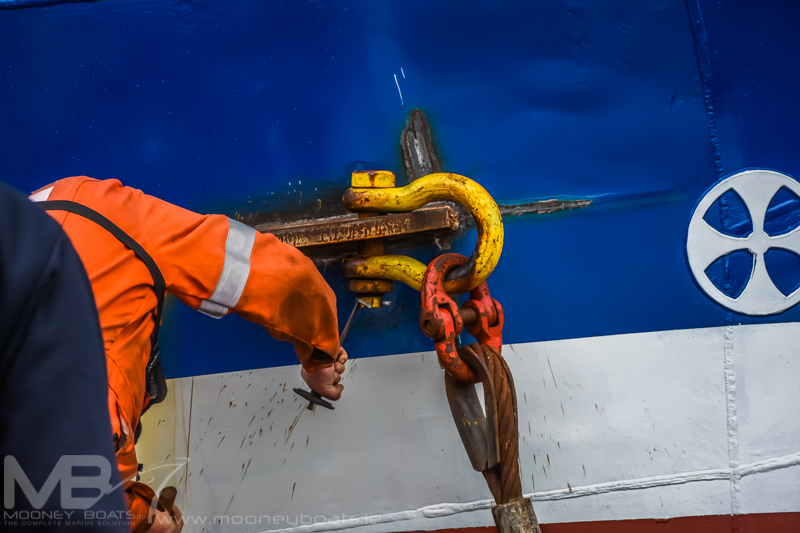 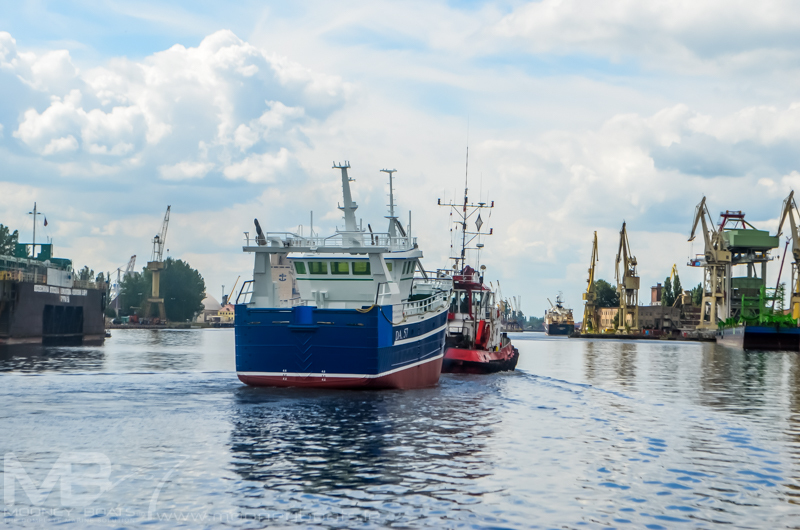 The hull was built in PTS Shipyard in Szczecin Poland and towed to Killybegs for finishing. 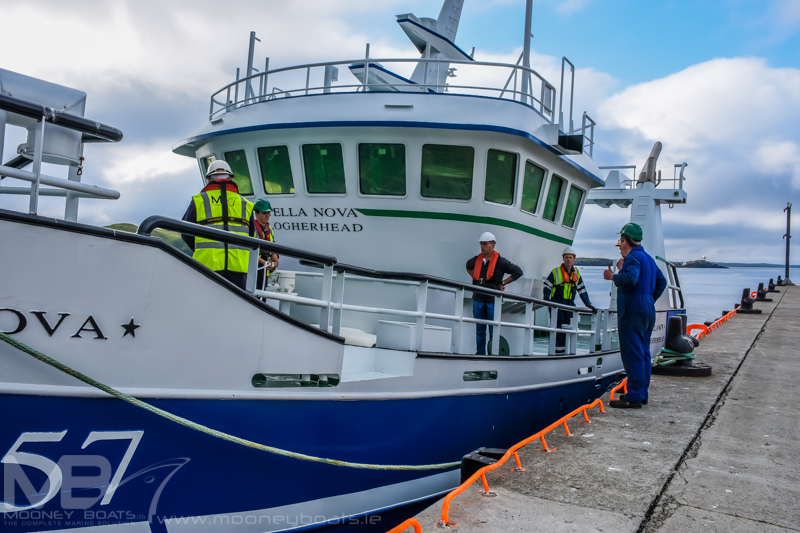 Previous boats designed by ‘Vestværftet ApS for the company included the old ‘Stella Nova’, a previous ‘Patrick C’. 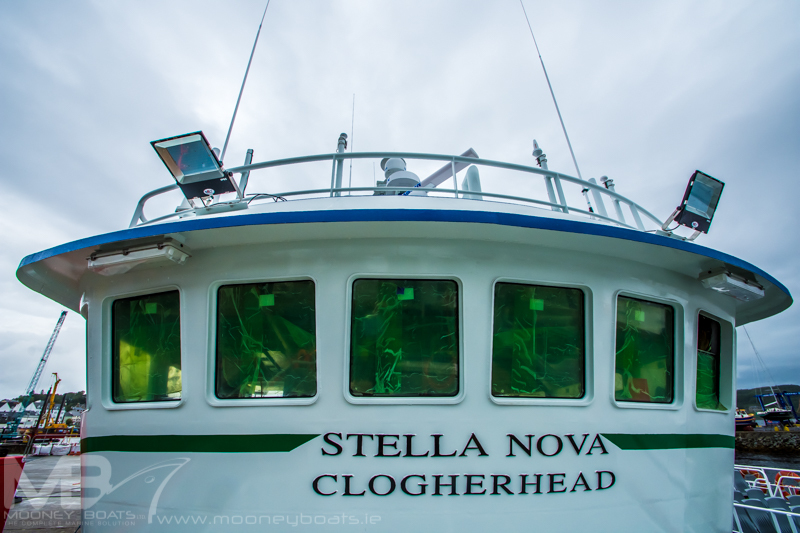 the current ‘Patrick C’ and the all new ‘Stella Nova’. 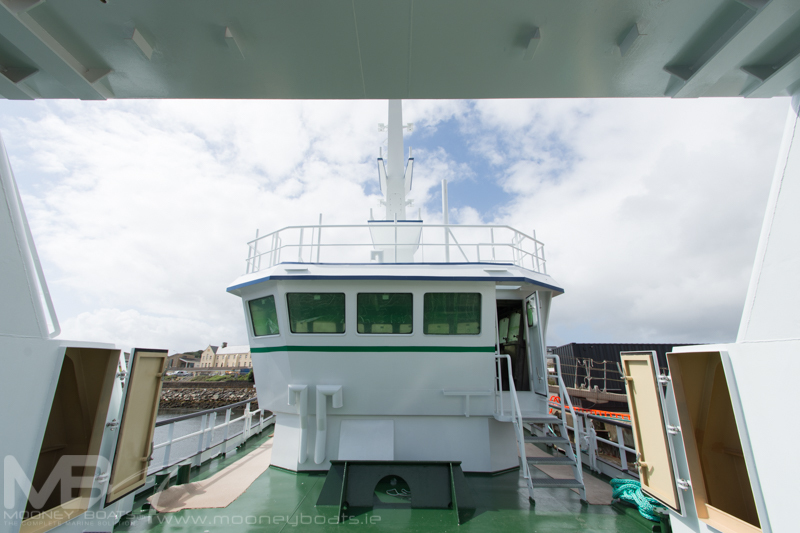 There are a few little differences in the design to the ‘Patrick C’ but overall nothing noticeable to the naked eye. 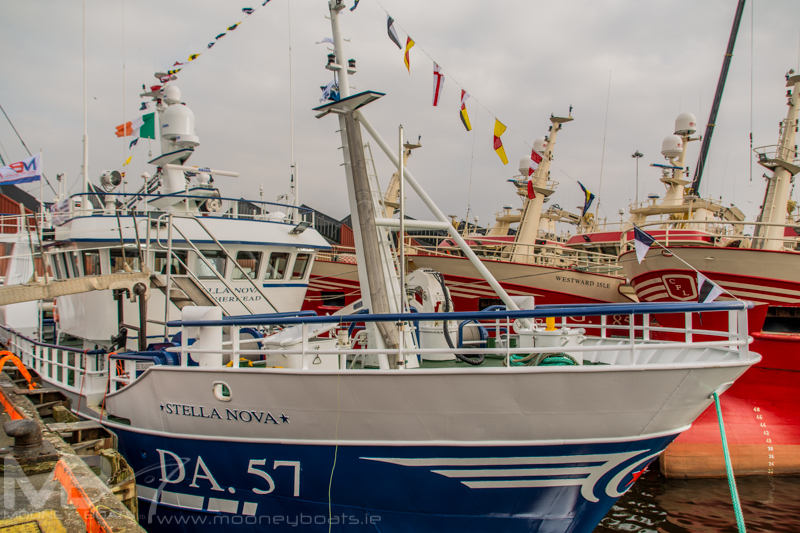 The style of the ‘Stella Nova’ is classic and looks well in the water. 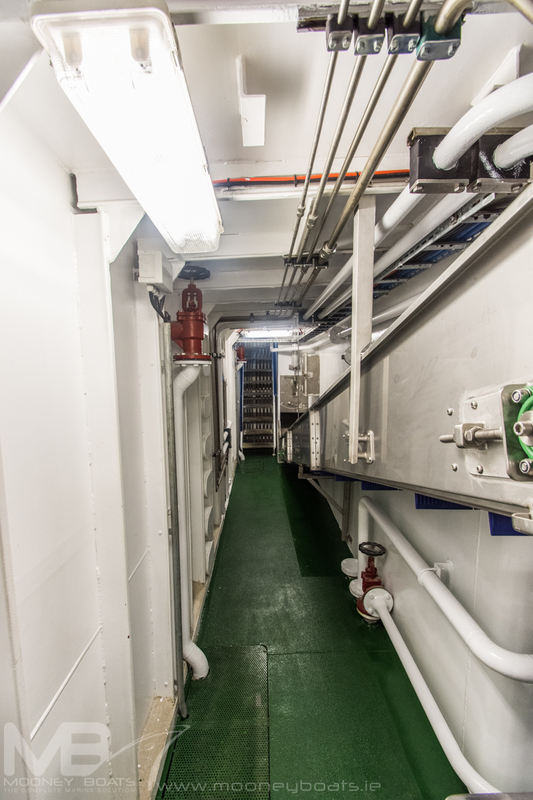 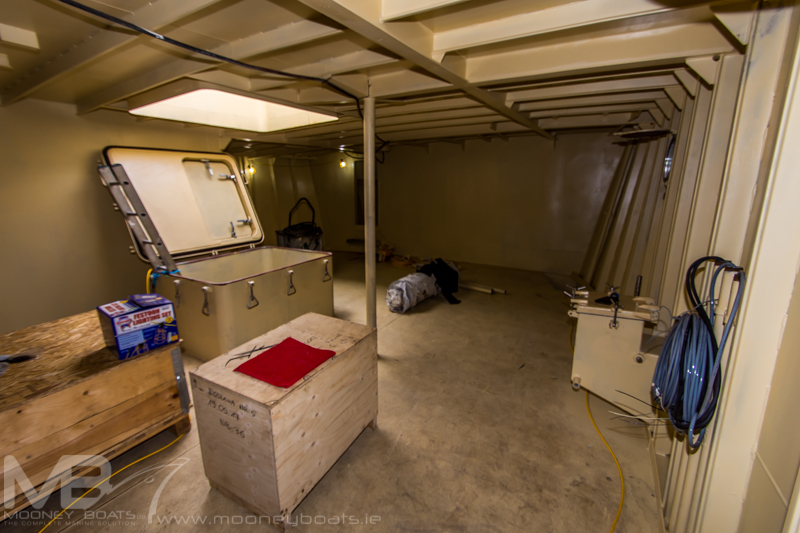 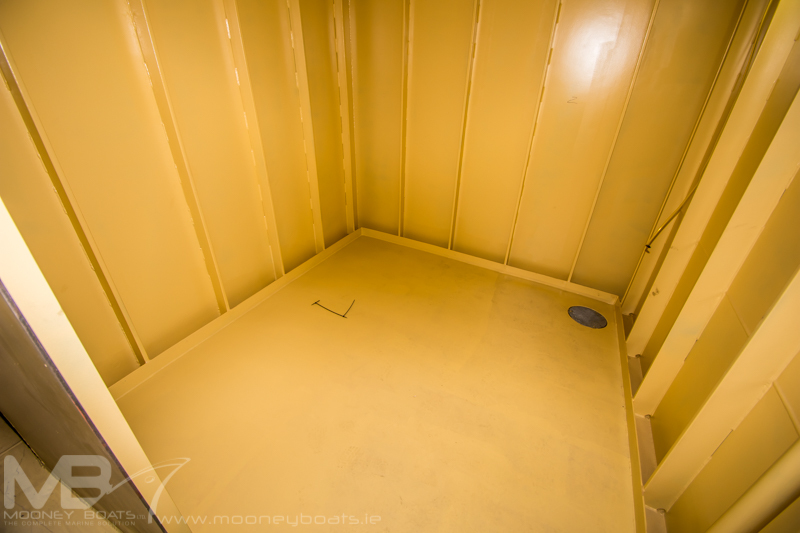 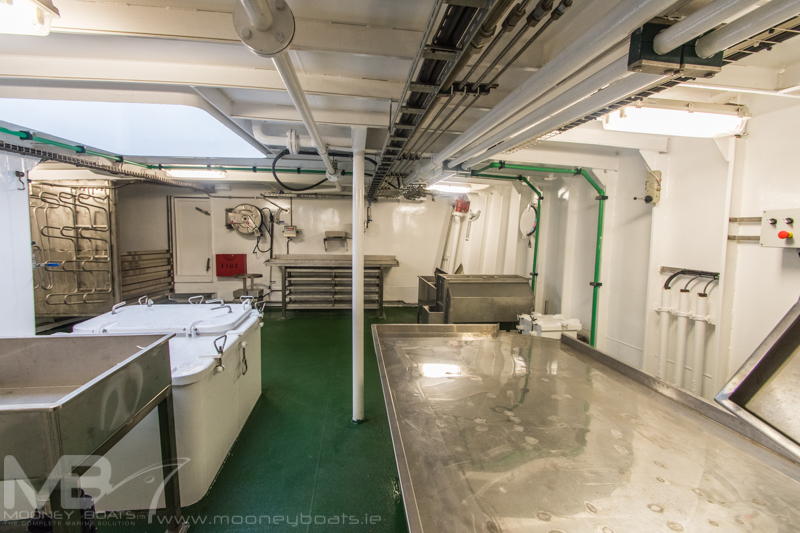 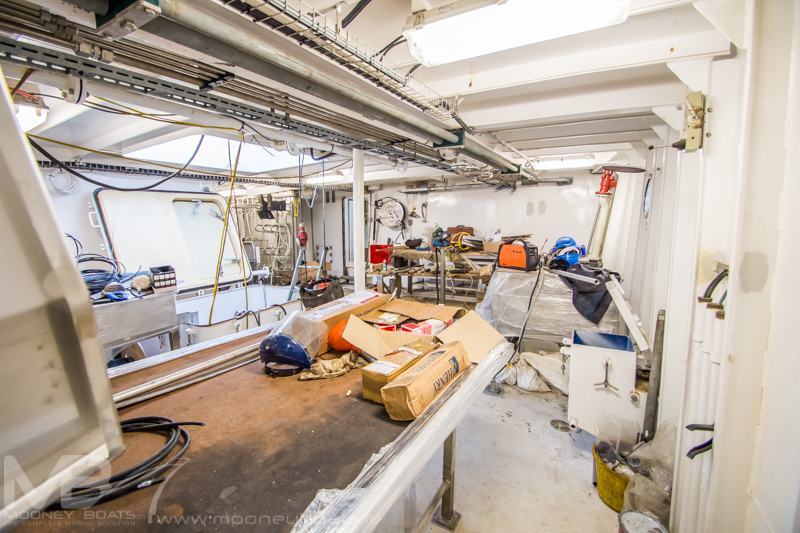 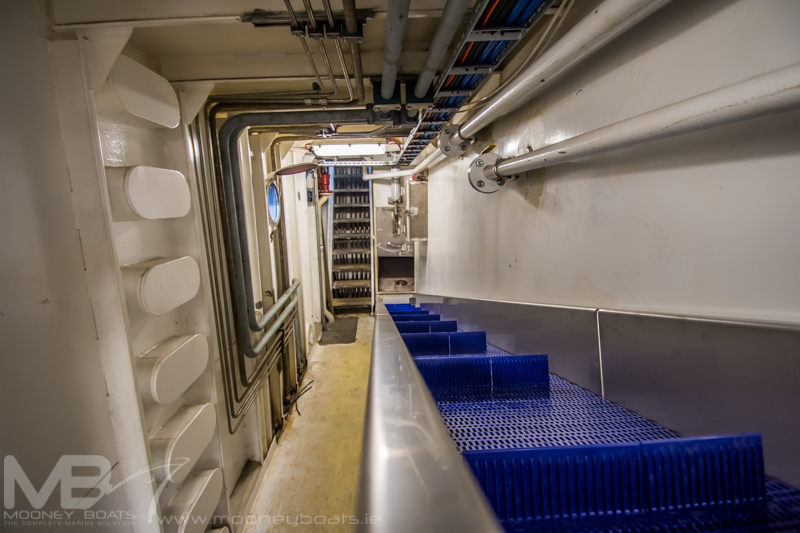 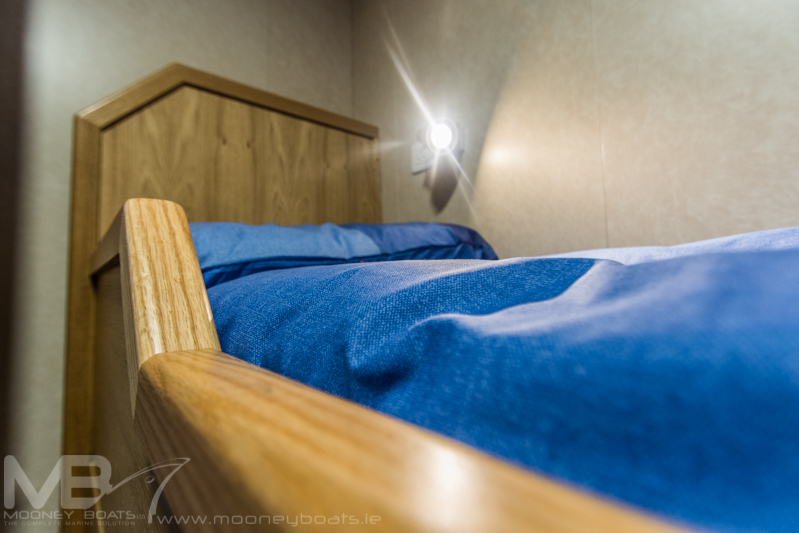 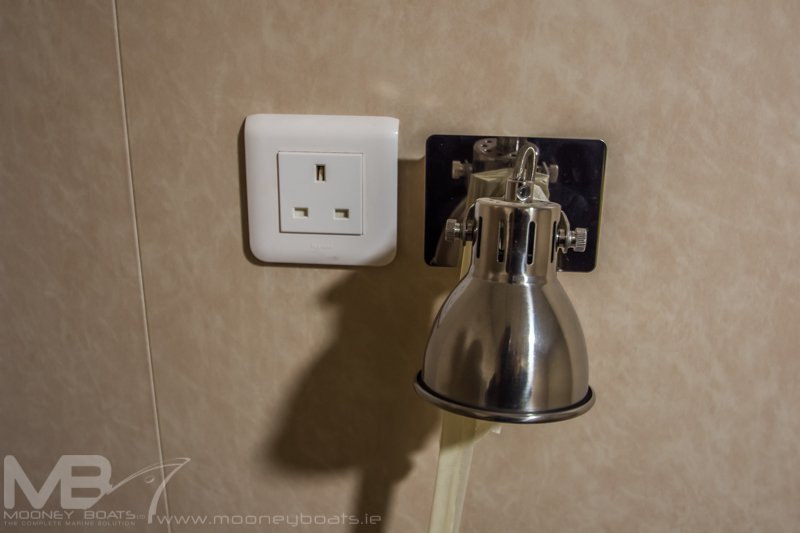 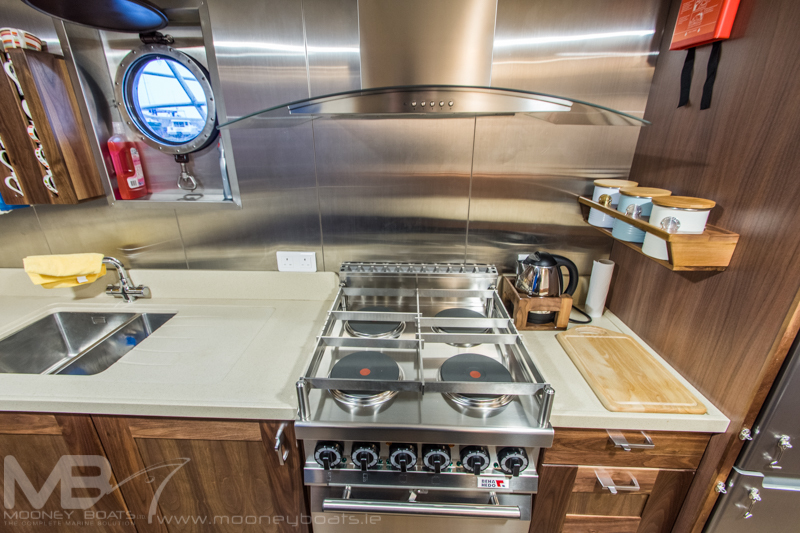 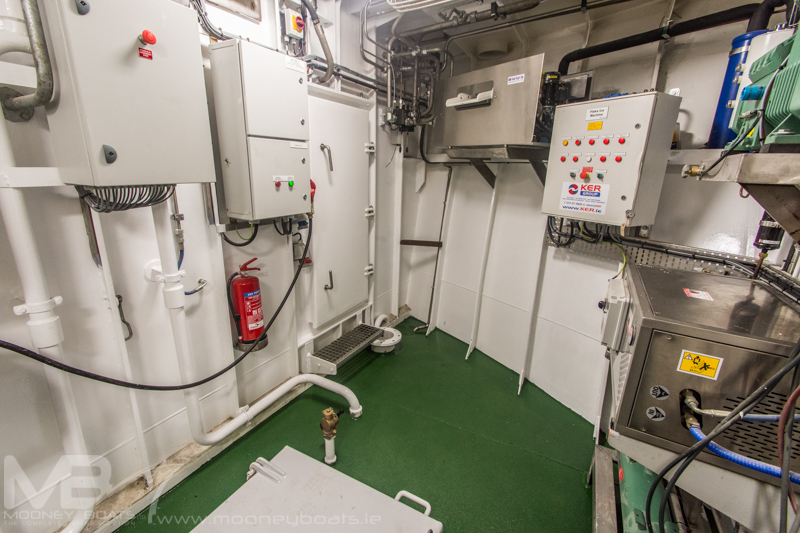 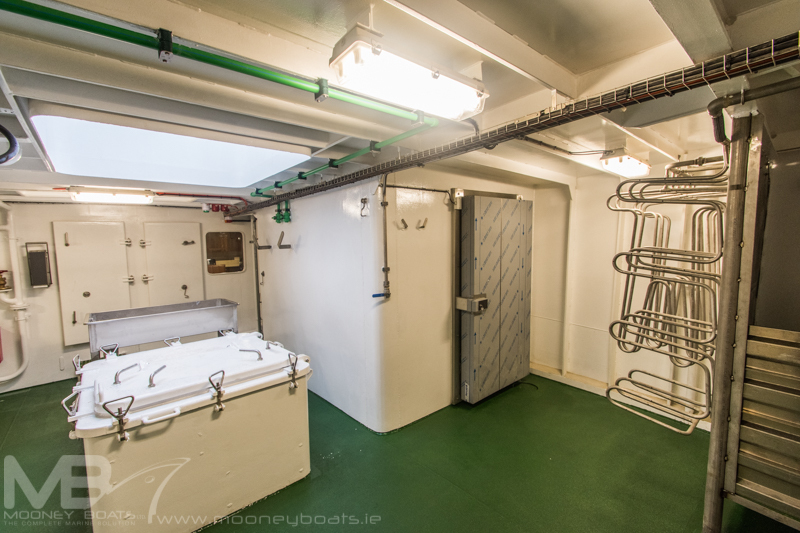 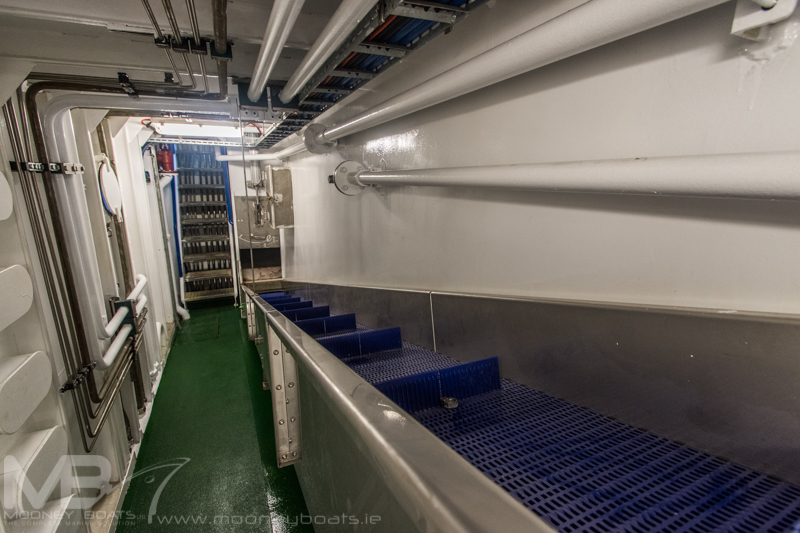 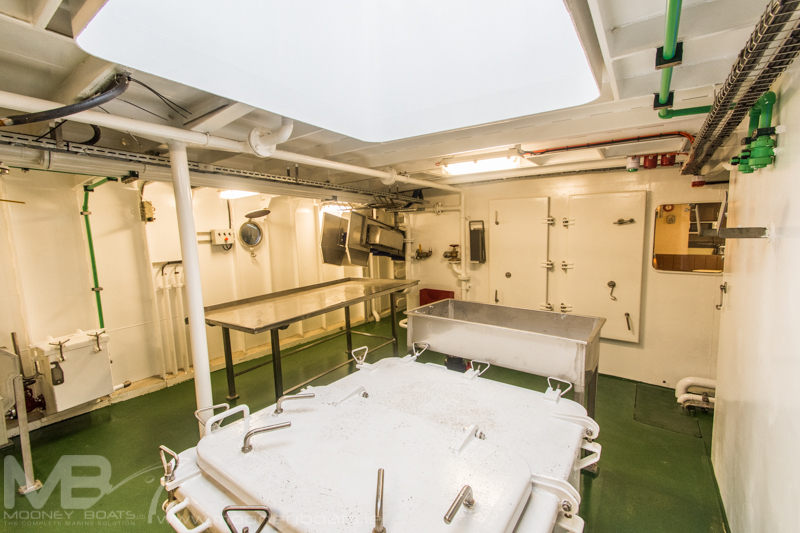 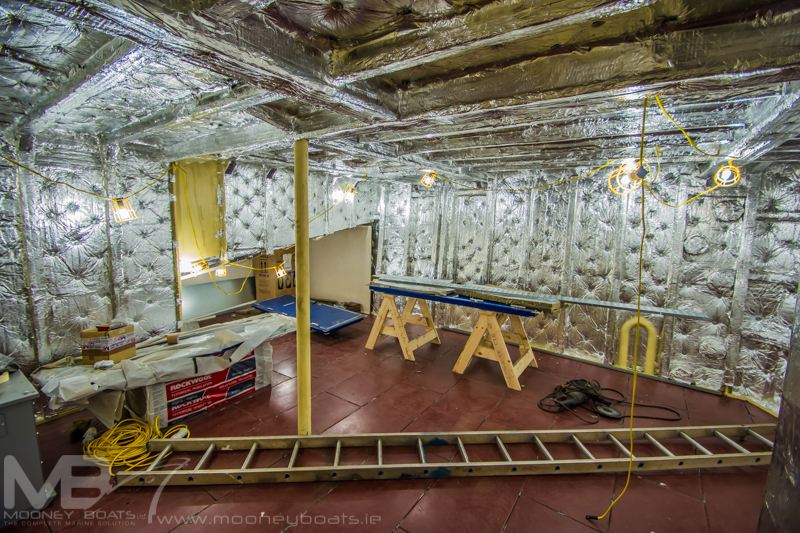 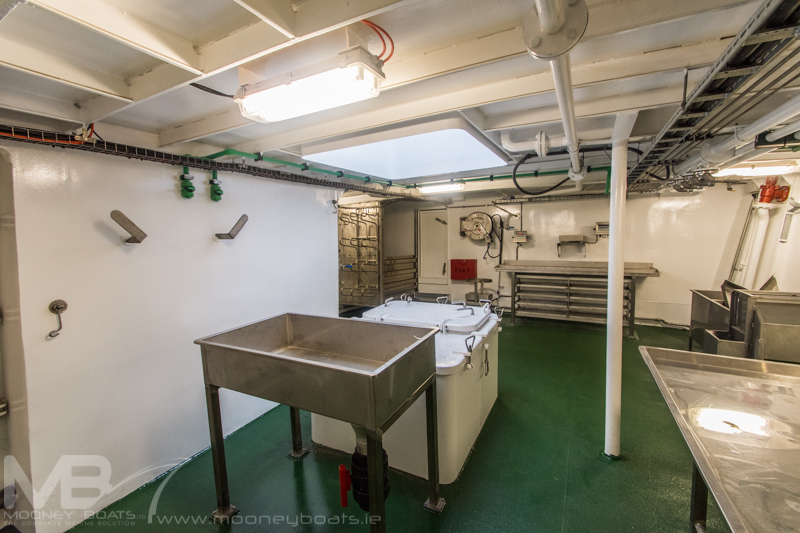 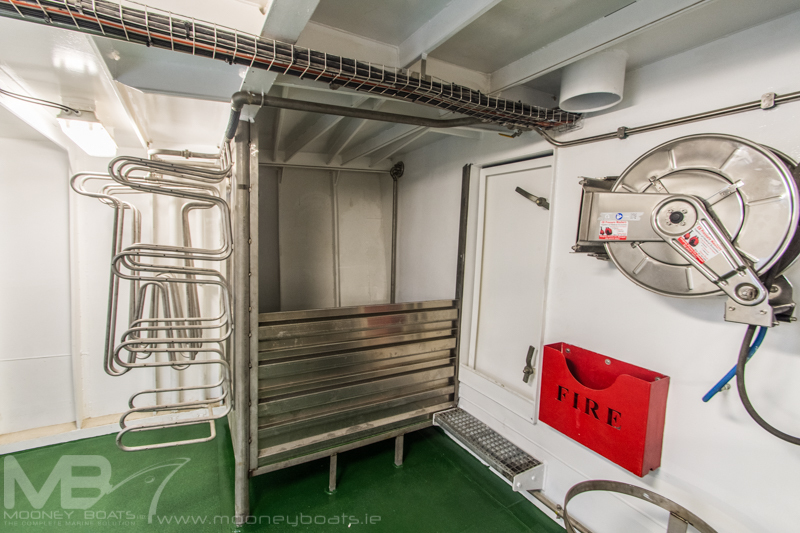 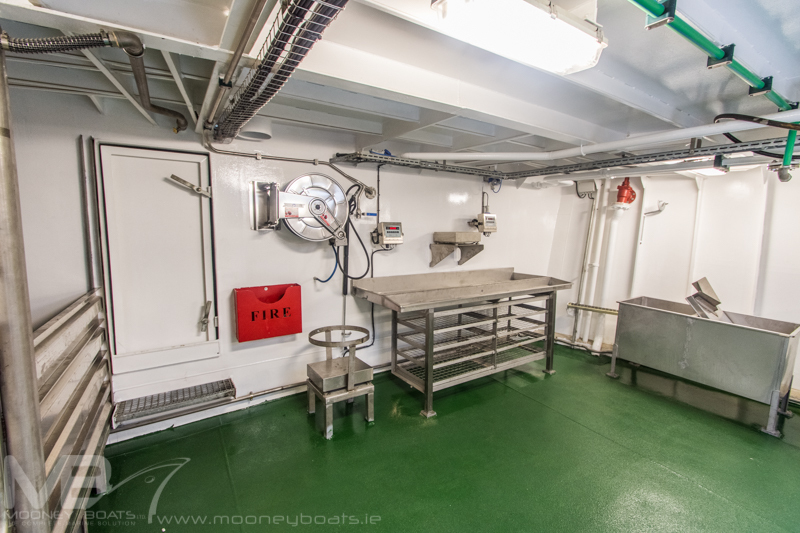 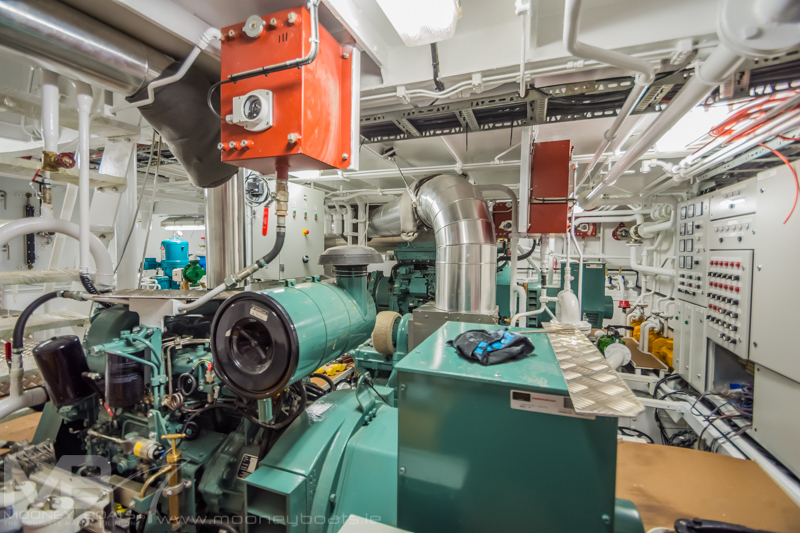 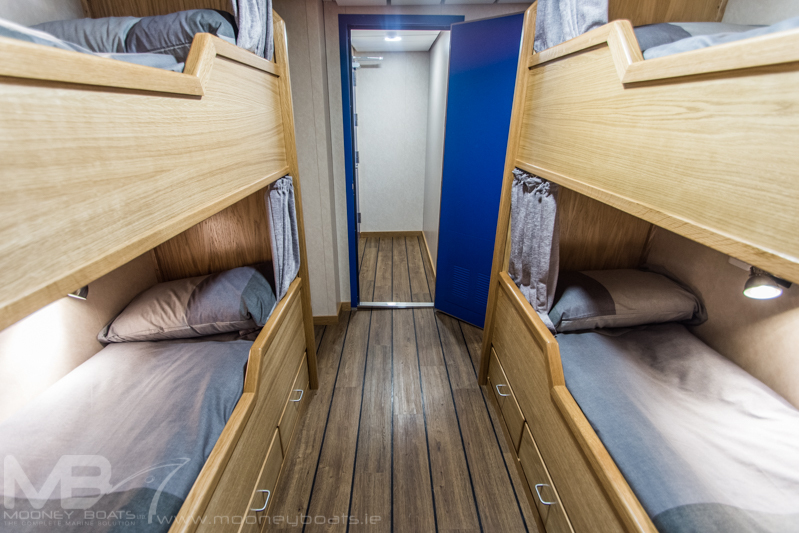 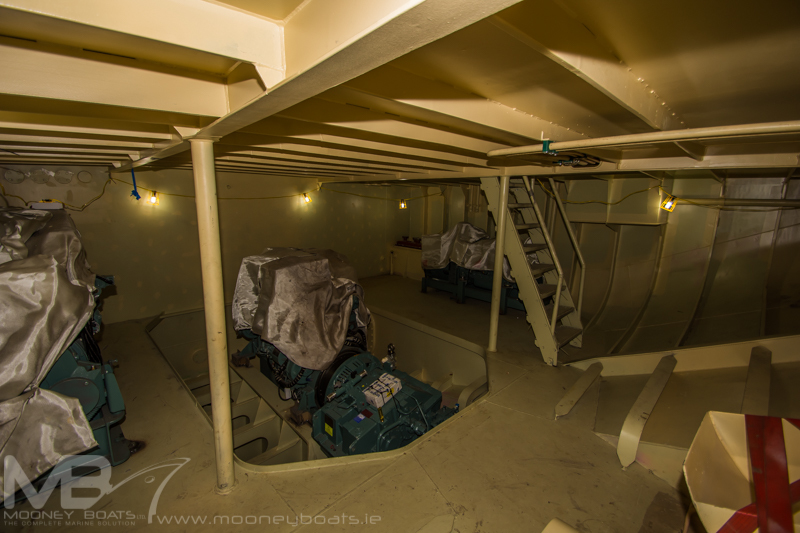 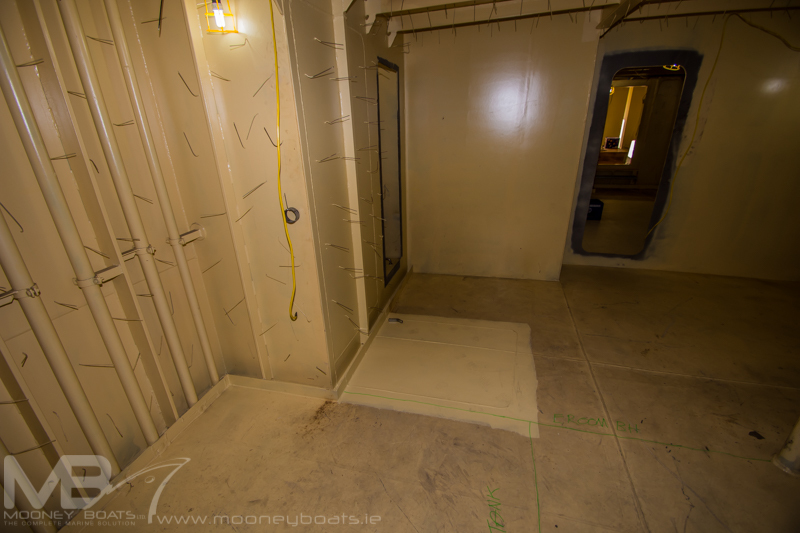 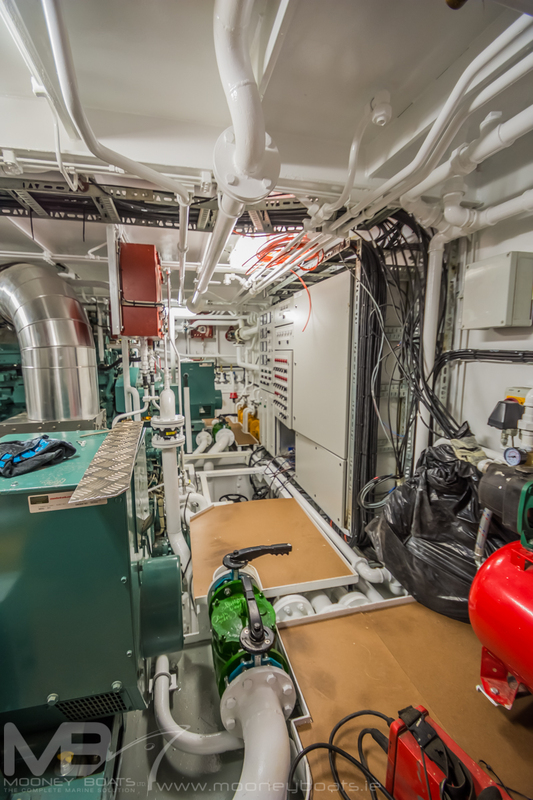 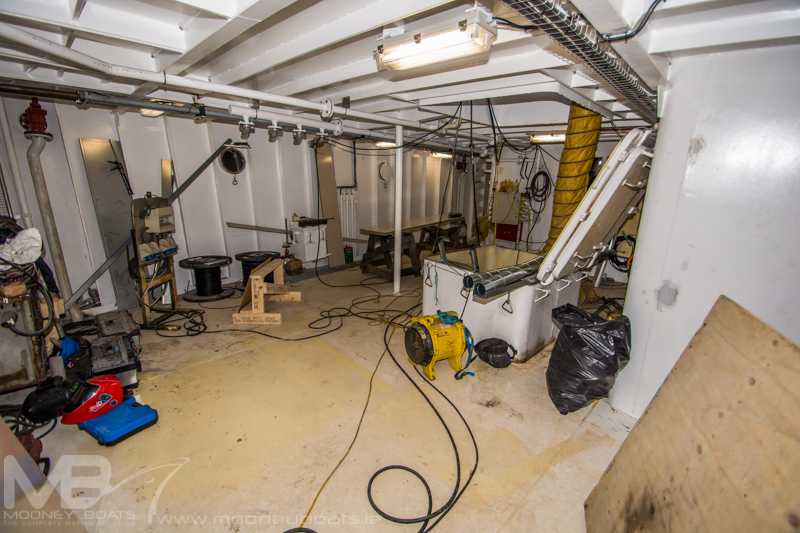 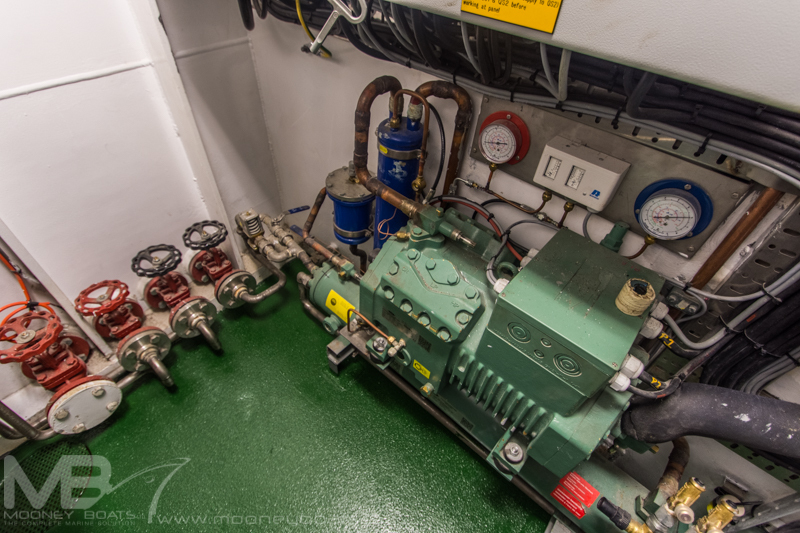 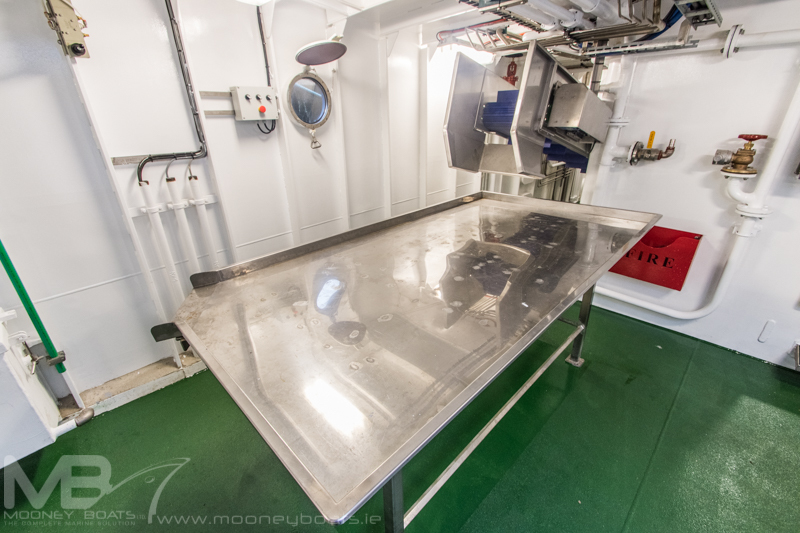 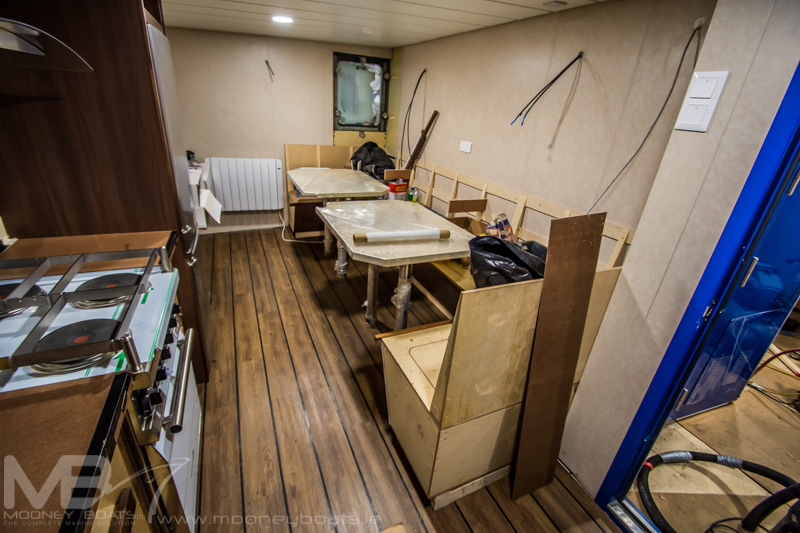 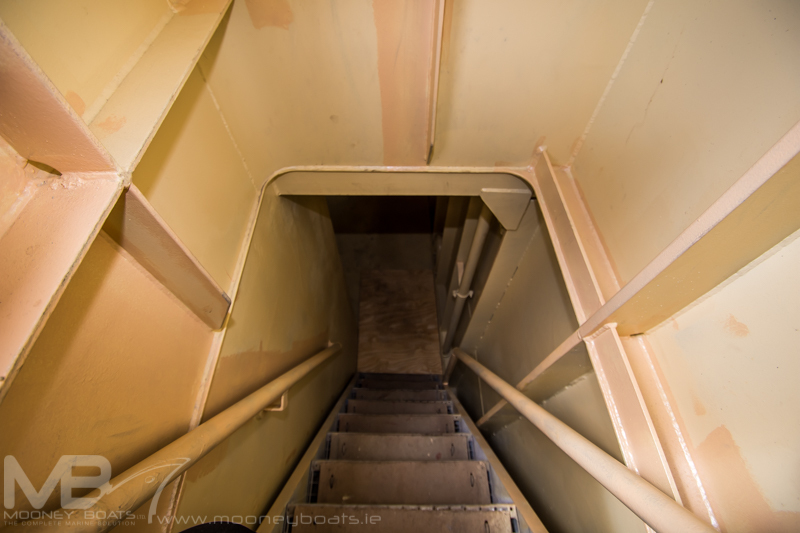 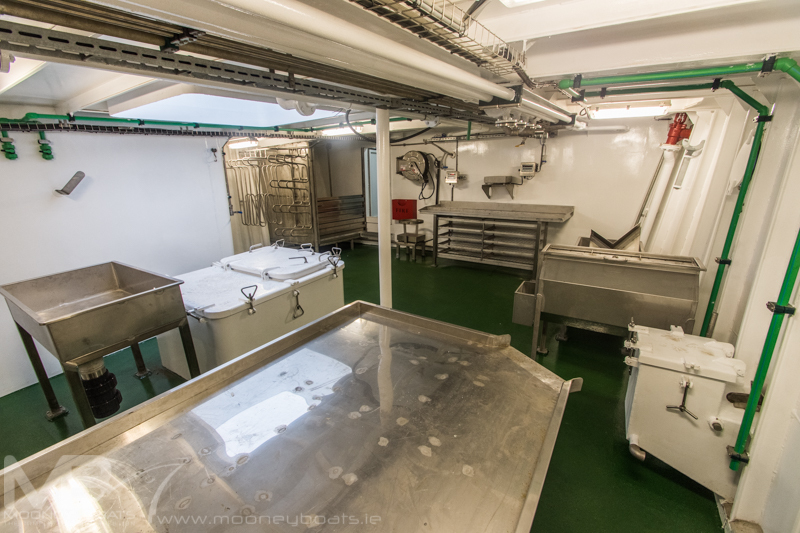 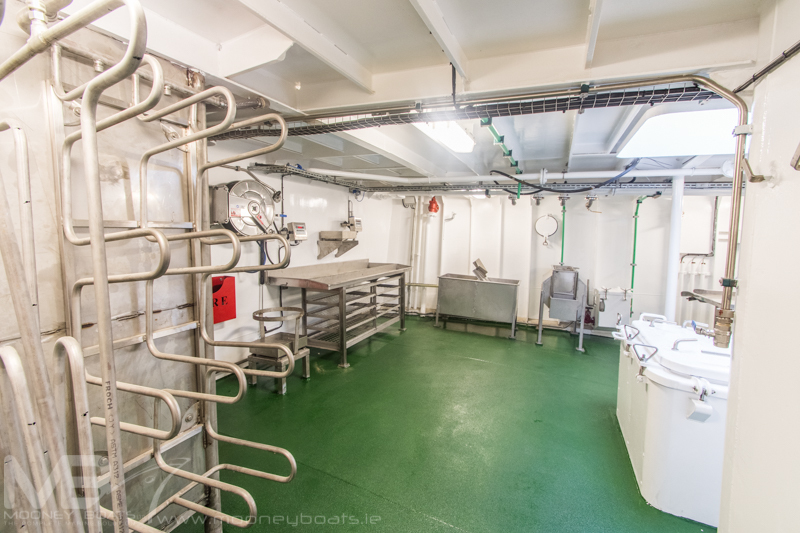 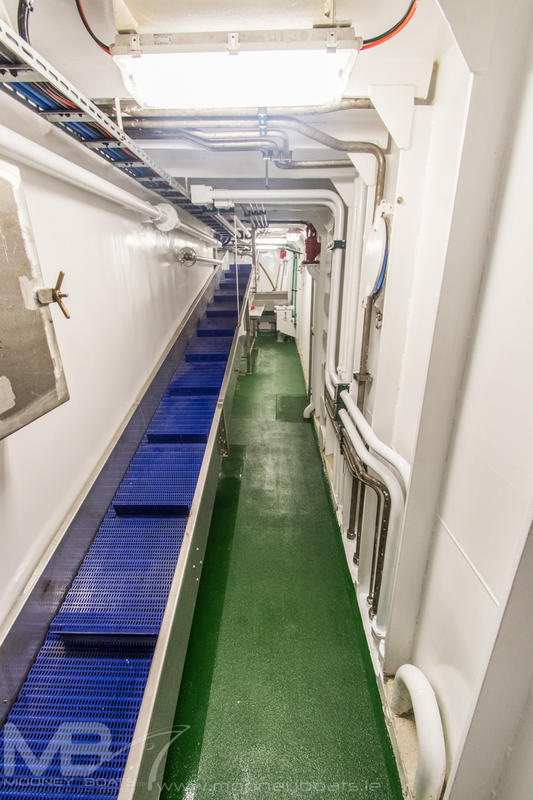 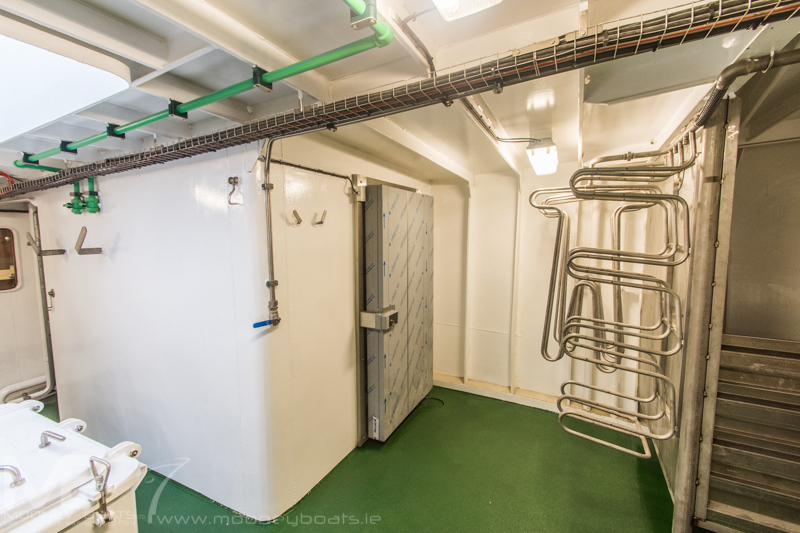 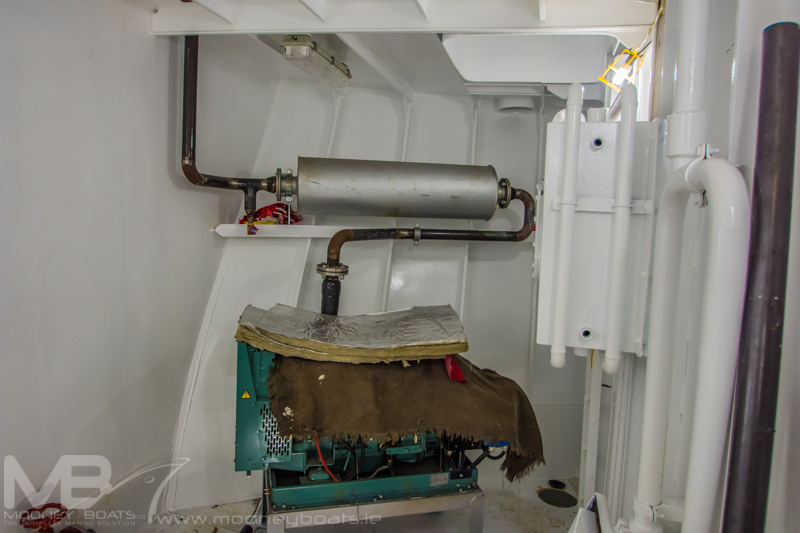 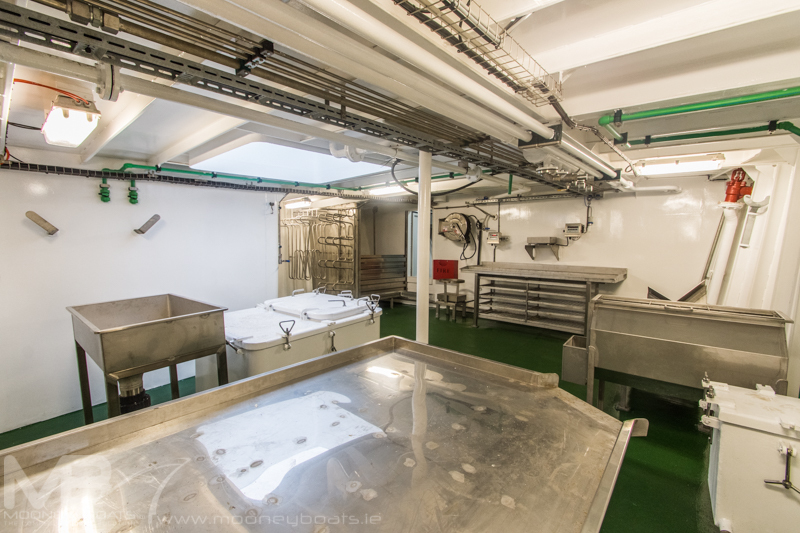 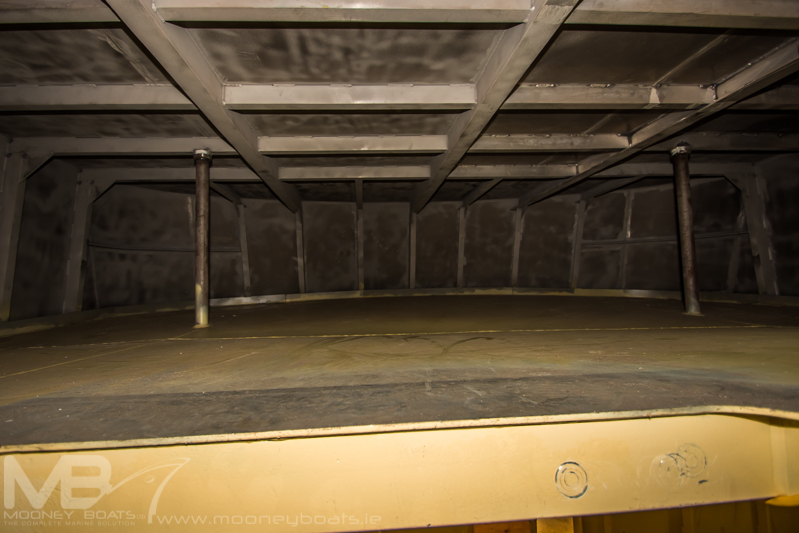 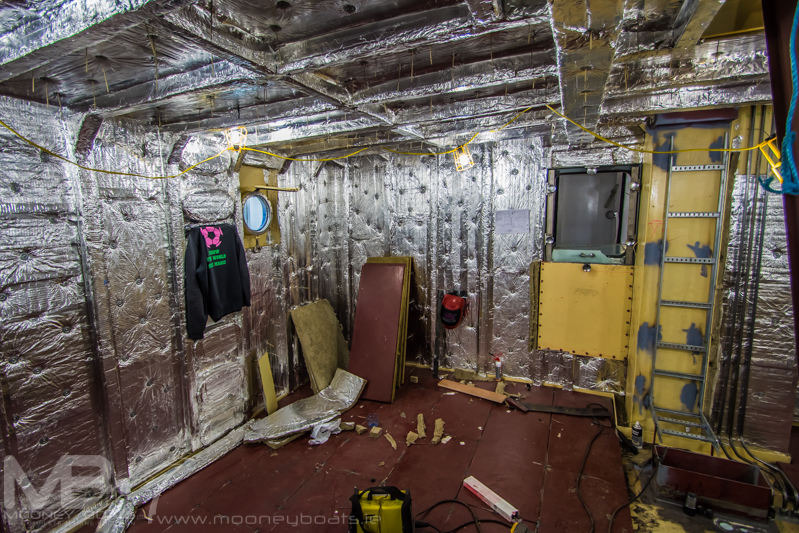 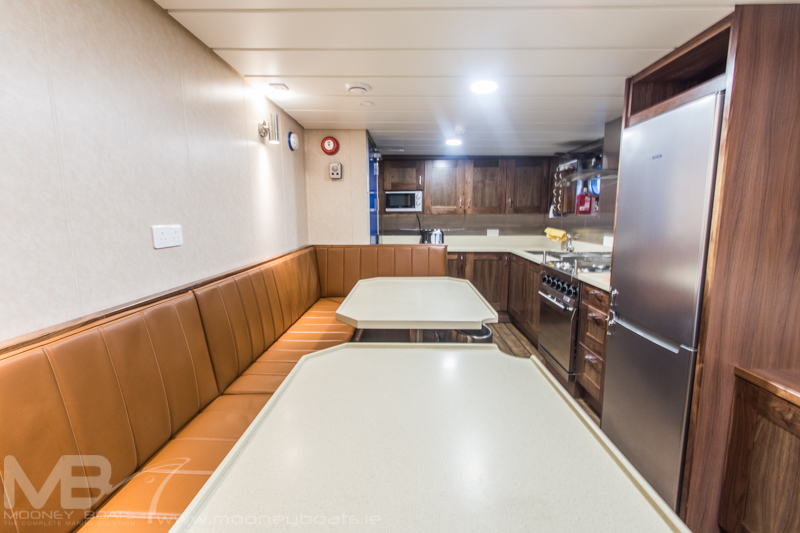 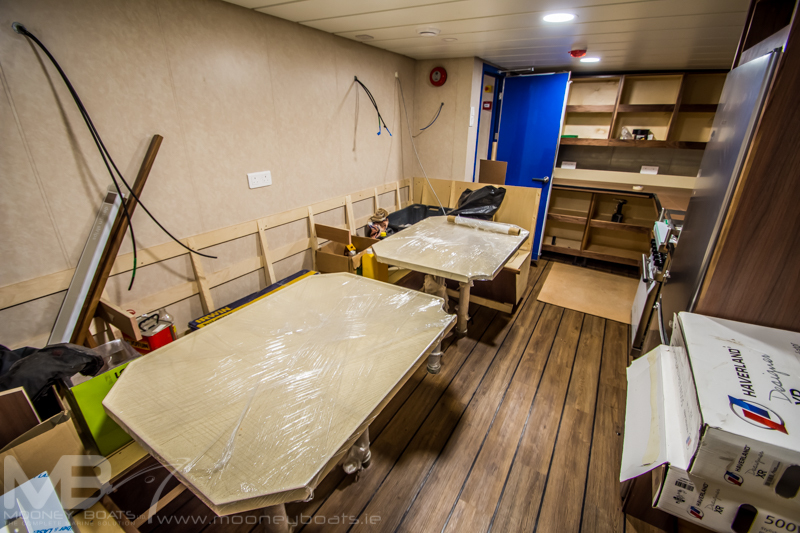 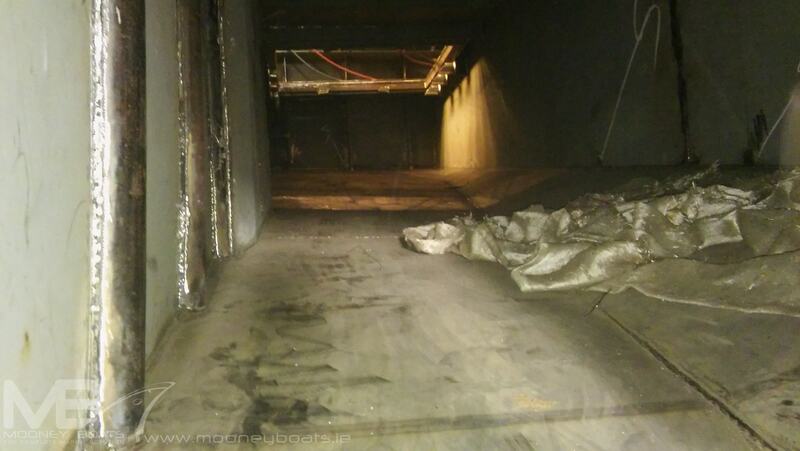 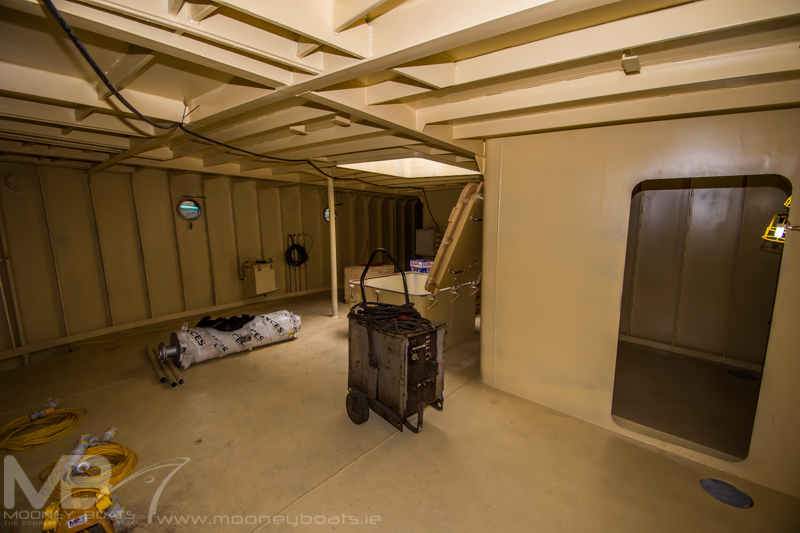 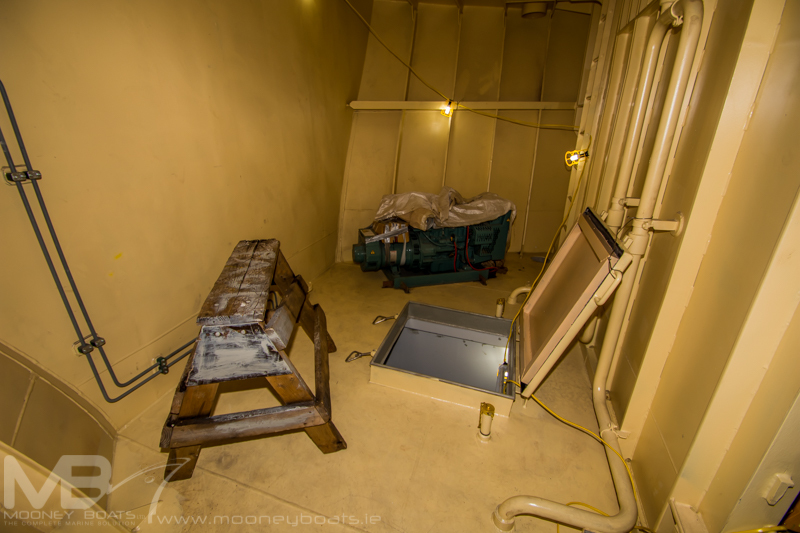 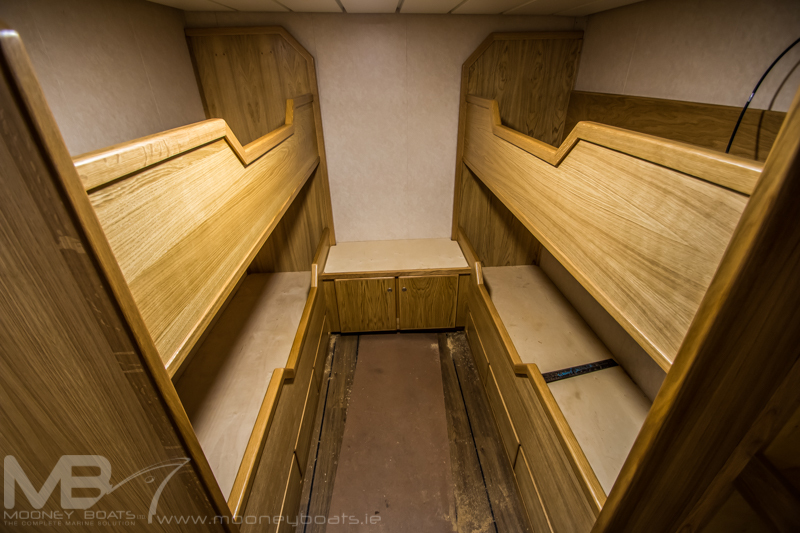 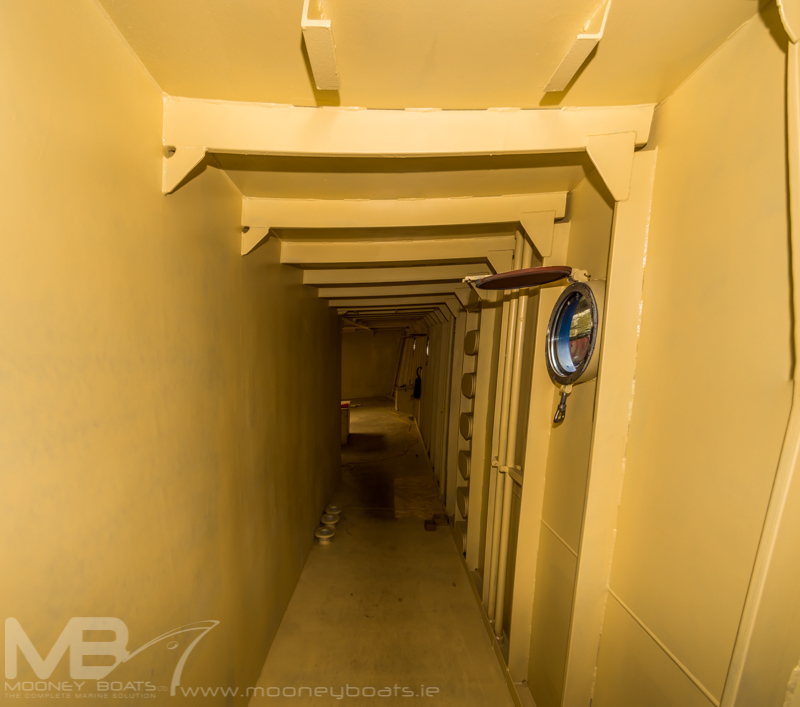 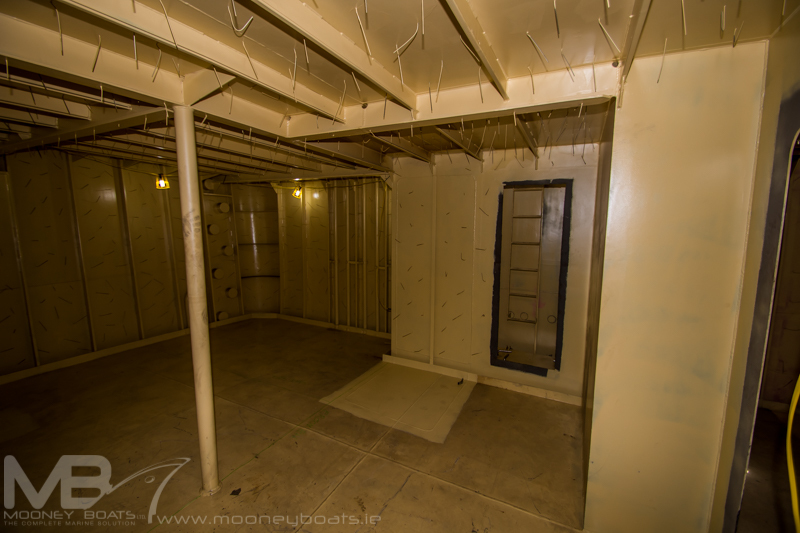 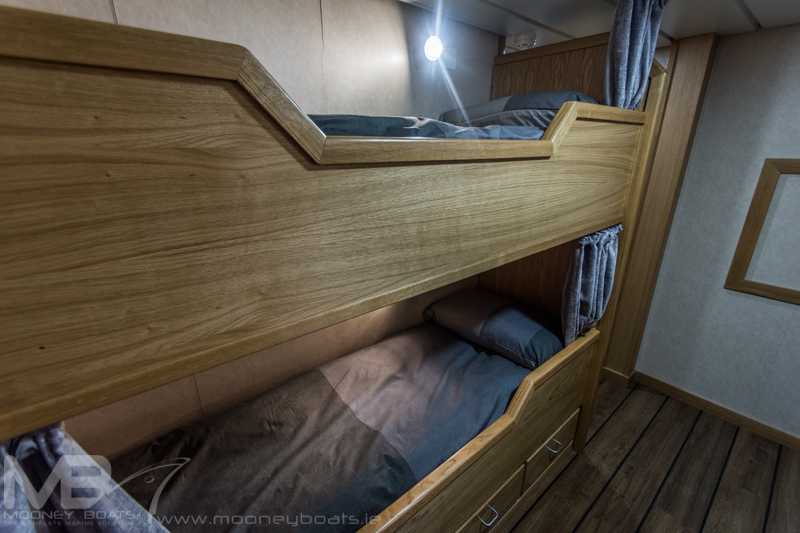 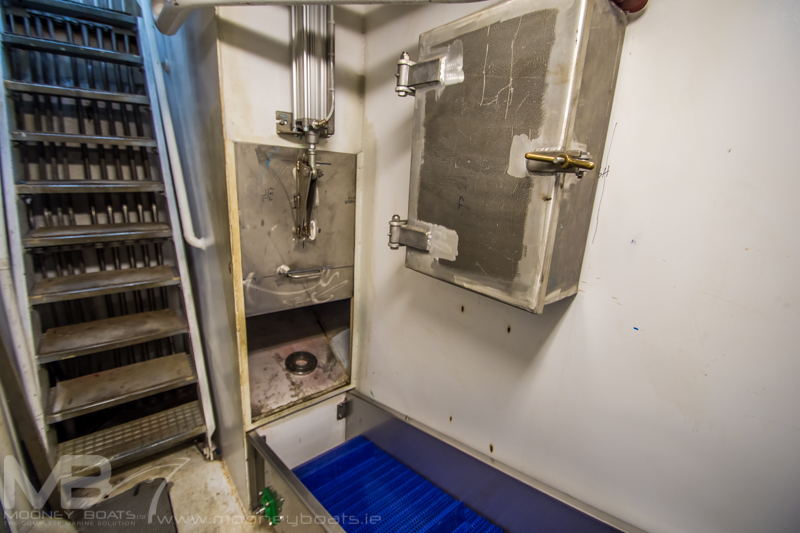 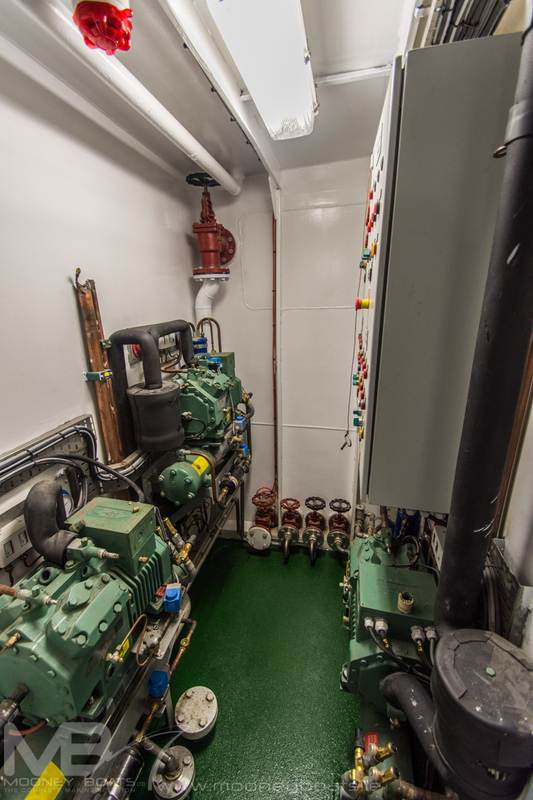 “The accommodation layout is a little different” Niall tells us with the galley moved to port side and the crew accommodation moved aft “and we also included the addition of extra freezing capacity but apart from that the rest of the boat remains the same. 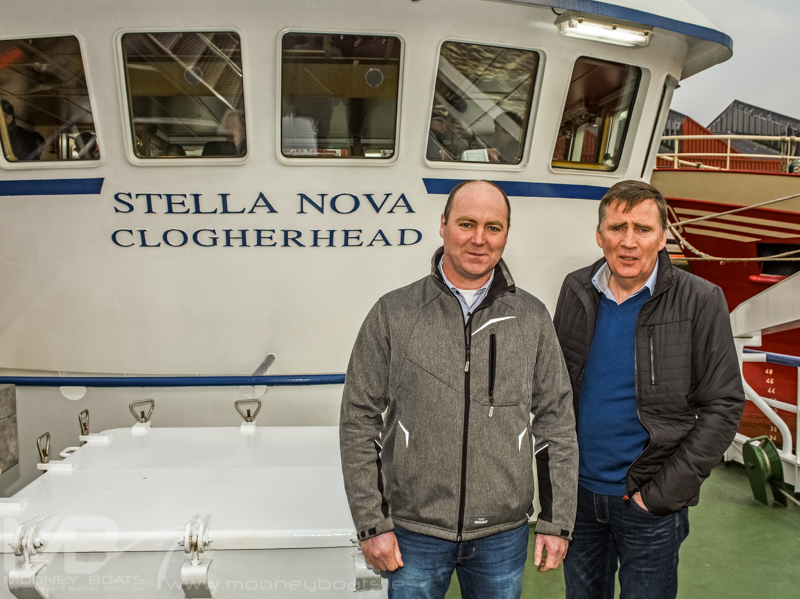 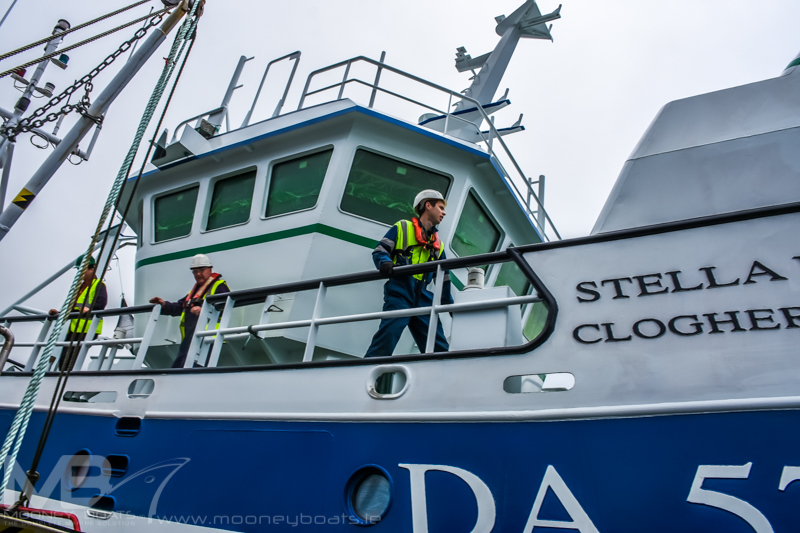 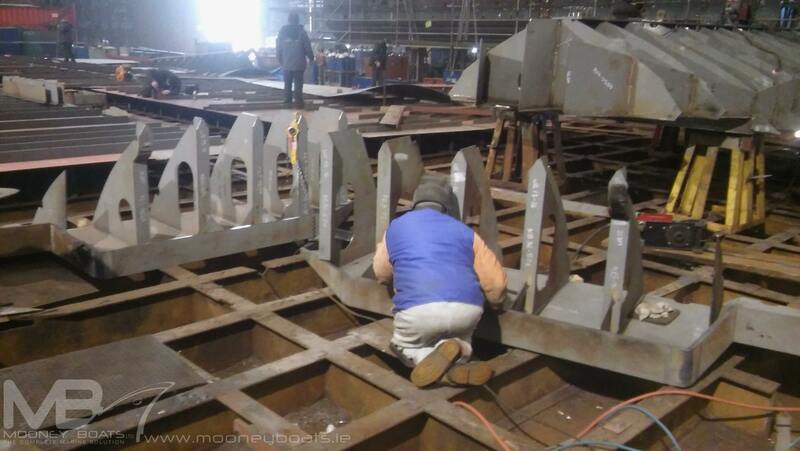 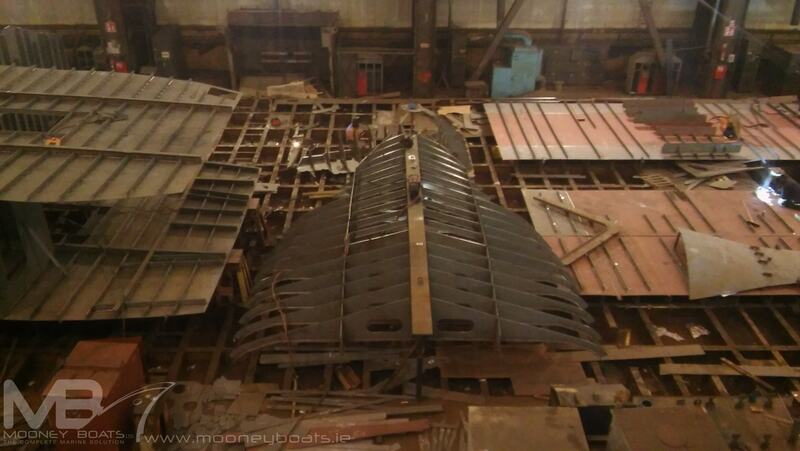 “Our previous experience with Mooney Boats Ltd gave us the confidence to return here to get the ‘Stella Nova’ built. 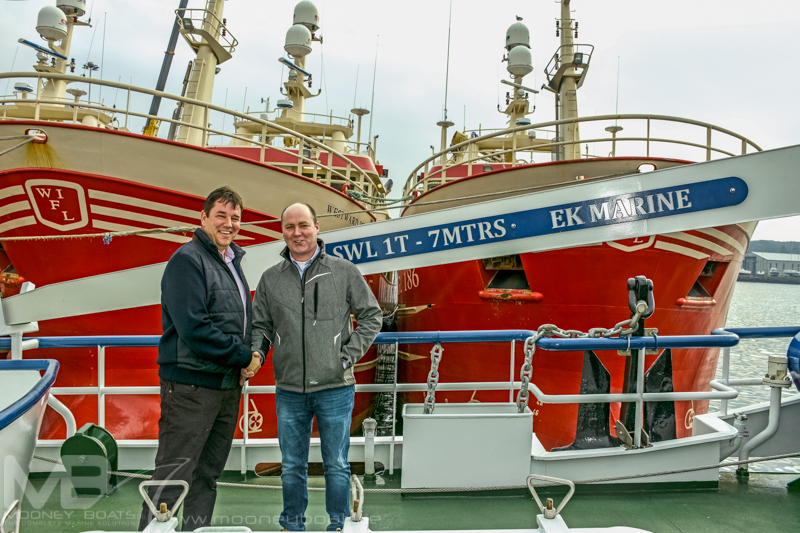 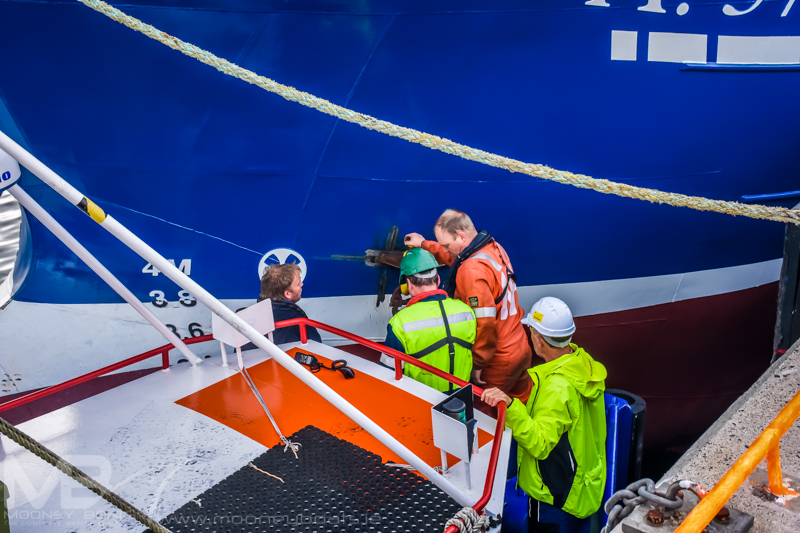 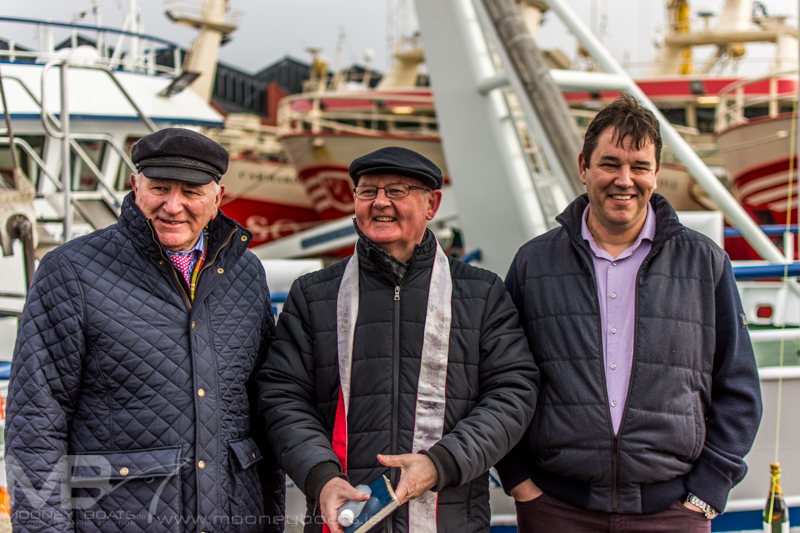 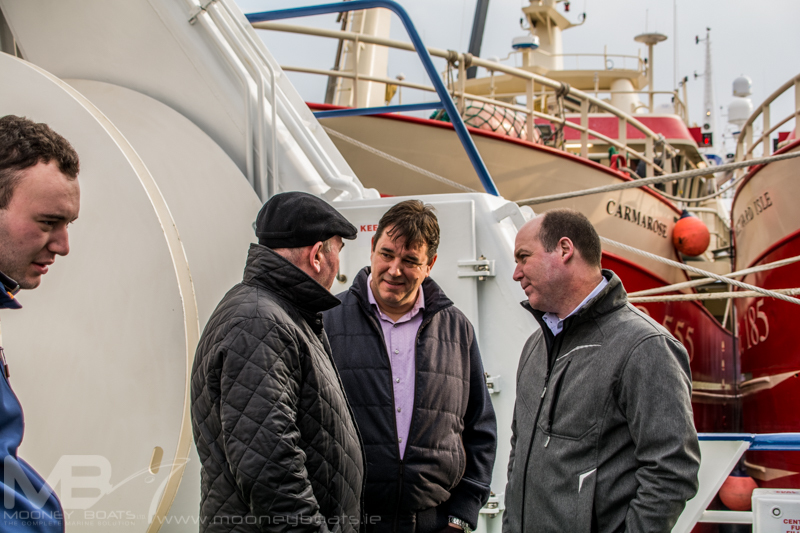 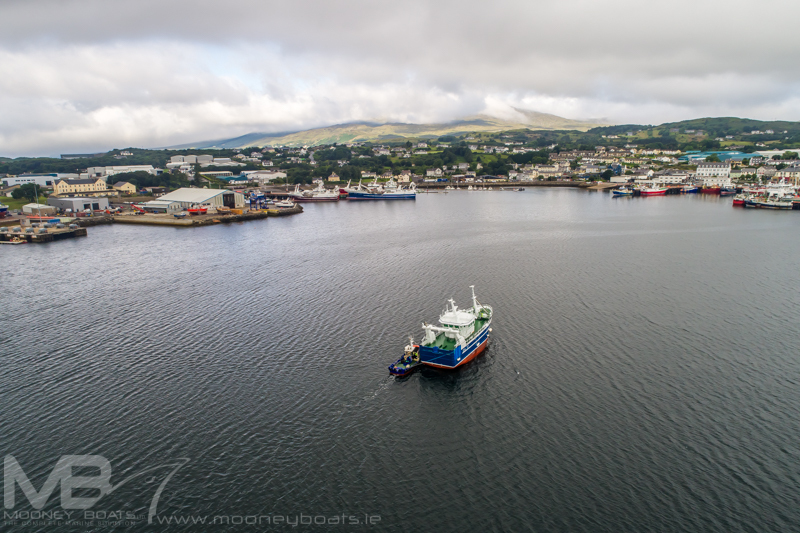 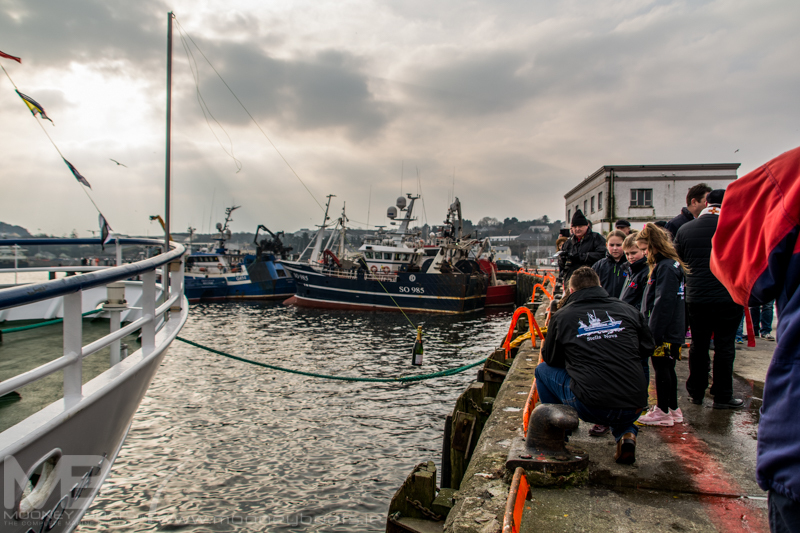 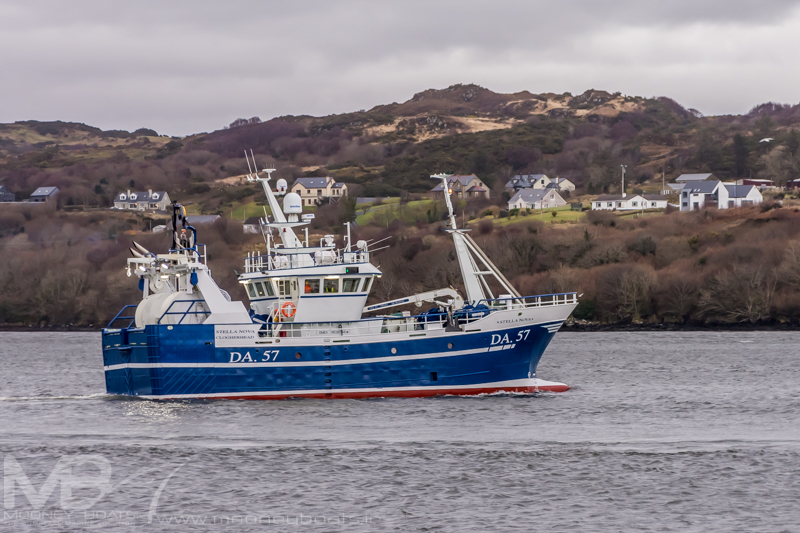 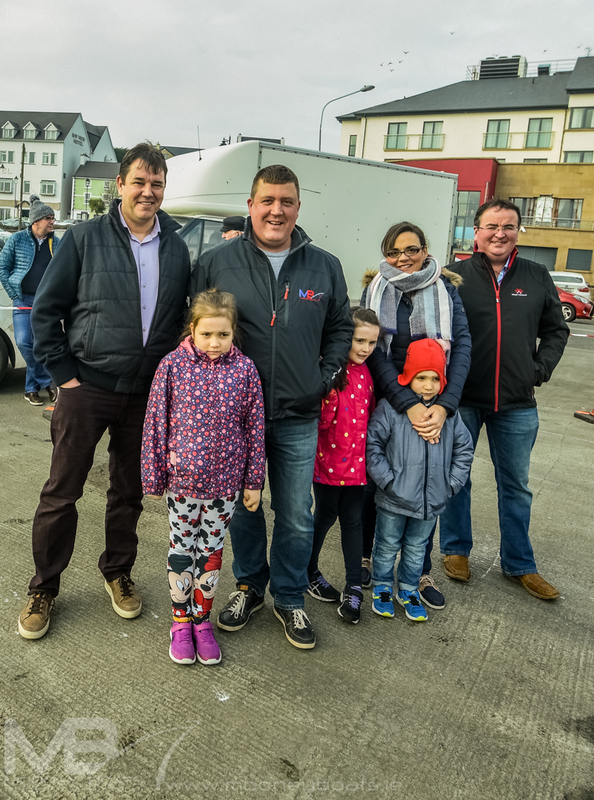 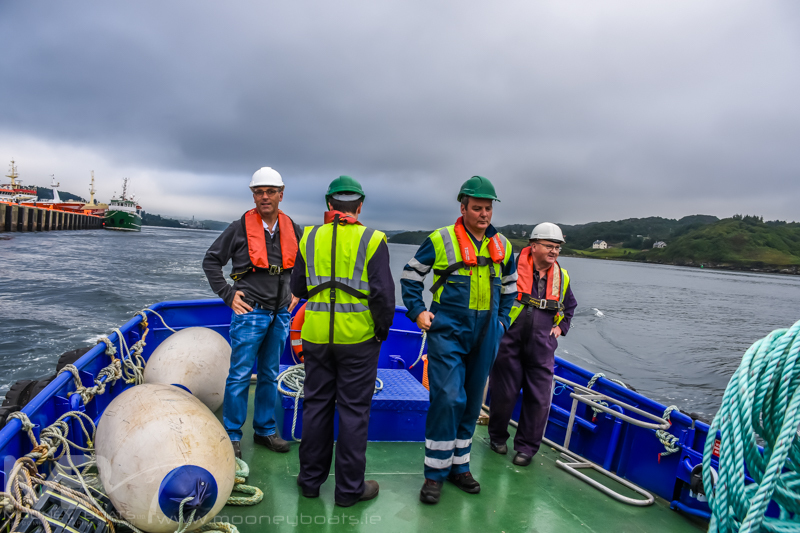 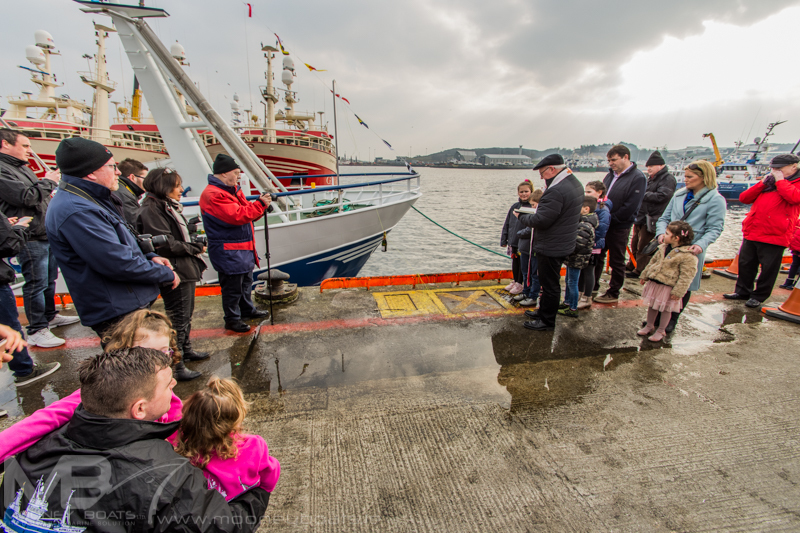 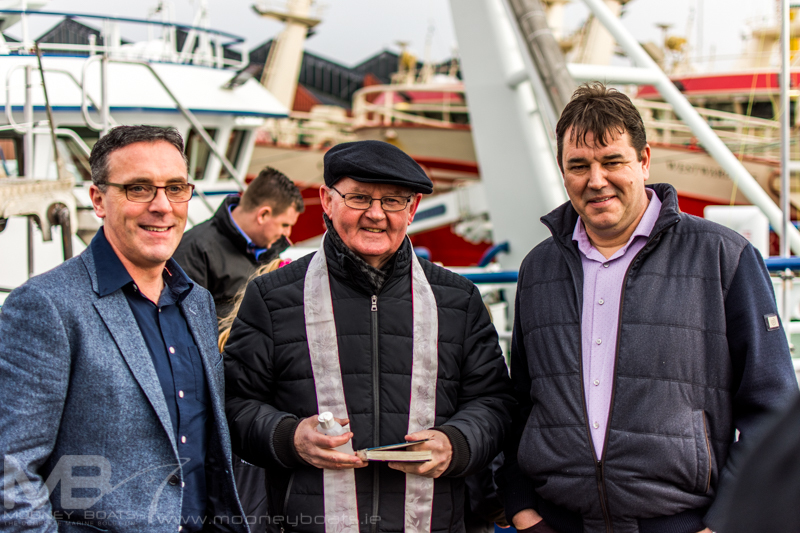 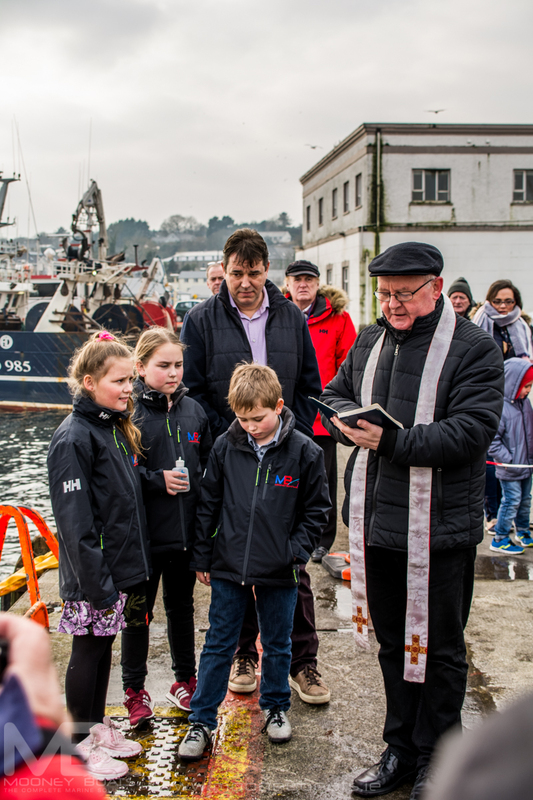 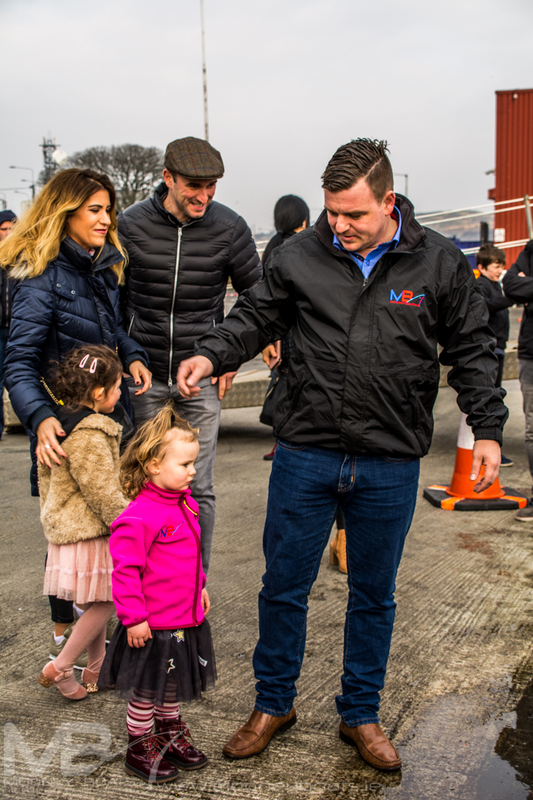 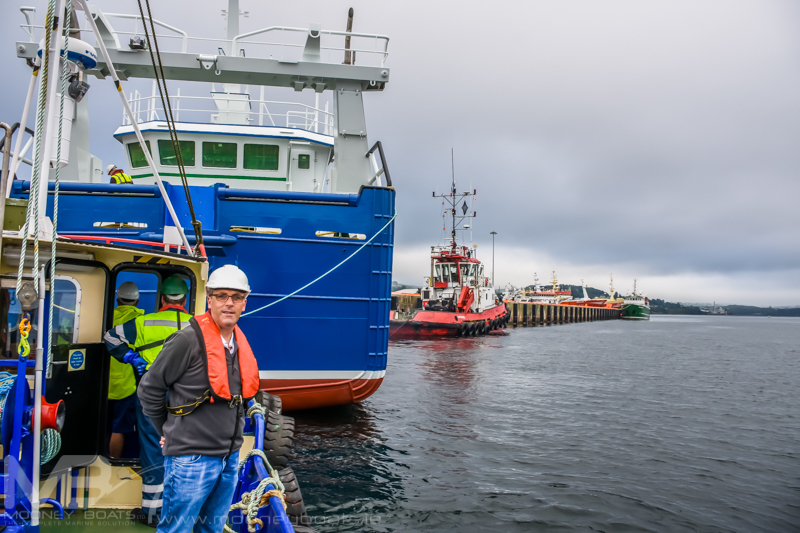 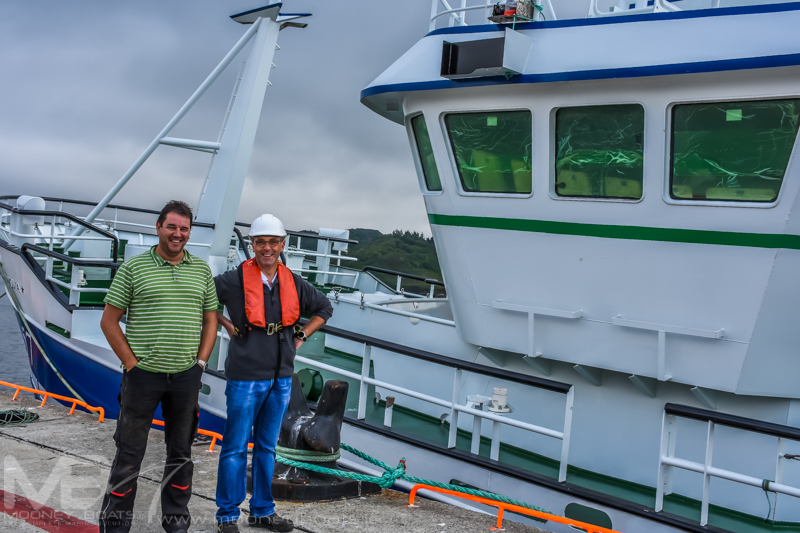 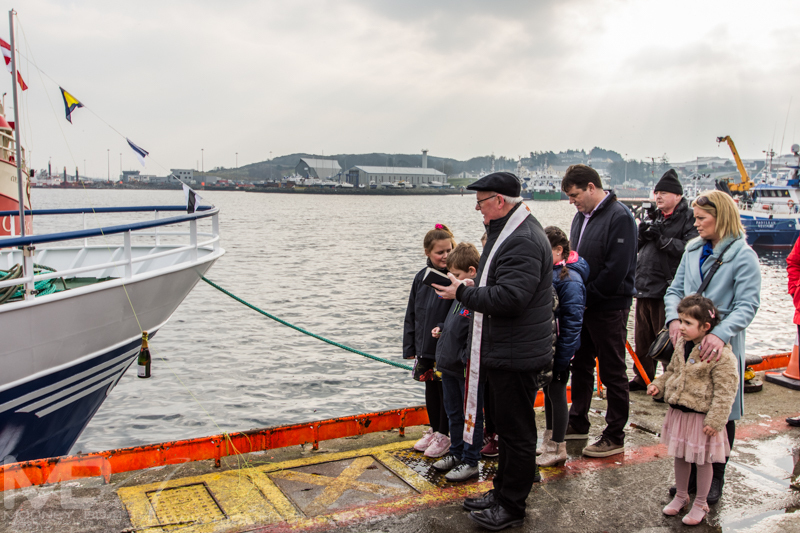 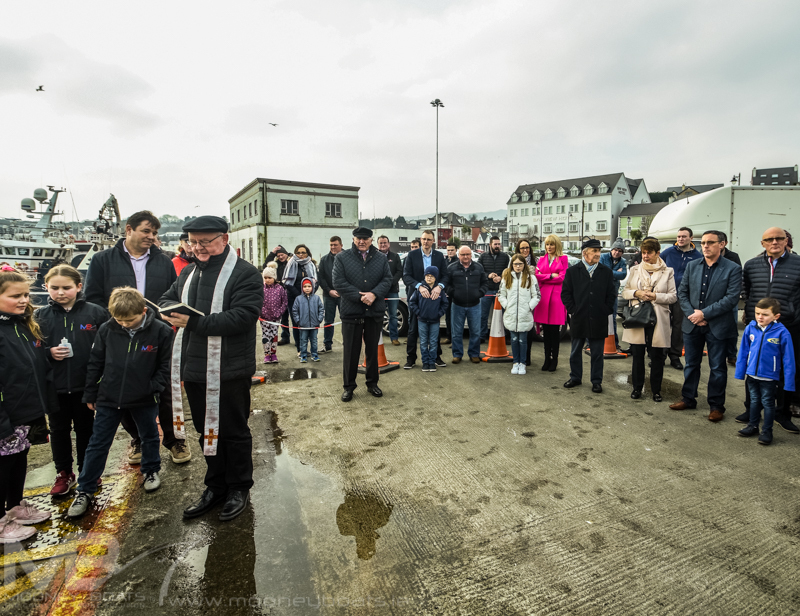 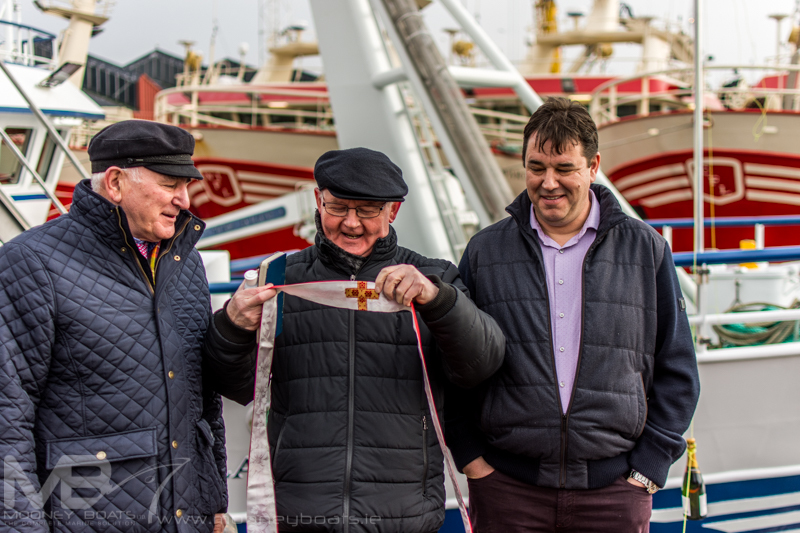 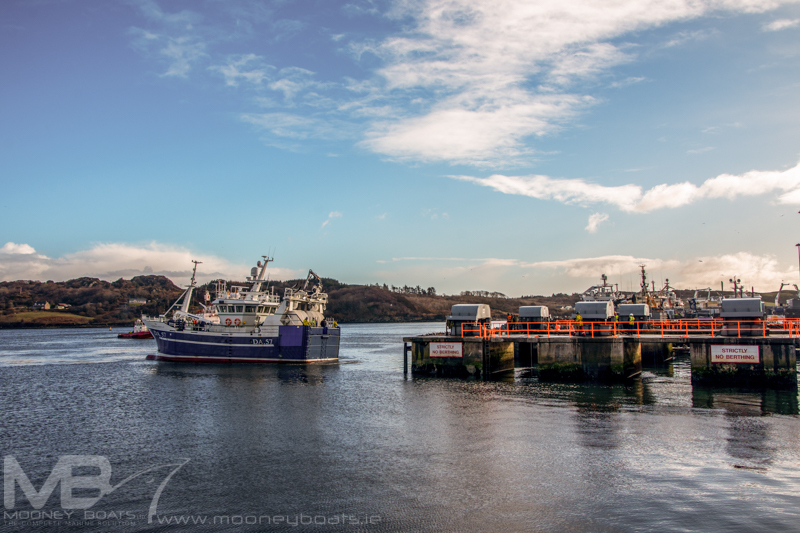 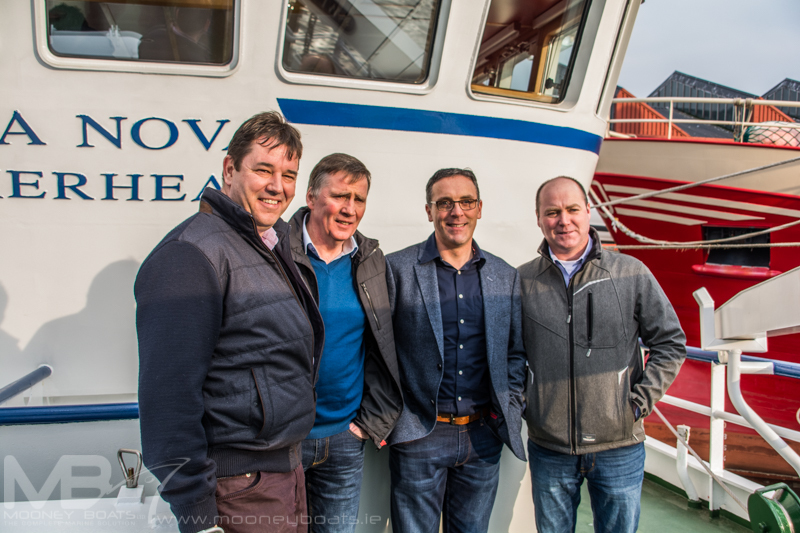 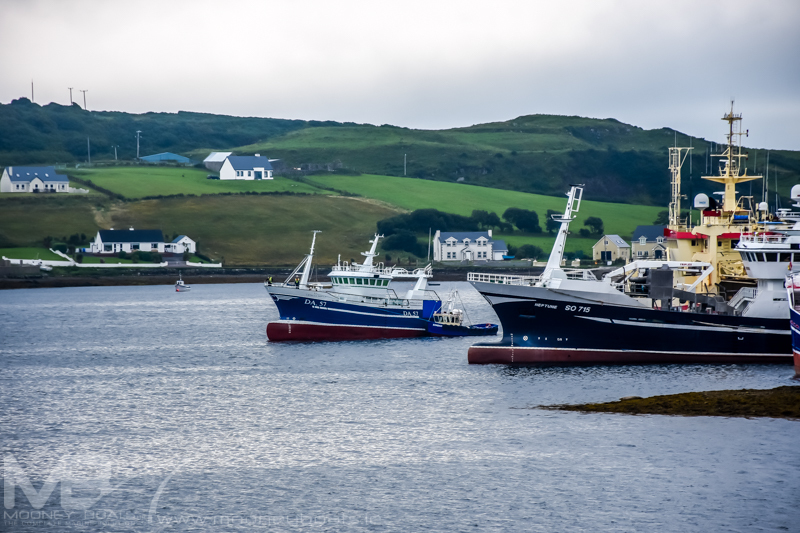 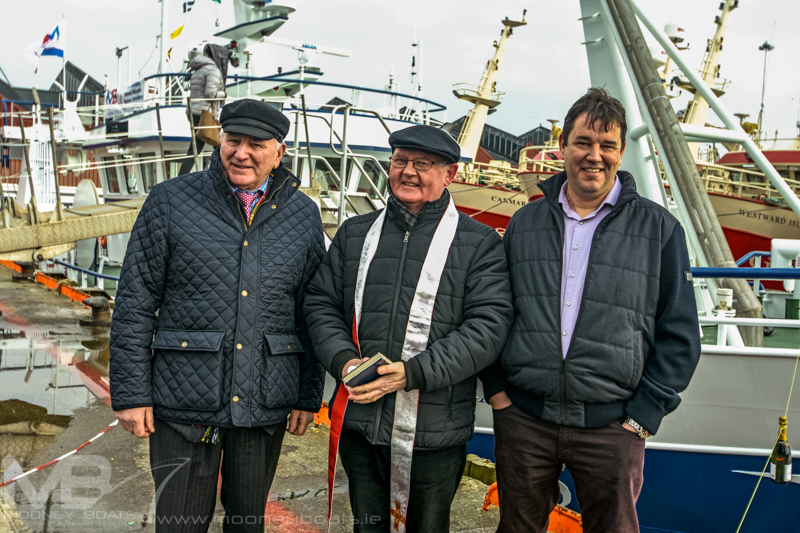 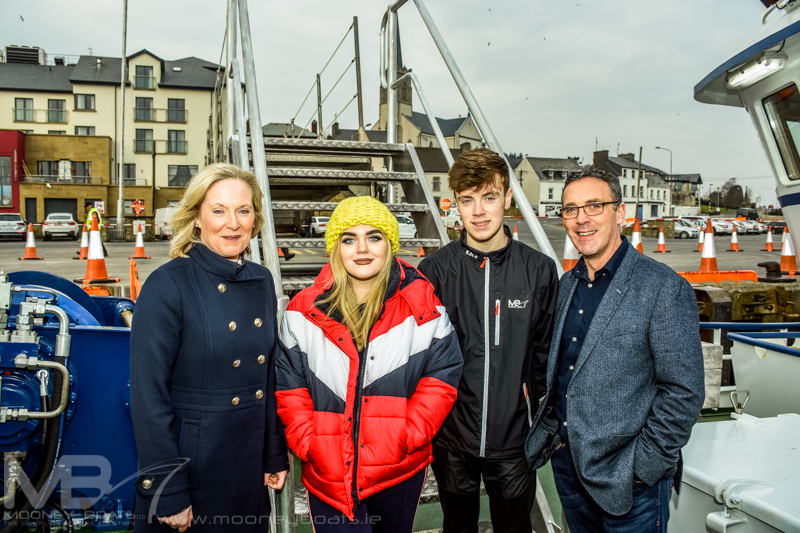 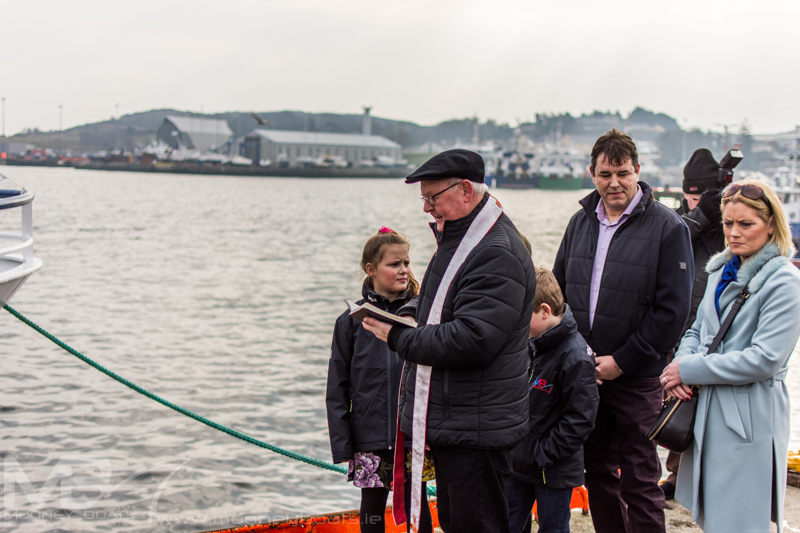 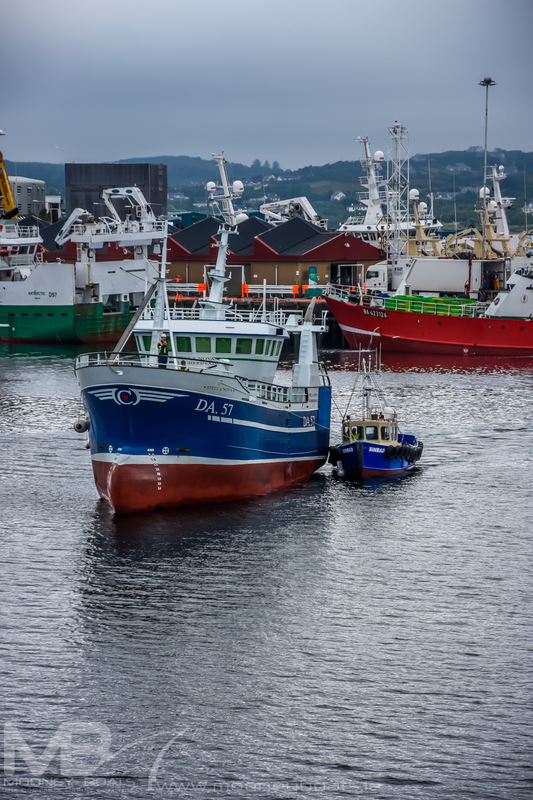 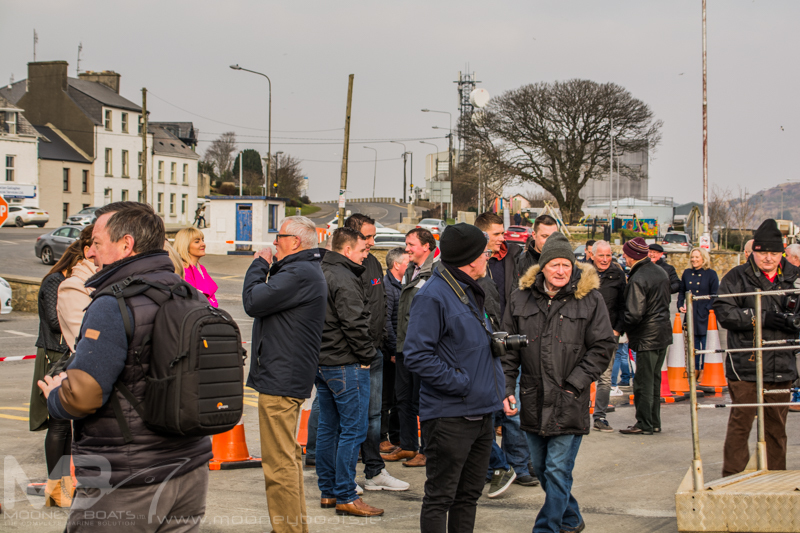 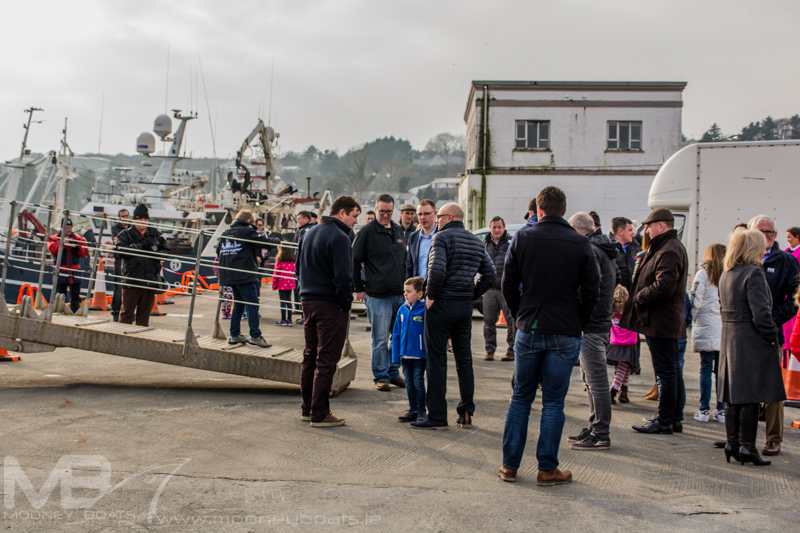 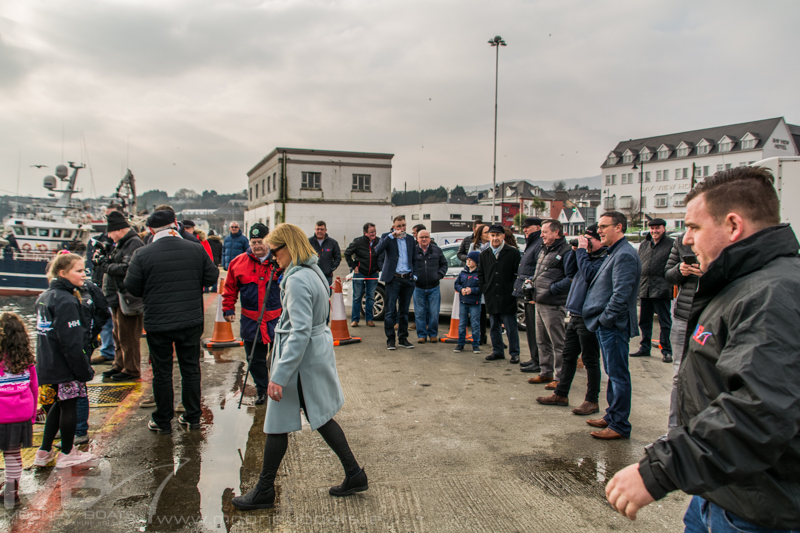 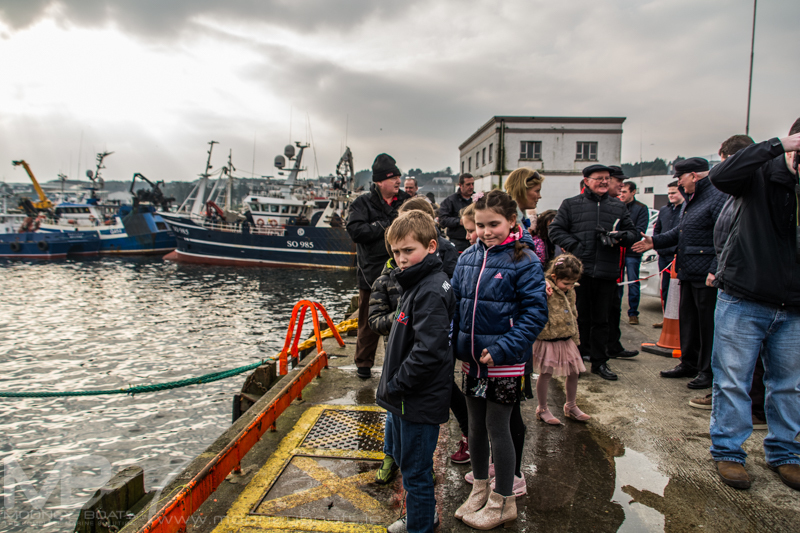 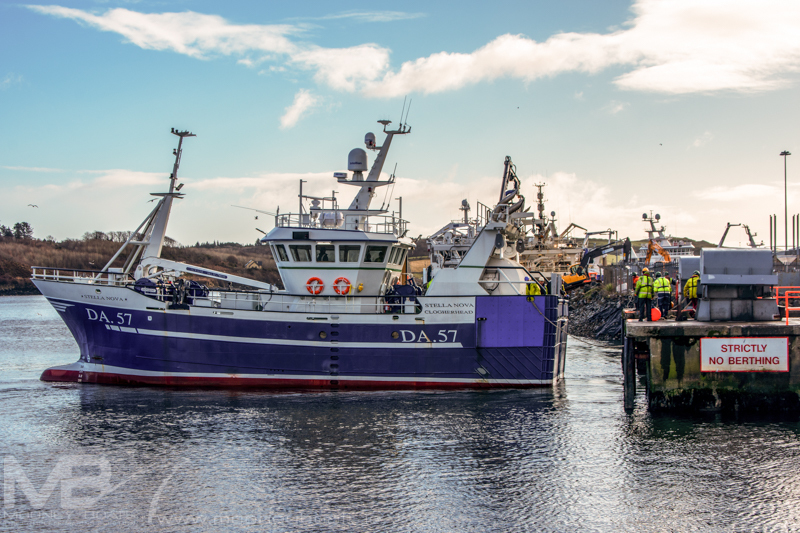 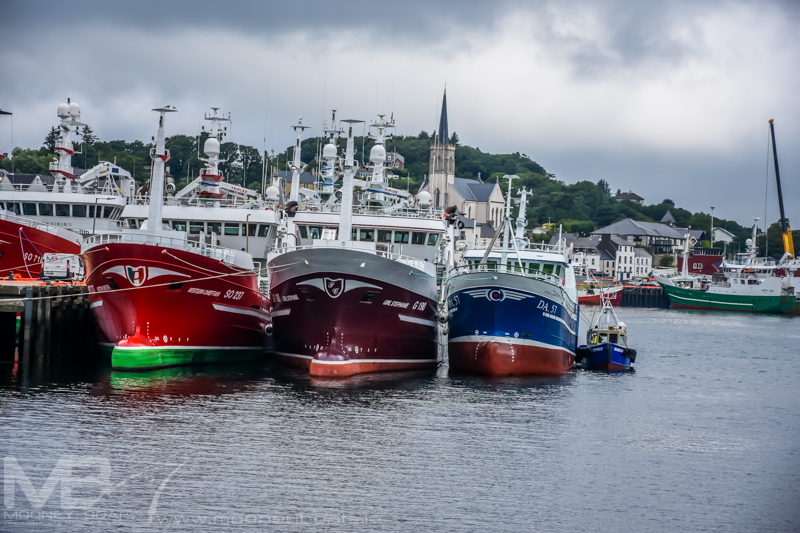 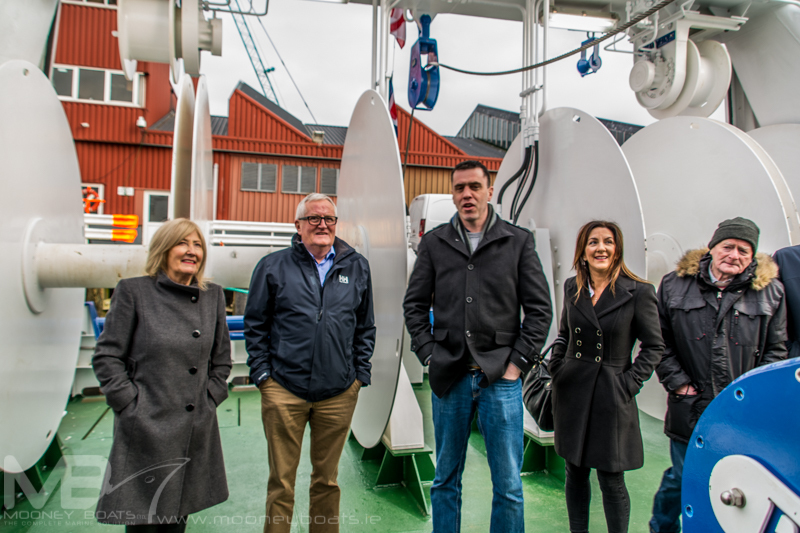 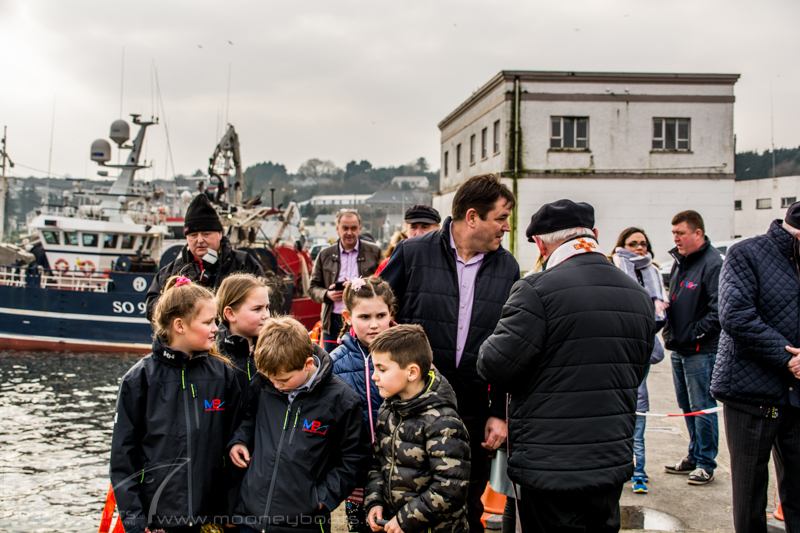 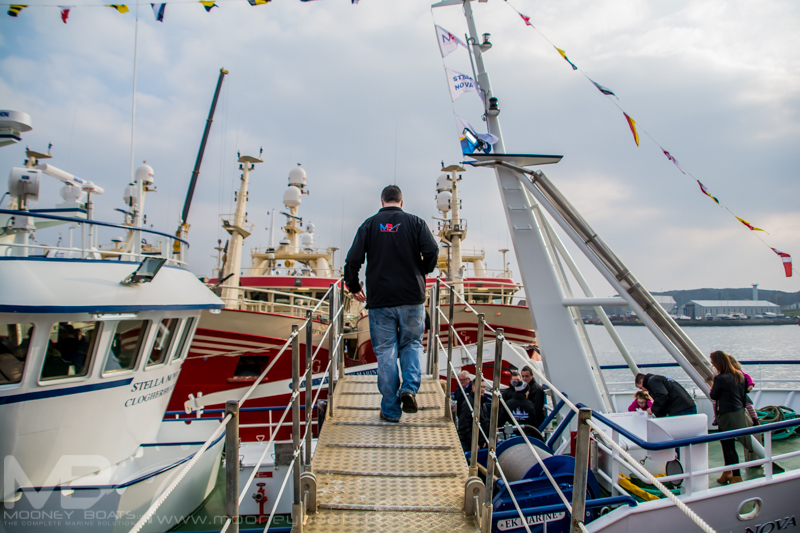 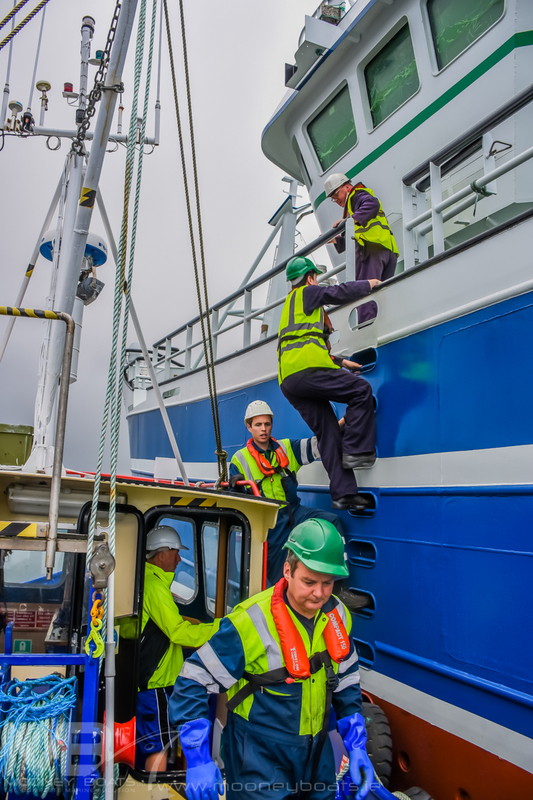 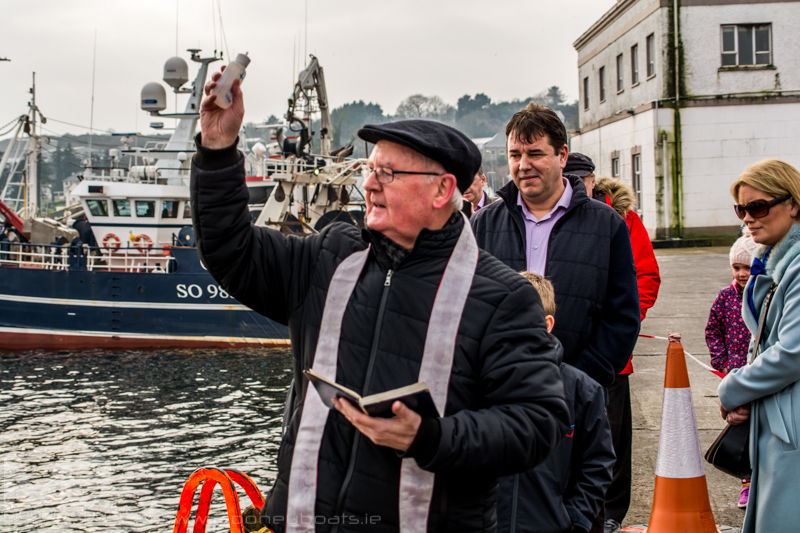 It’s great to have these facilities in Killybegs and here in Ireland to rival any other boat or shipyard in Europe.” Prawn, cuttlefish and squid catches will be frozen on-board before being landed into the Clogherhead Co-op from where they will be exported to the Continent. 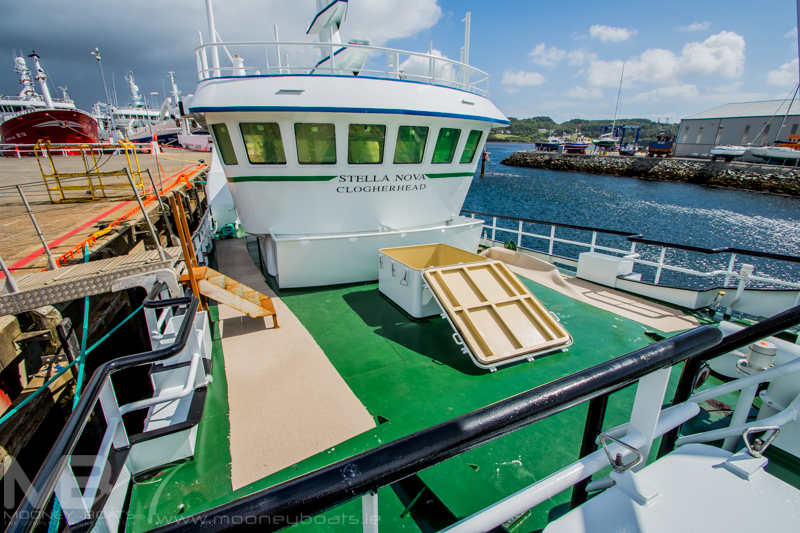 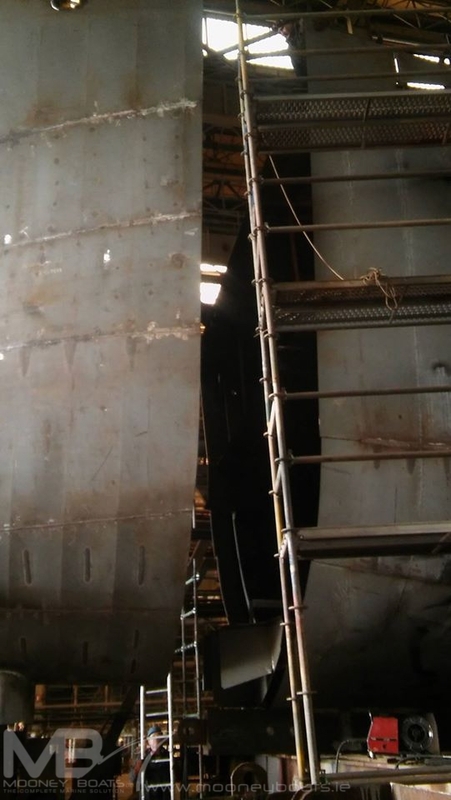 One slight noticeable difference is that the wheelhouse on the ‘Stella Nova’ is one-metre forward of the position on the ‘Patrick C’ and this slight correction was made to improve access to the wheelhouse from the deck below and also to gain more room on the stern area behind wheelhouse for net mending and repairs. 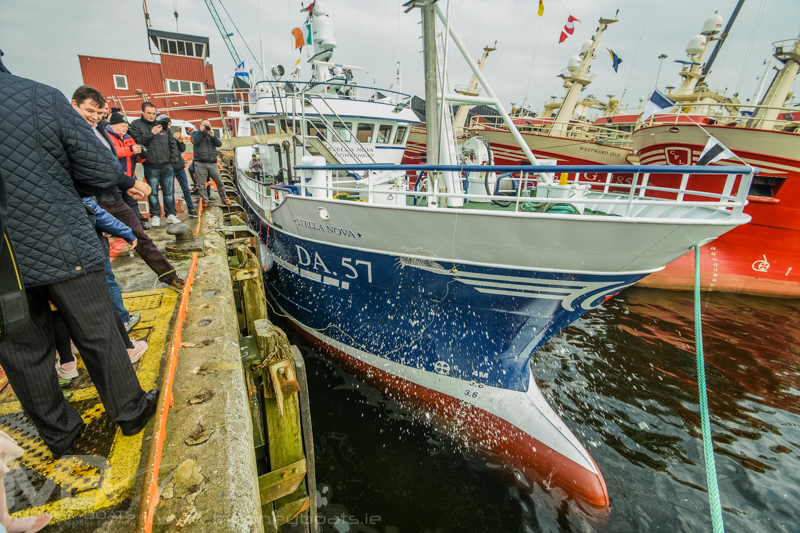 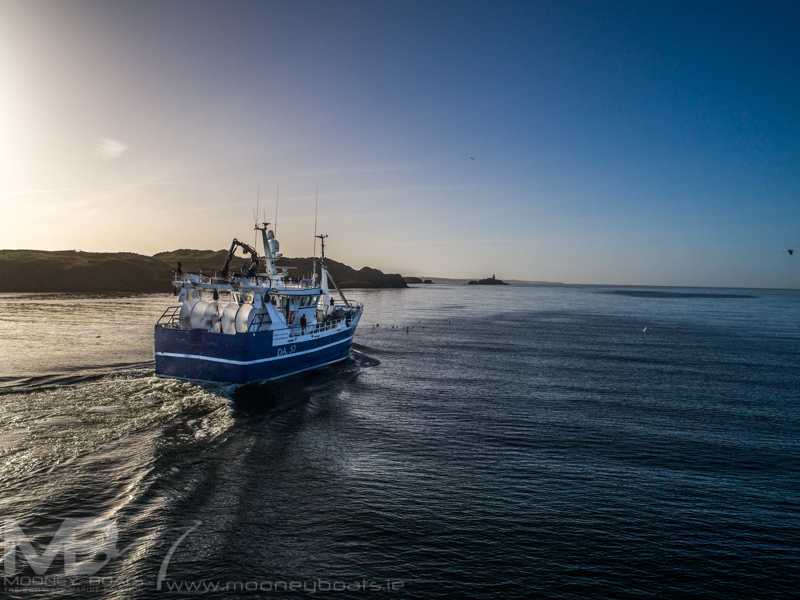 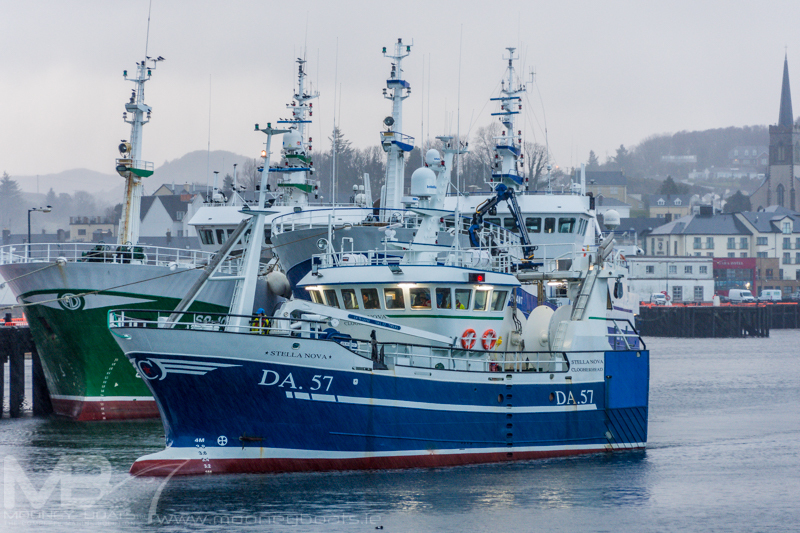 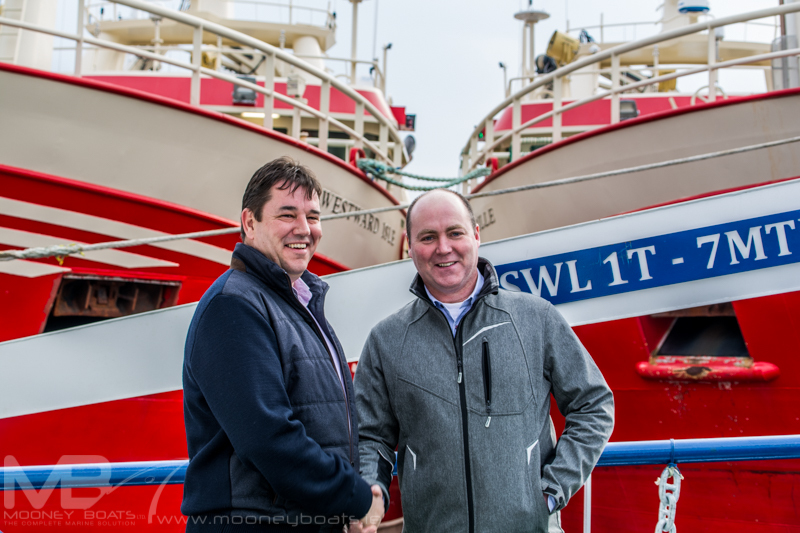 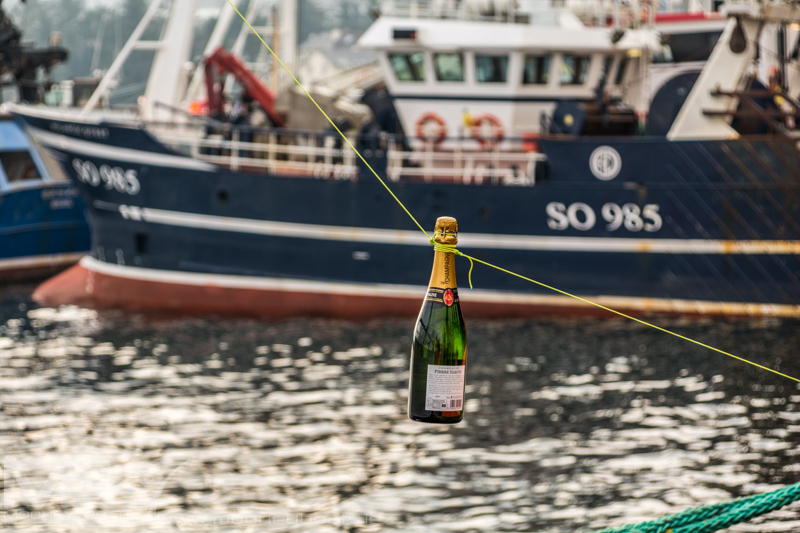 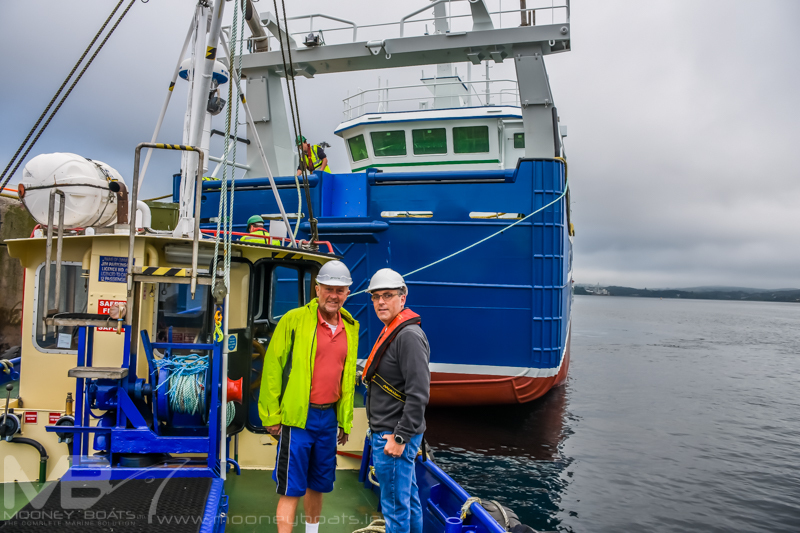 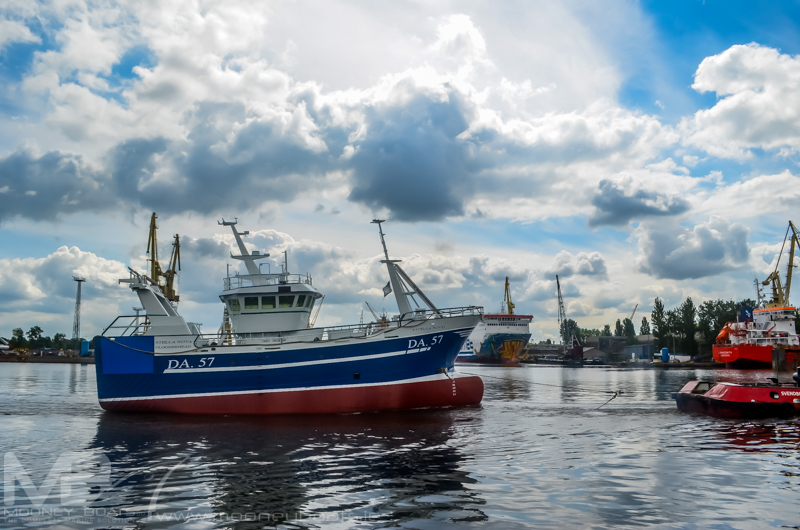 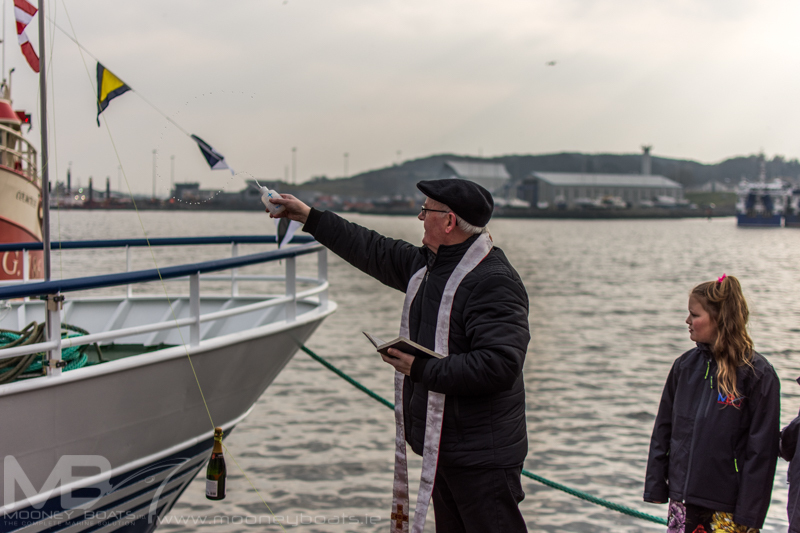 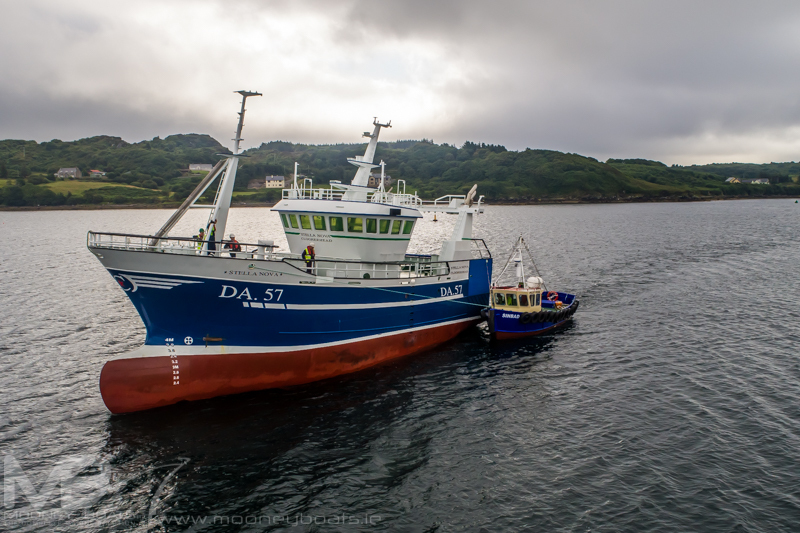 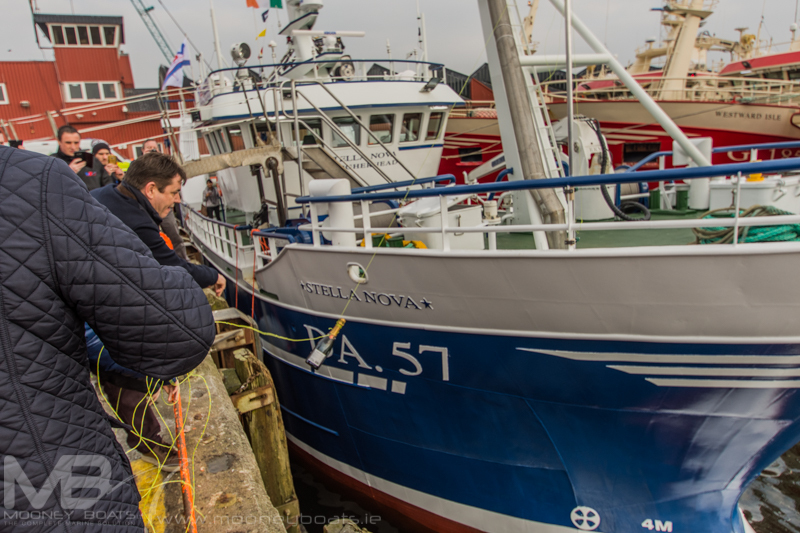 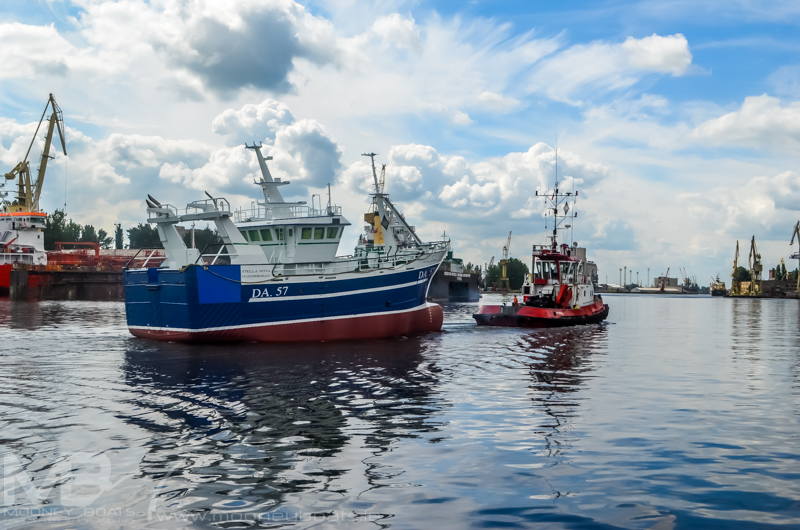 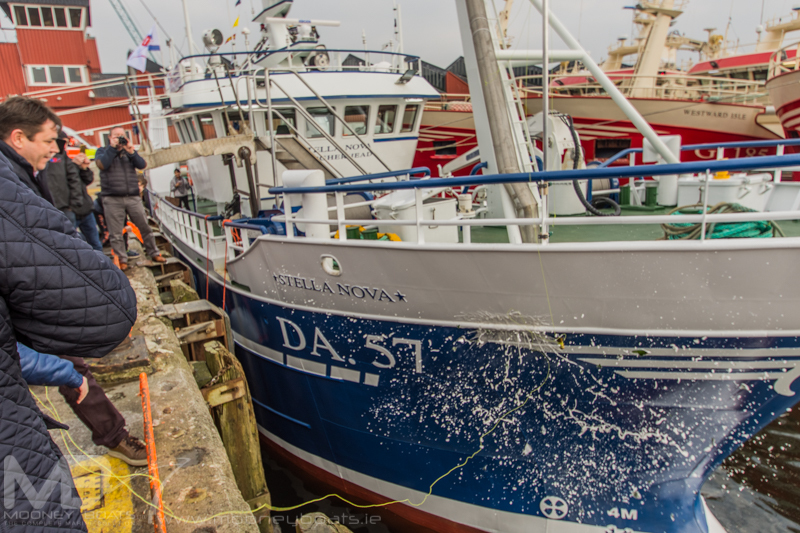 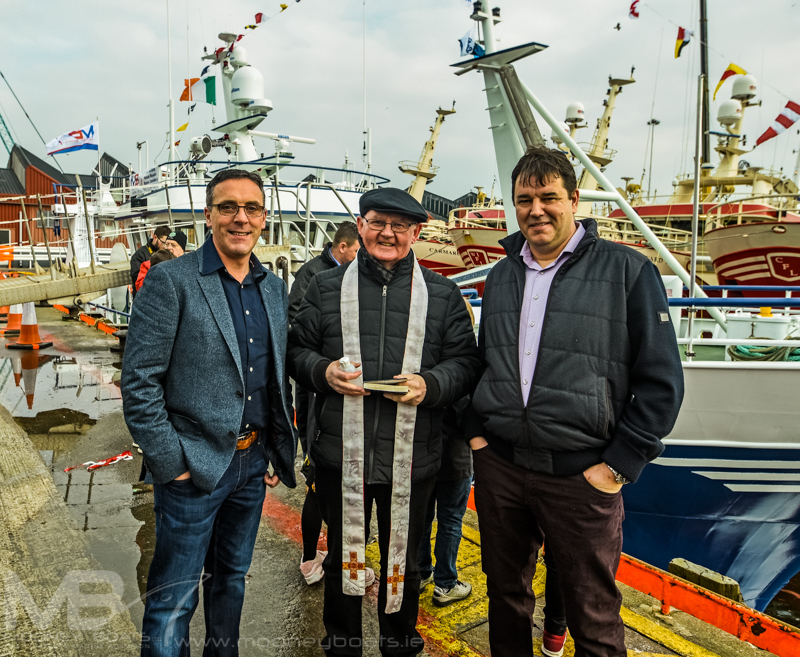 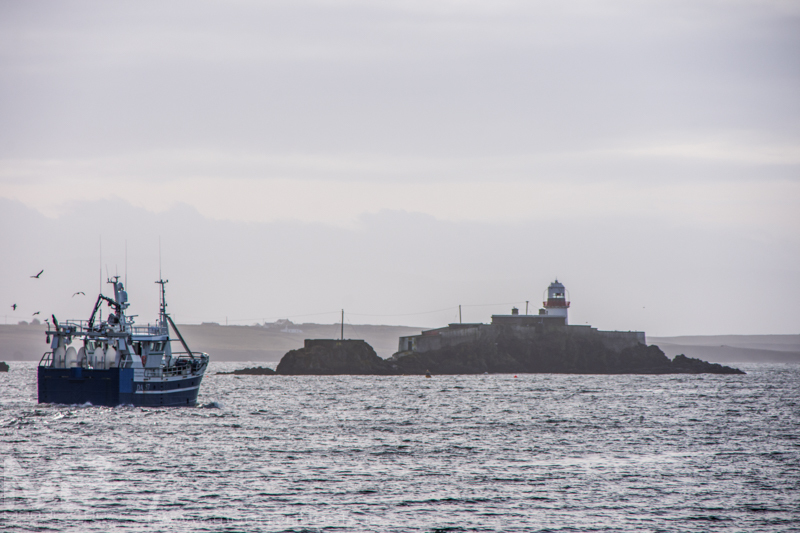 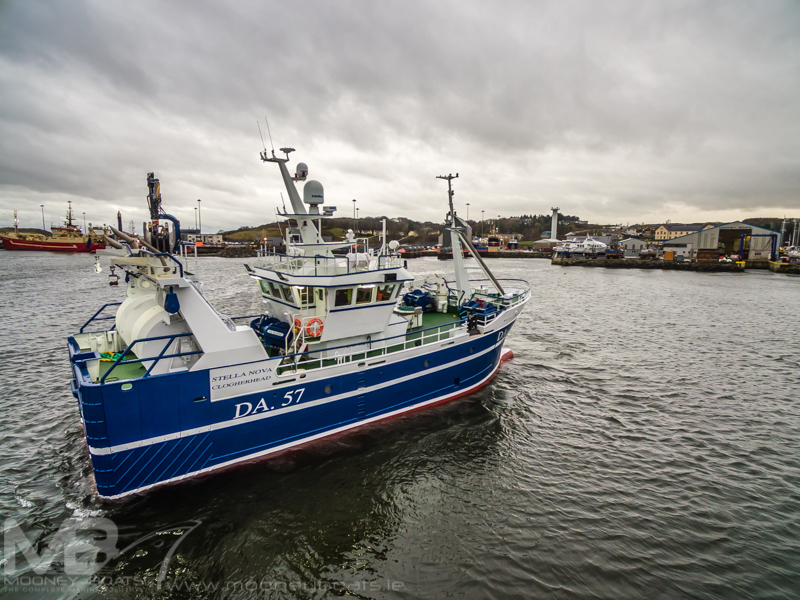 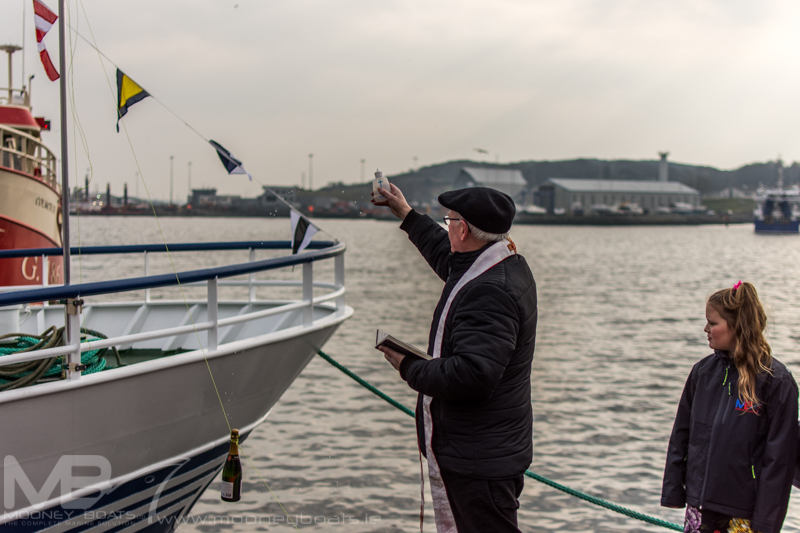 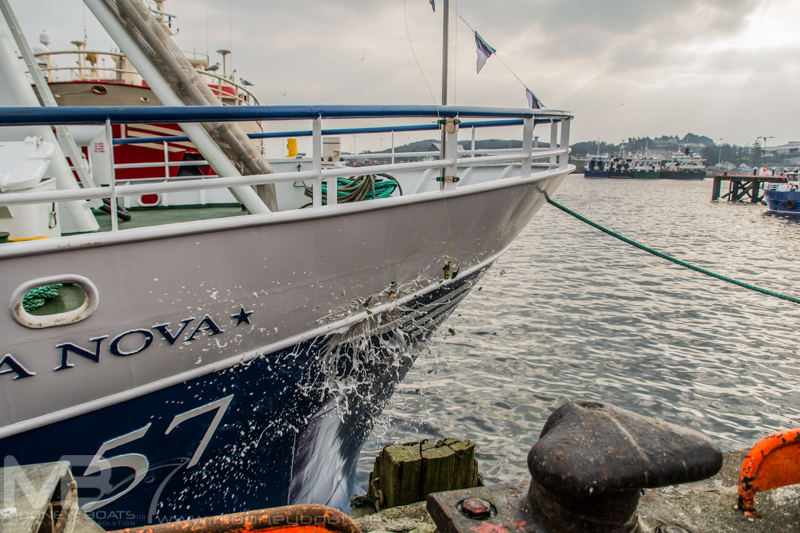 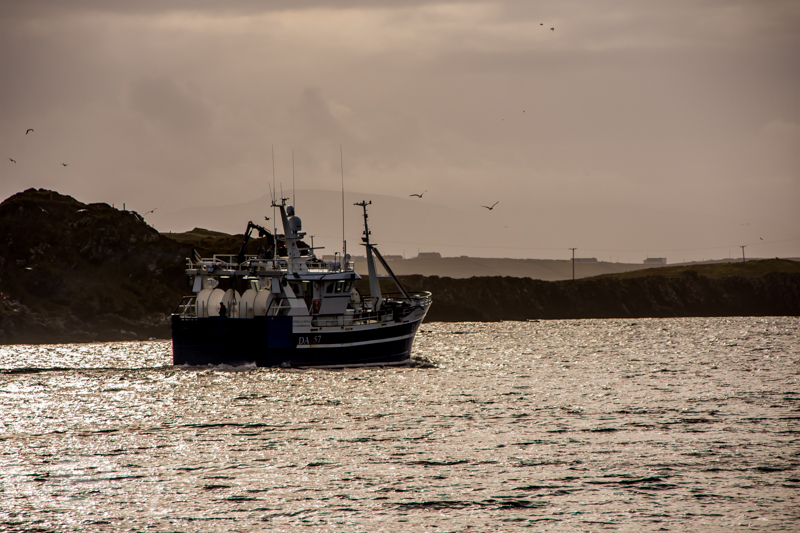 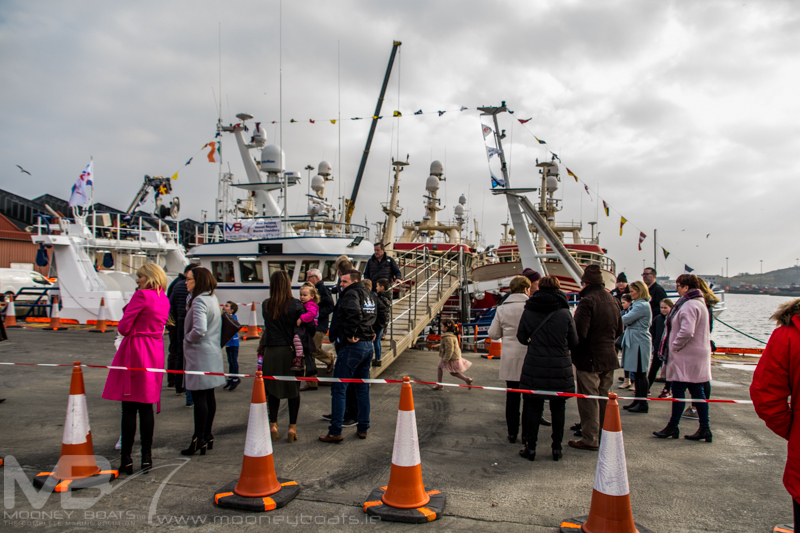 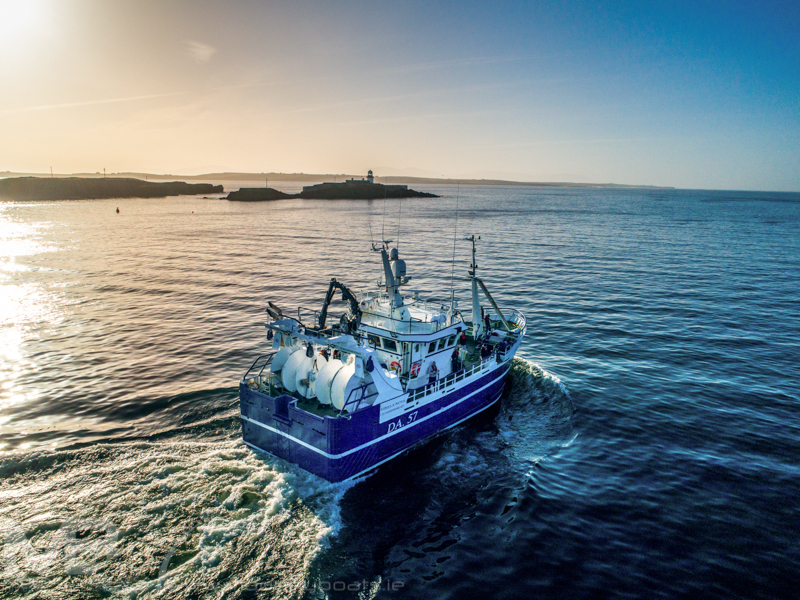 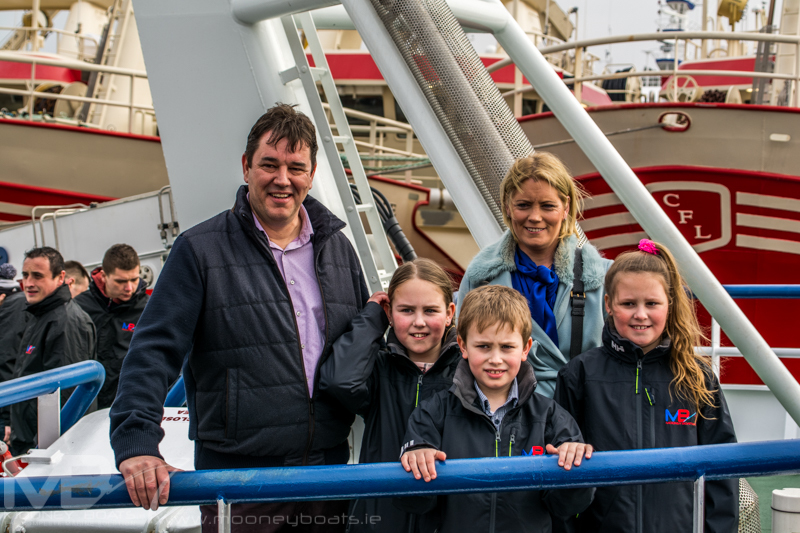 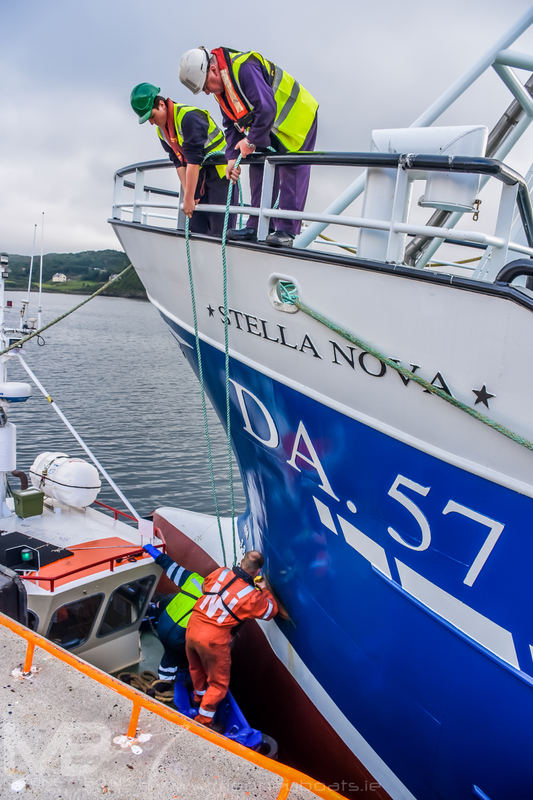 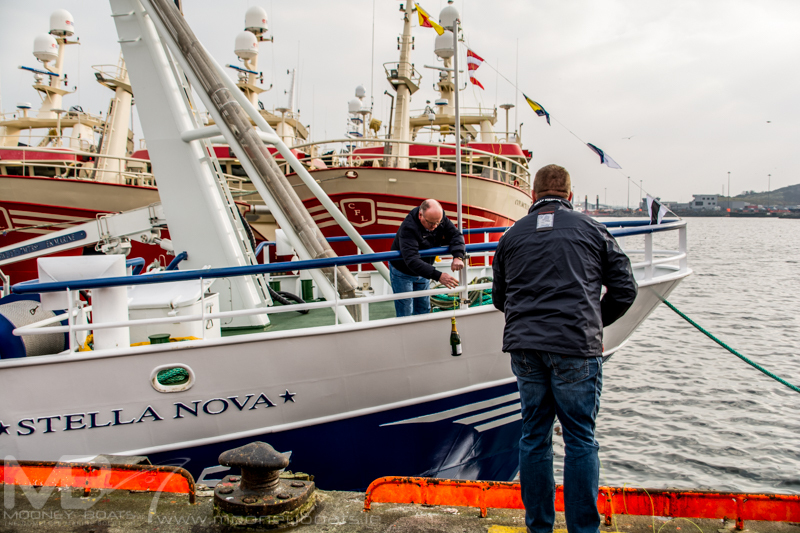 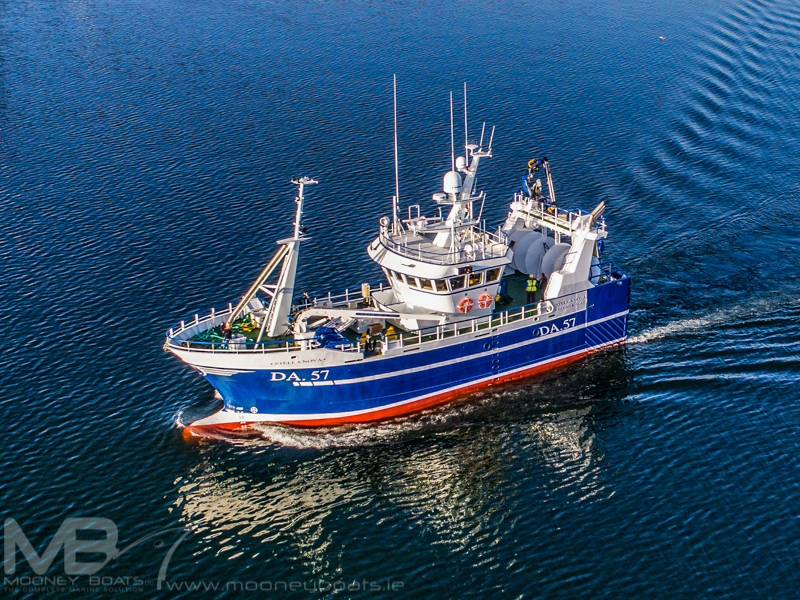 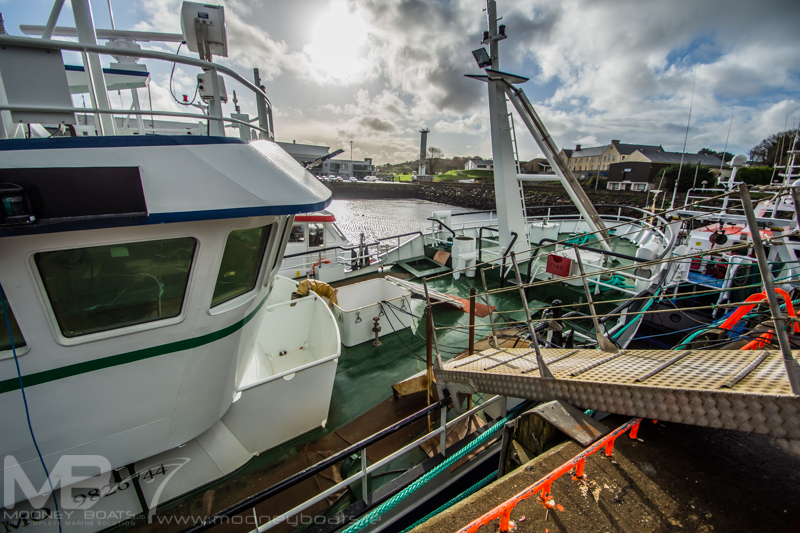 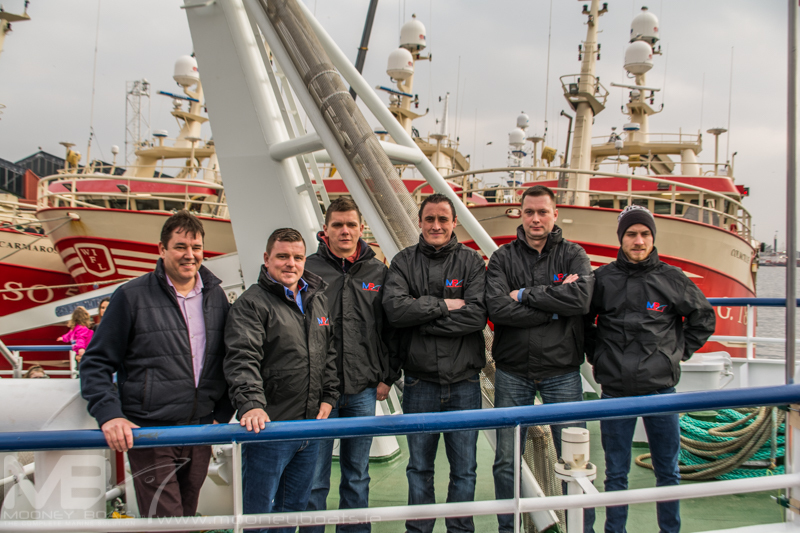 The ‘Stella Nova’ will fish a twin-rig for prawns using quad-rig and twin-rig nets from Pepe Trawls of Howth and prawn hopper nets from Nordo Trawl. 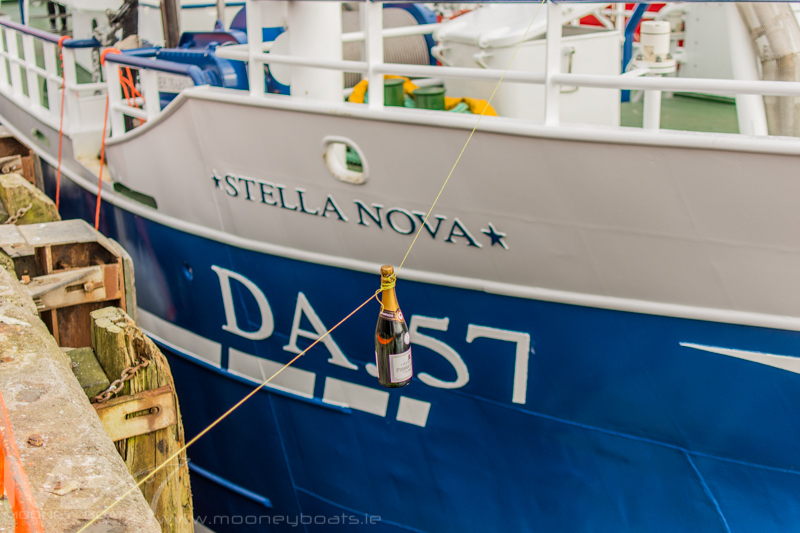 The boat will tow Thyboron door but it won’t be only prawns that the ‘Stella Nova’ will be targeting. 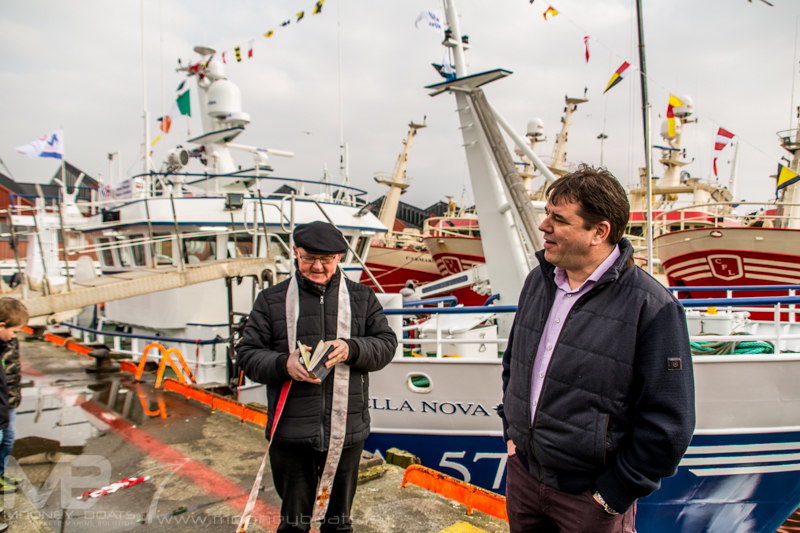 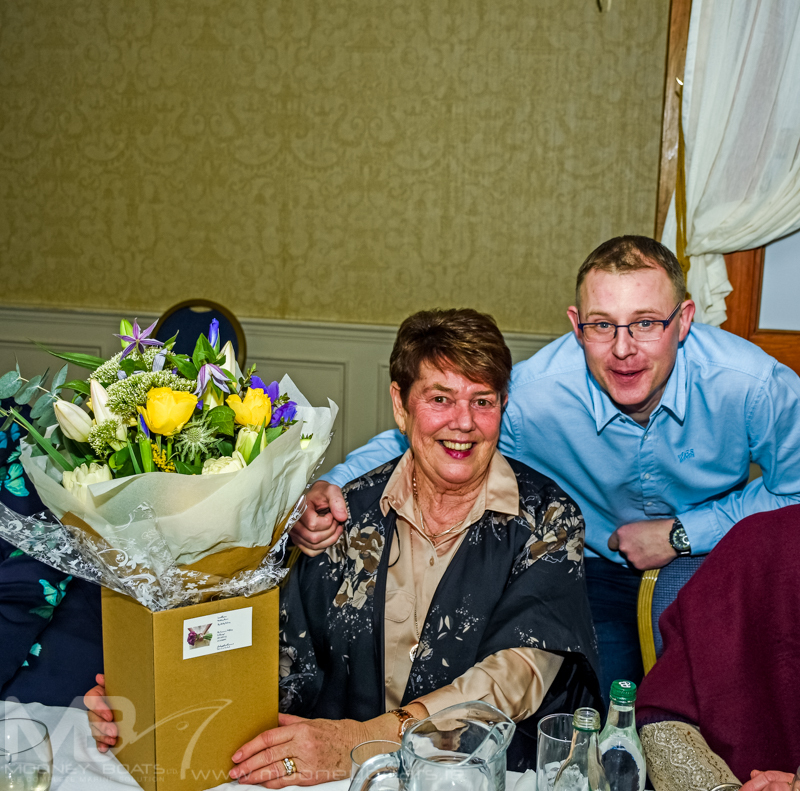 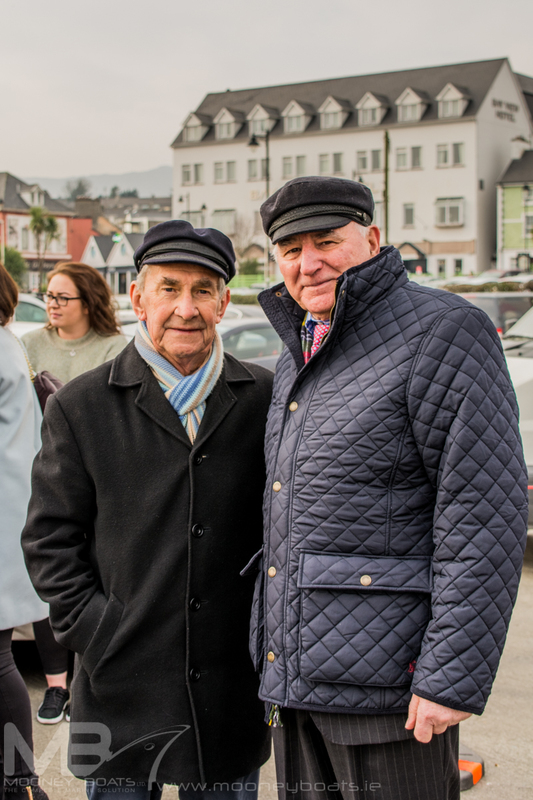 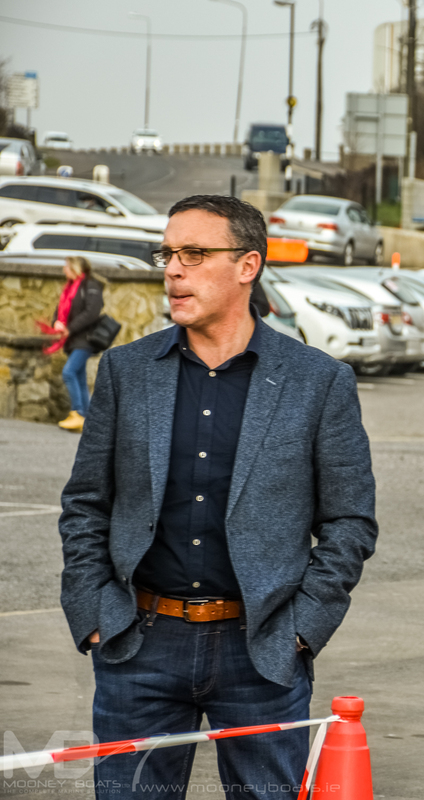 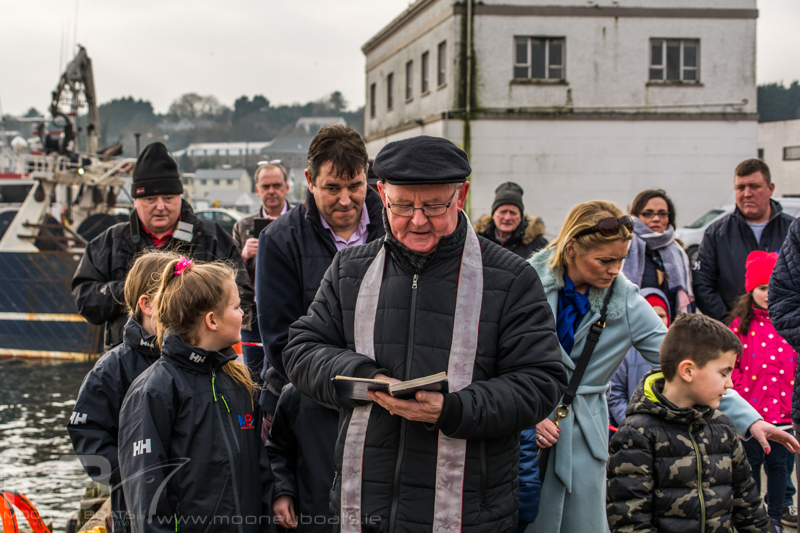 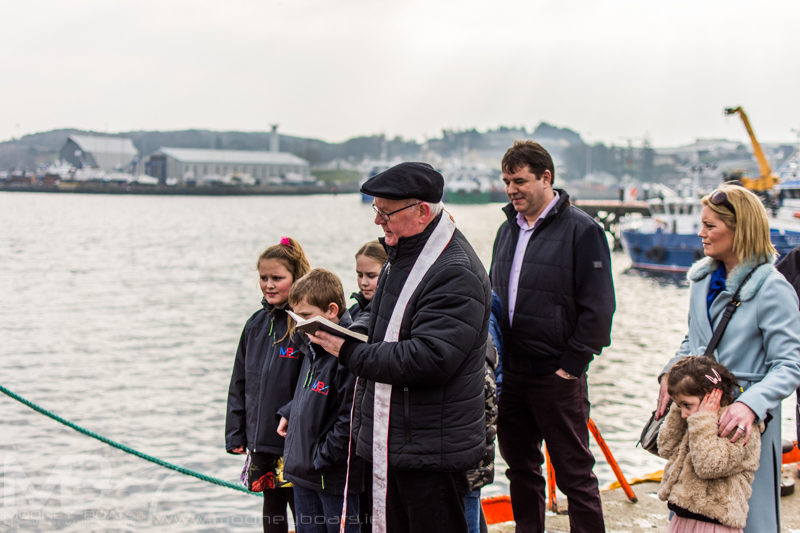 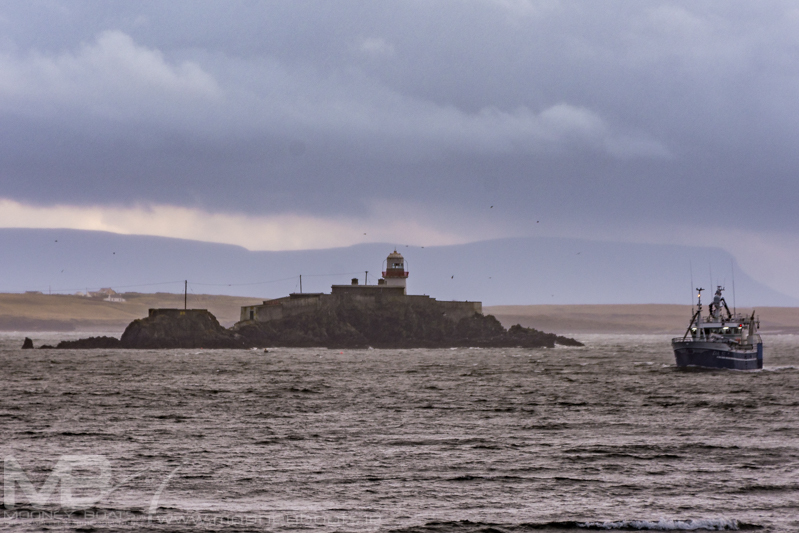 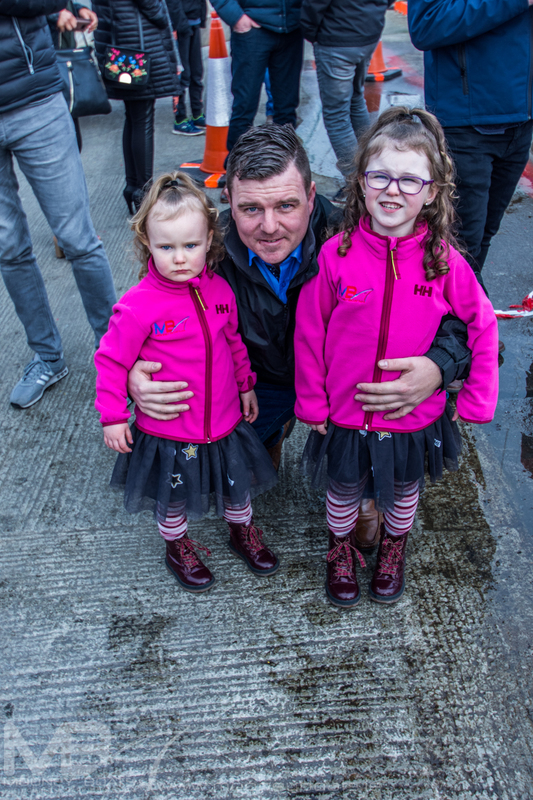 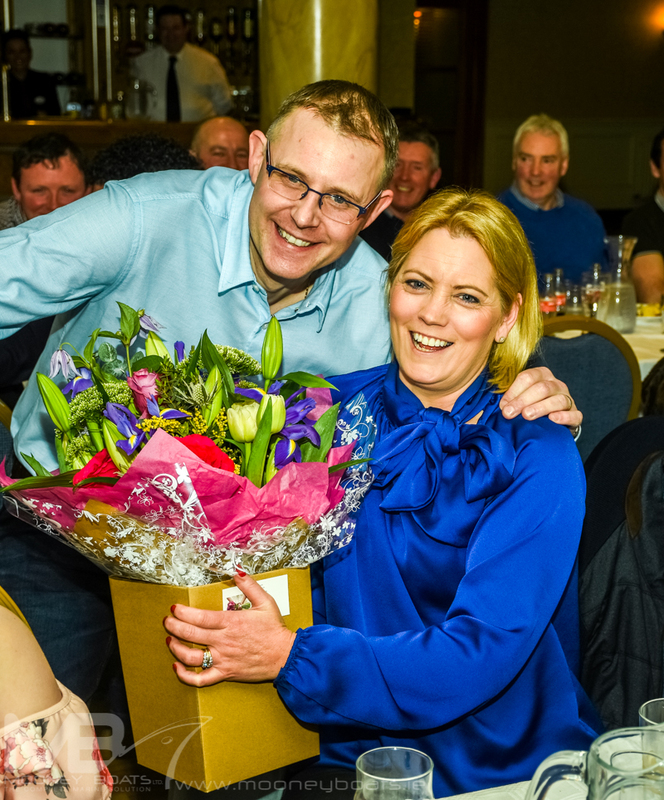 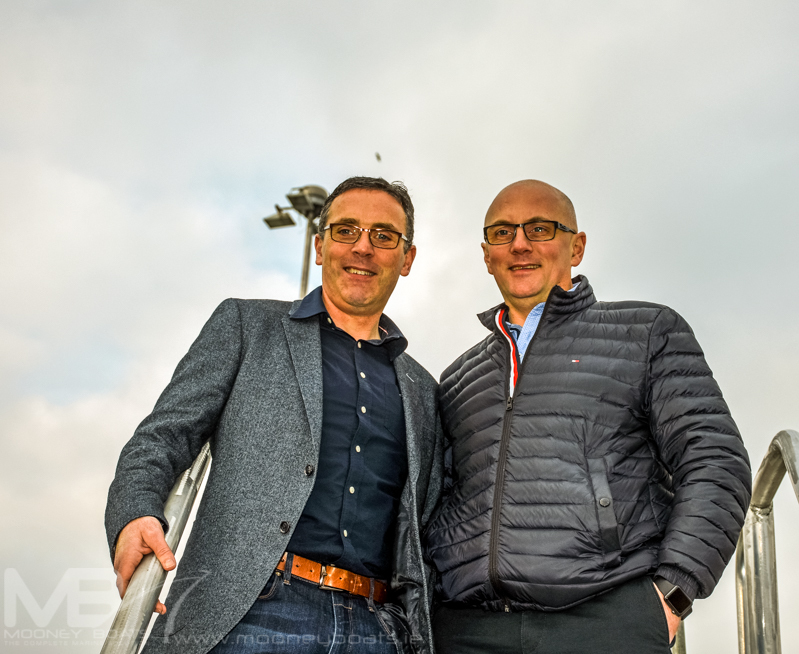 “It’s also hoped that we would diversify into cuttlefish and squid later this year” Niall says. 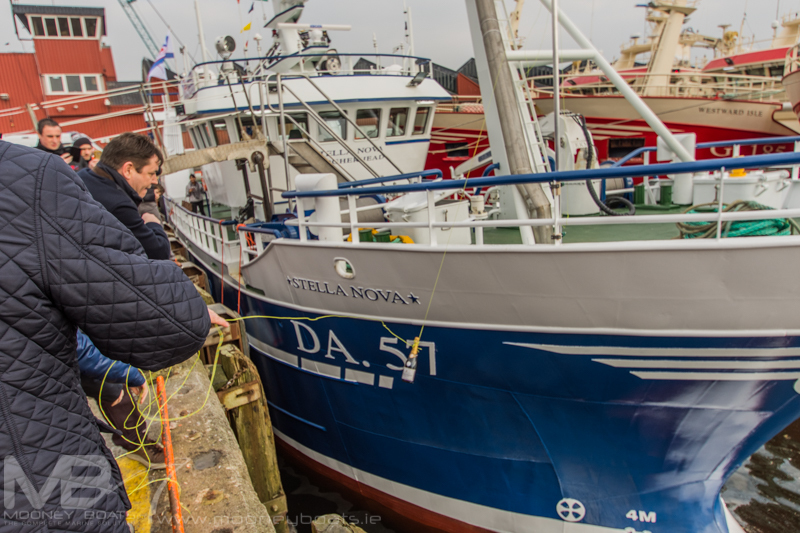 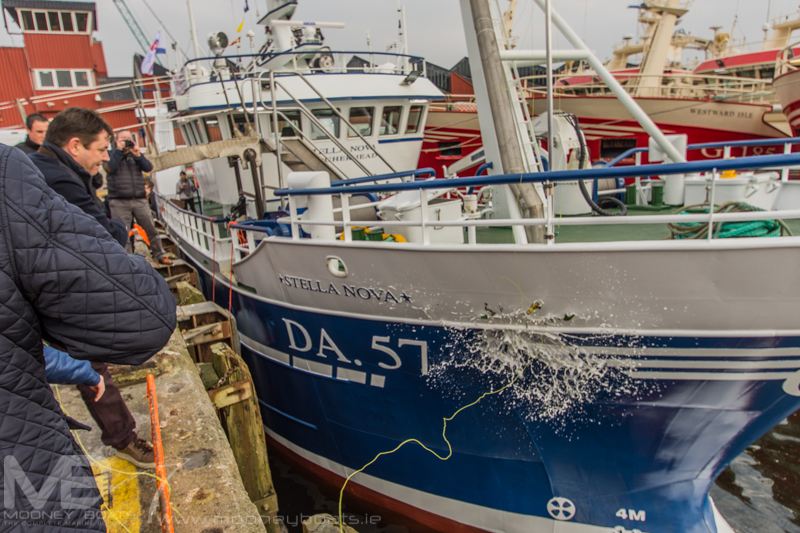 The ‘Stella Nova’ will be skippered by Cornelius Schaap and Damien O’Brien and will fish with a crew of five. 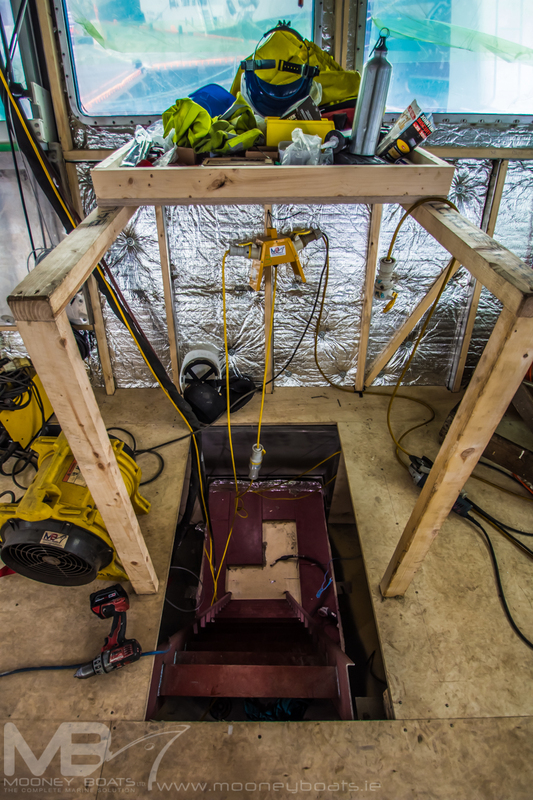 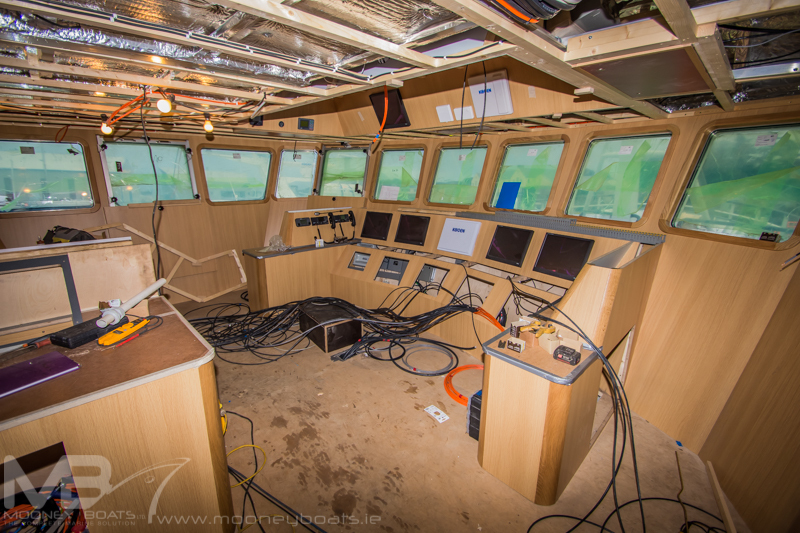 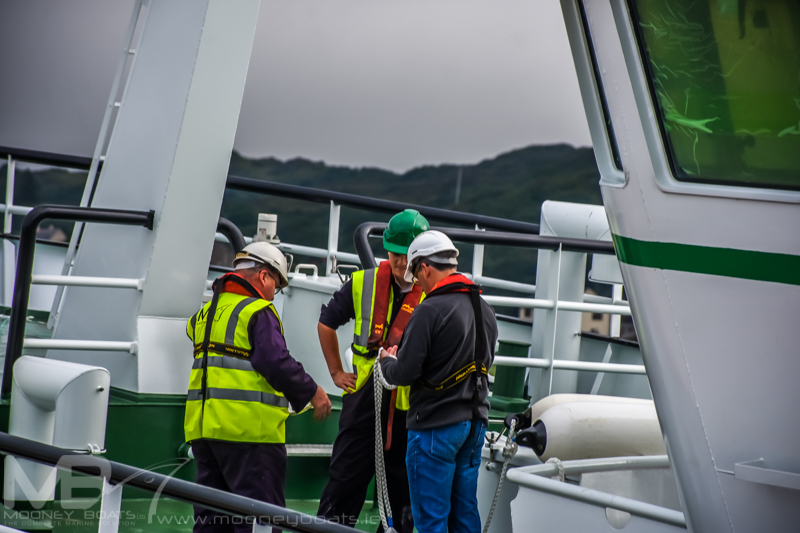 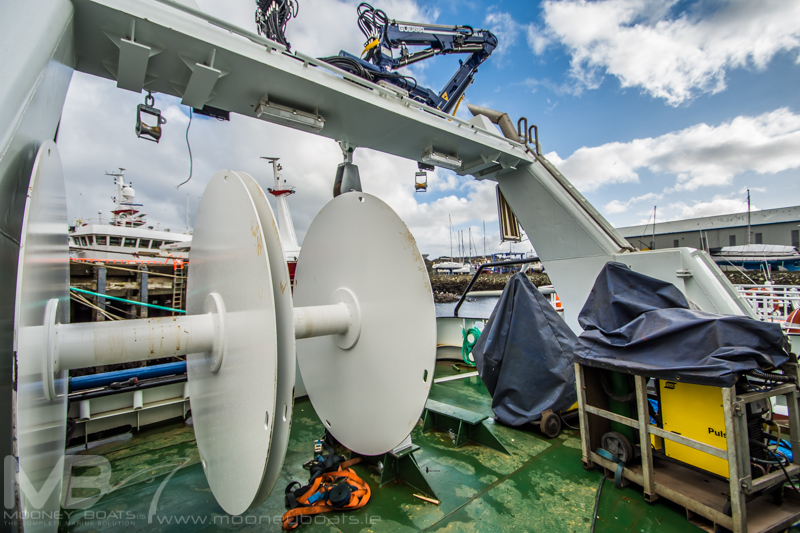 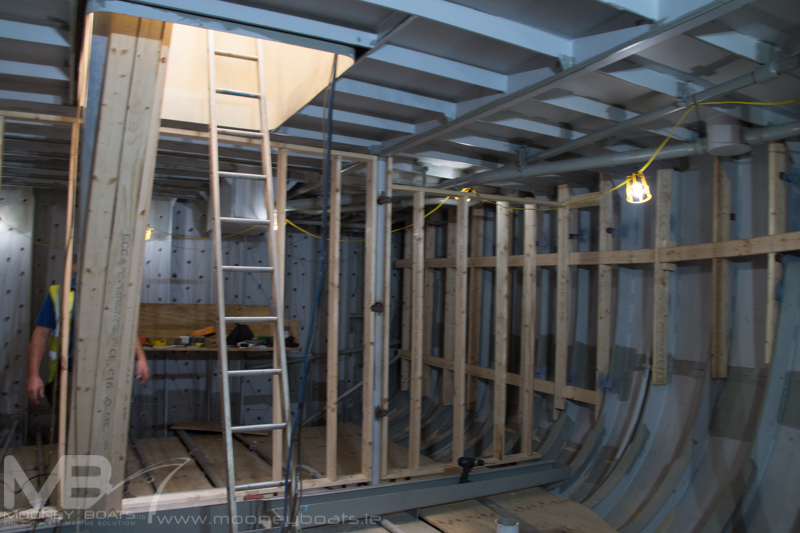 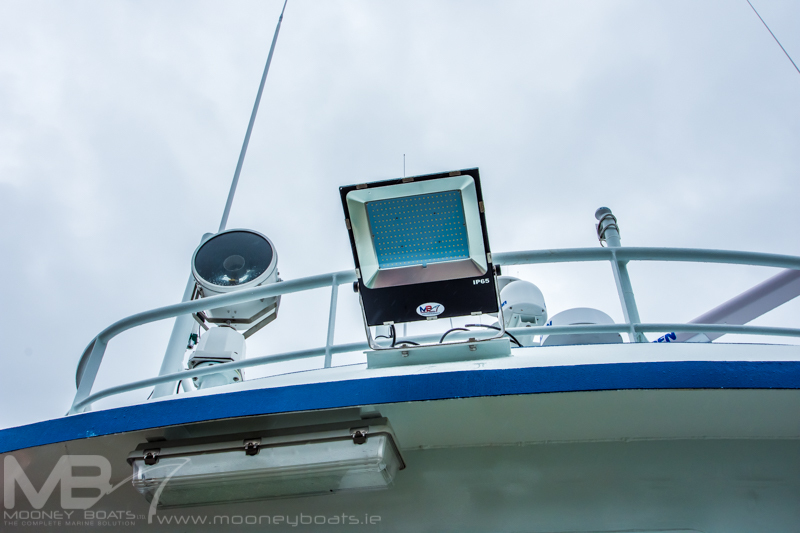 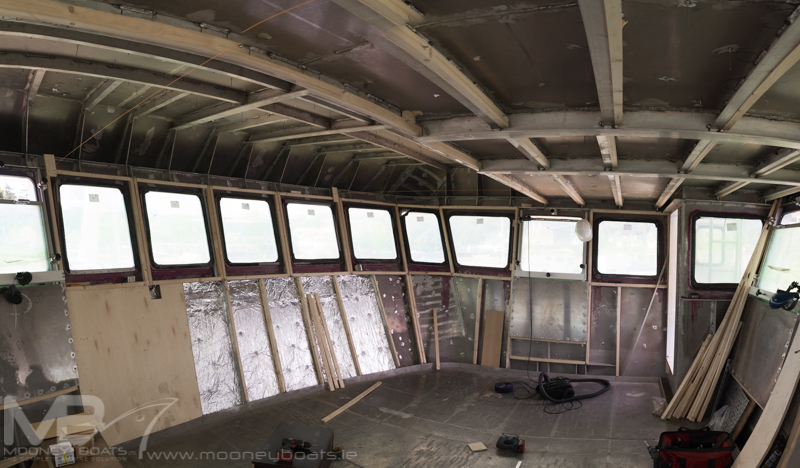 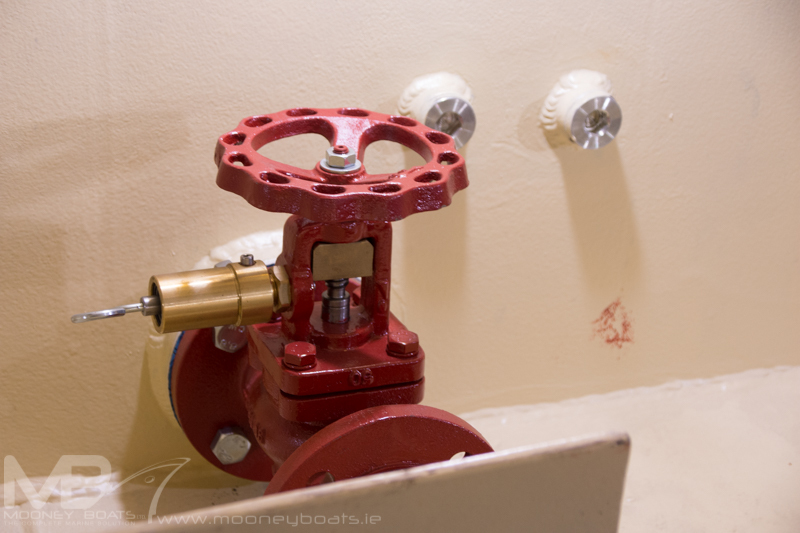 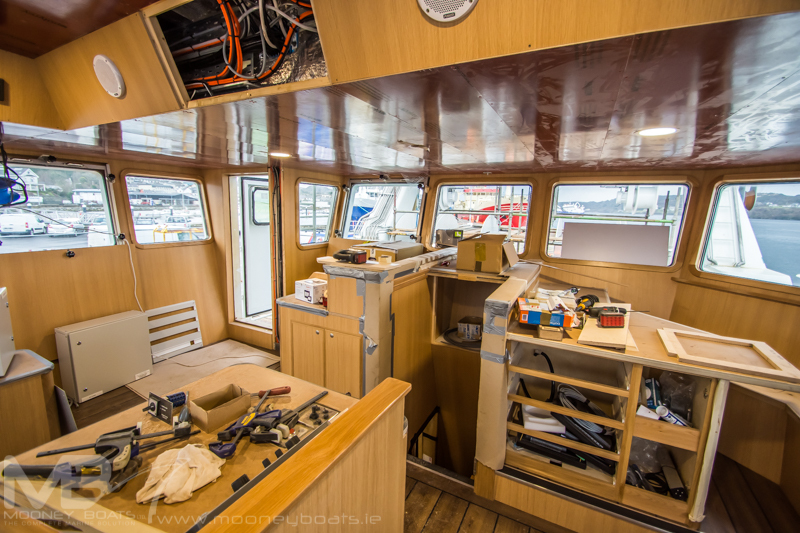 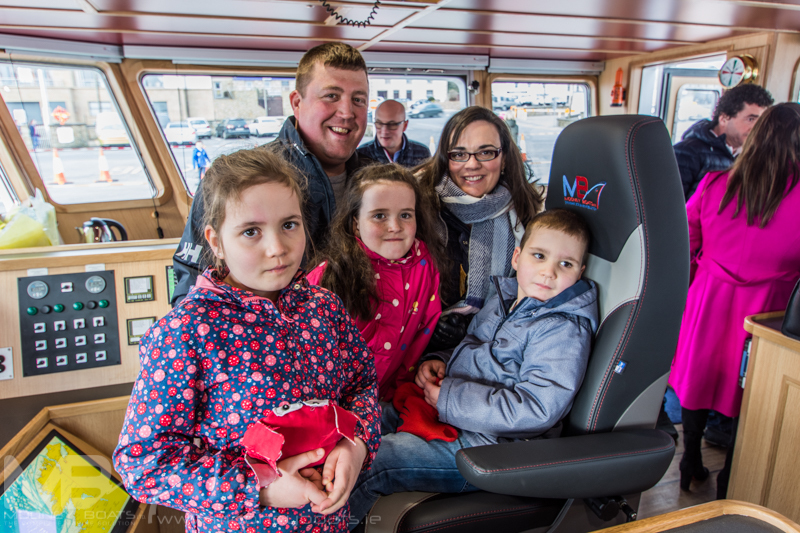 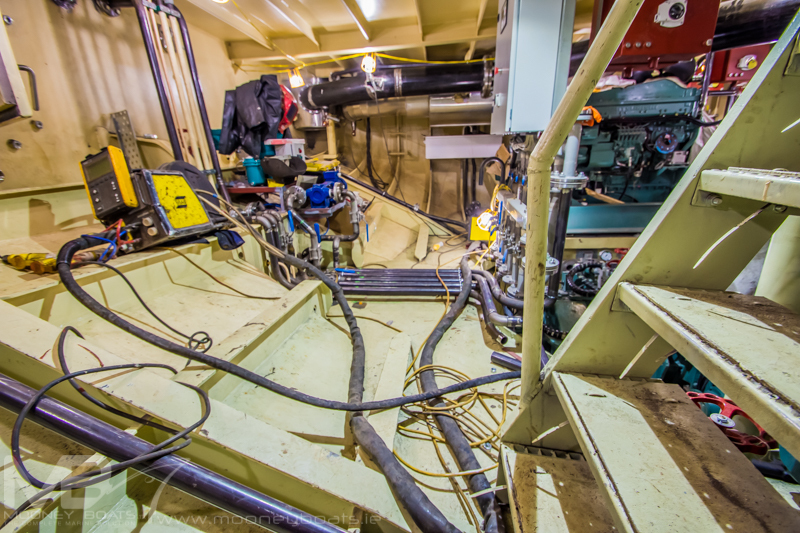 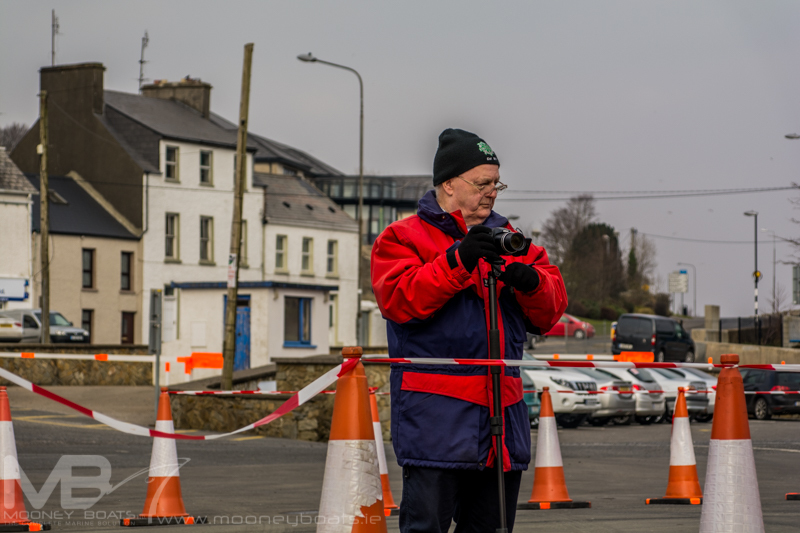 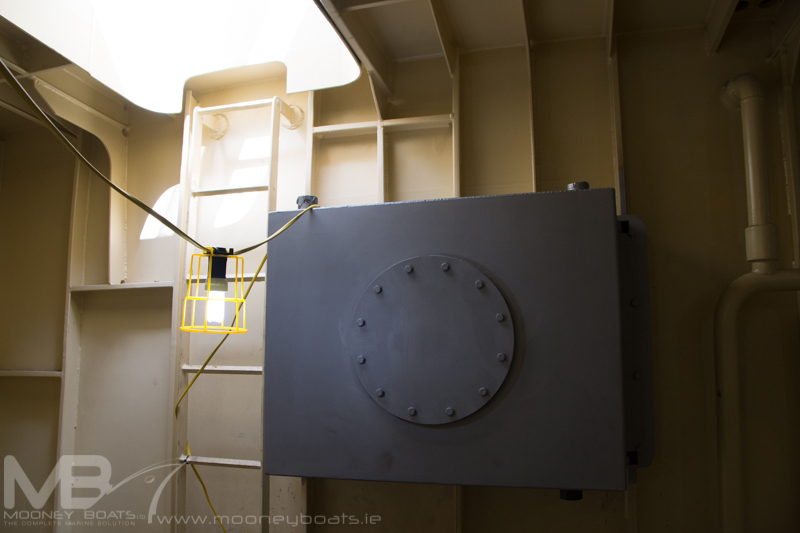 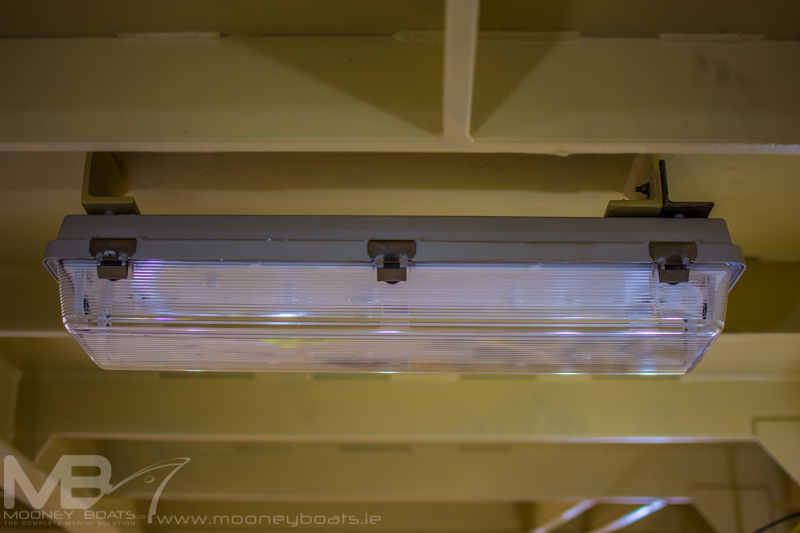 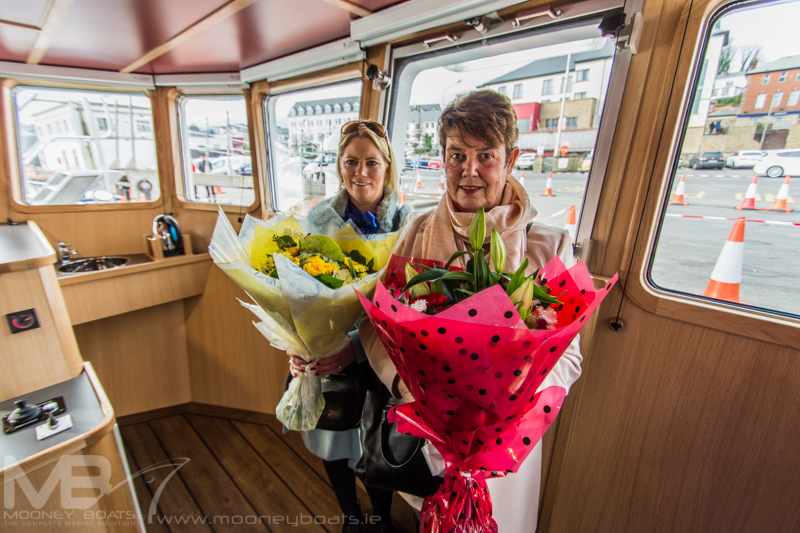 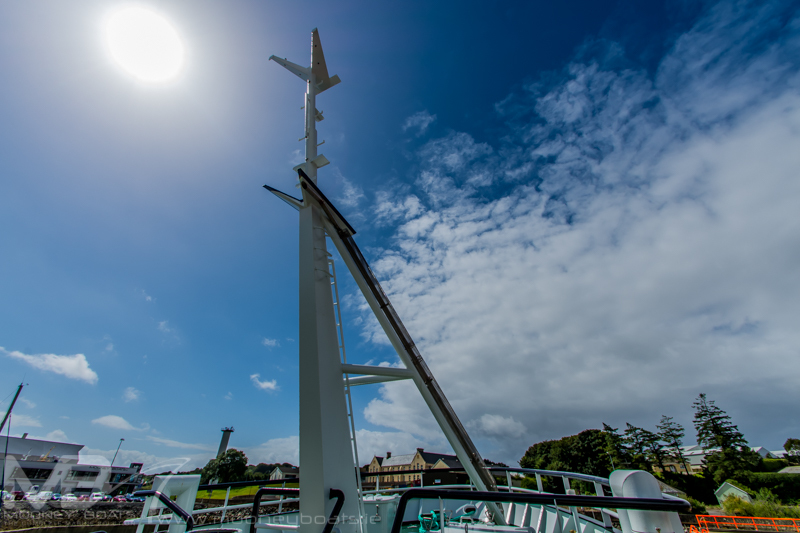 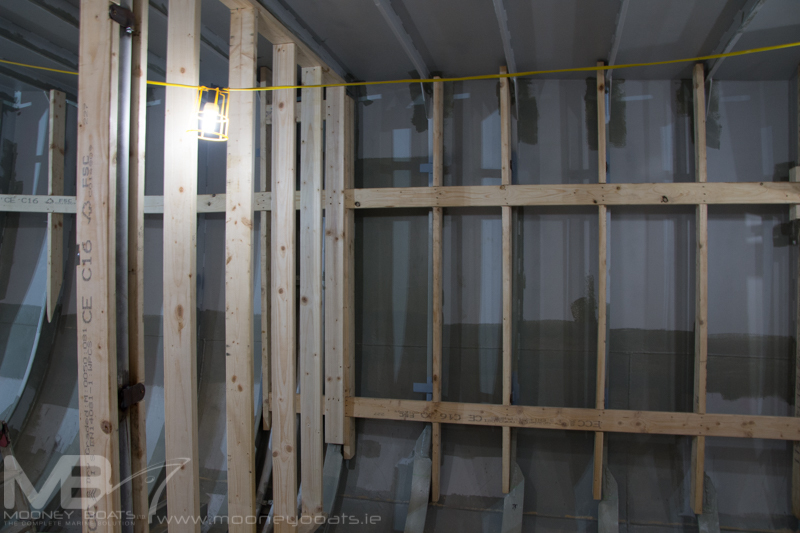 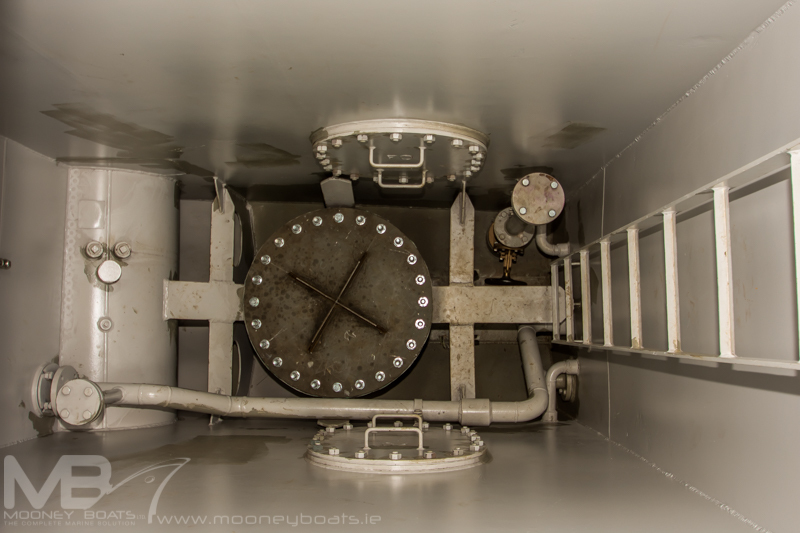 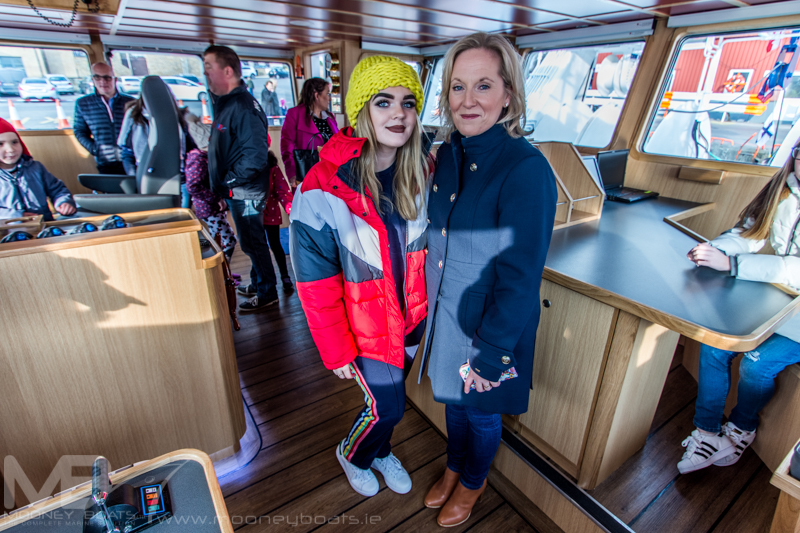 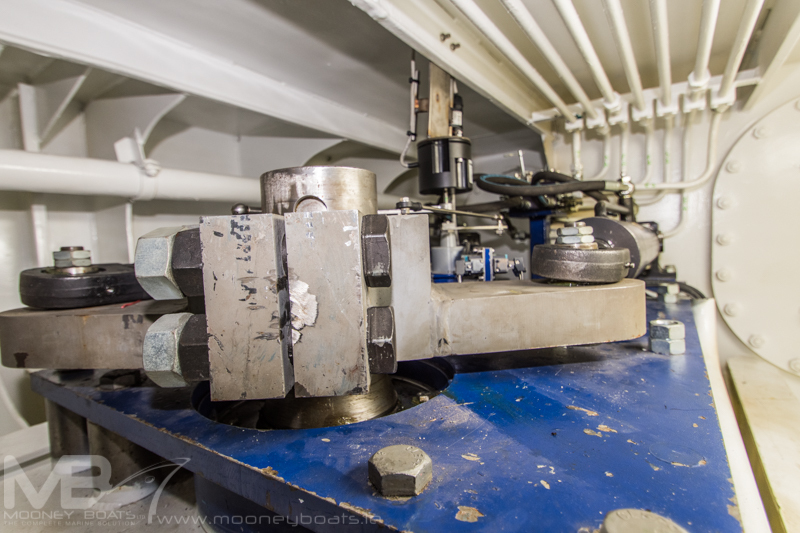 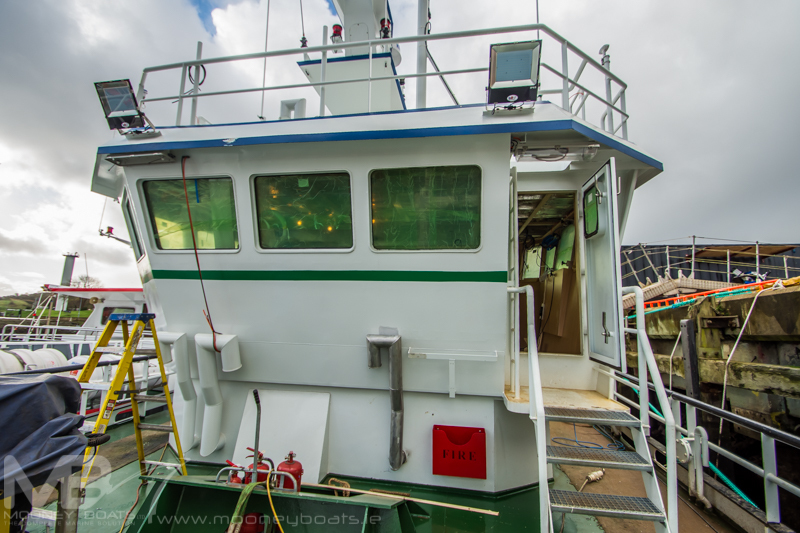 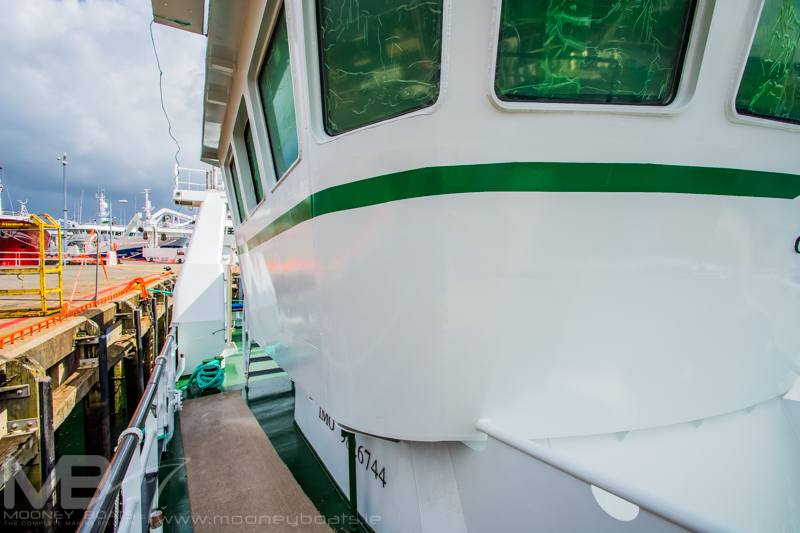 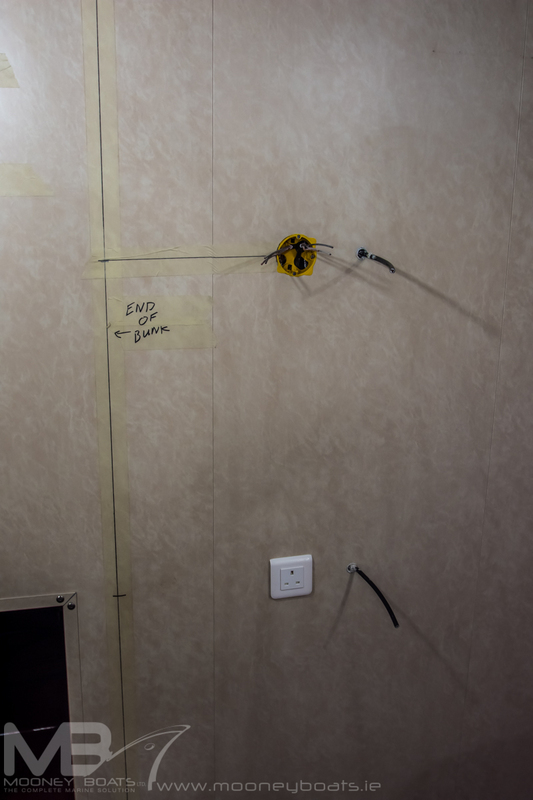 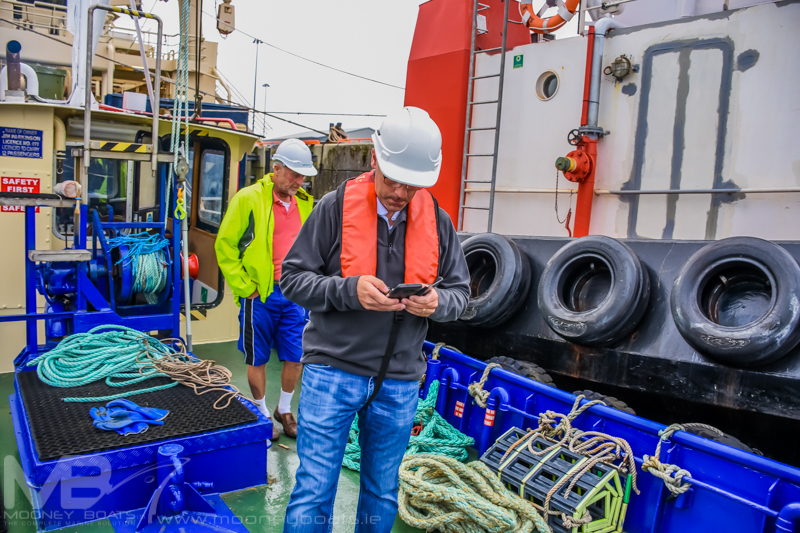 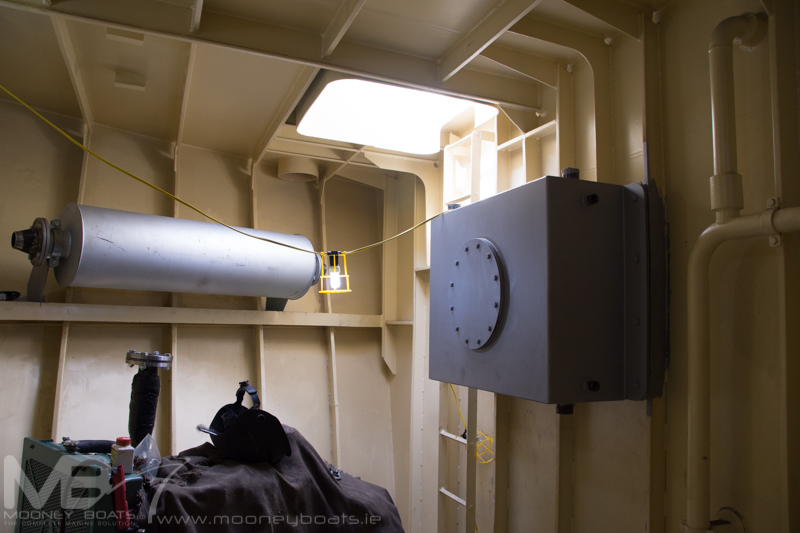 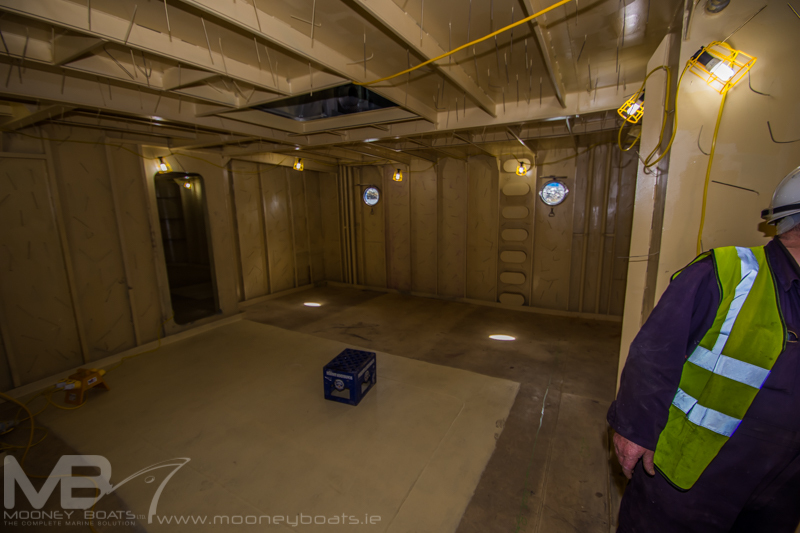 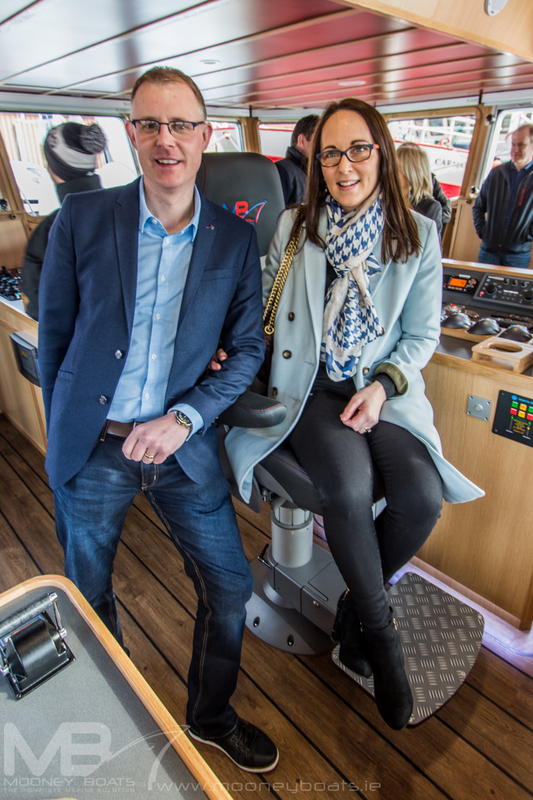 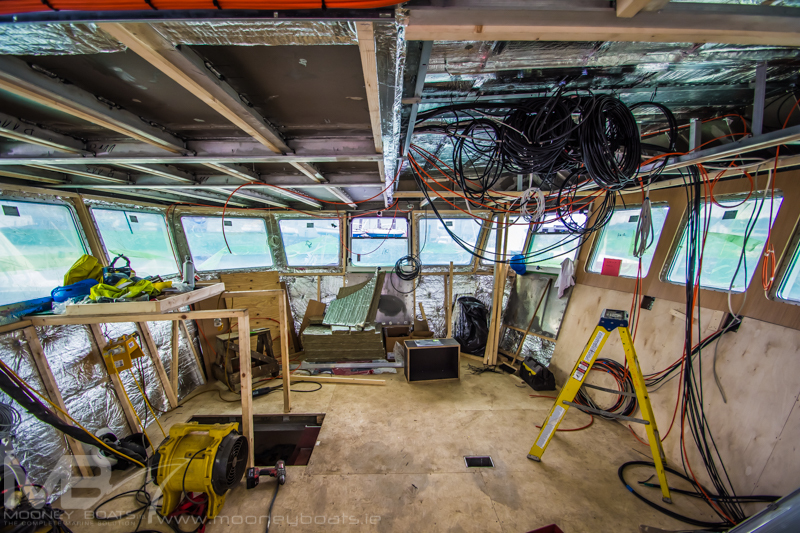 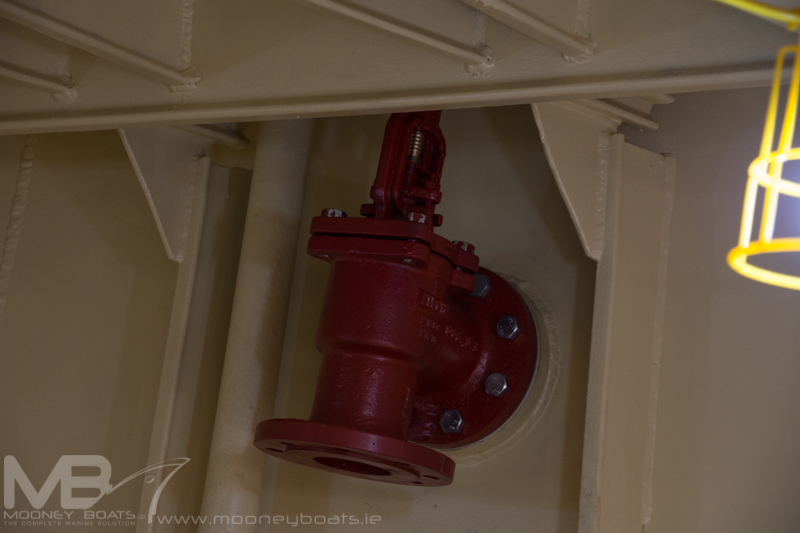 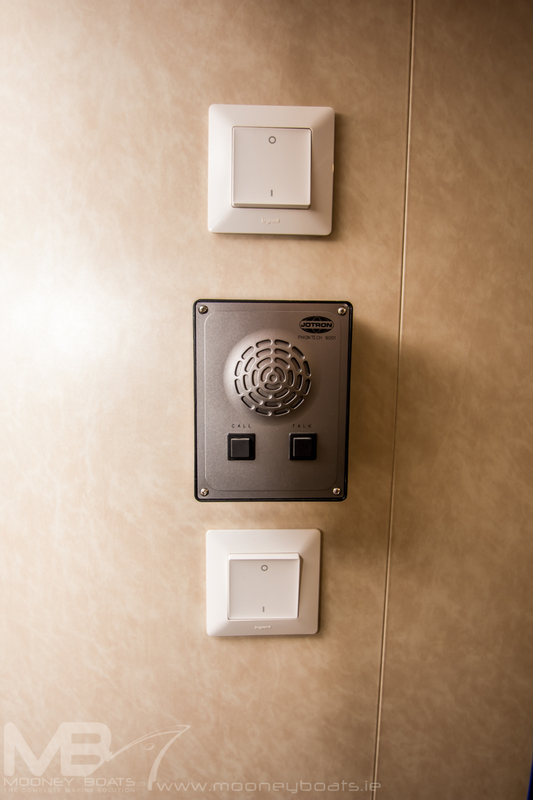 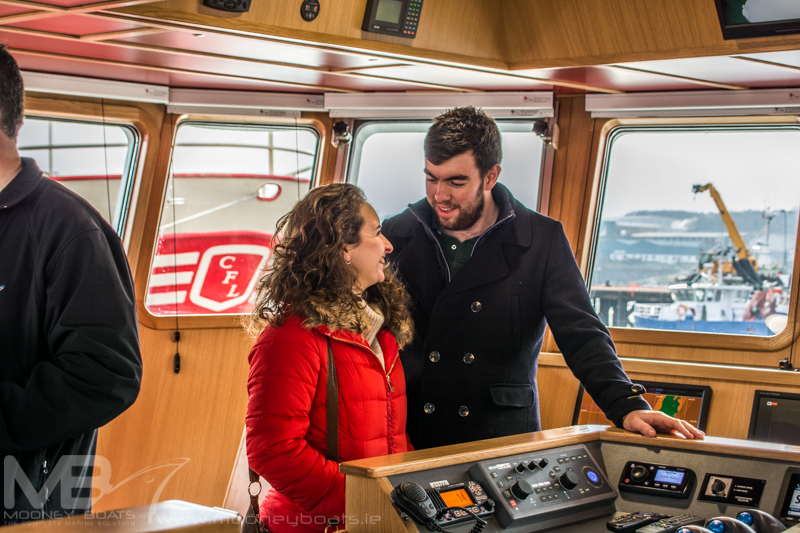 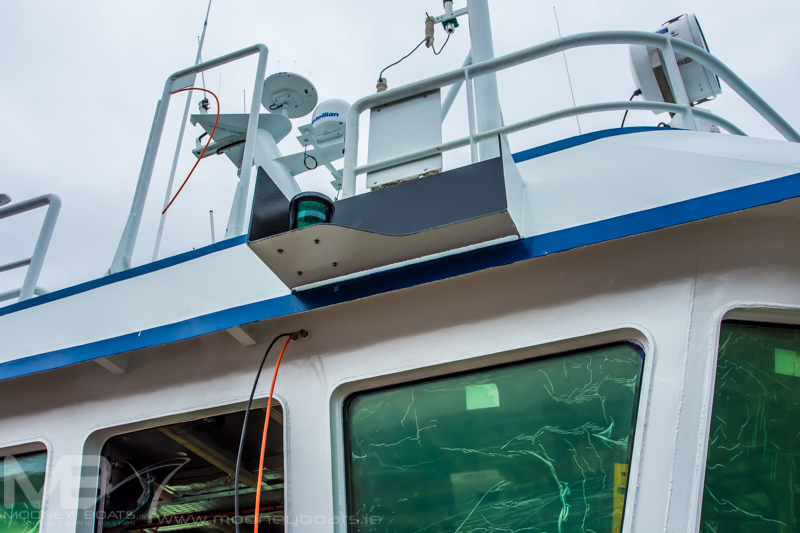 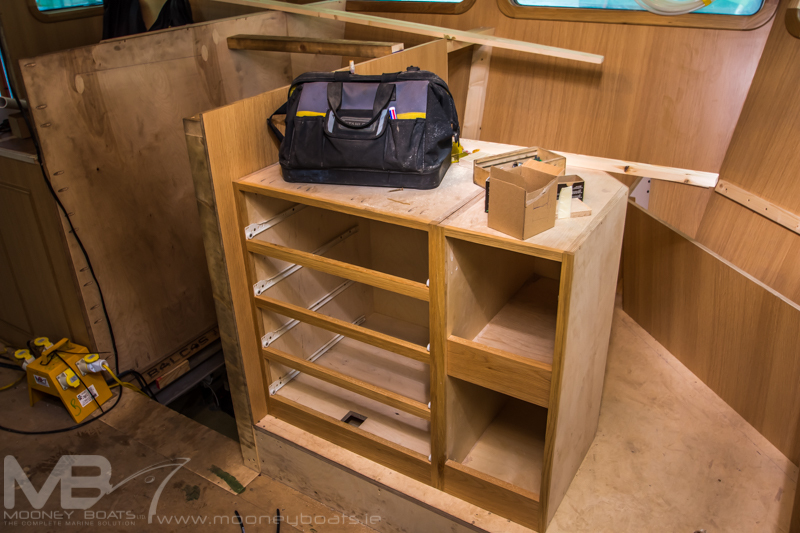 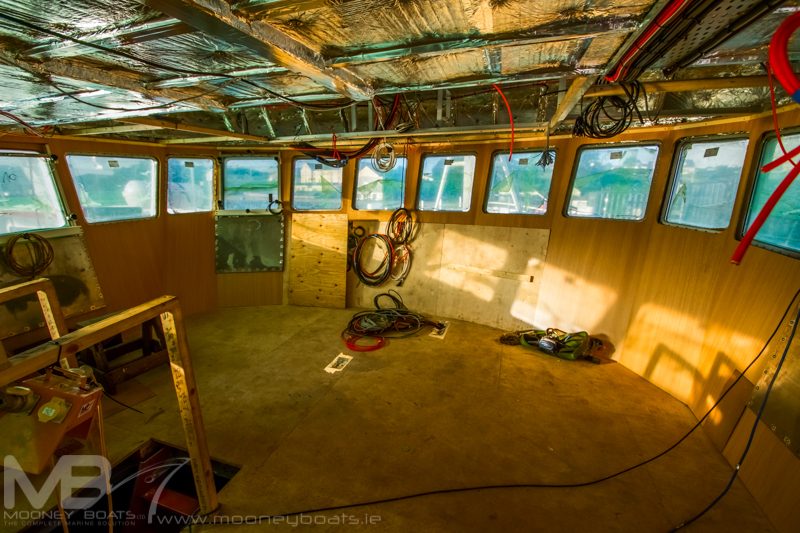 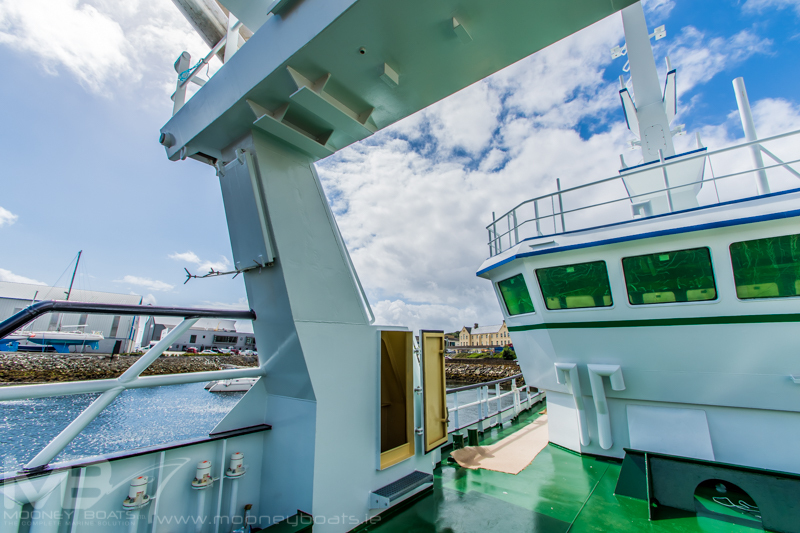 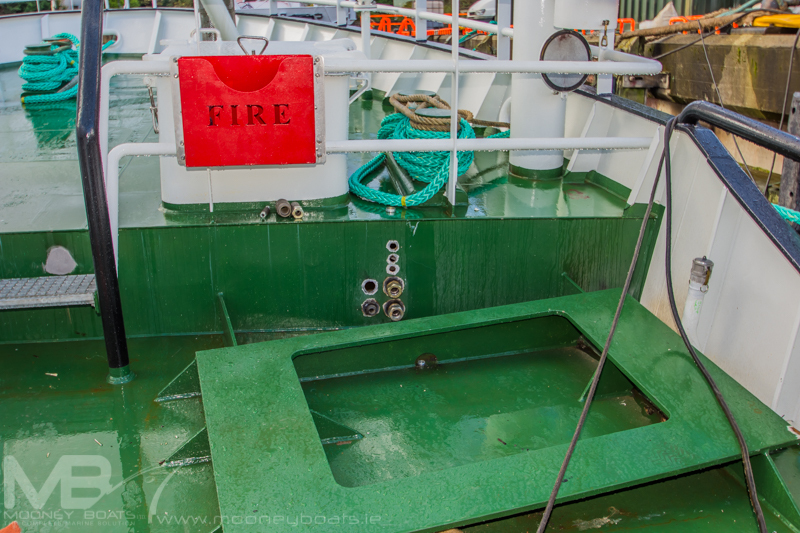 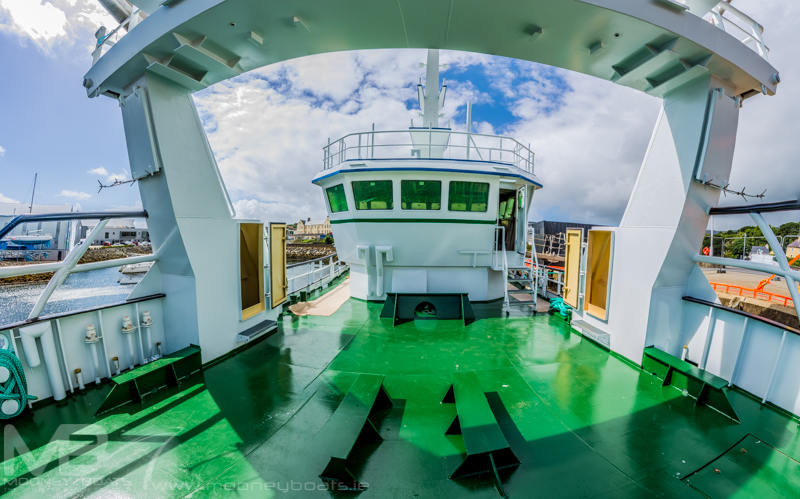 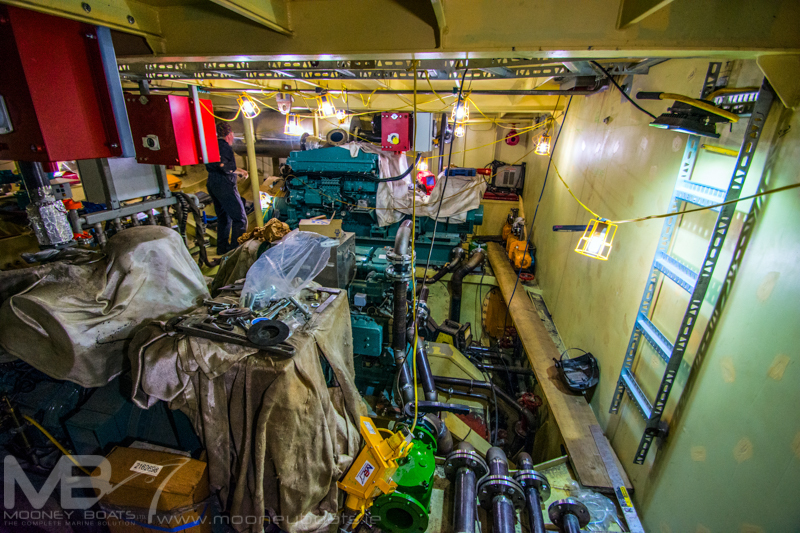 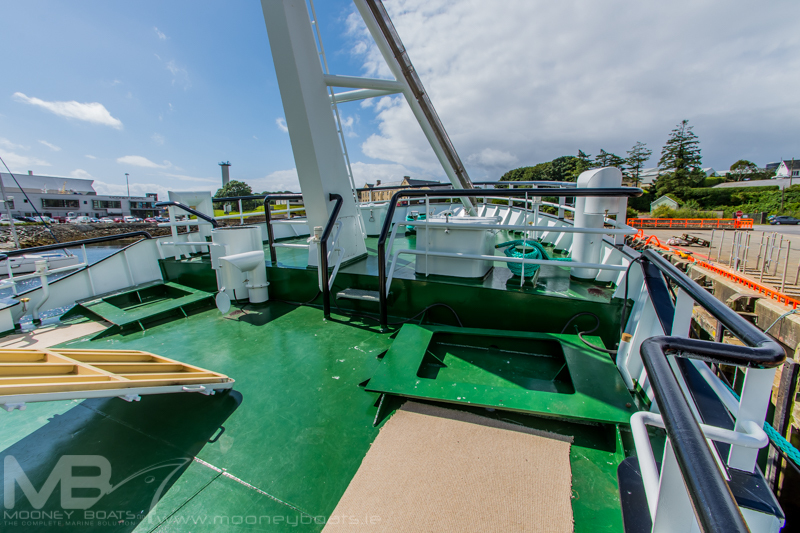 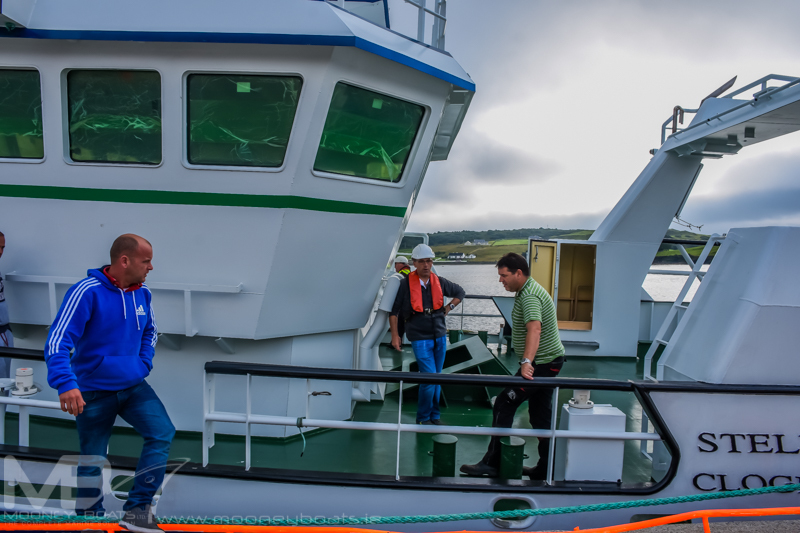 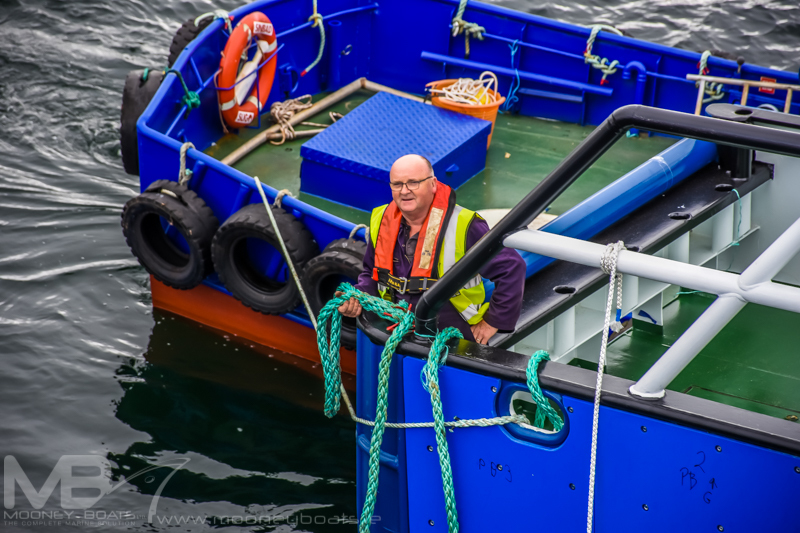 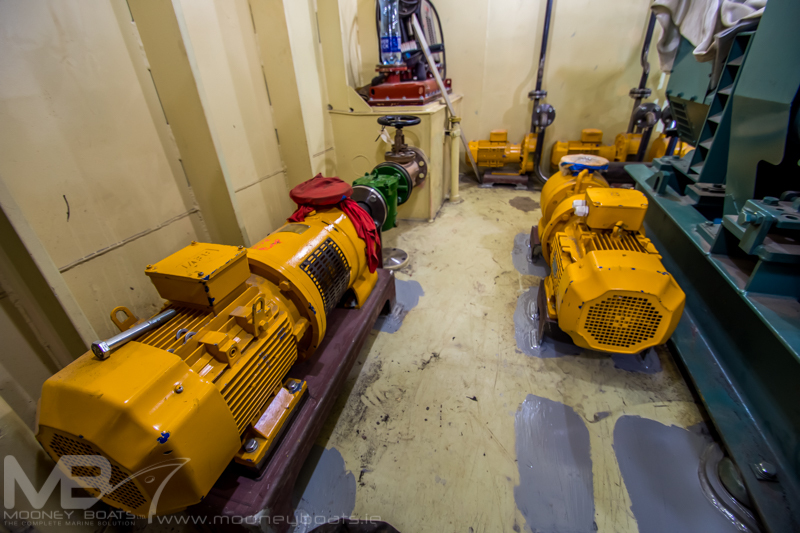 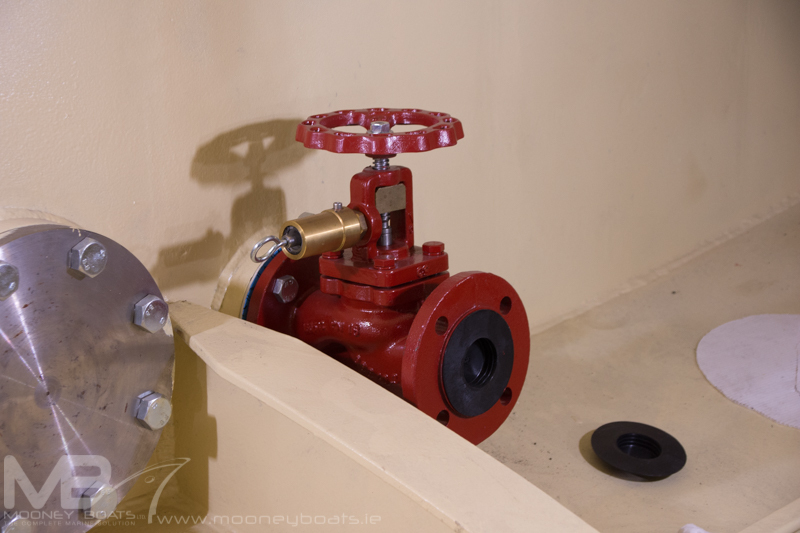 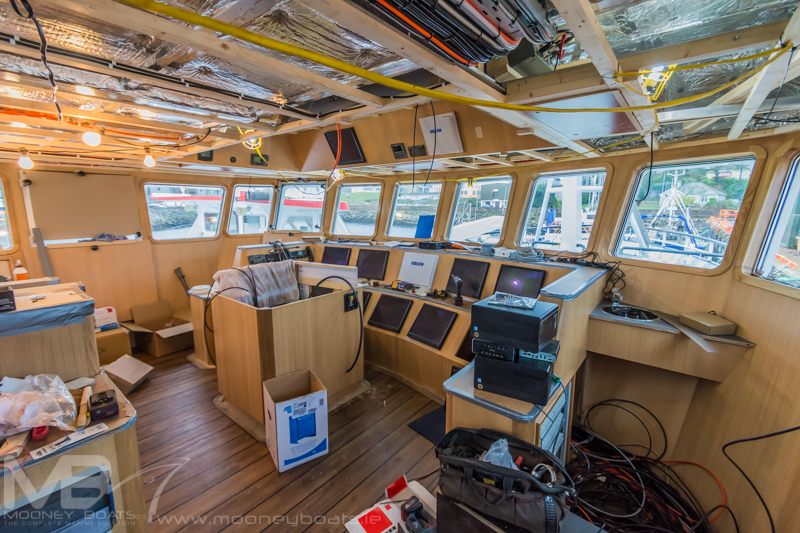 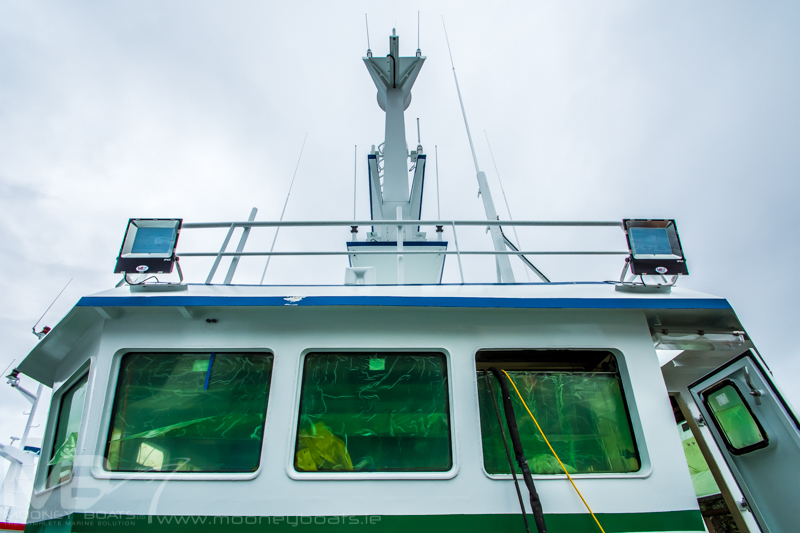 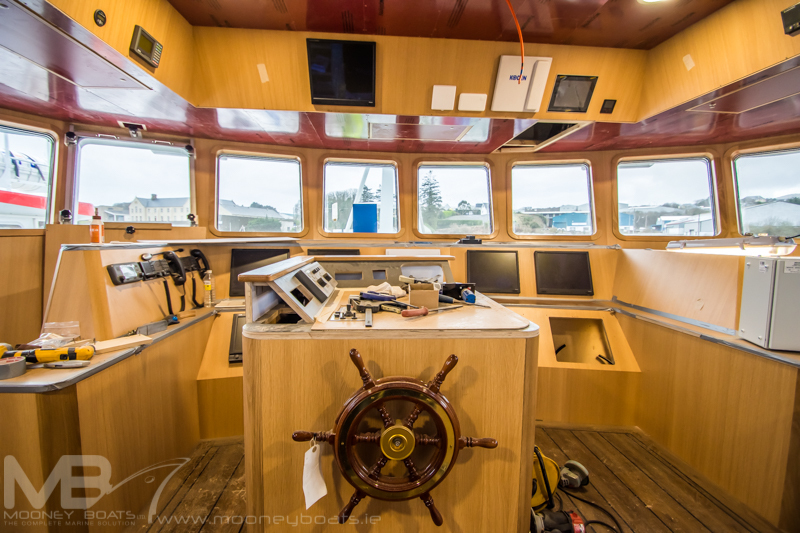 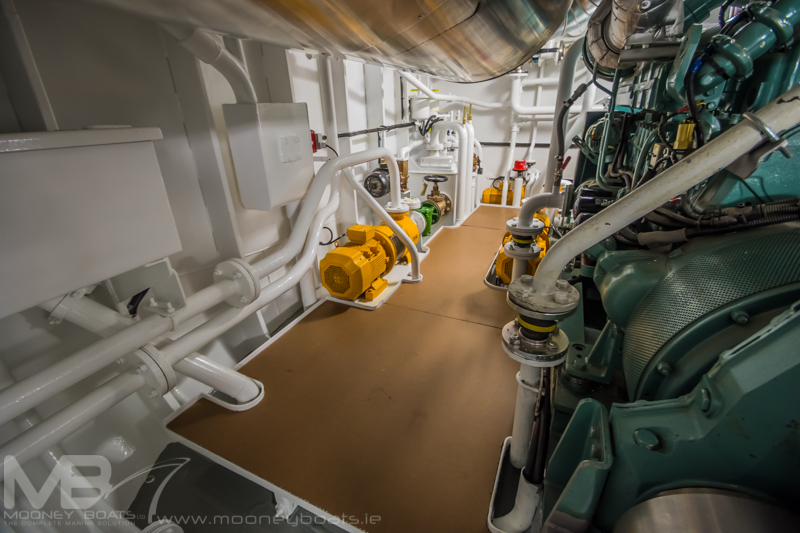 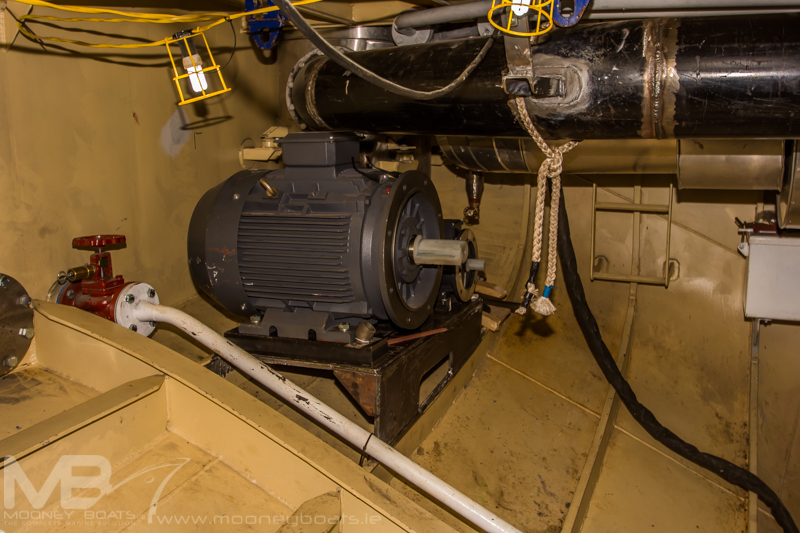 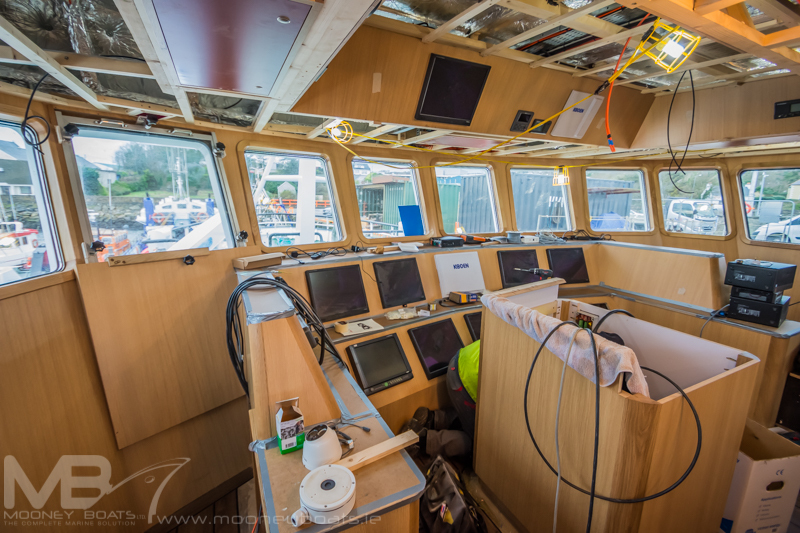 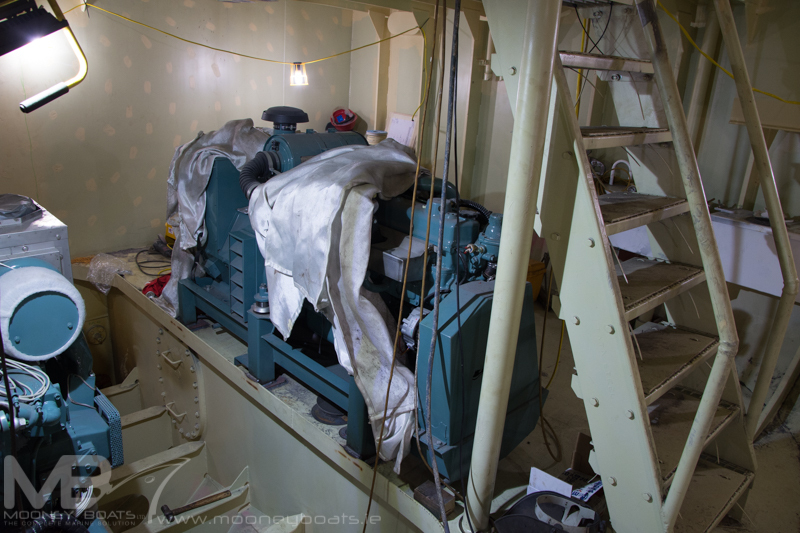 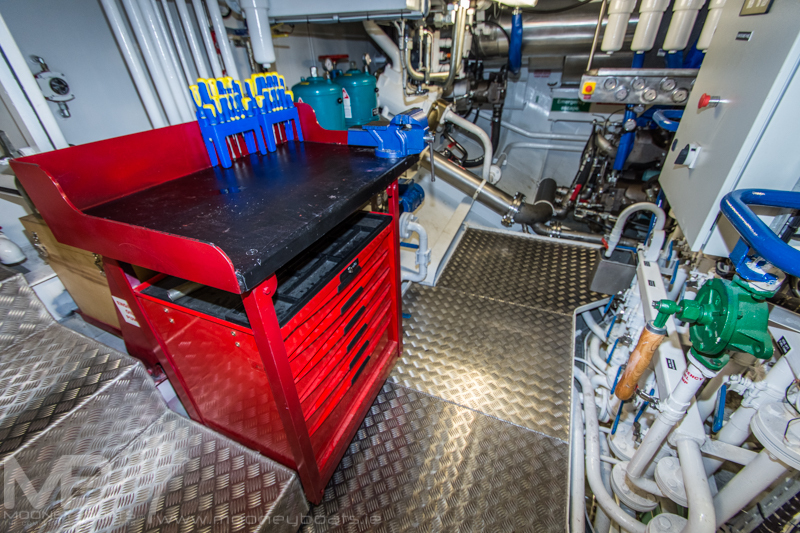 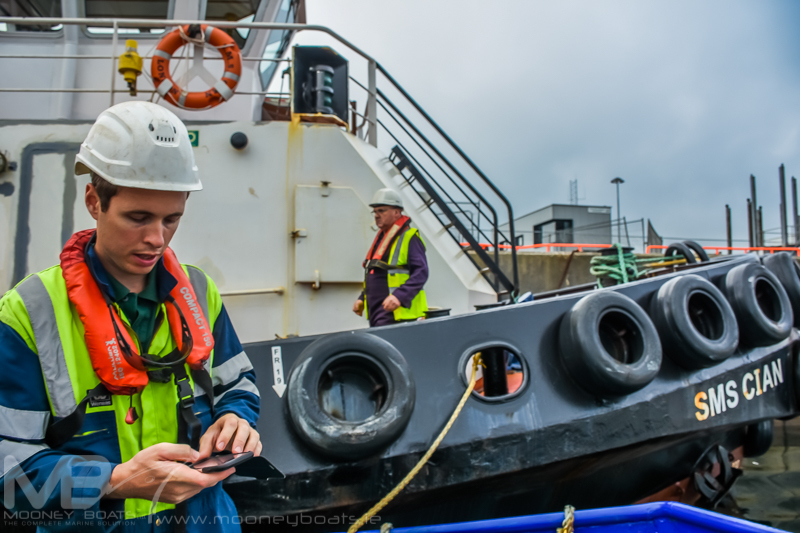 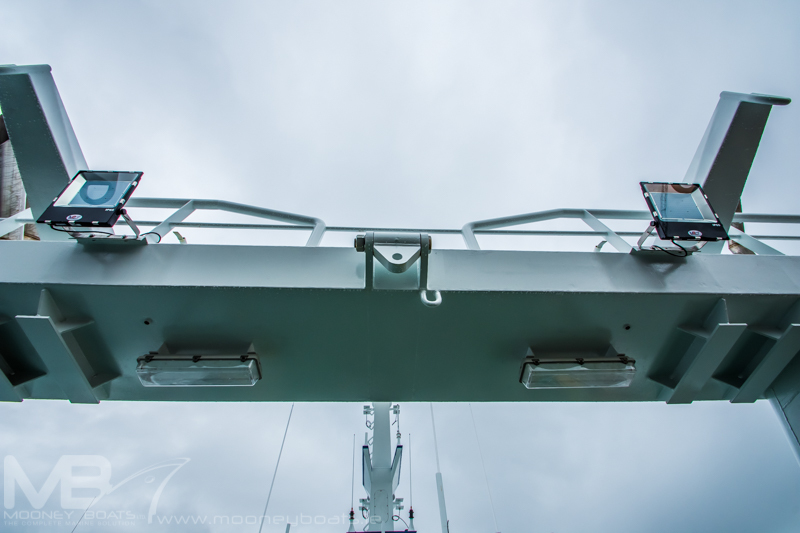 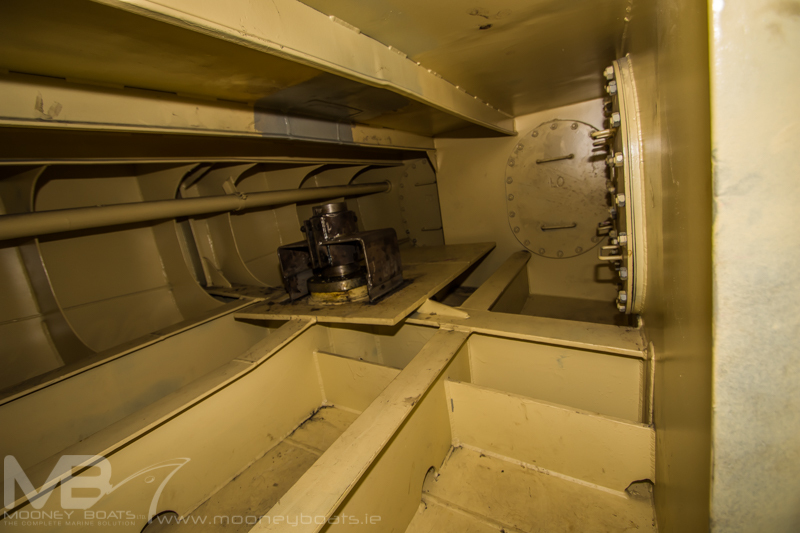 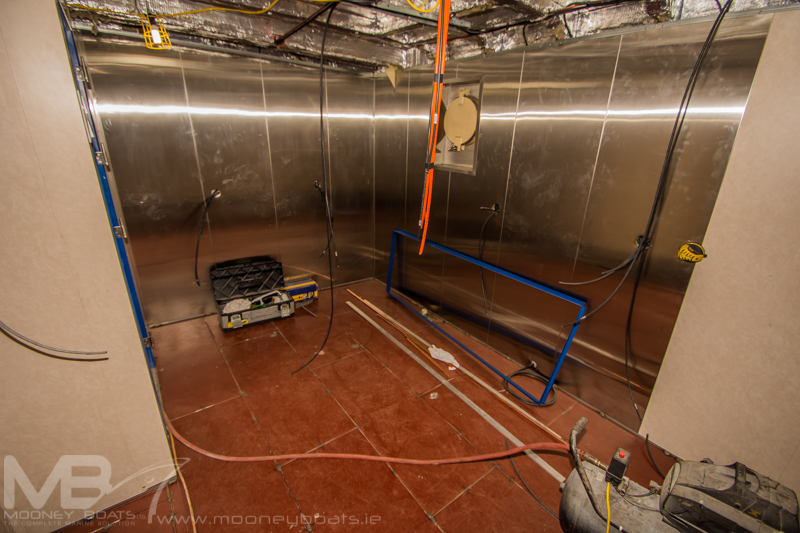 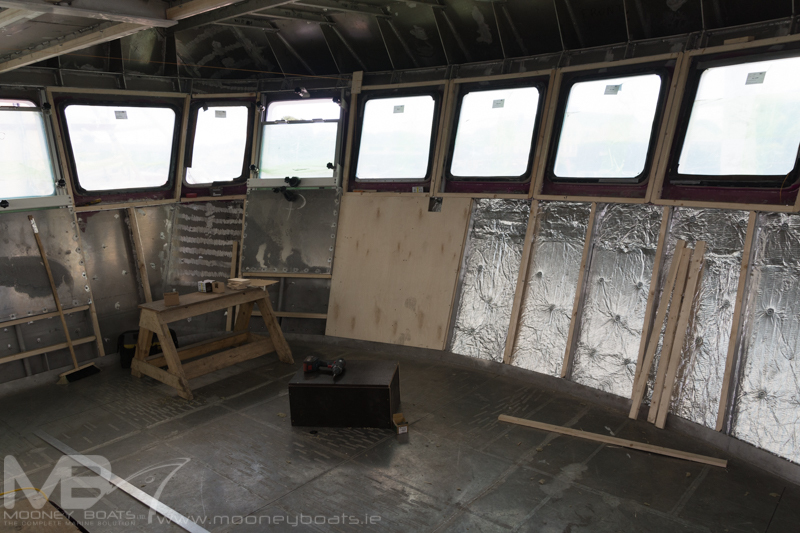 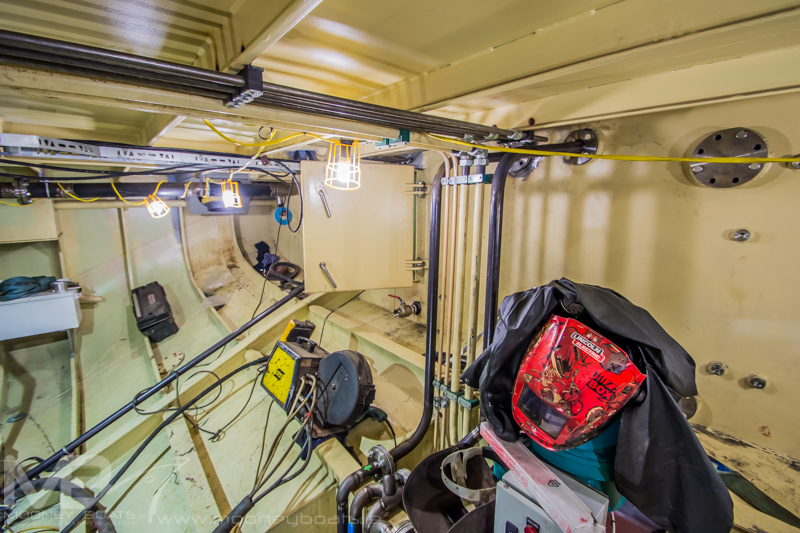 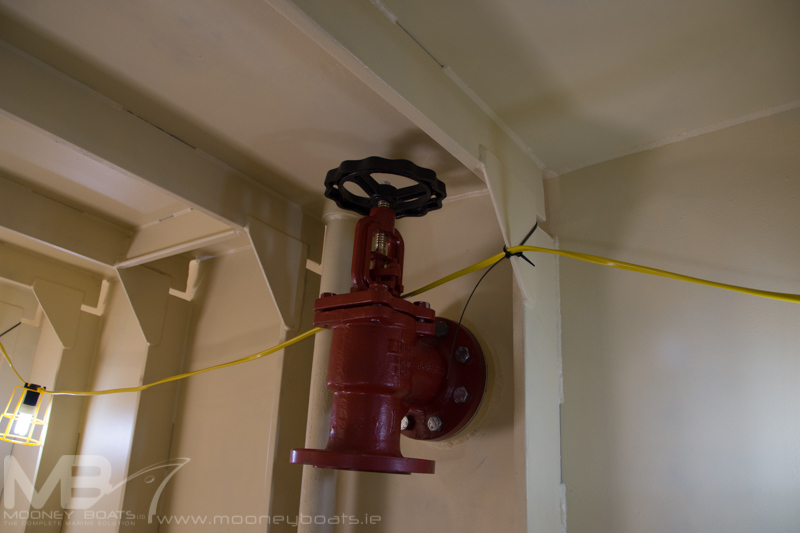 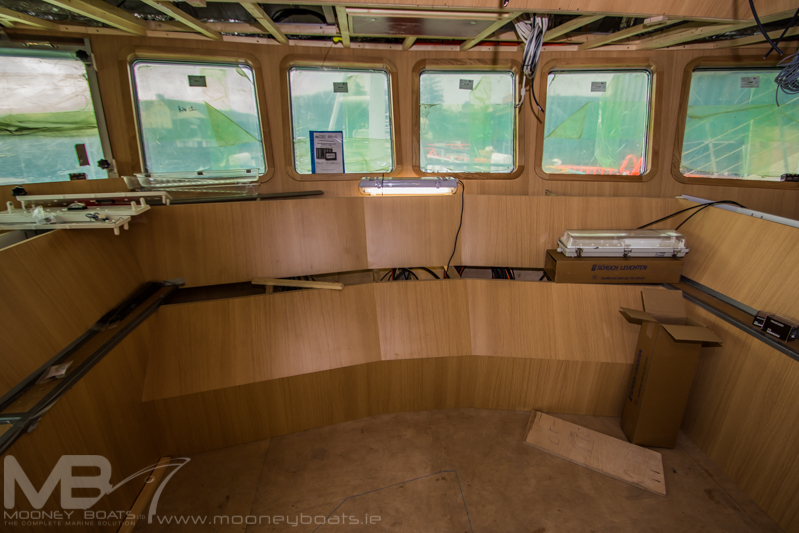 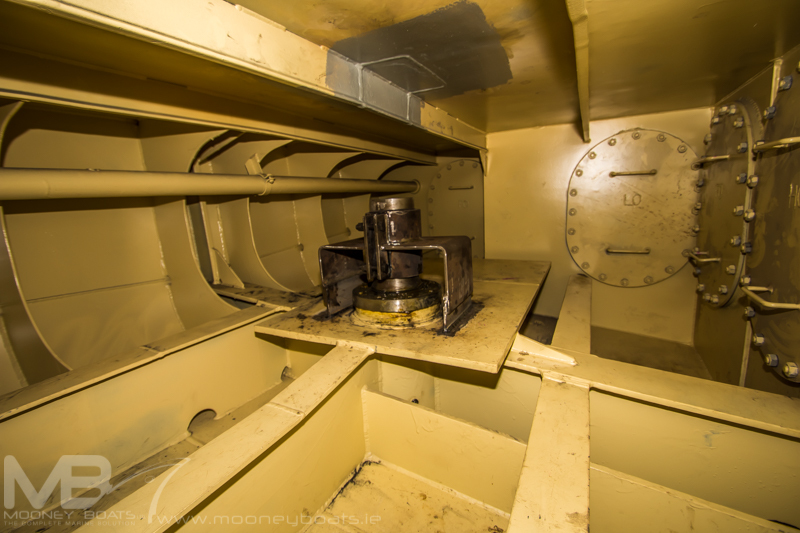 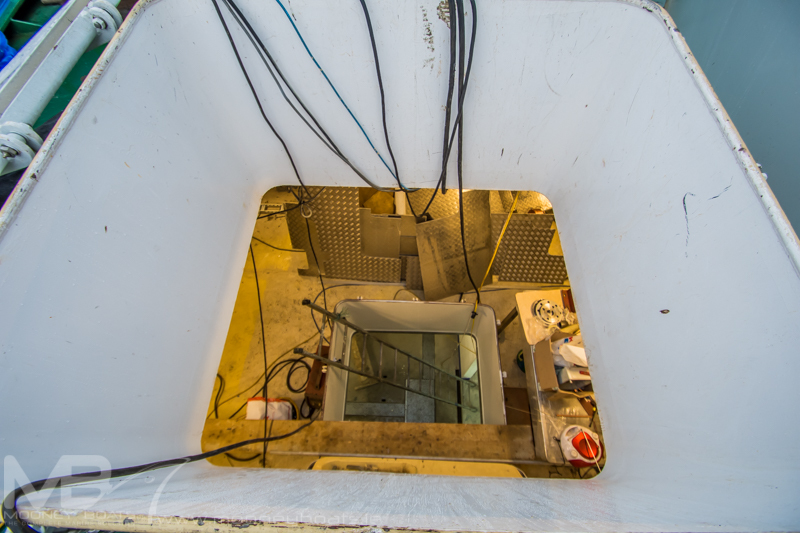 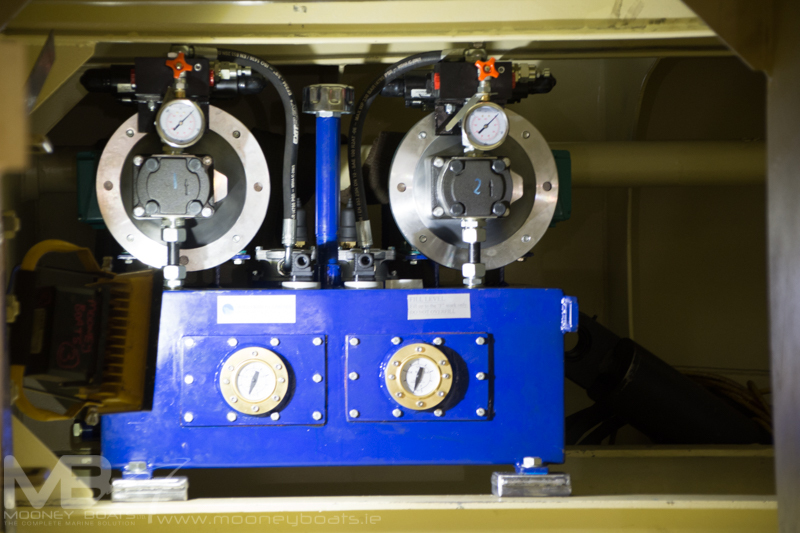 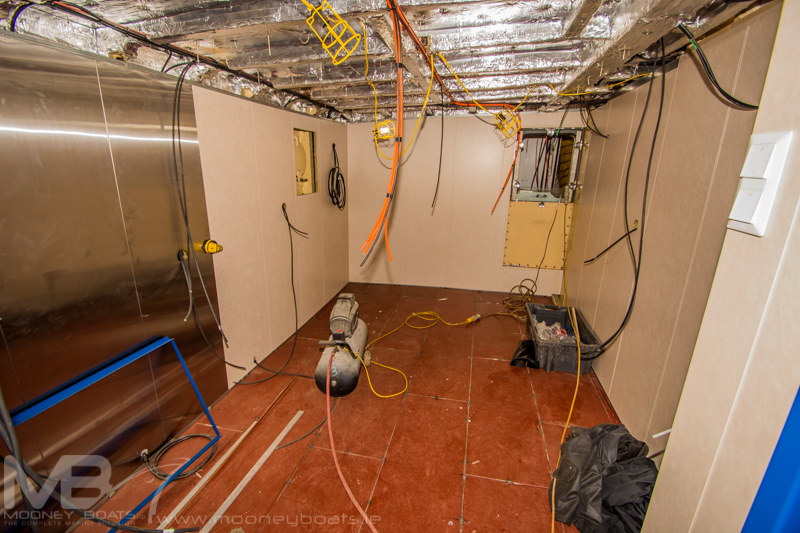 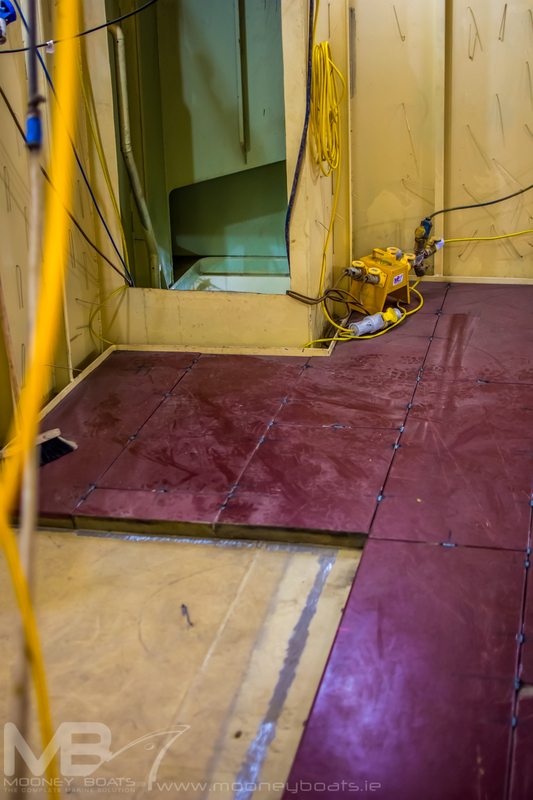 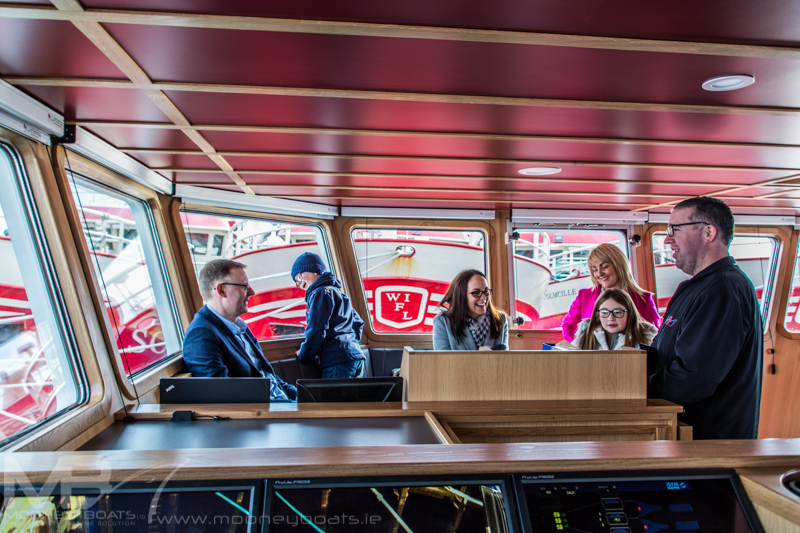 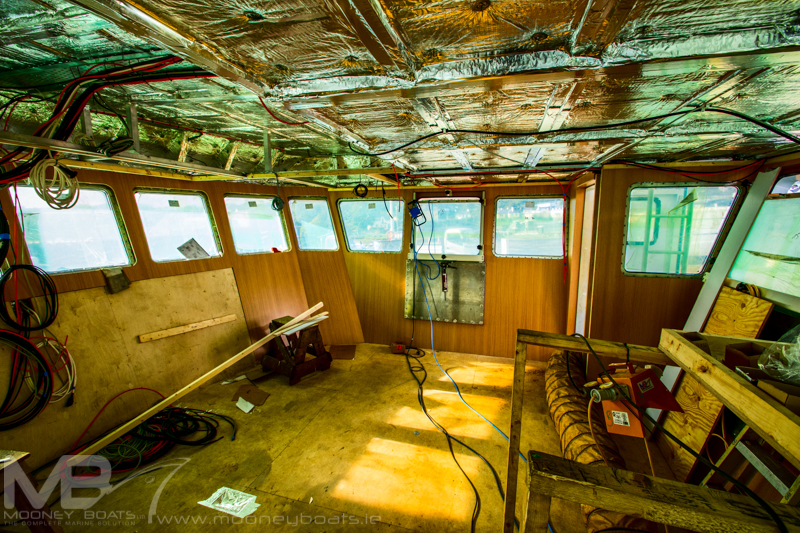 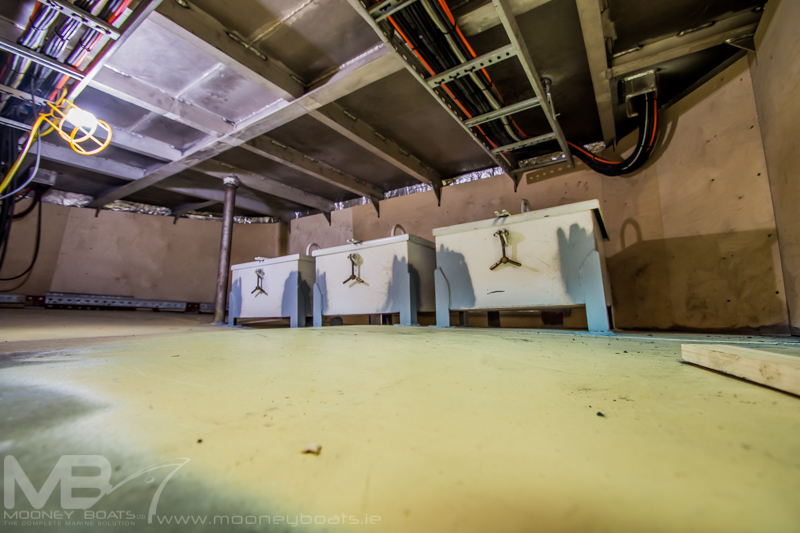 In the wheelhouse, the electronics package was supplied by Pat Maguire – Maine Electrician of Galway. 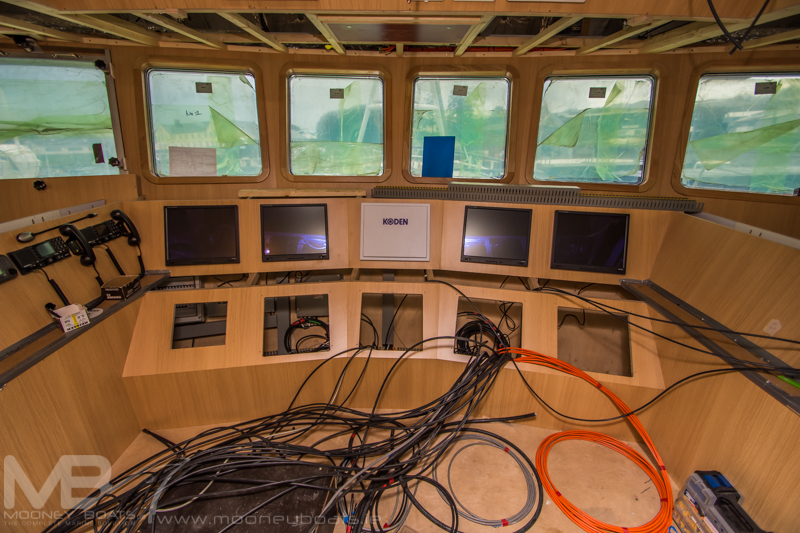 Scanmar System including 4-symmetry sensors and 3-distance sensors. 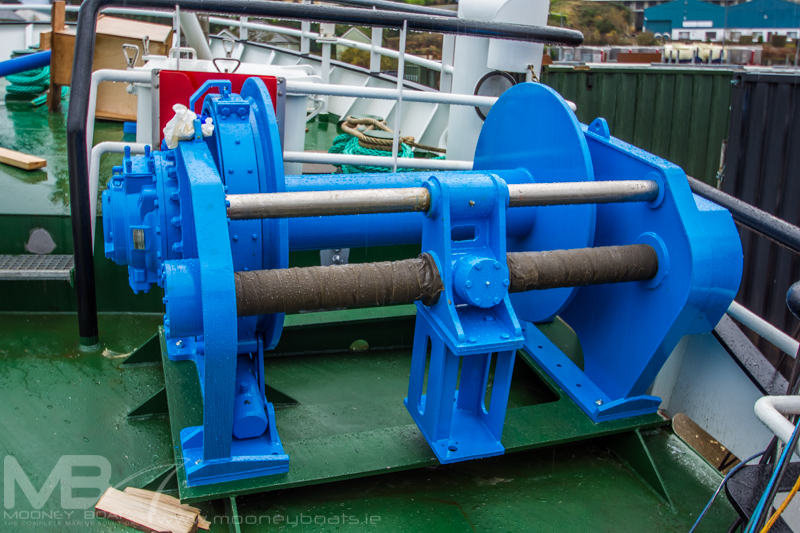 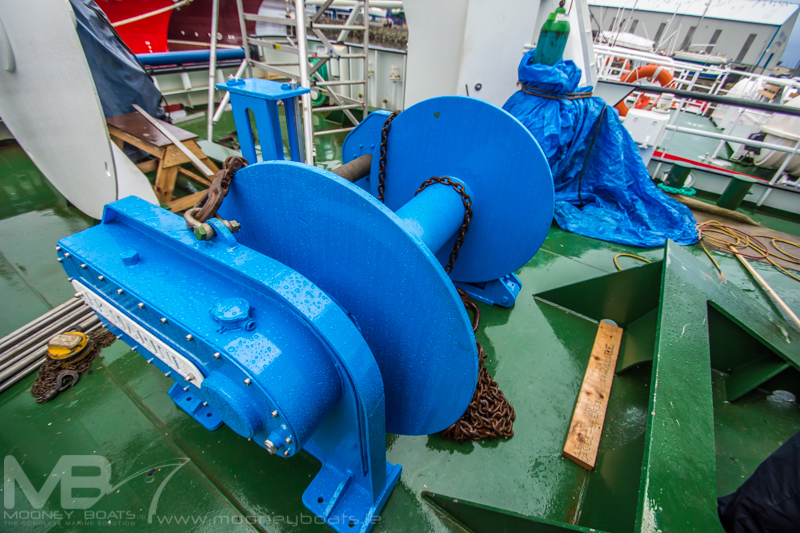 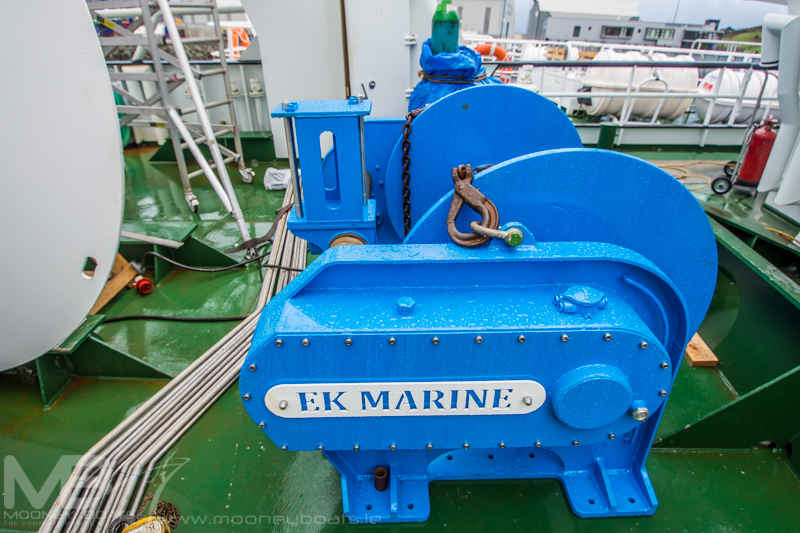 3 x EKM Trawl Winches, 15 tonne line pull with level wind and a drum capacity of 750 fathoms of (2 x fitted with 20mm wire and one with 22mm wire). 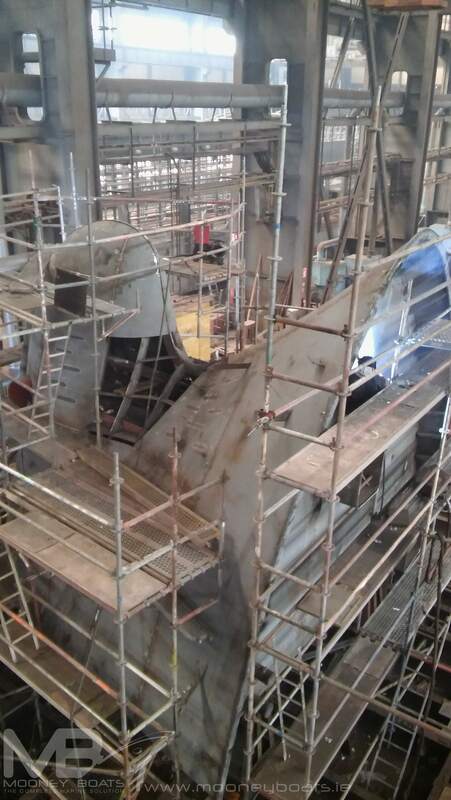 1 x EKM Landing Crane 8m fixed boom lifting capacity of 1 ton @ 8m and capable of 360 degree continuous slewing equipped with 1 ton 2 speed winch, radio remote and deck mounted local controls. 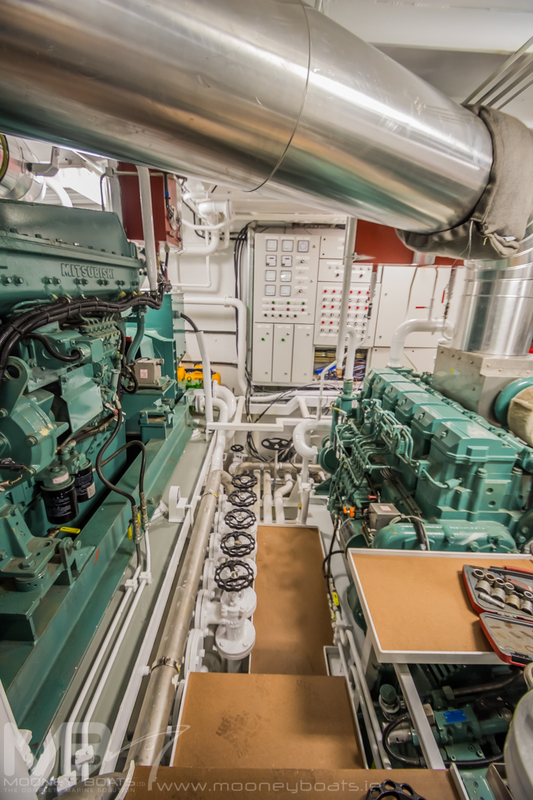 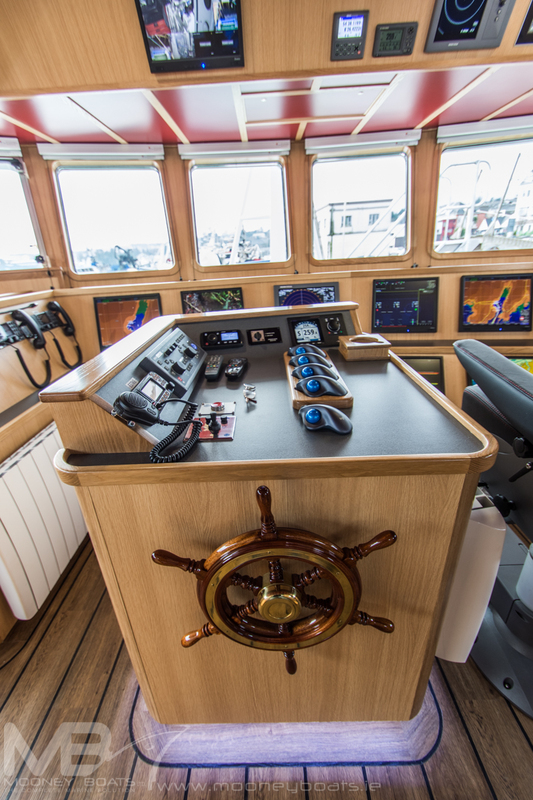 A hydraulic system, including a wheelhouse control system, consisting of a two-speed directional control for the five winches and two net drums, plus the vessels bow thruster. 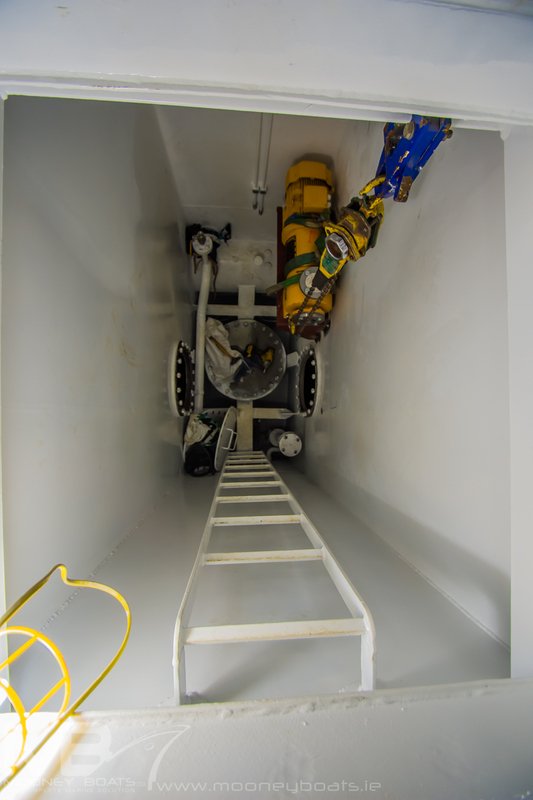 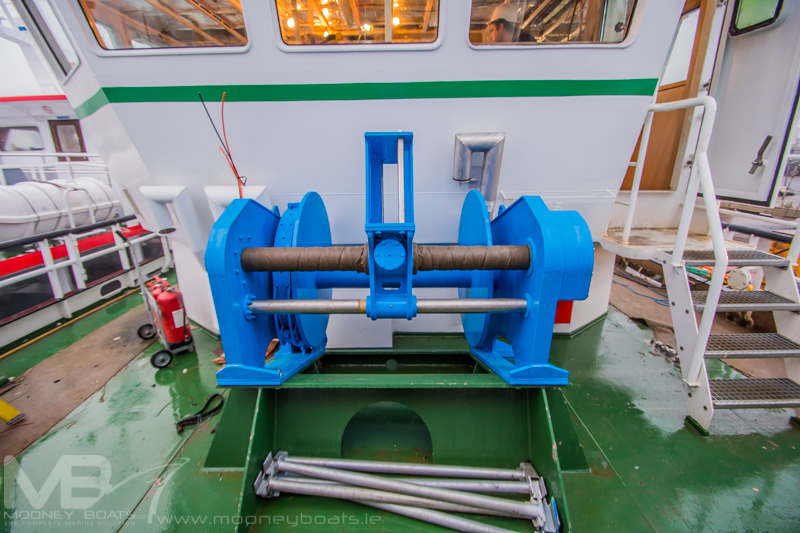 And a Scantrol System which is an auto-shoot and auto-haul system, capable of constantly monitoring winch speeds and the length and tension of the trawl wires. 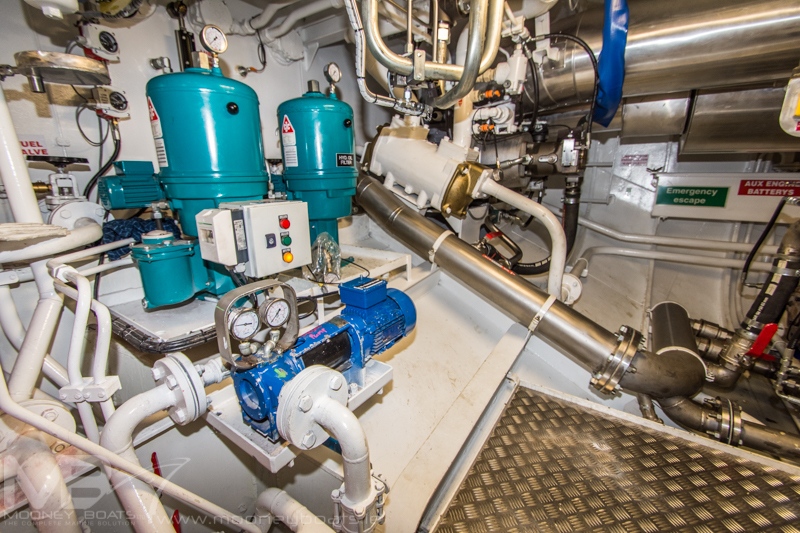 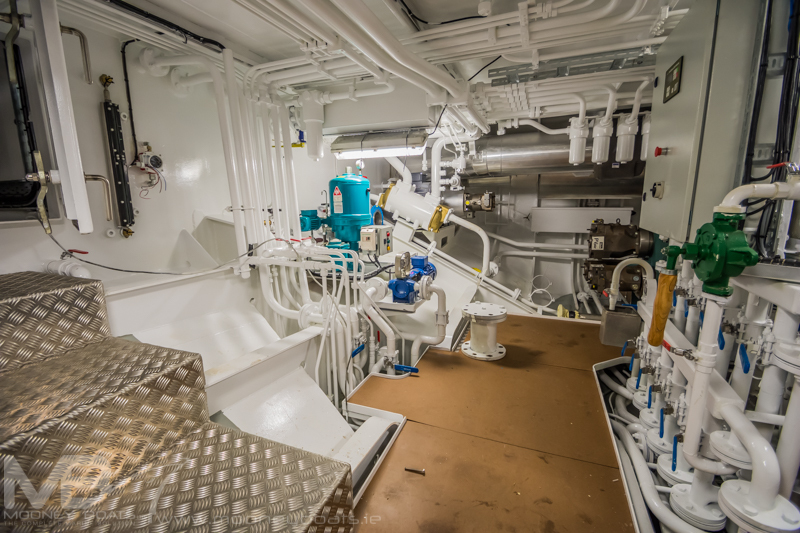 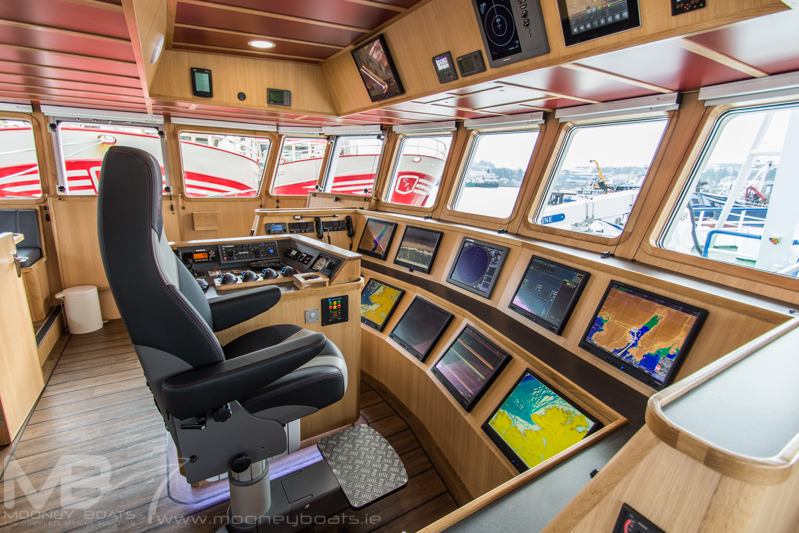 The system is also capable of monitoring fuel bunkering and efficiencies, tank levels, heel, trim and temperature all controlled and displayed via a10.1” touch screen pc and accessible remotely via wireless internet connection. 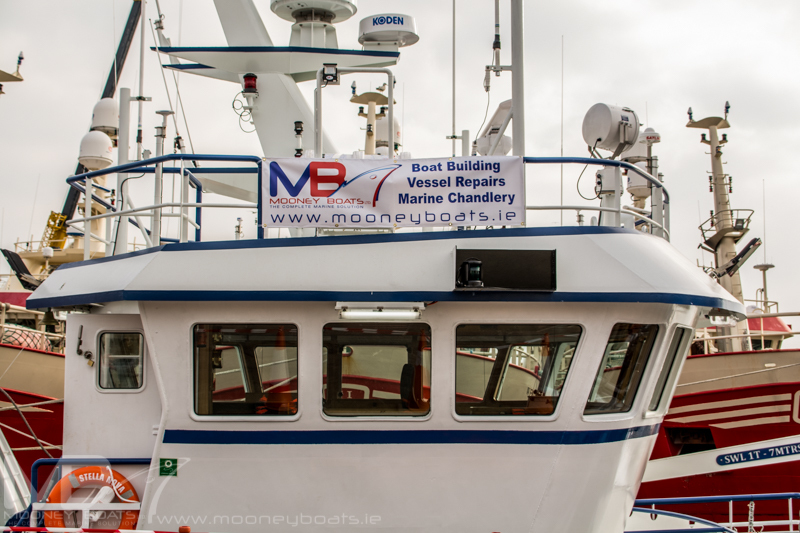 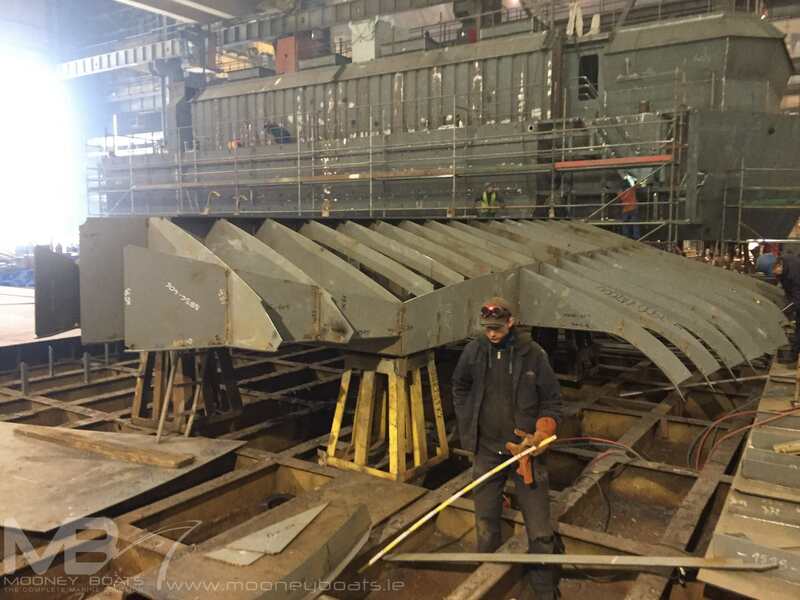 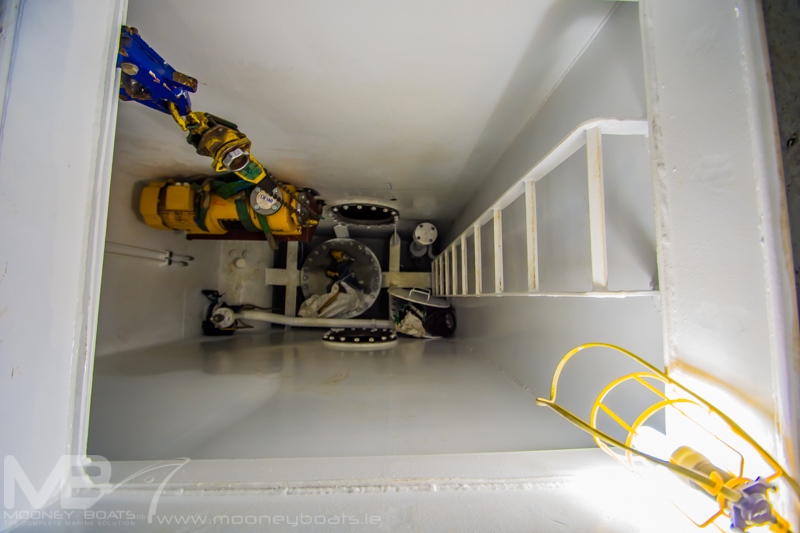 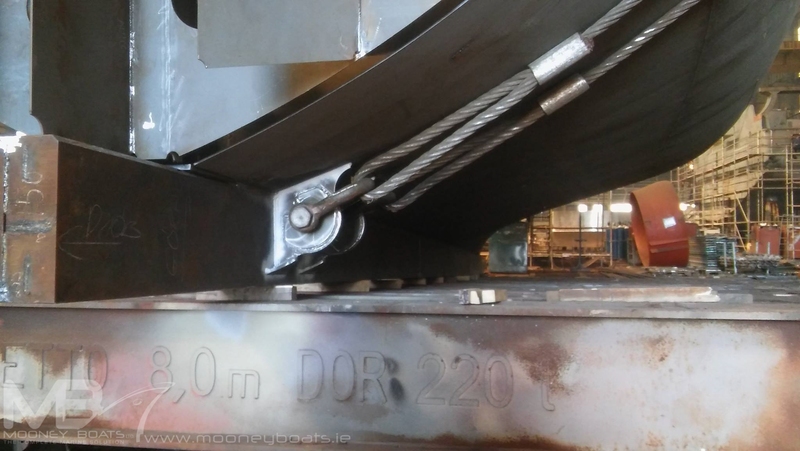 Mooney Boats Ltd who are sole agents in Ireland for Guerra Marine Cranes supplied a Guerra knuckle boom marine crane short post Model MC40.55A2 which is fitted with a winch and radio remote control. 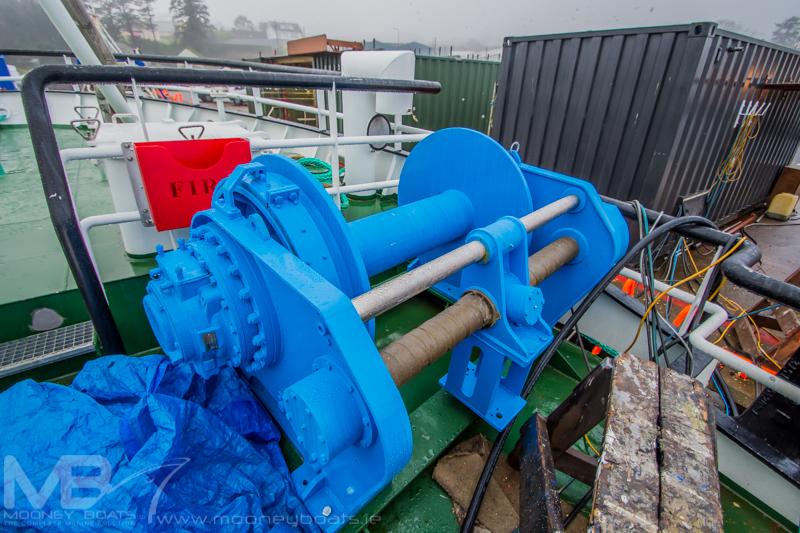 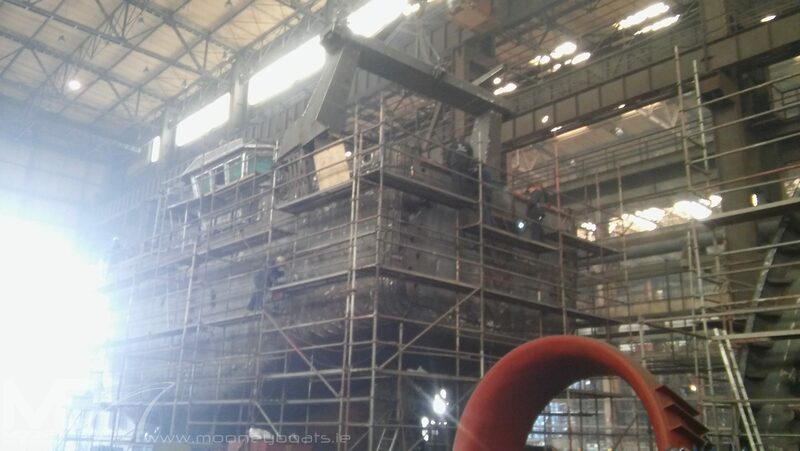 The yard also supplied a Thistle 24” W Power Block Head for the crane which is fitted on top of the gantry aft. 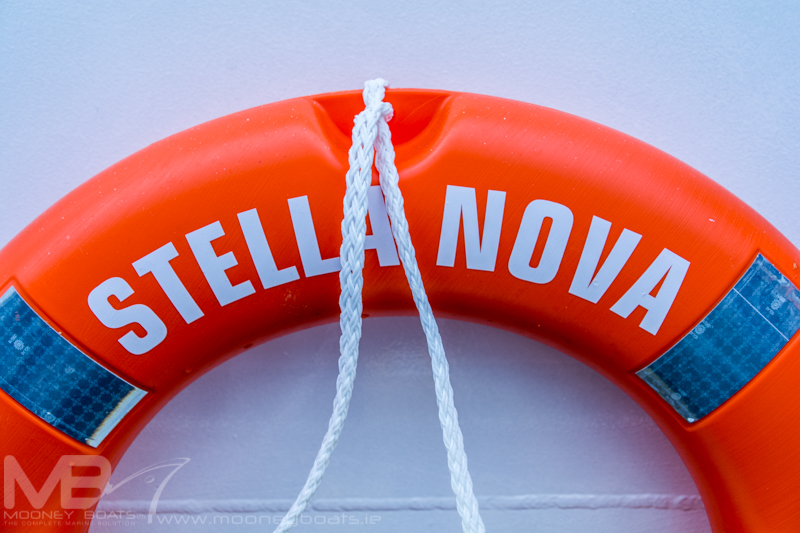 Again, as with the ‘Patrick C’, a huge influence on the choice of the ‘Stella Nova’ design was fuel economy. 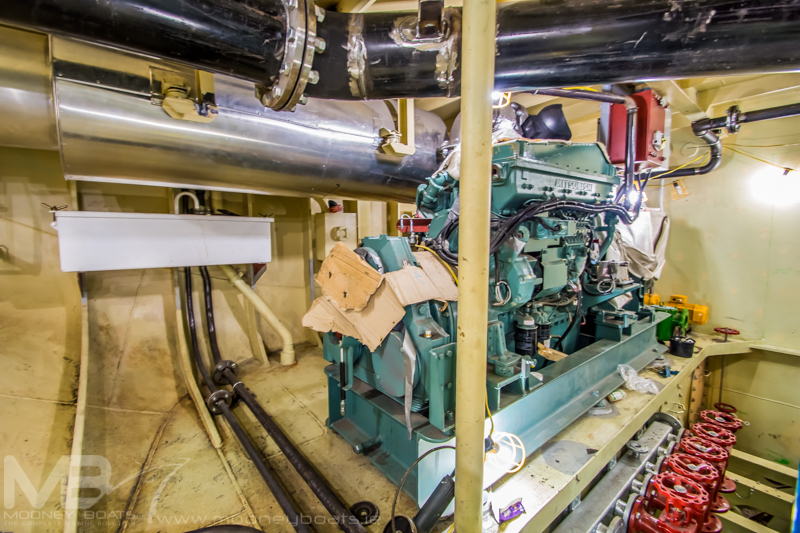 Maximum power trawling for the least fuel burn. 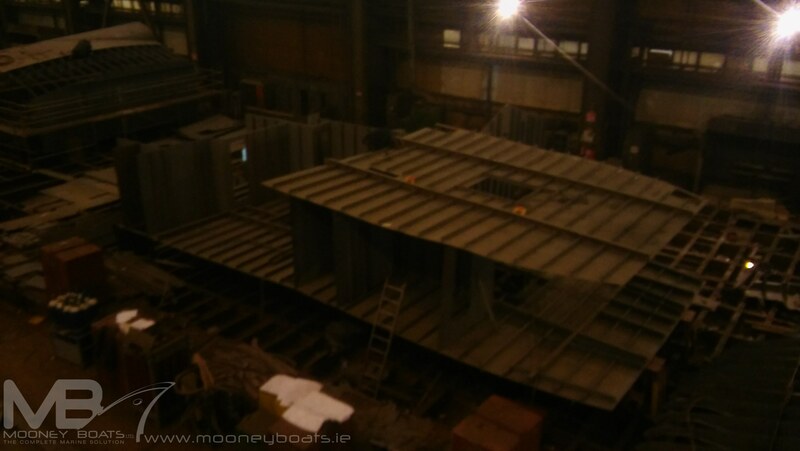 This will be achieved, as with her sister-ship by using an extra-large propeller in conjunction with a slower engine. 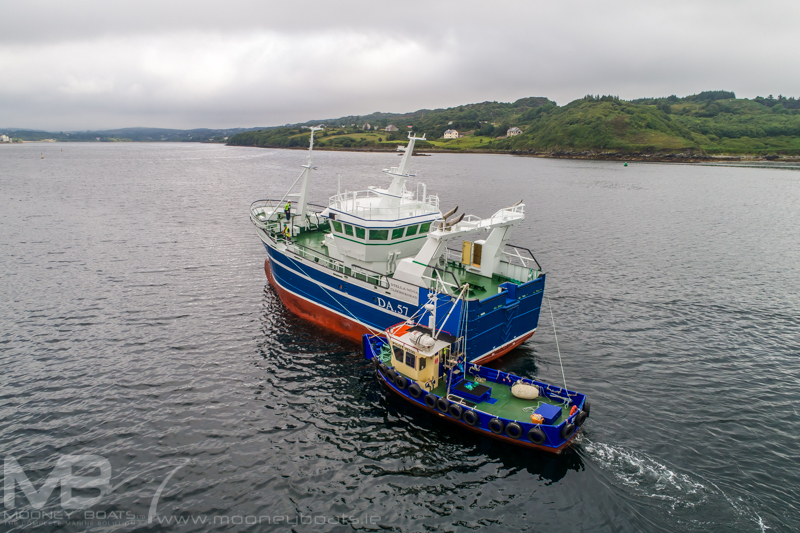 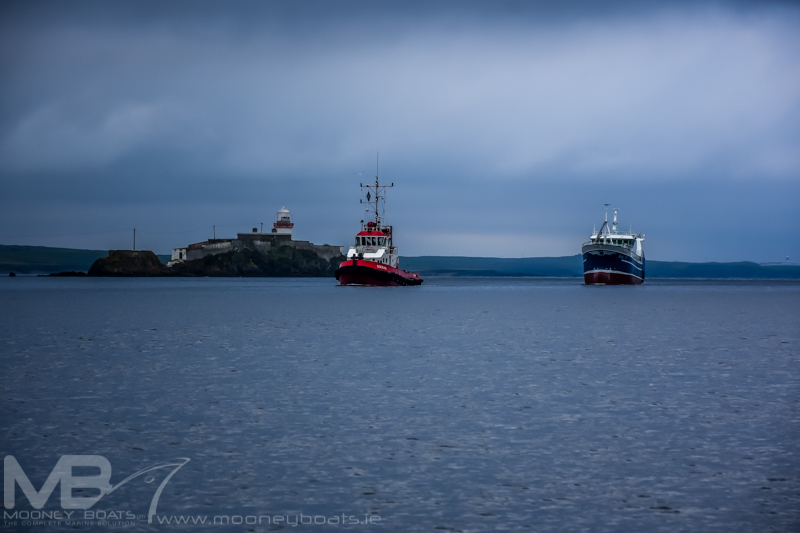 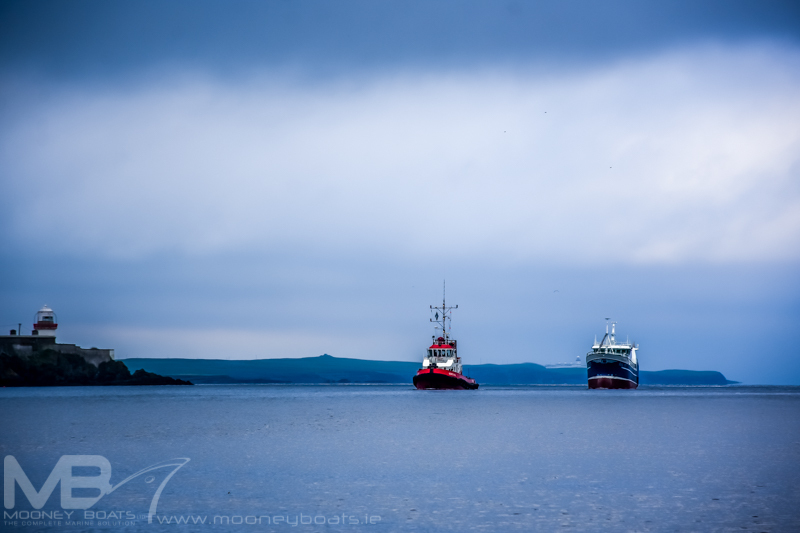 Fuel efficiency is critical for these vessels because of the distance they have to travel to their fishing grounds whether it be on the Porcupine Bank of the South-West coast in the summer, working the Irish Sea in winter or fishing cuttlefish off the south English coast in autumn. 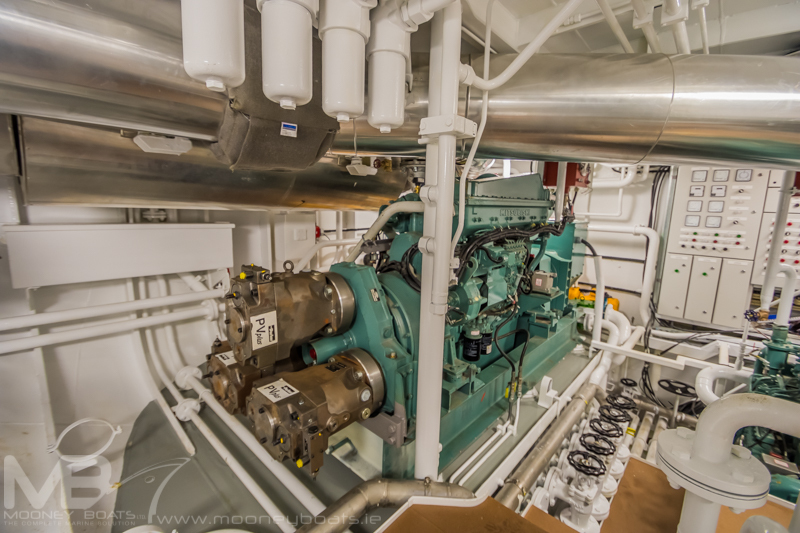 The main engine is a Mitsubishi S6R-TMPTK-3 Tier 2 rated 423kW@1350rpm. 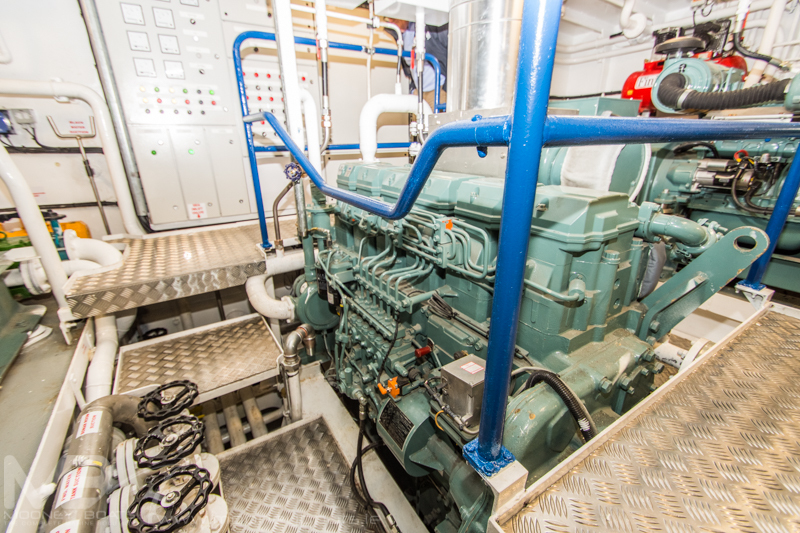 This is a modern high-standard and fuel-efficient engine. 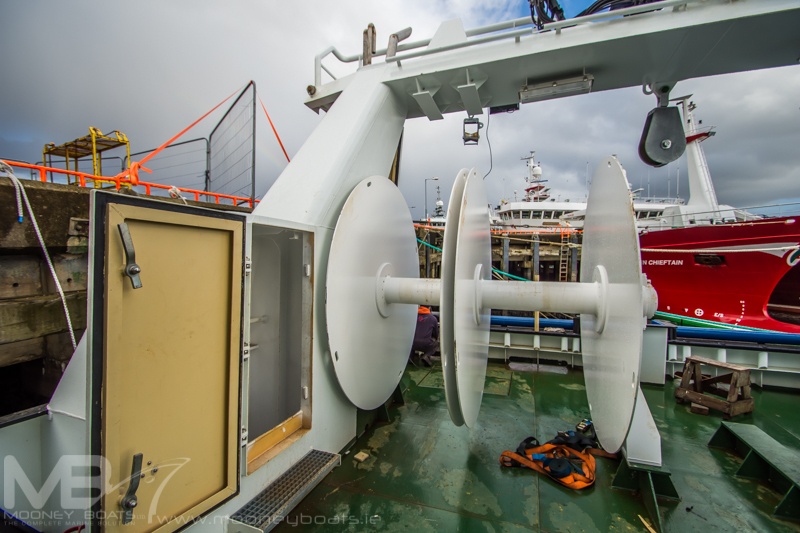 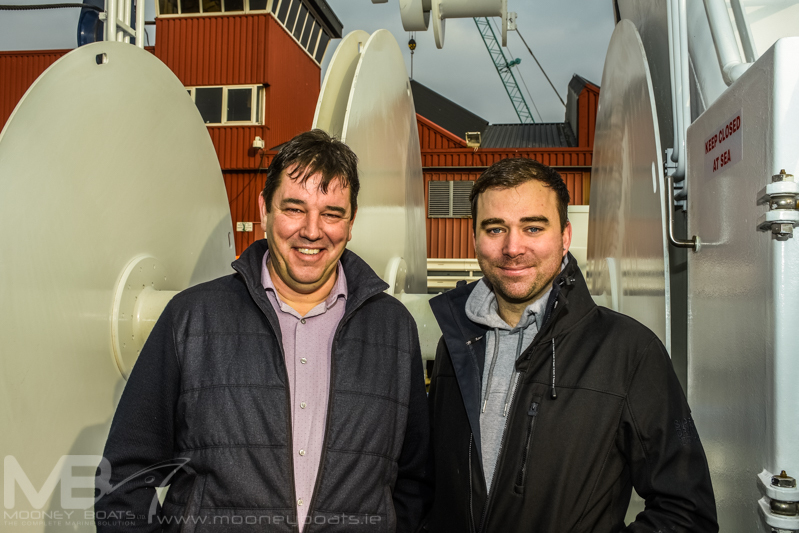 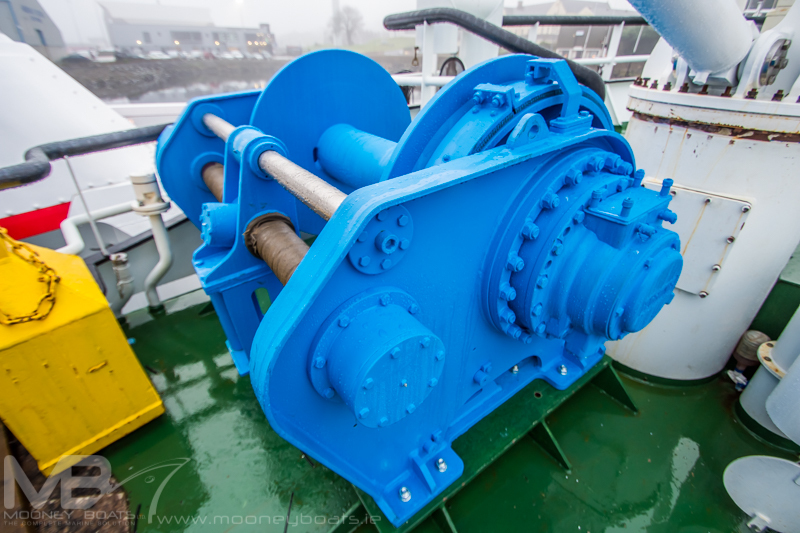 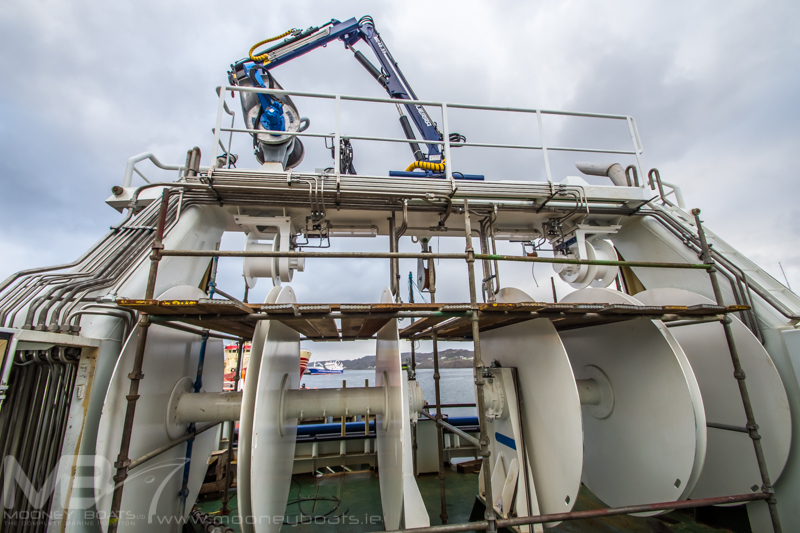 The gearbox is a Reintjes WAF reverse reduction 7,476:1, which drives a 2.5 metre four-blade fixed-pitch propeller, controlled with a Kobelt electric controller delivering a top speed of 10 knots. 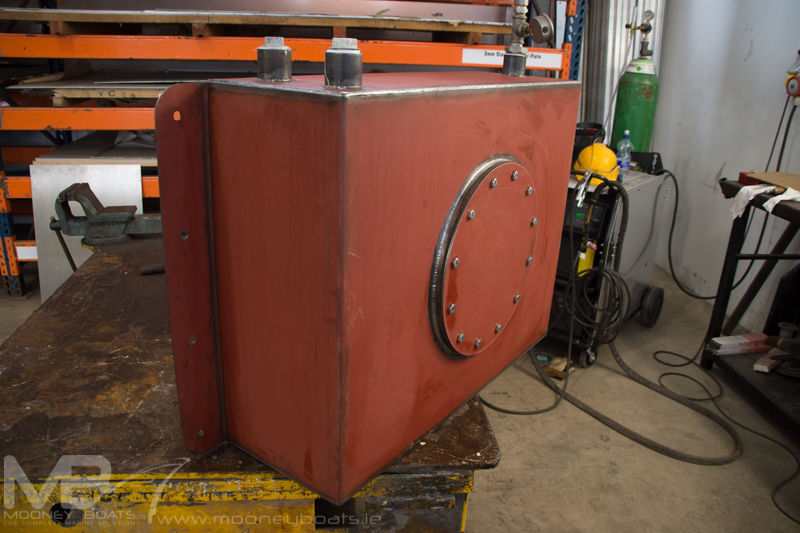 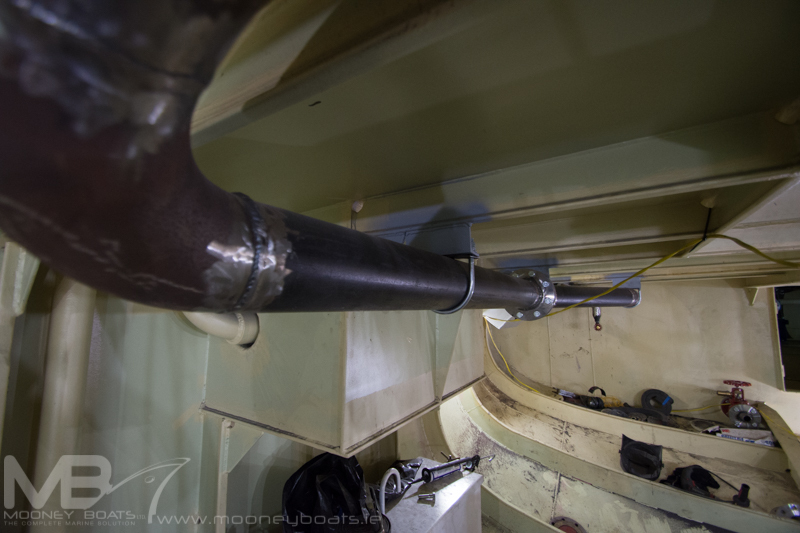 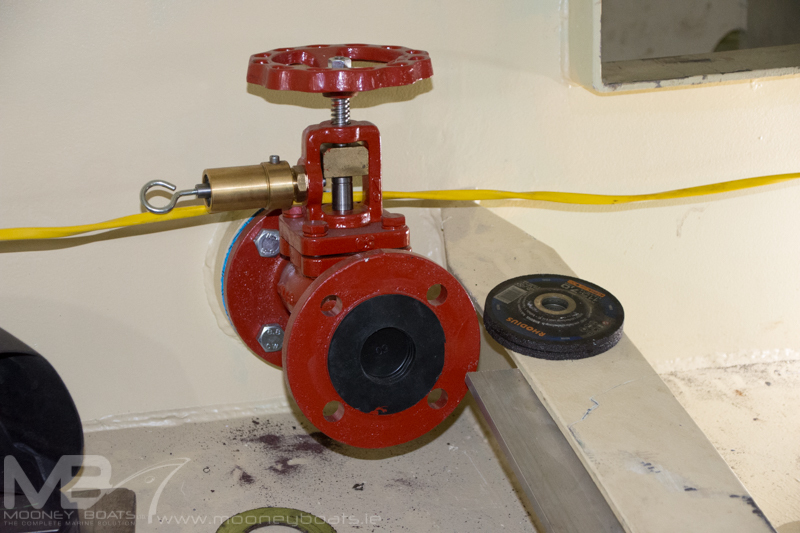 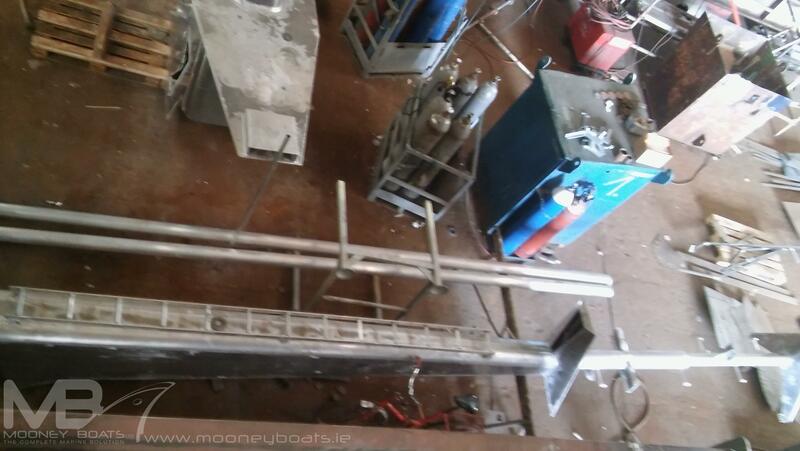 The tail shaft and stern tube are machined and manufactured by the Padmos Shipyard in the Netherlands. 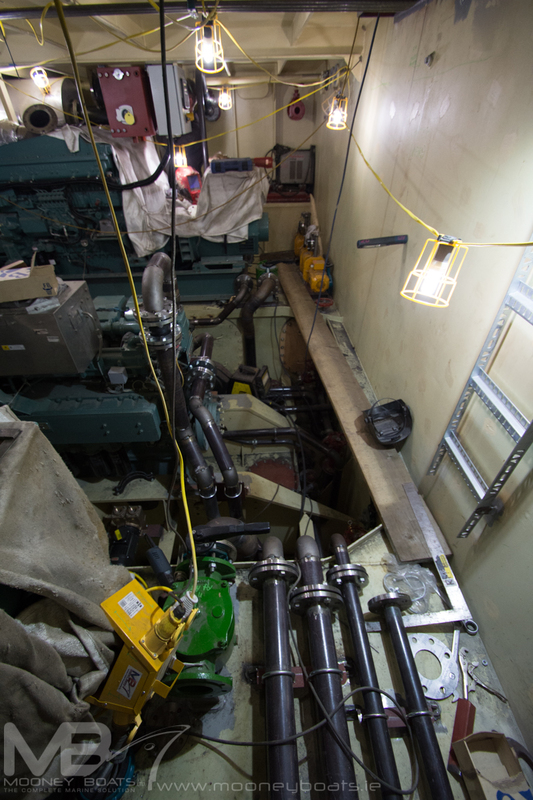 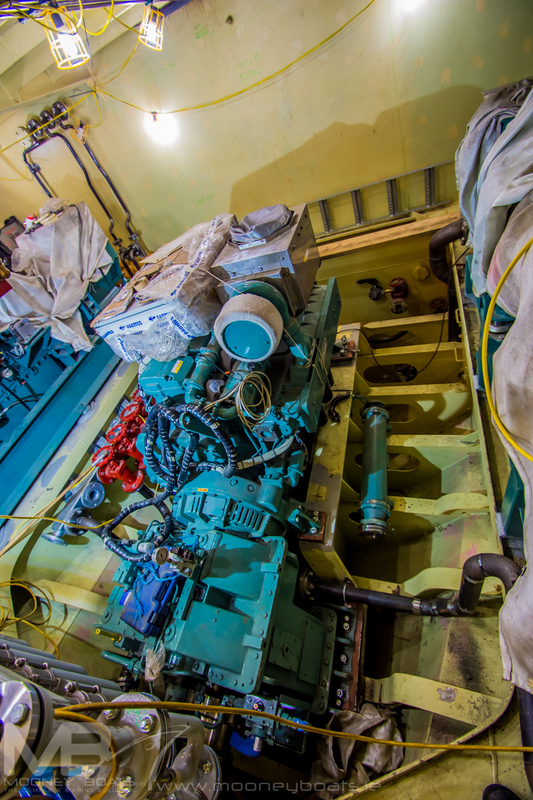 The hydraulics engine is a Mitsubishi S6B3_T2MPPTK-3 delivering 335kW@1500rpm with a 120kva Stamford Generator on the front end on the front end and a Technodrive gearbox for three 90kW hydraulic pumps by a 14” air flex coupling. 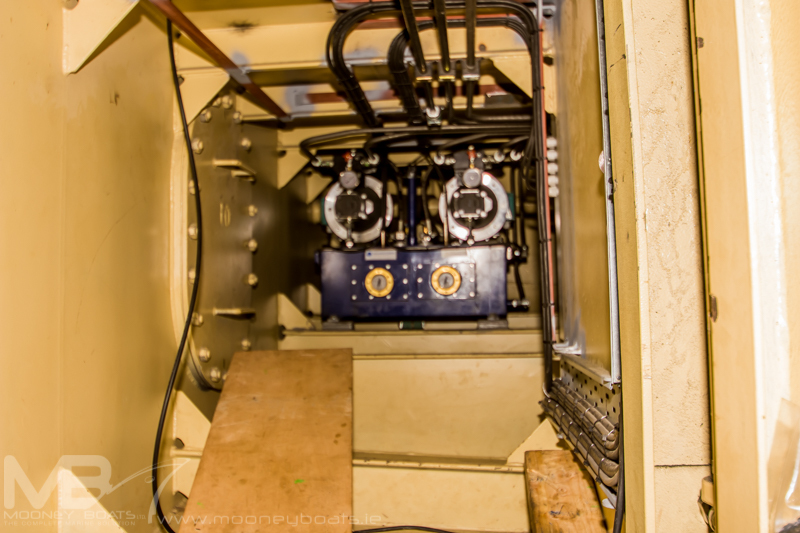 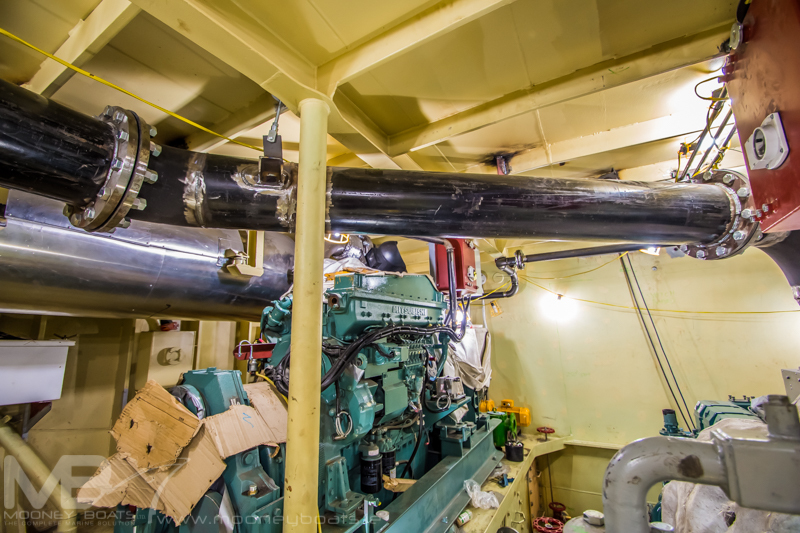 There is also a six-cylinder Mitsubishi 6D16-T 120kva Stamford Generator as a second auxiliary with a Mitsubishi S4S 30kva (air-cooled based),which will be used as the harbour set. 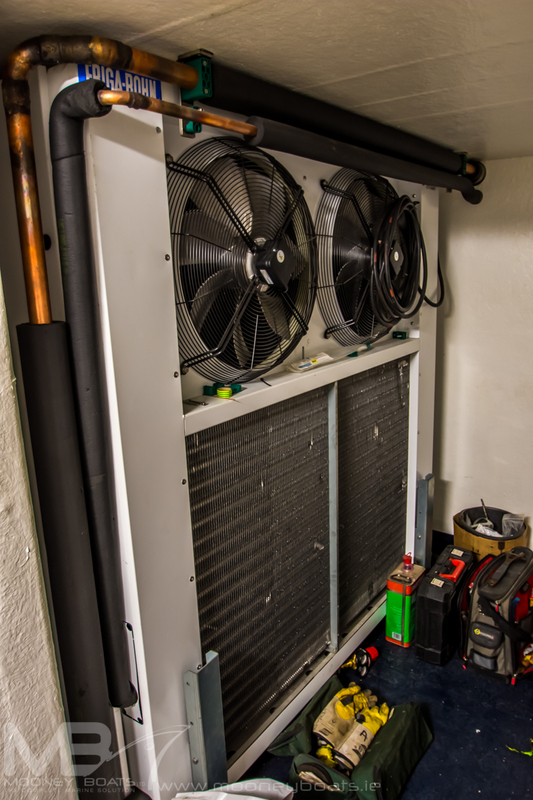 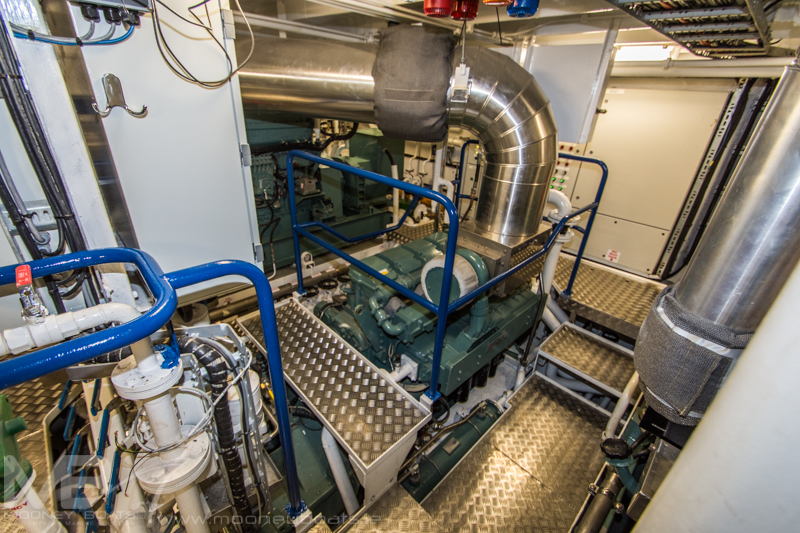 The main engine and hydraulic set are both cooled by Blokland double (LT-HT system) box coolers. 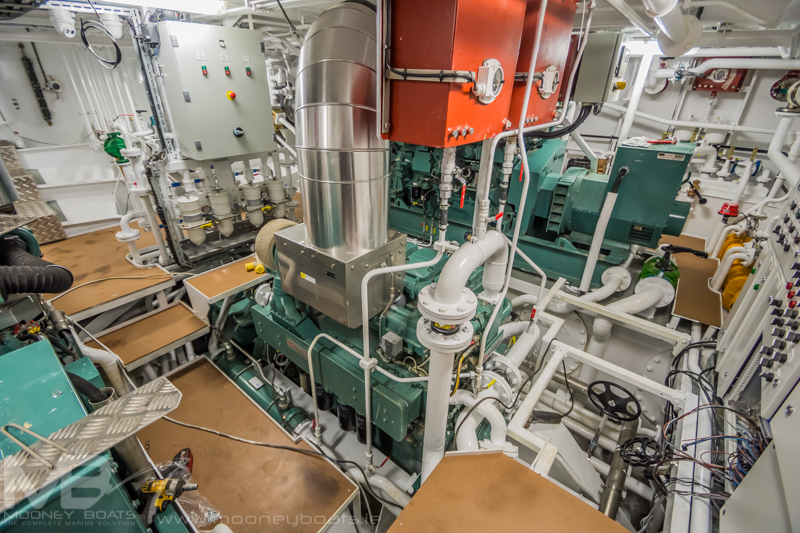 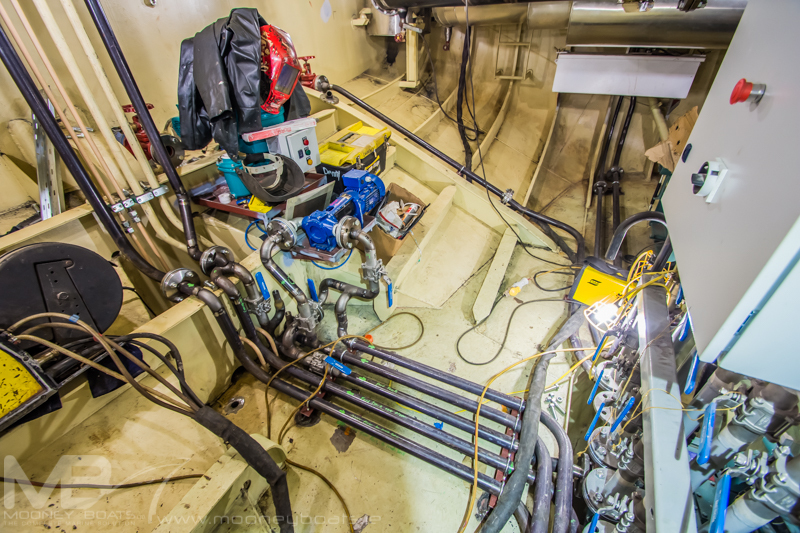 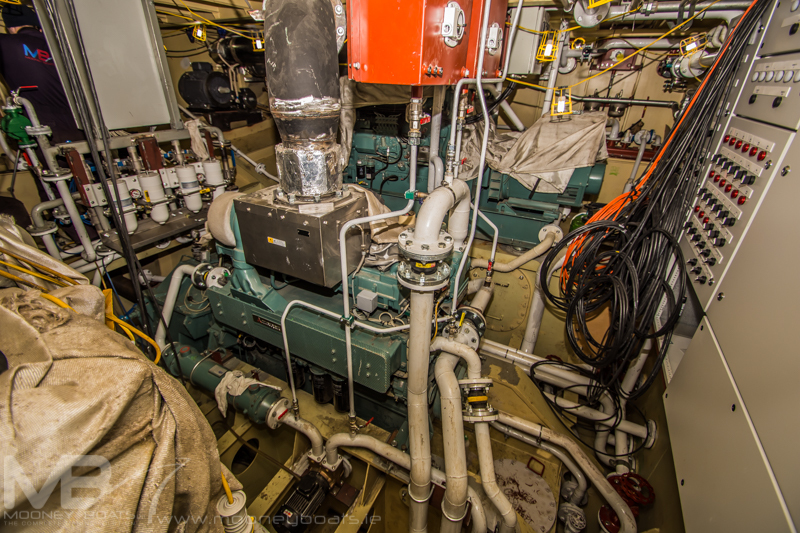 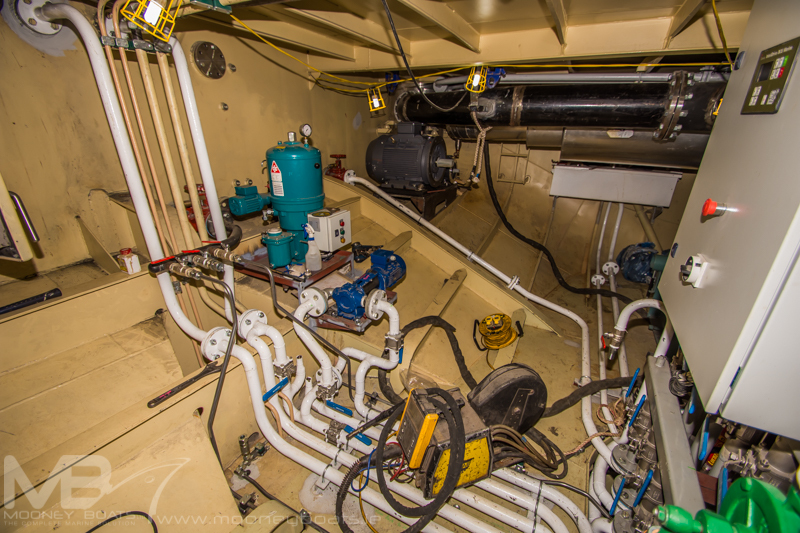 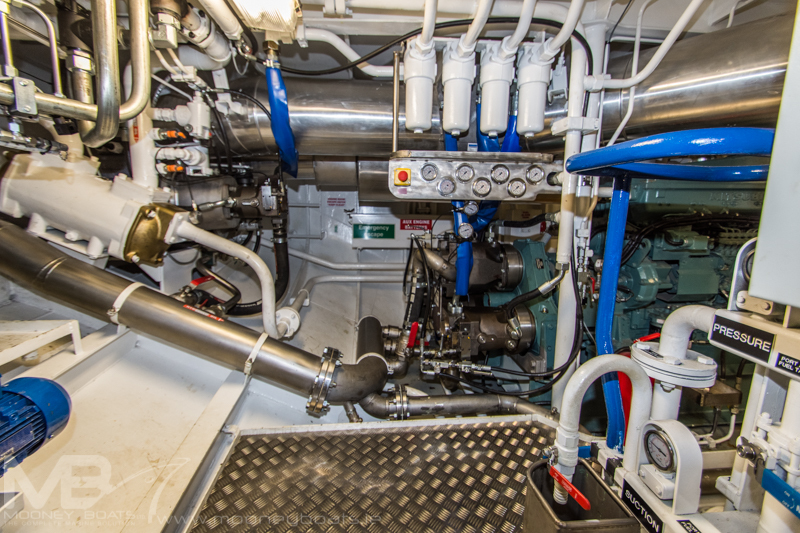 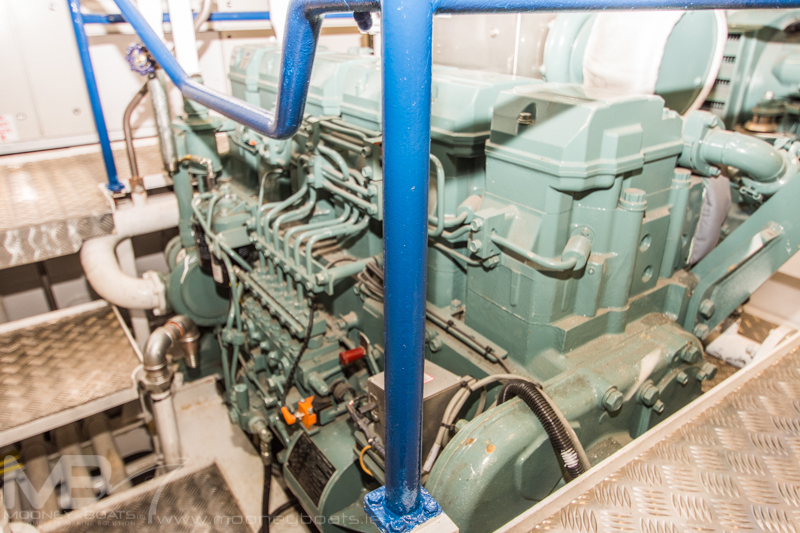 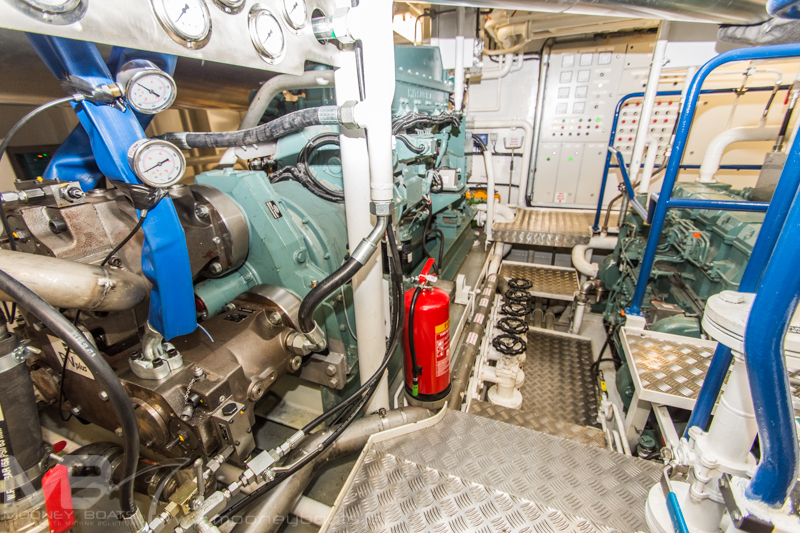 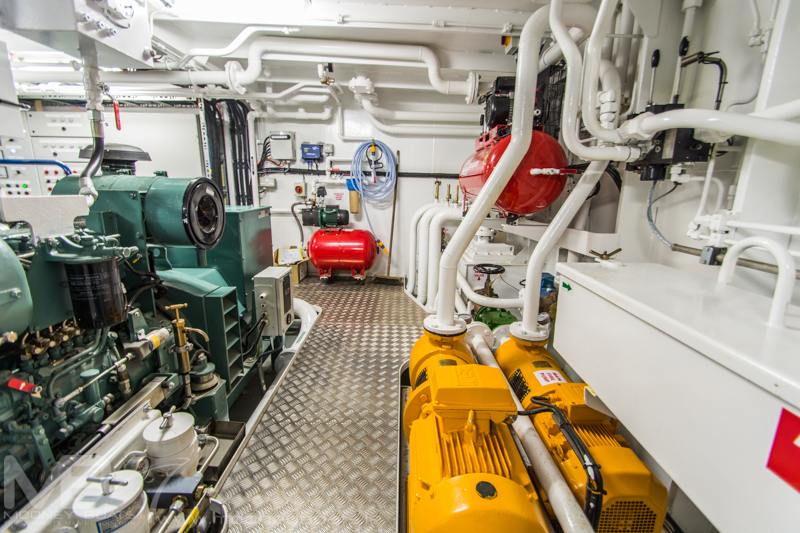 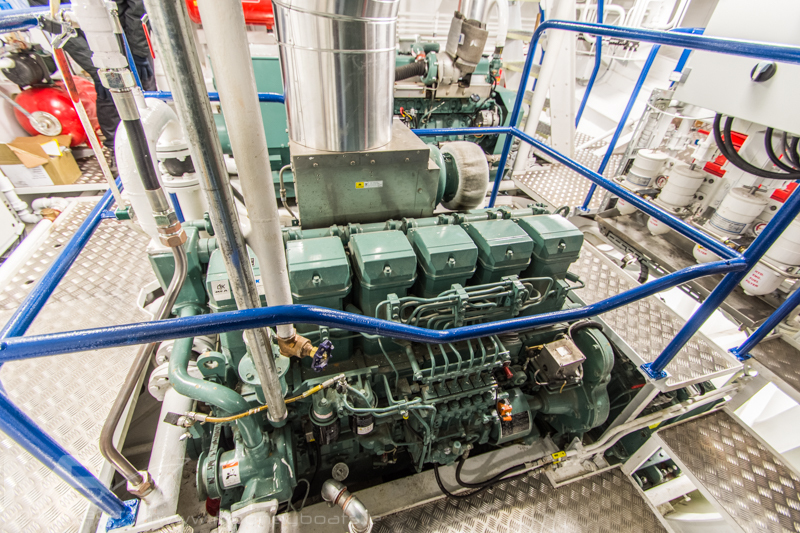 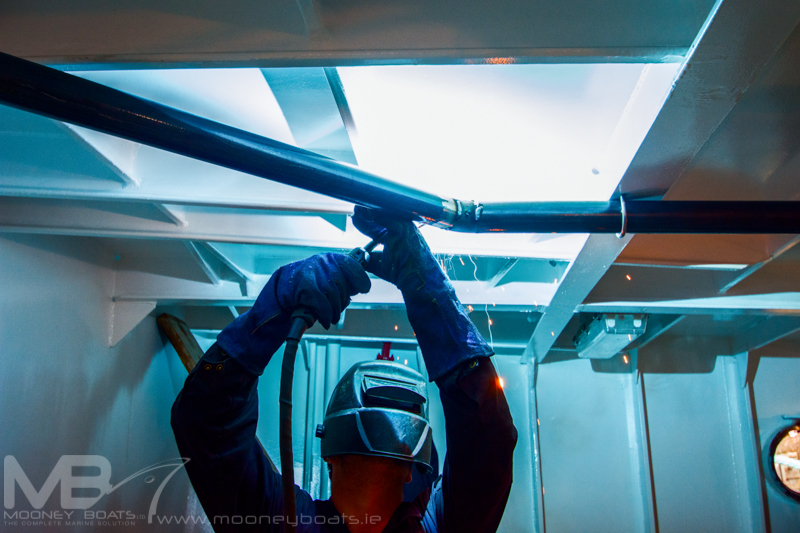 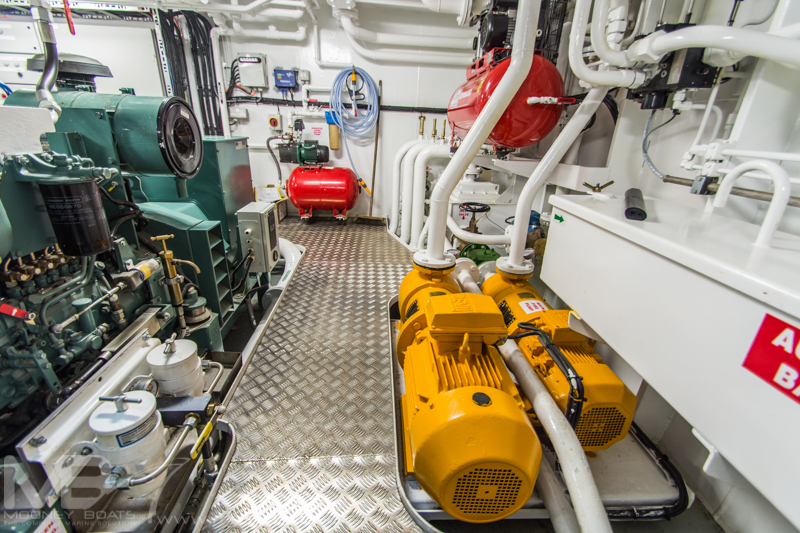 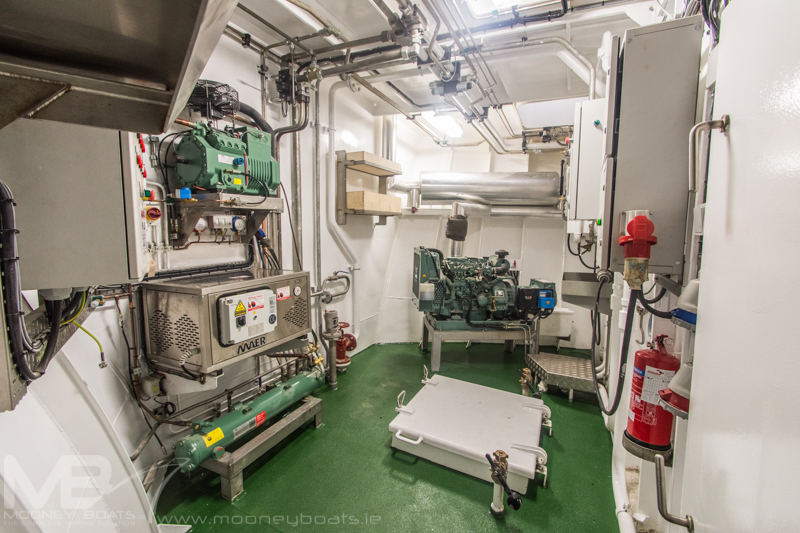 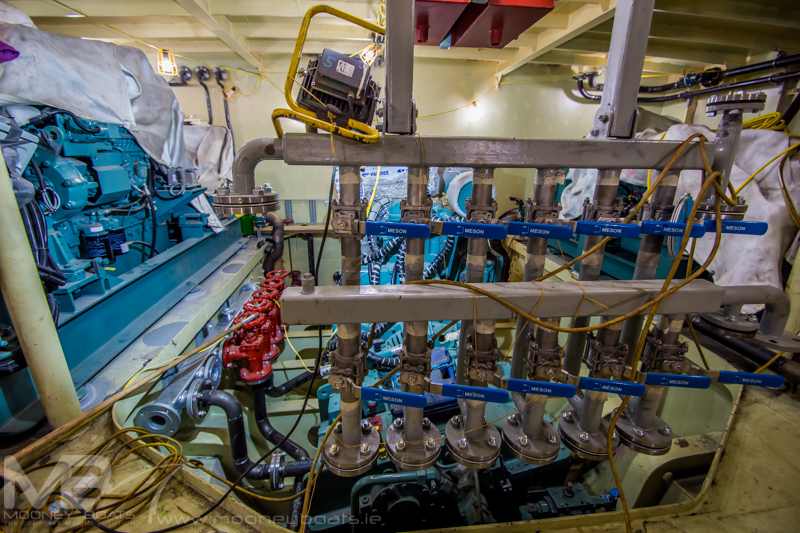 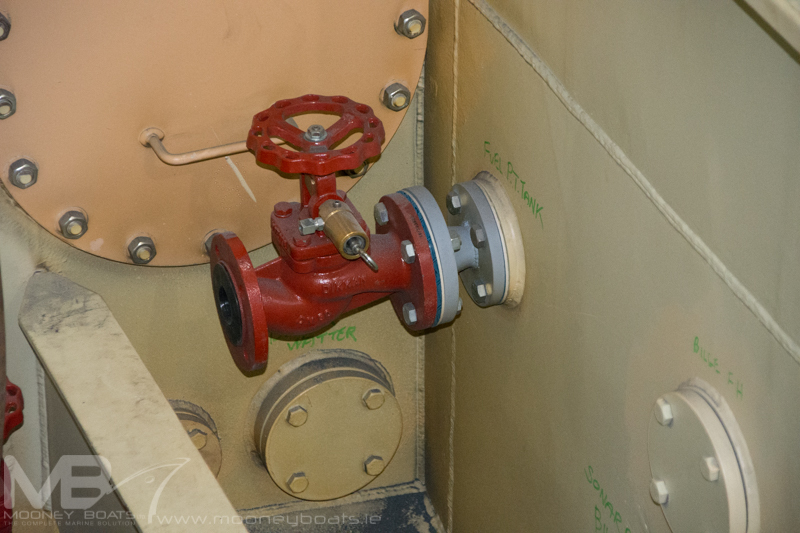 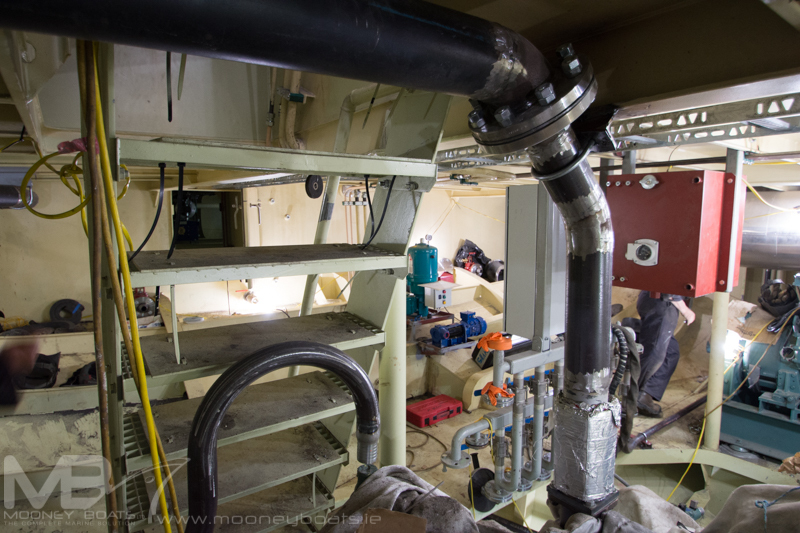 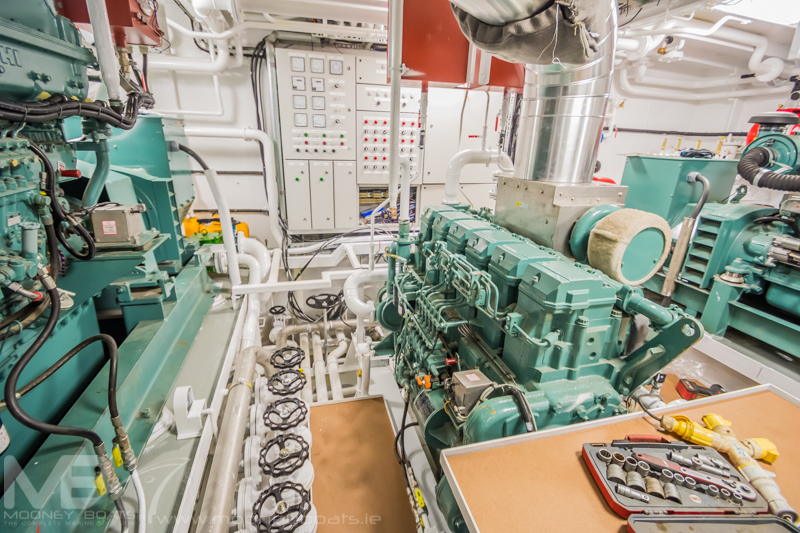 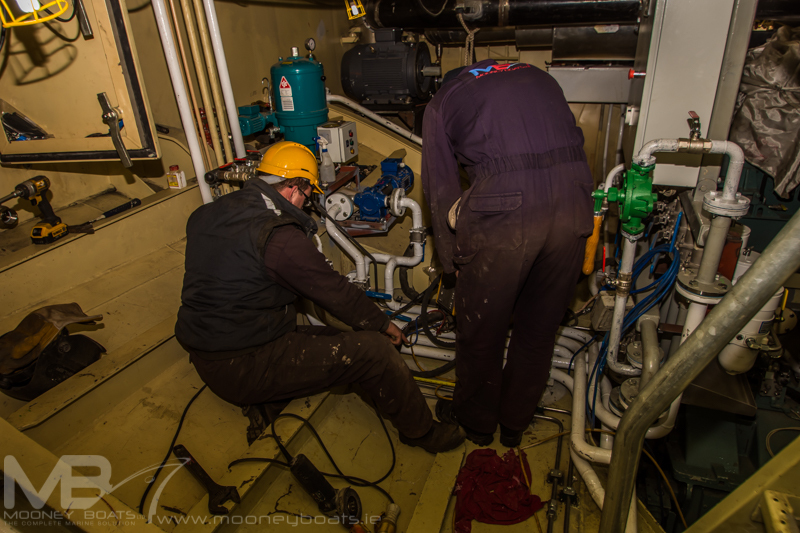 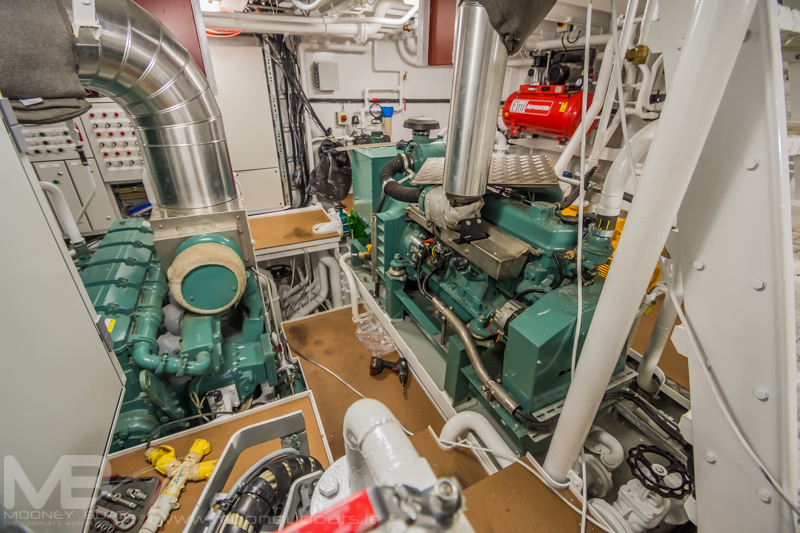 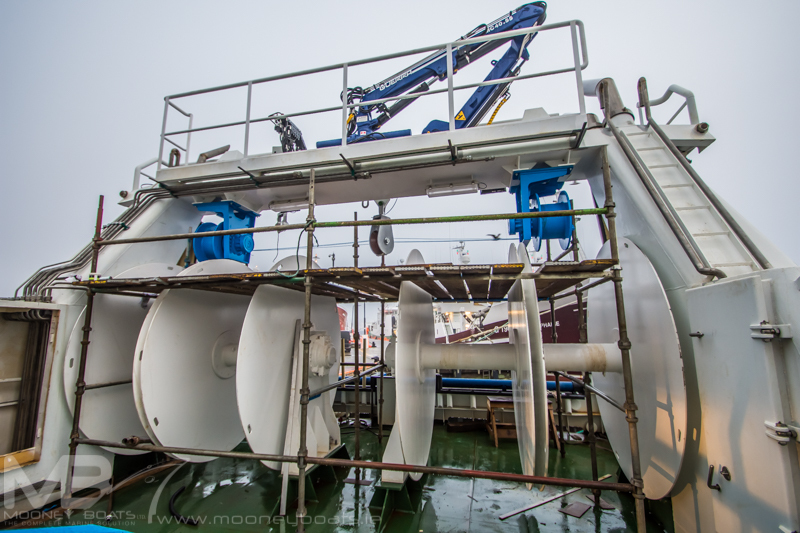 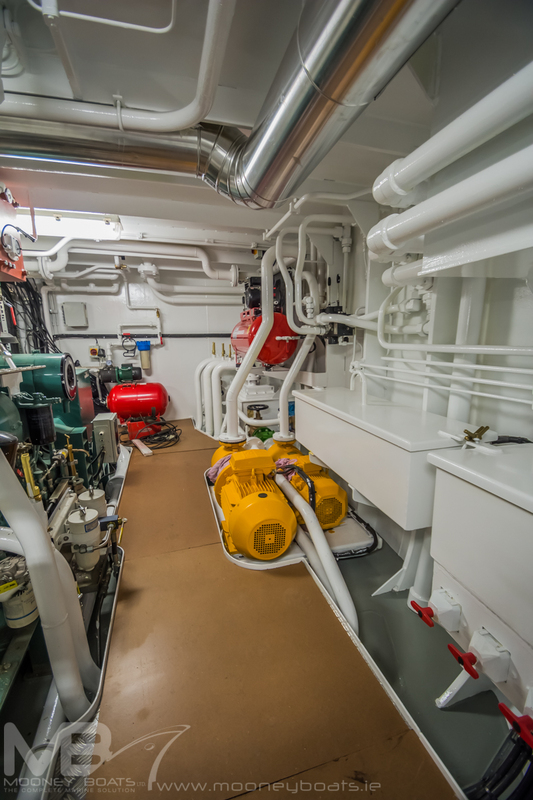 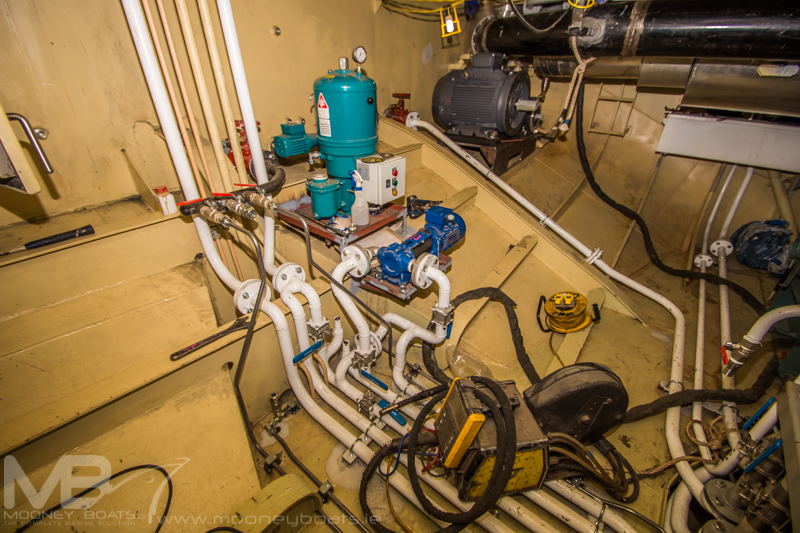 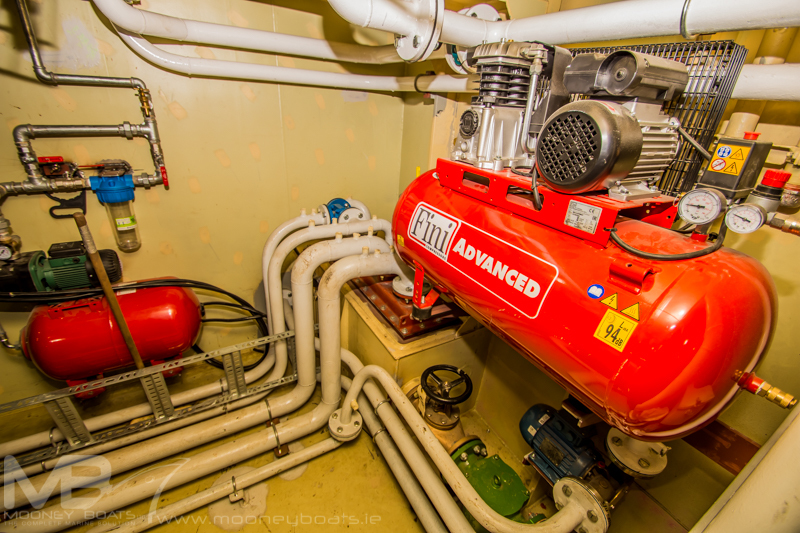 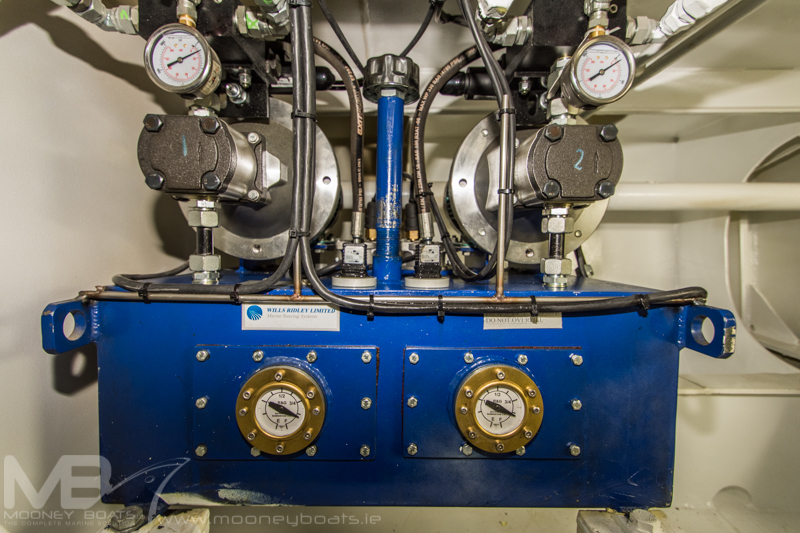 Mooney Boats Ltd engineers supplied and installed the complete engine package and piping system on the vessel. 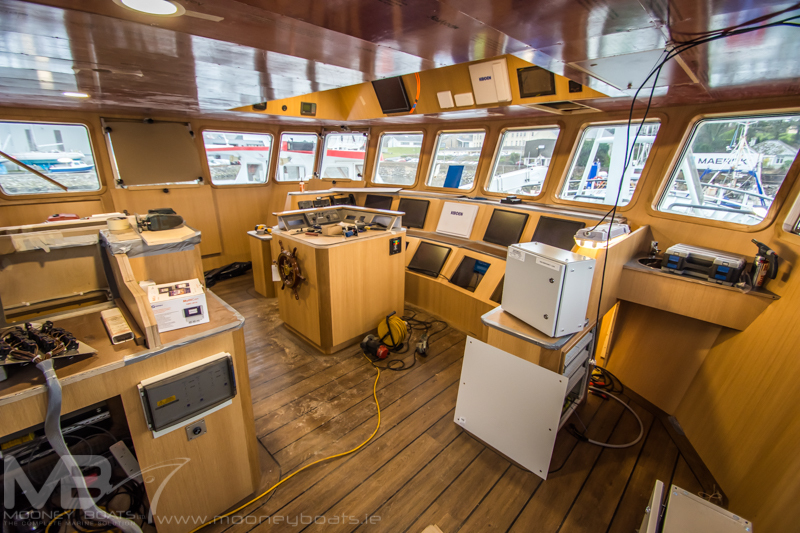 SIMEX Temperature Logging System with Realtime Temperature Readout in Wheelhouse for Hold, Cold Room, Blast Room & Blast Room Product. 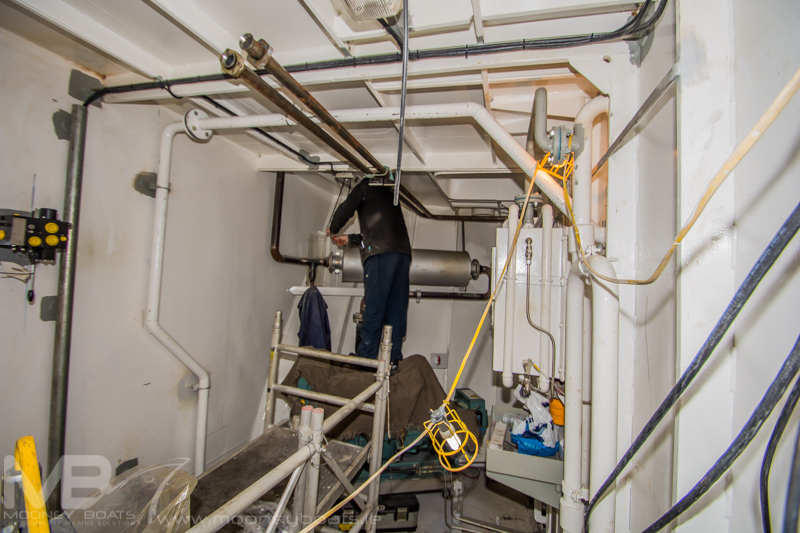 “Man in Hold” Alarm in Cold Store. 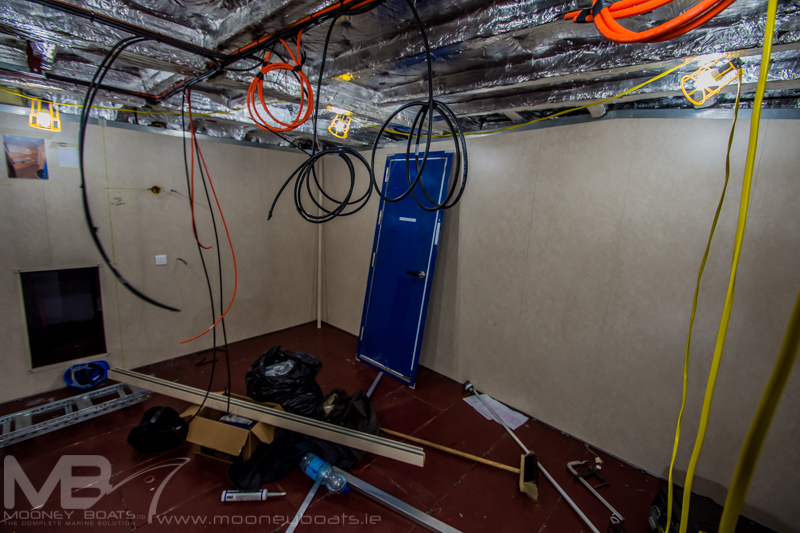 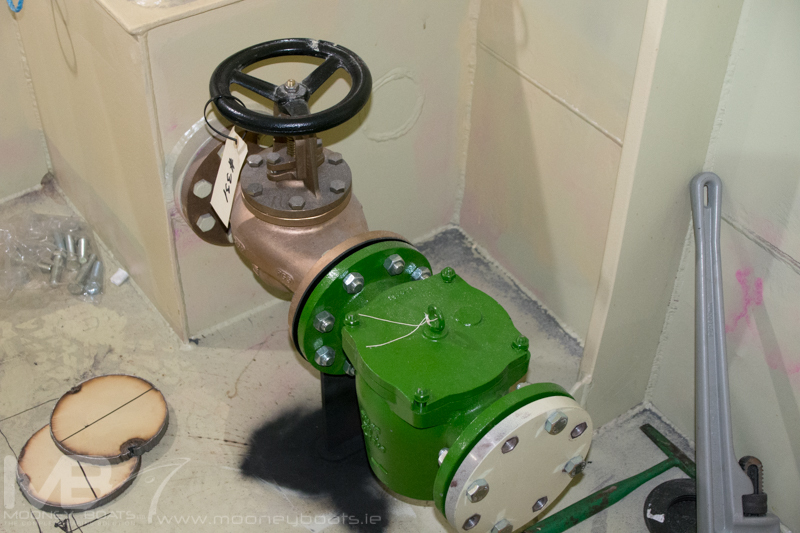 All necessary pipework, insulation and cabling were installed. 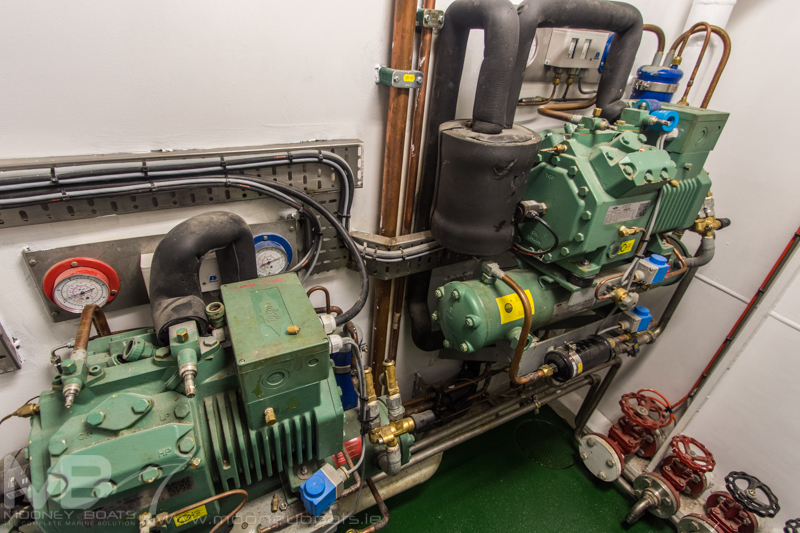 A new master refrigeration control panel was designed and built in house at KER’s Workshop and installed to control all the refrigeration systems. 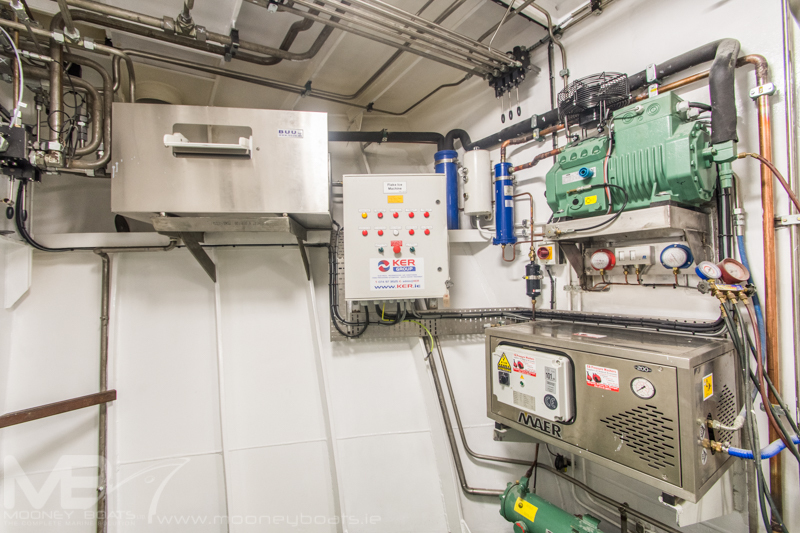 A new BUUS Flake Ice machine with Bitzer condensing unit was installed to deliver Flake Ice to the storage area in the Hold directly below. 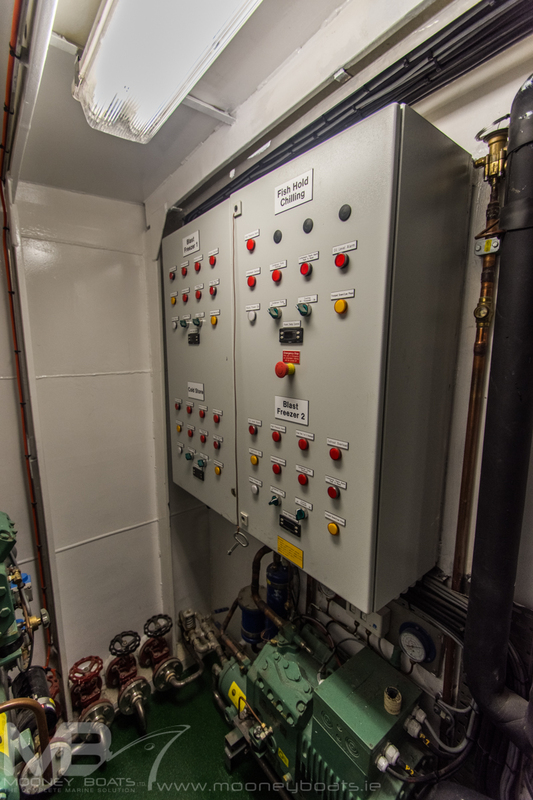 This was supplied with its own control panel and Gas alarm. 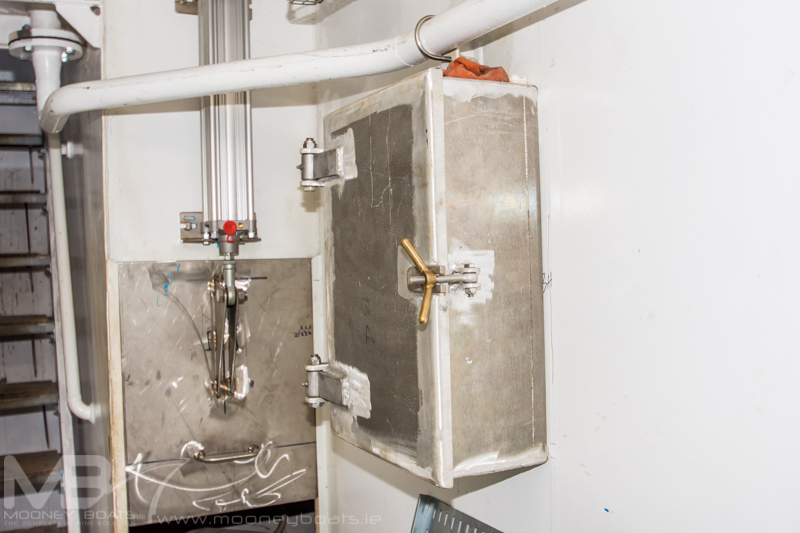 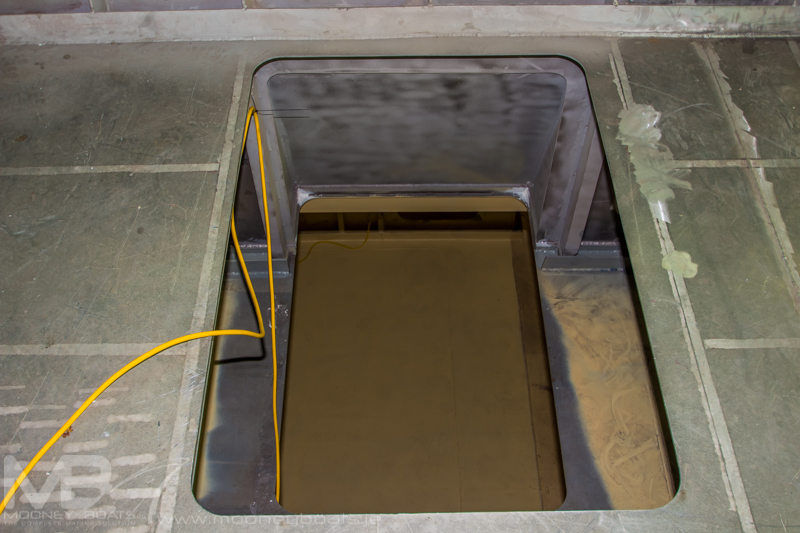 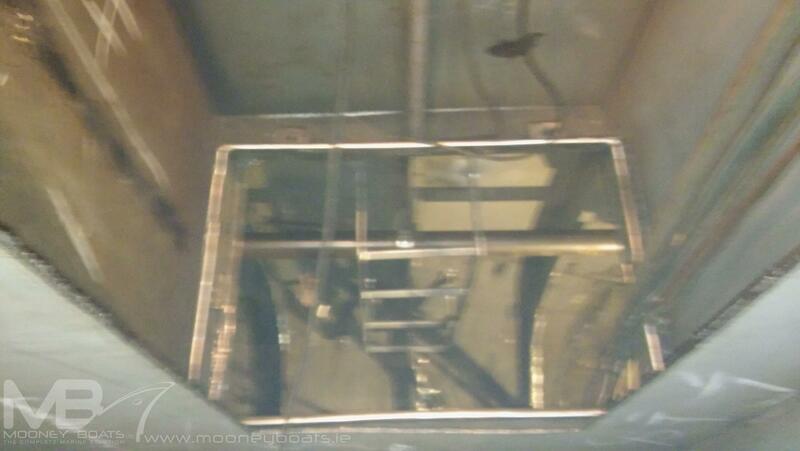 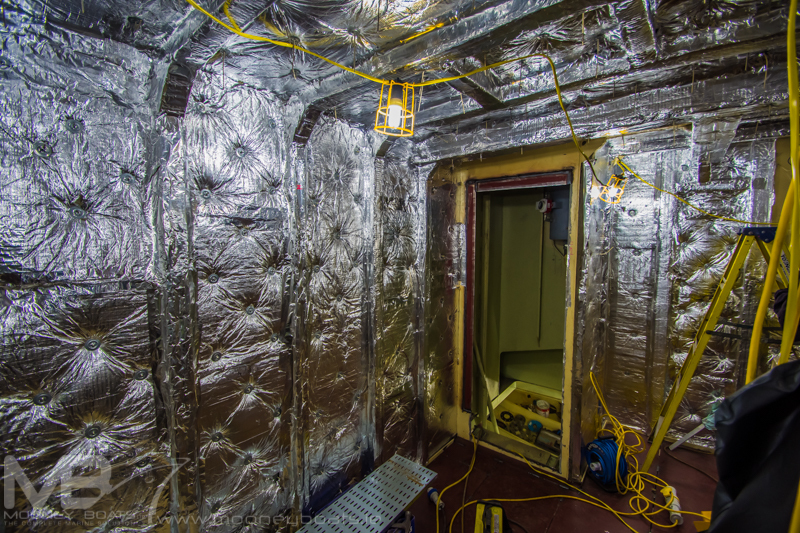 With the use of KER’s new Plastic Welding Equipment a custom Ice Chute was constructed. 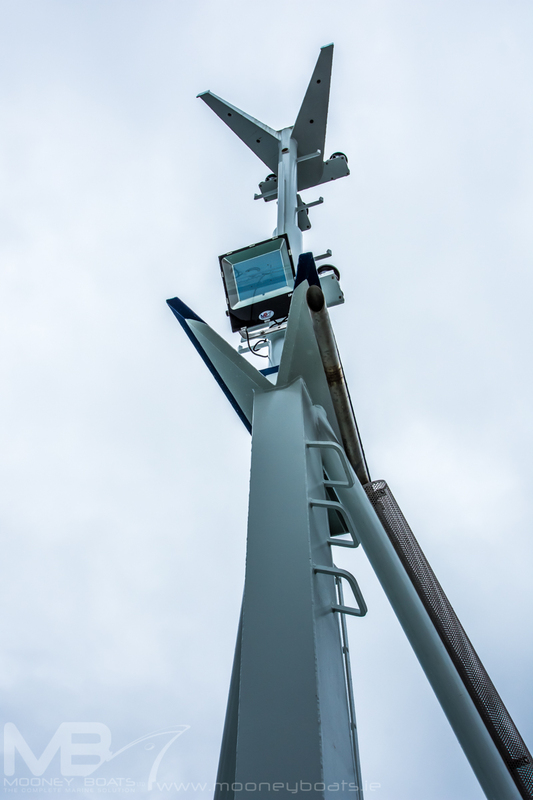 This has a clear vision panel to allow the operator to see the quality and quantity of Ice being delivered to the hold below. 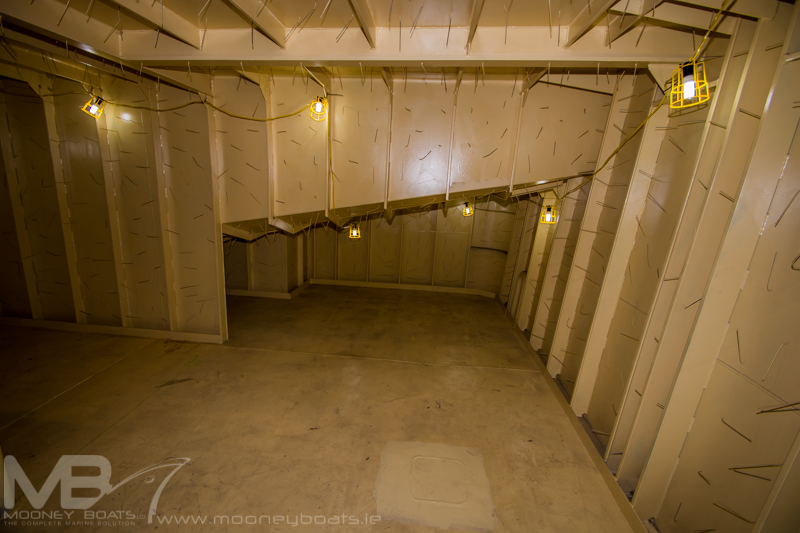 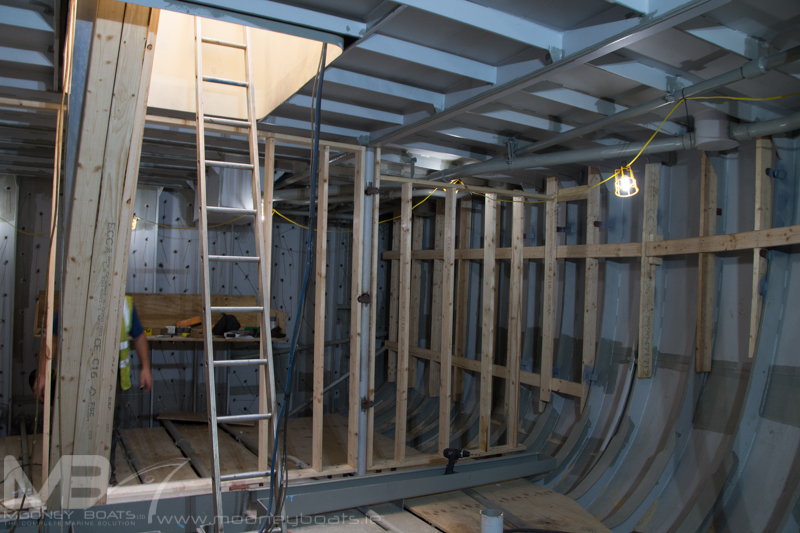 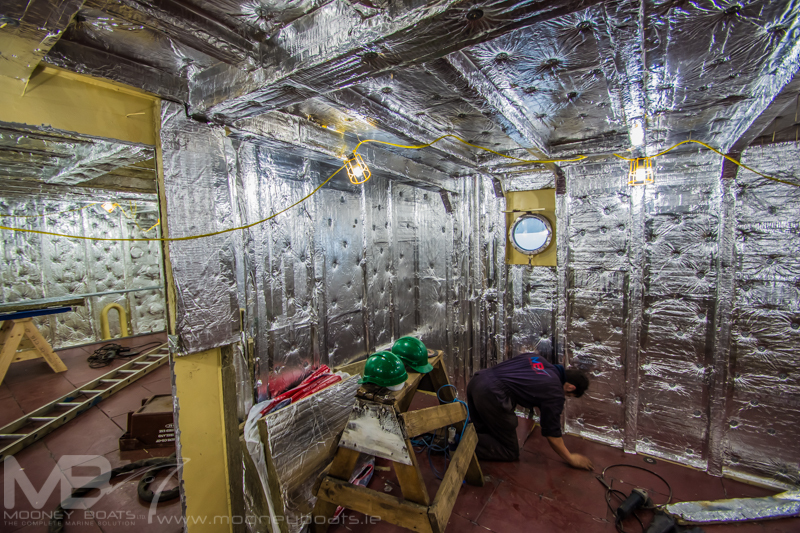 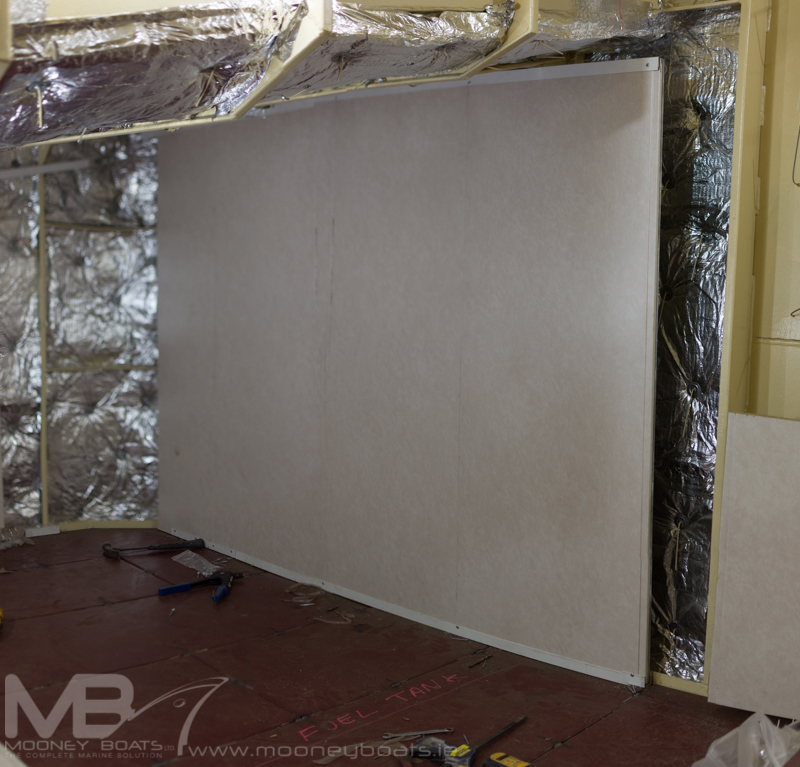 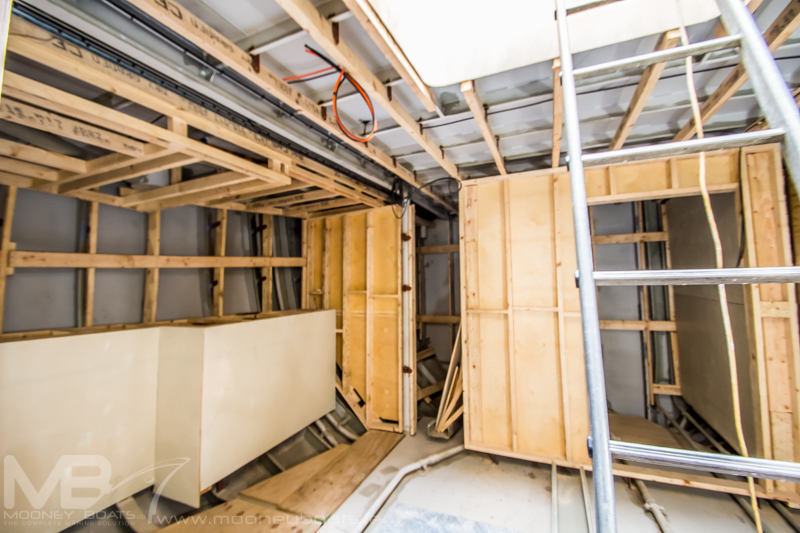 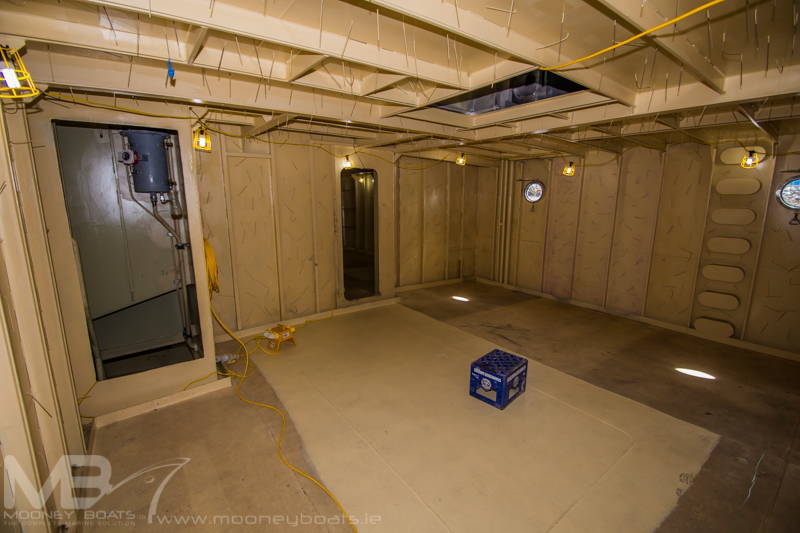 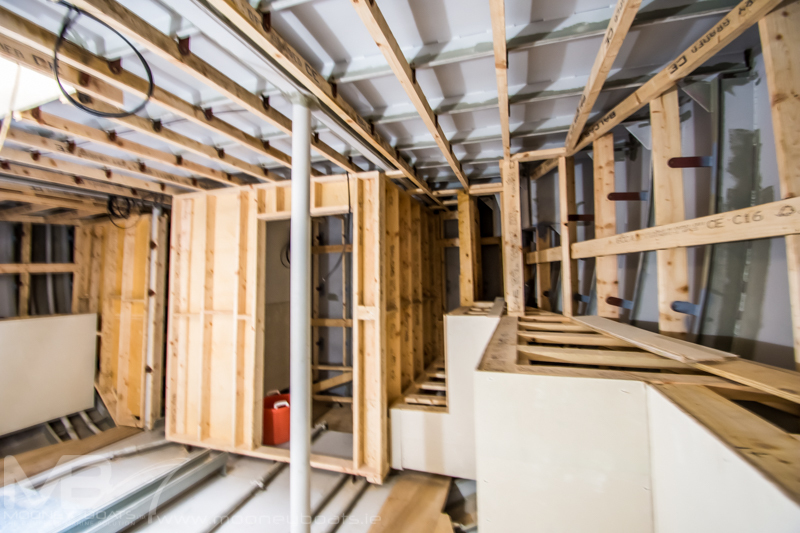 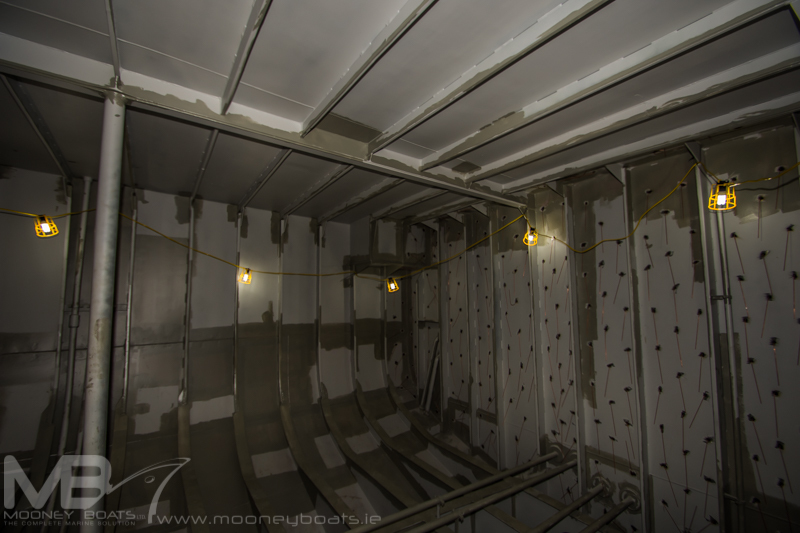 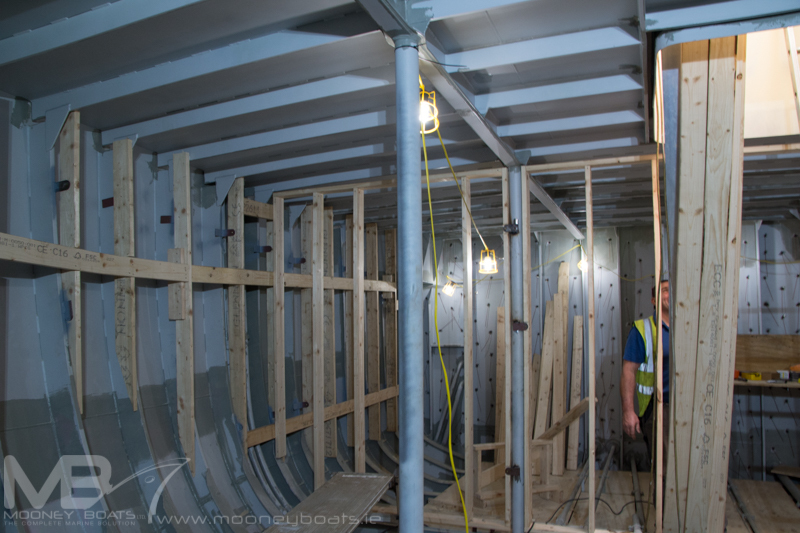 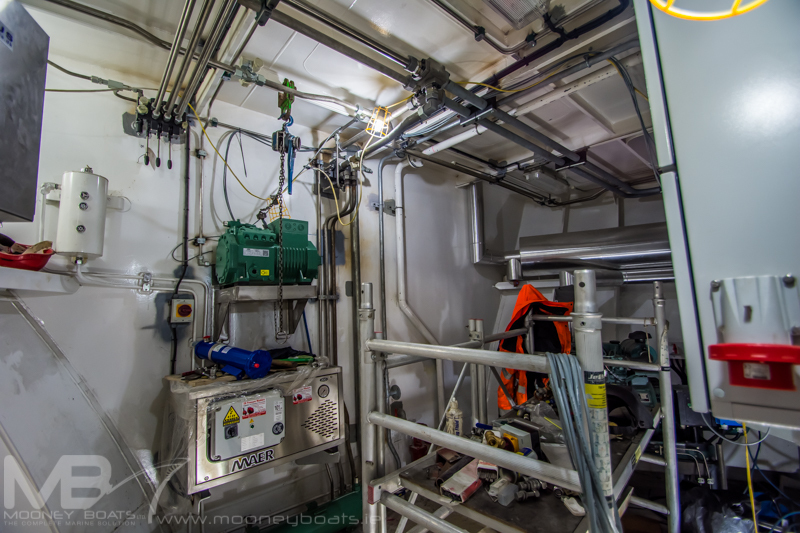 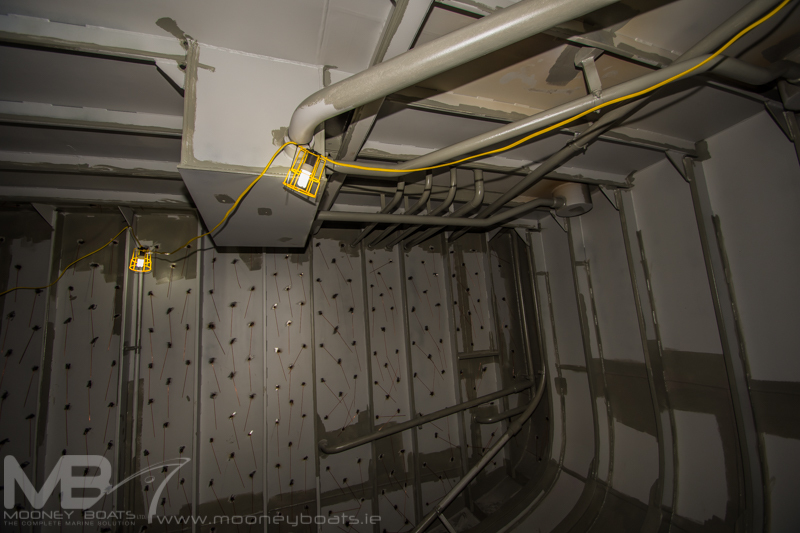 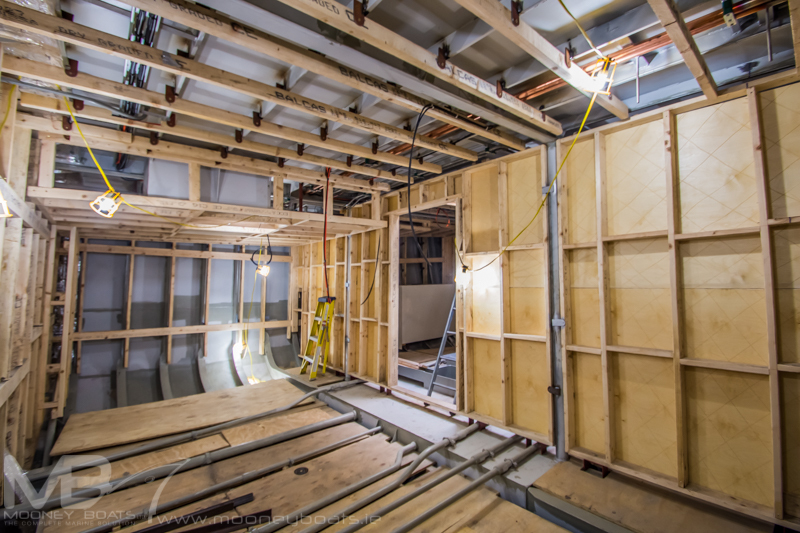 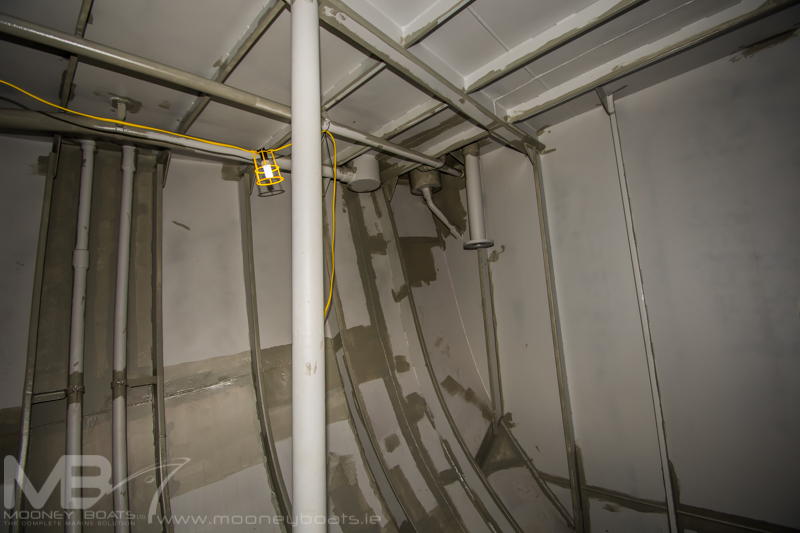 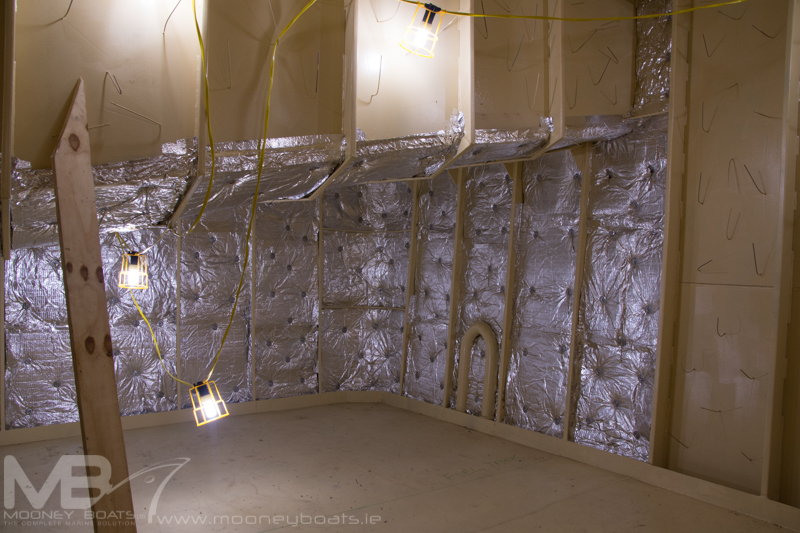 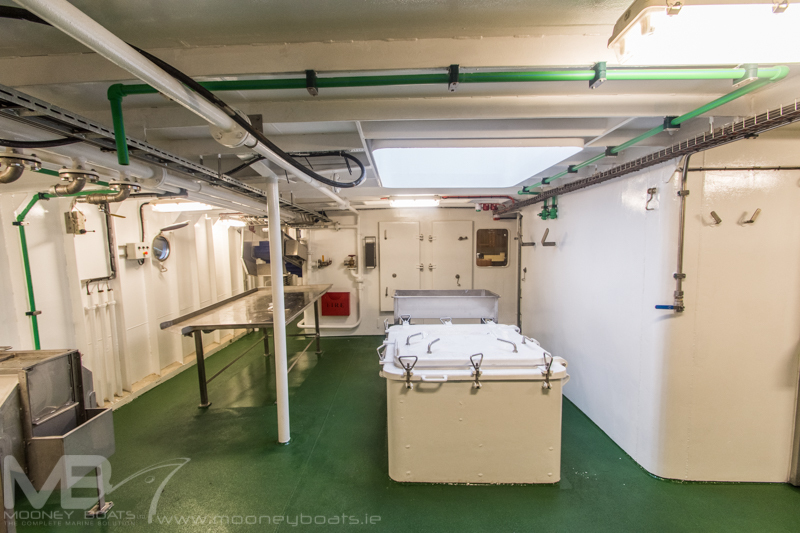 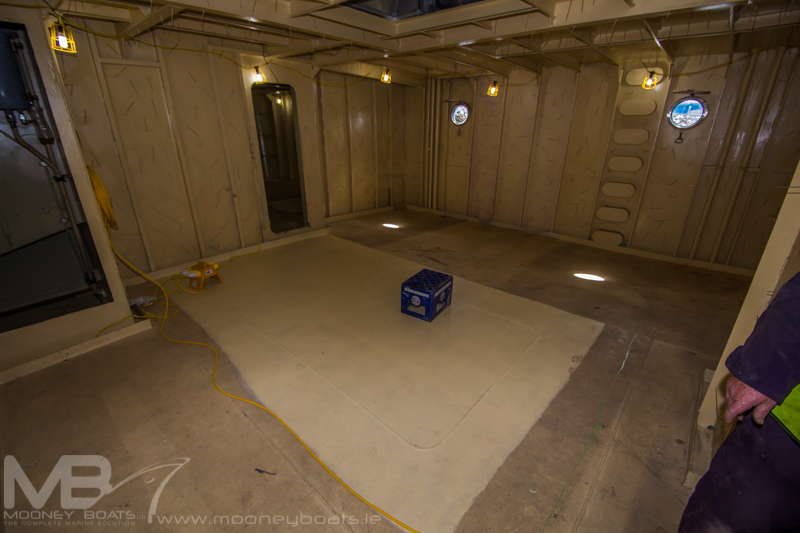 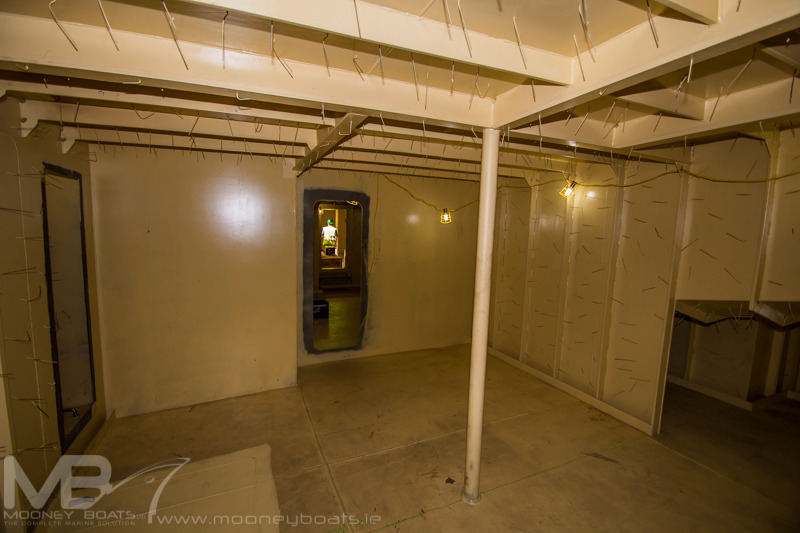 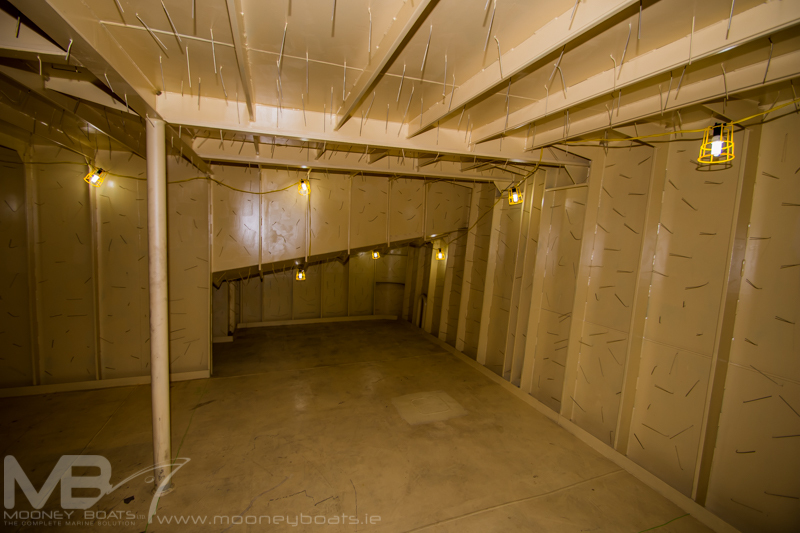 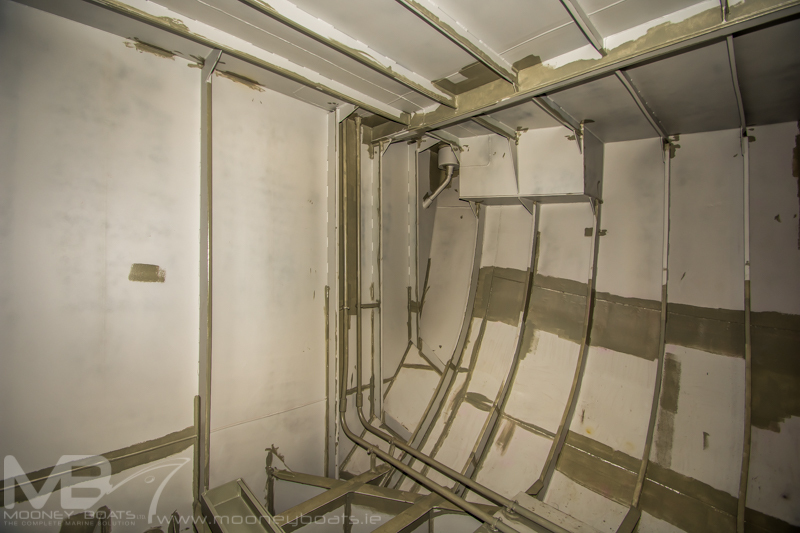 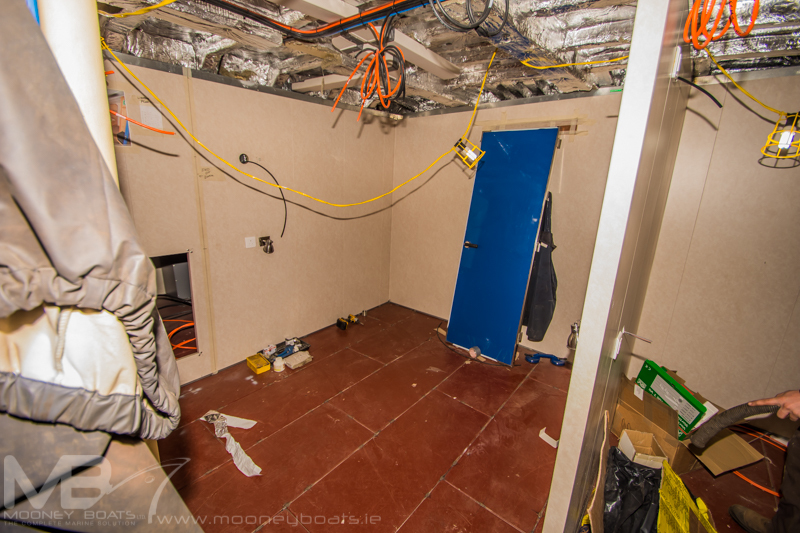 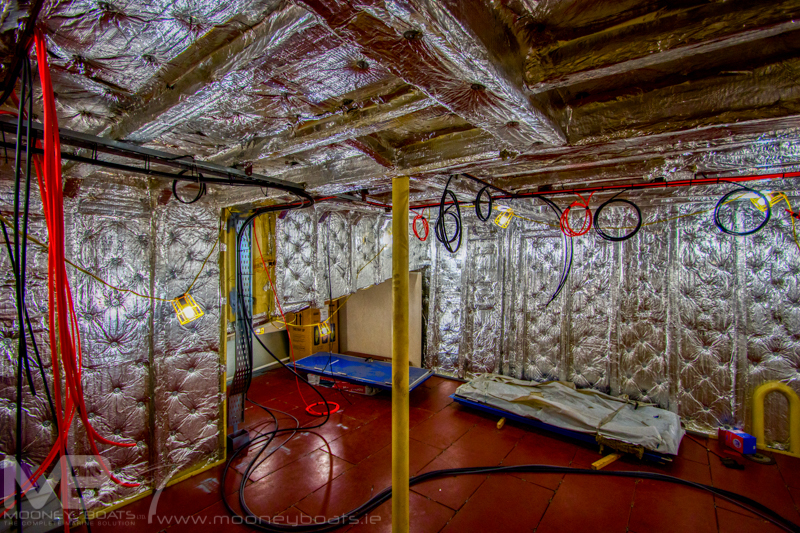 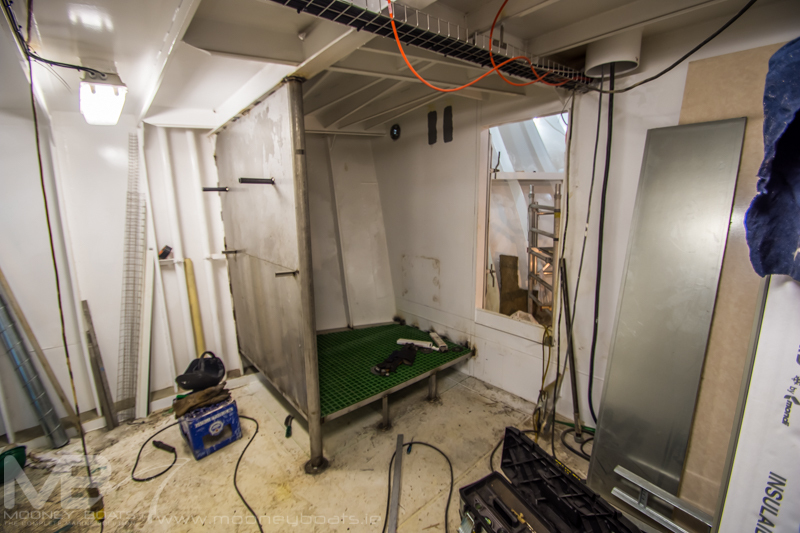 Fish room, blast freezer and coldstore were all fitted out by Mooney Boats Ltd and are finished in white fiberglass finish and insulated with High Density closed cell foam for maximum insulation. 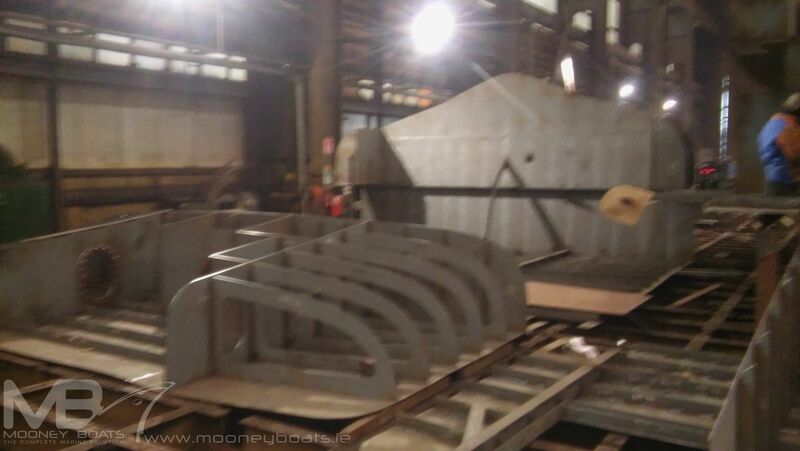 St/steel picking bench at conveyor 1.1m x 2.9m(316 grade) . 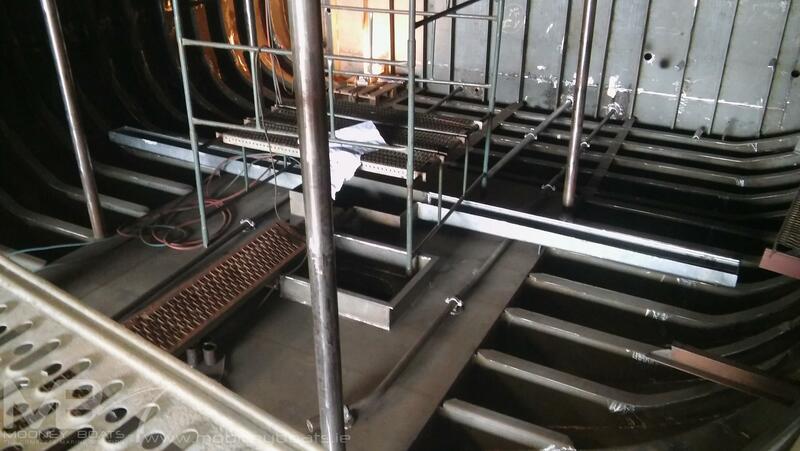 St/steel racking for blast (316 grade) . 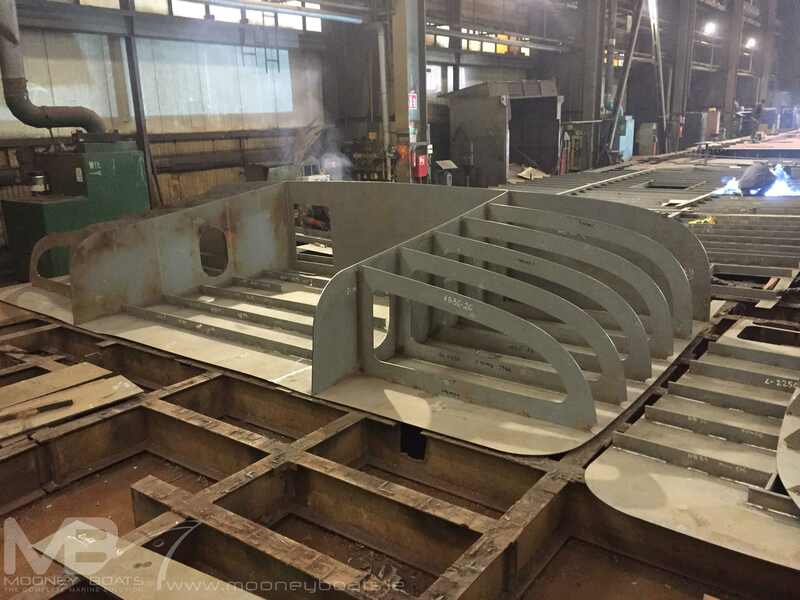 St/steel sorting bench for boxing 2.4m (316 grade) . 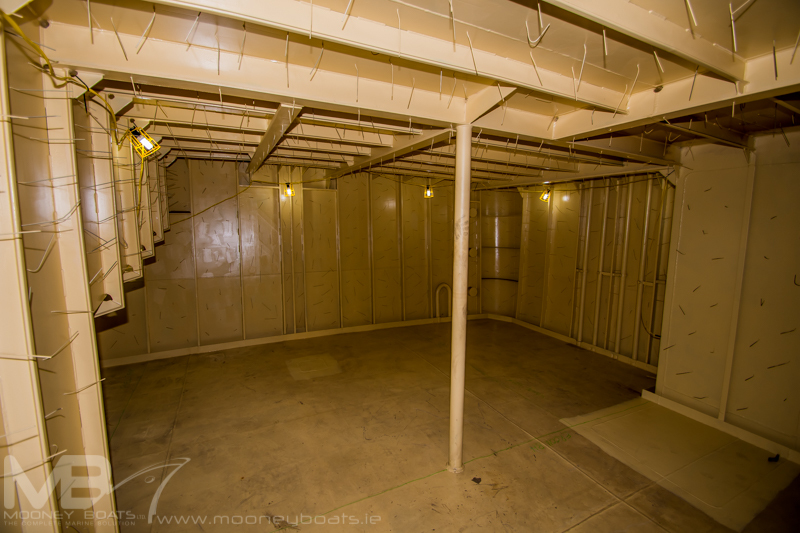 St/steel racking under boxing bench (316 grade) . 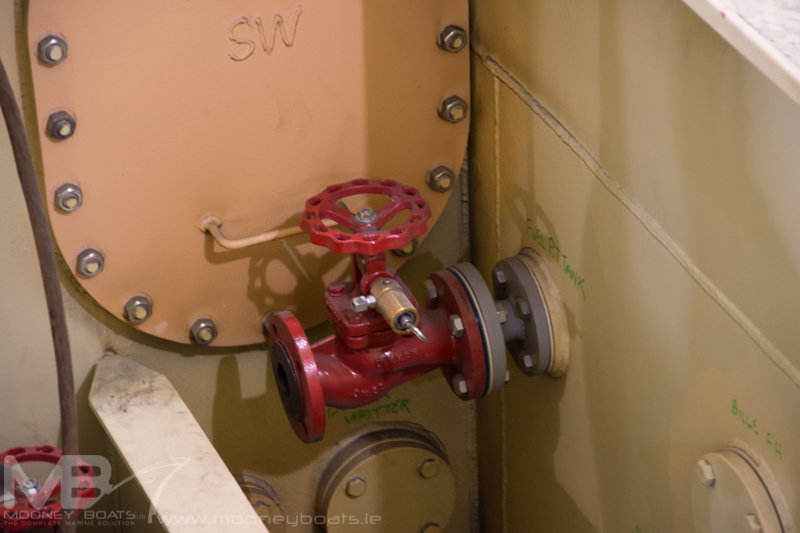 St/steel prawn washer (316 grade) . 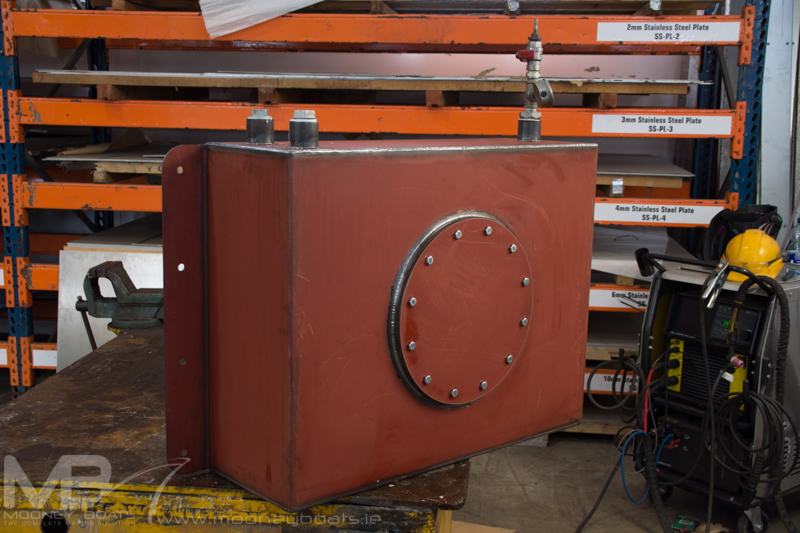 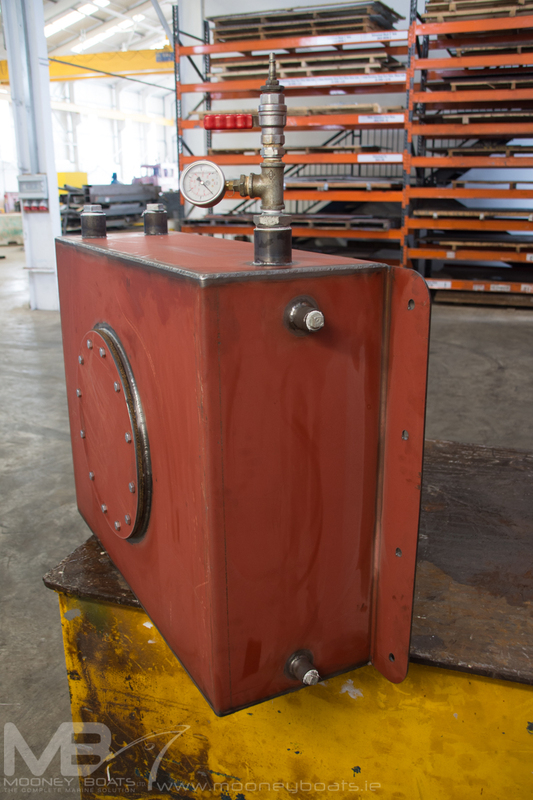 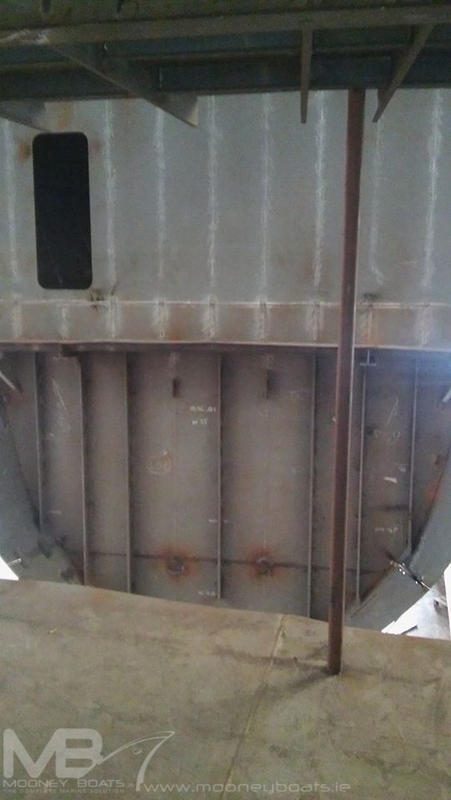 St/steel dip tank (316 grade) . 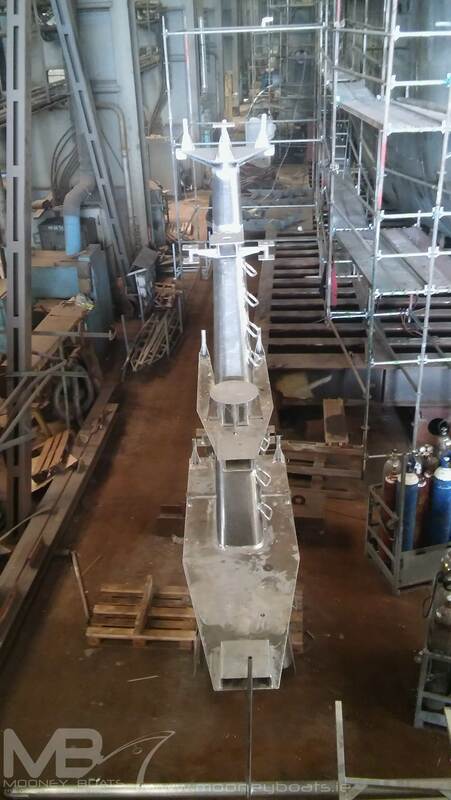 St/steel conveyor with chute (316 grade) . 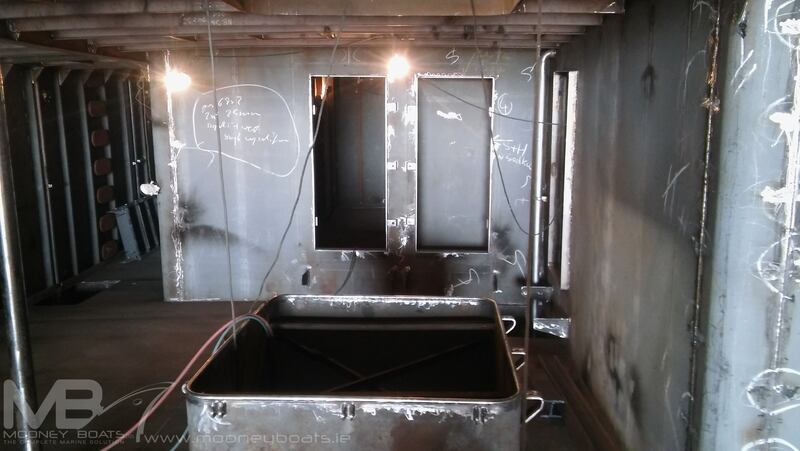 St/steel rack for empty box’s above boxing bench (316 grade) . 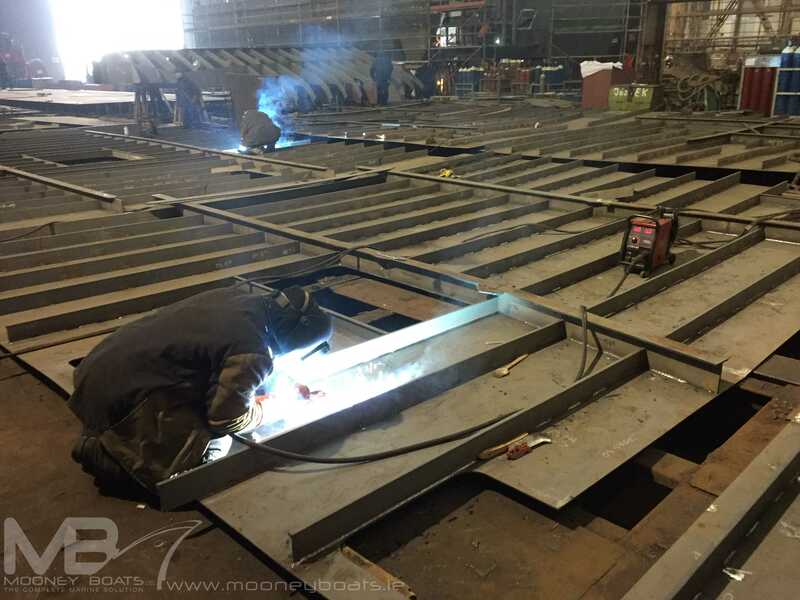 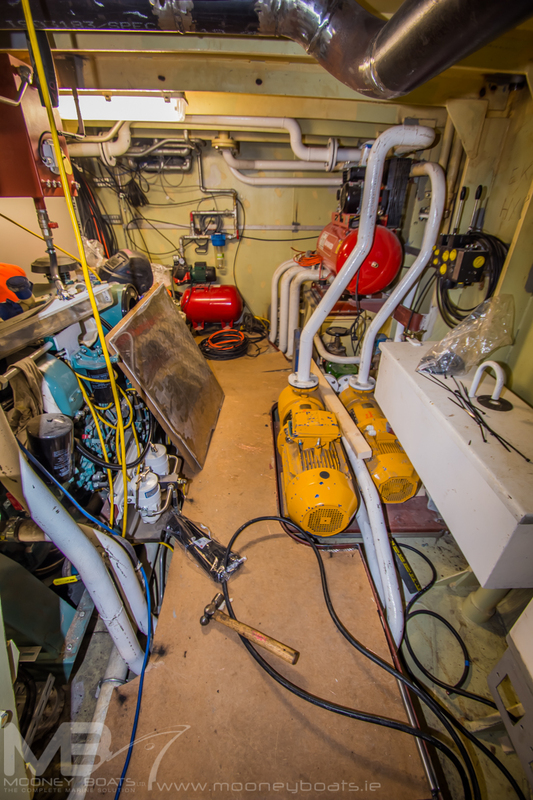 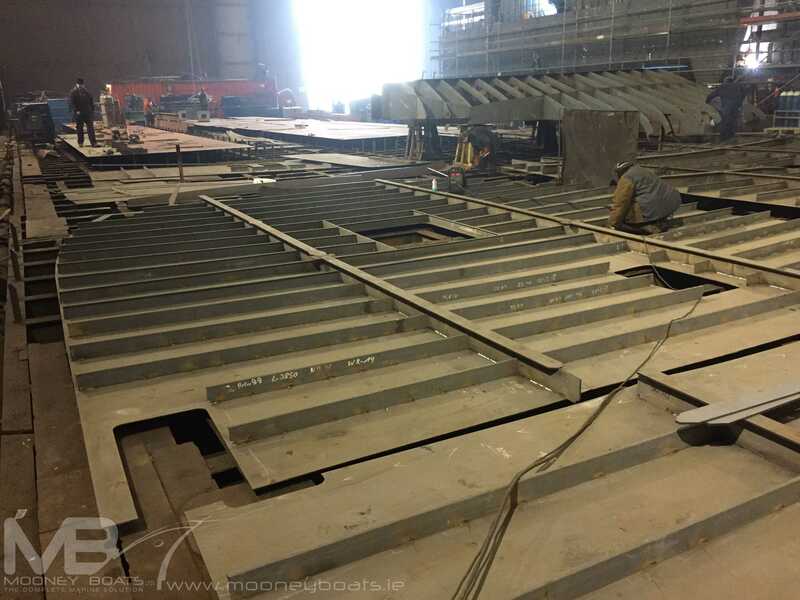 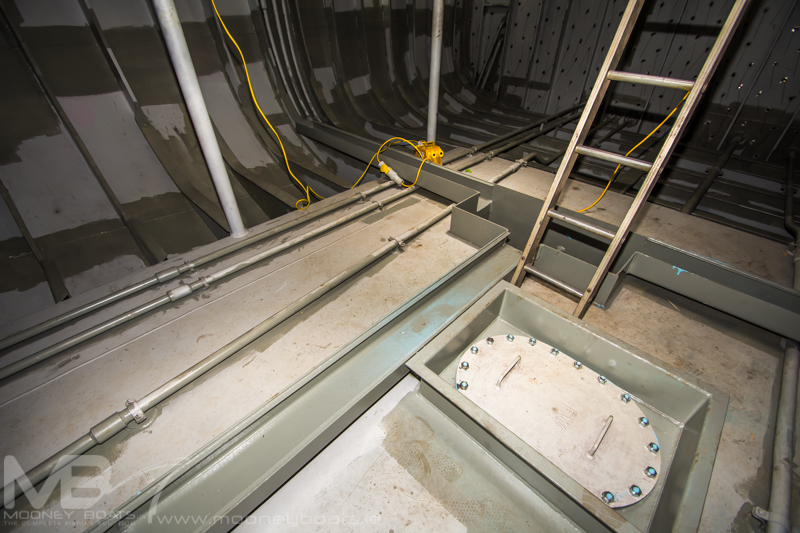 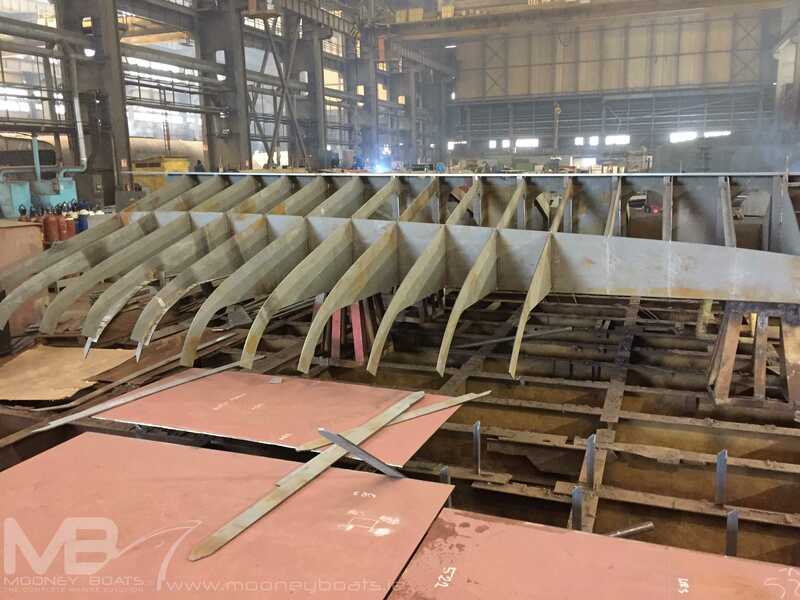 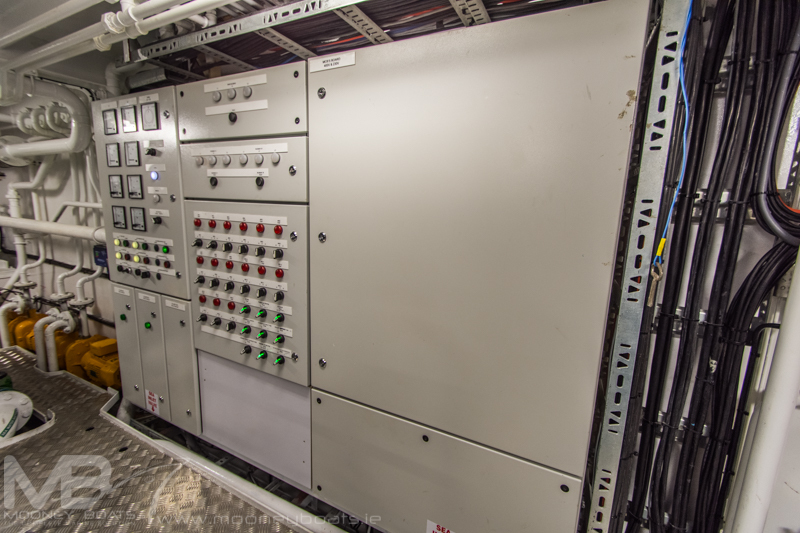 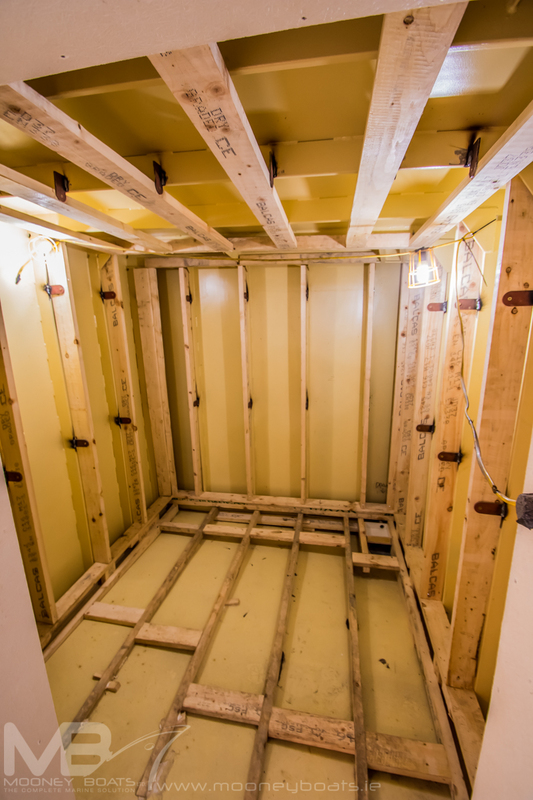 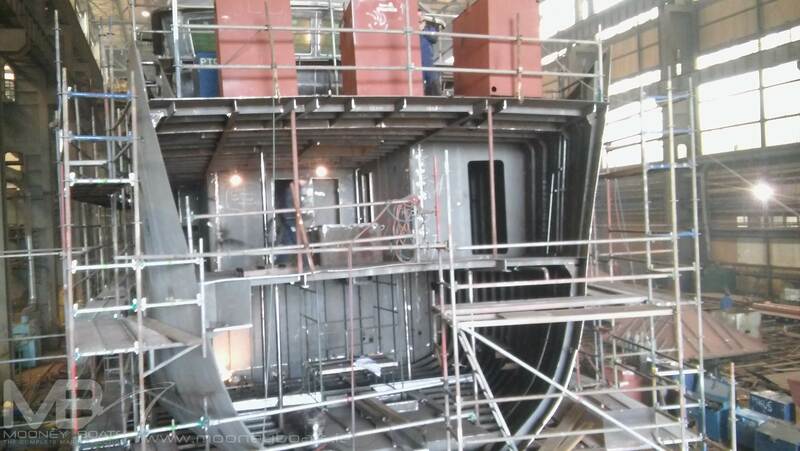 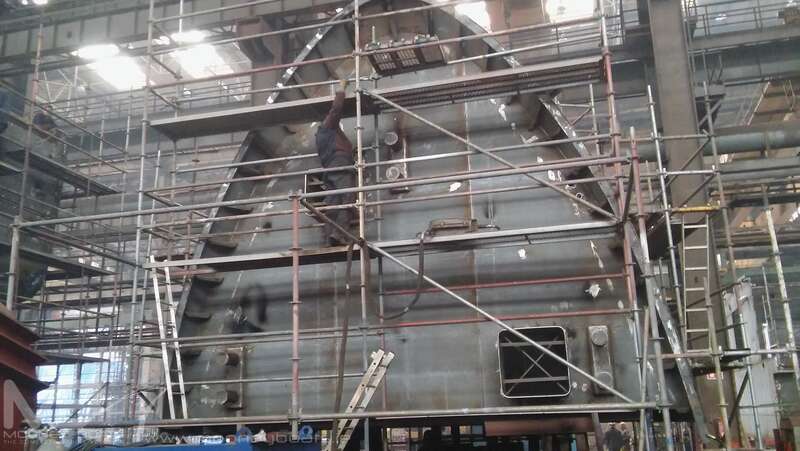 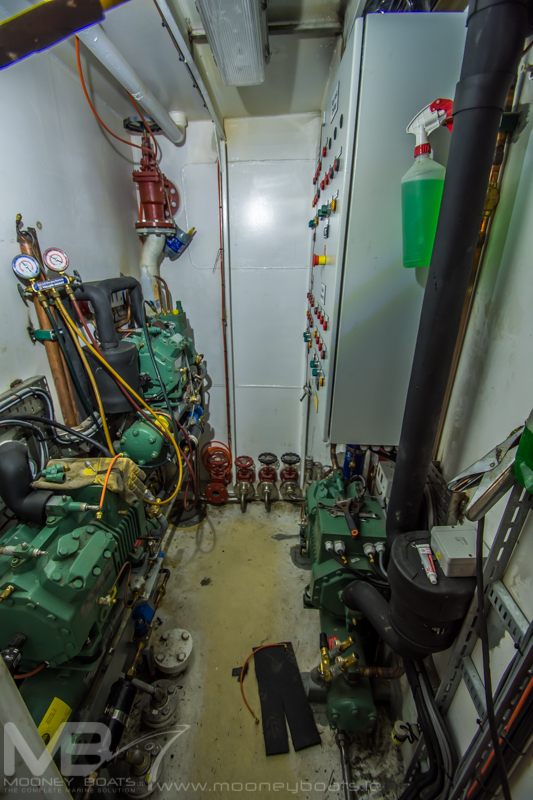 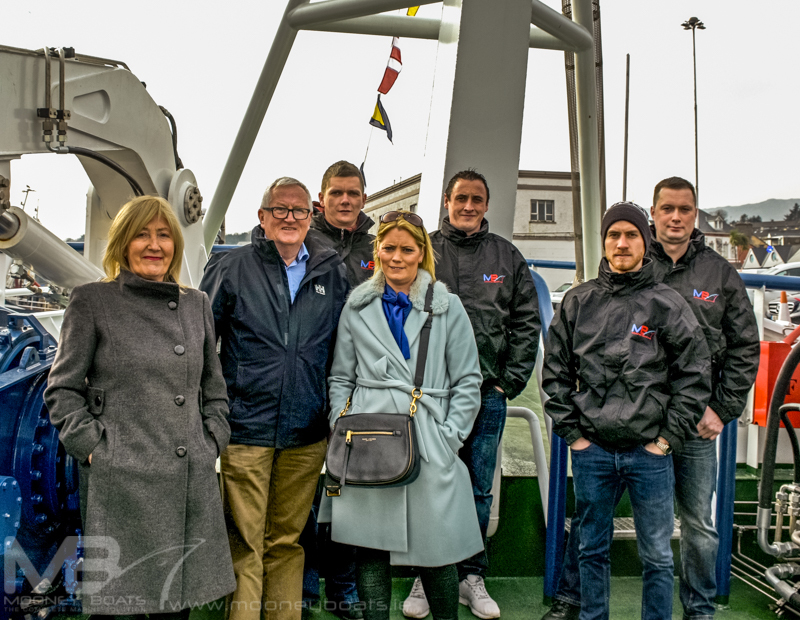 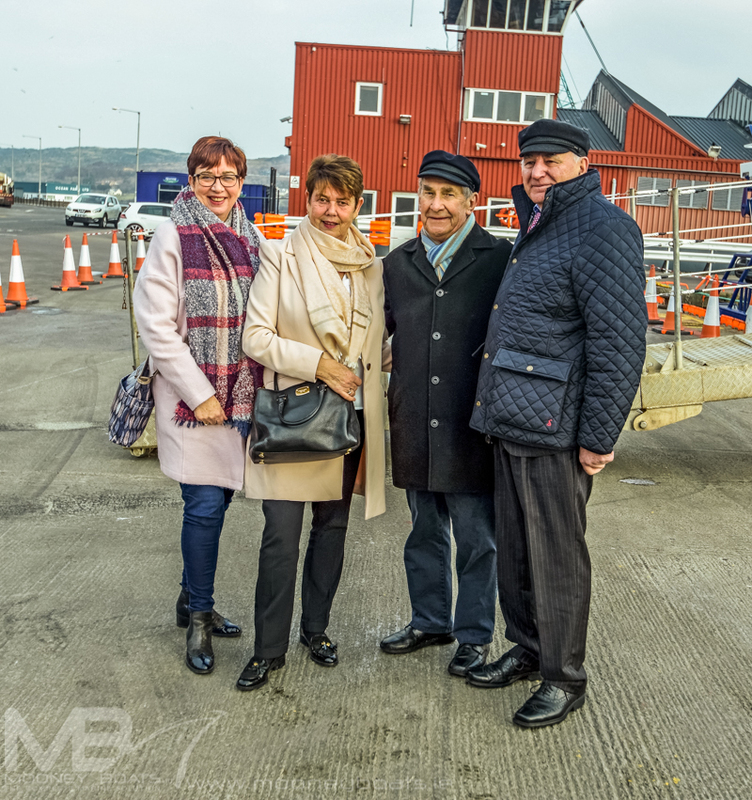 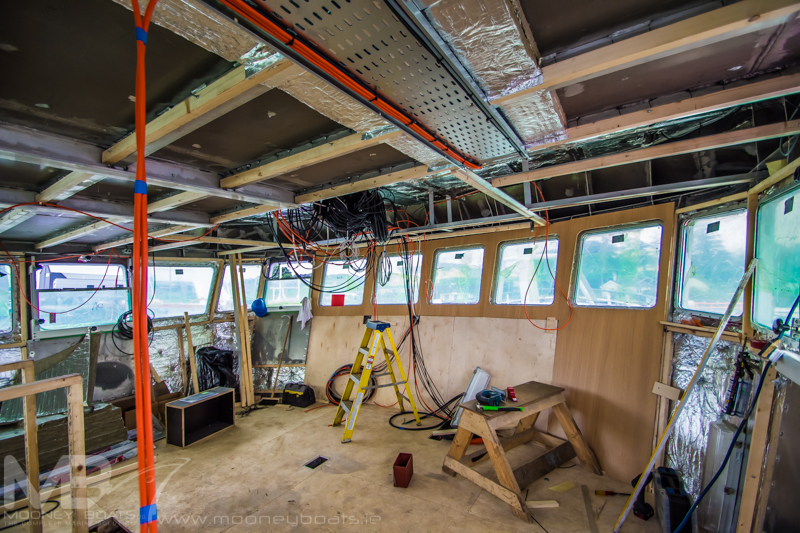 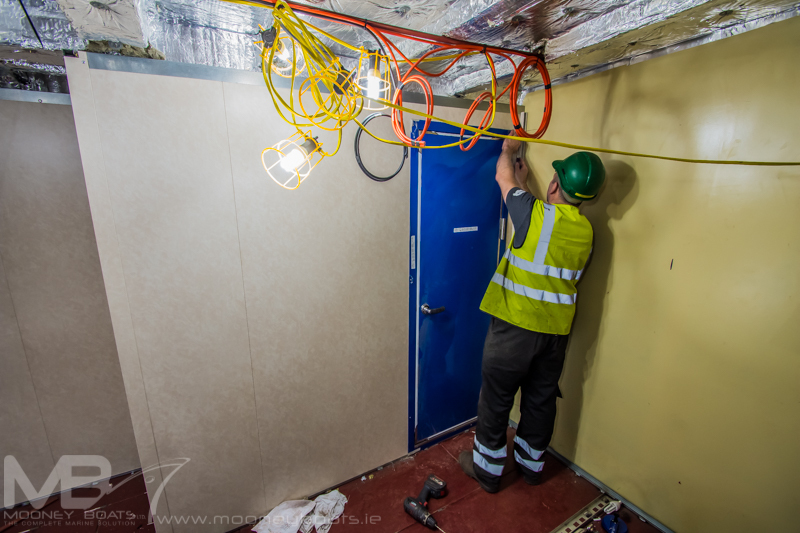 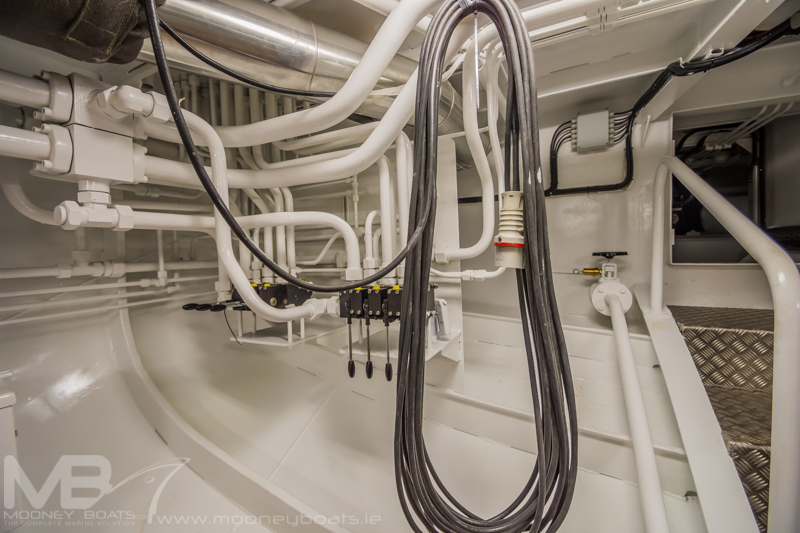 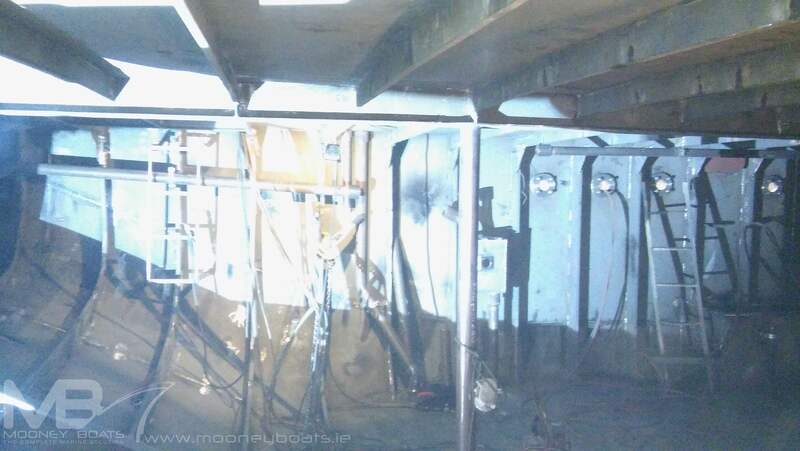 Mooney Boats Ltd electrical engineering supplied and installed the complete wiring system on the vessel which included main distribution board, 220 volt board and 24 volt board. 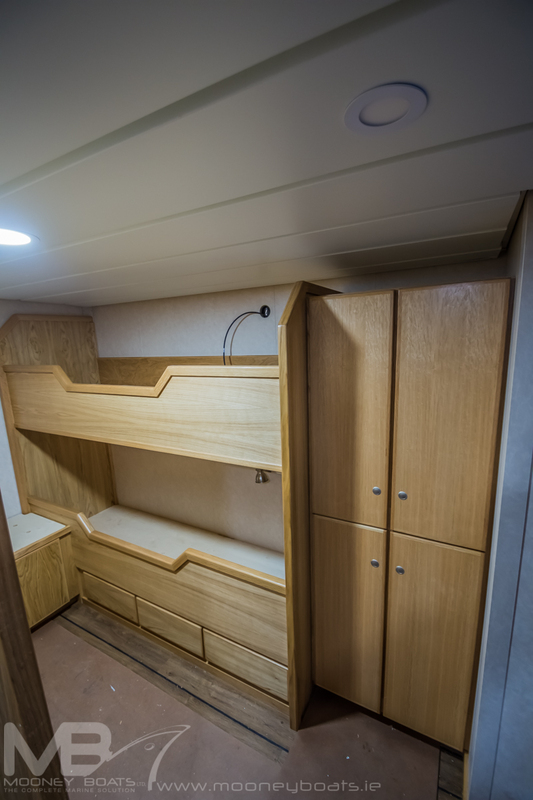 The vessel was fitted with LED lighting throughout the vessel which was all supplied from the yards marine chandlery store. 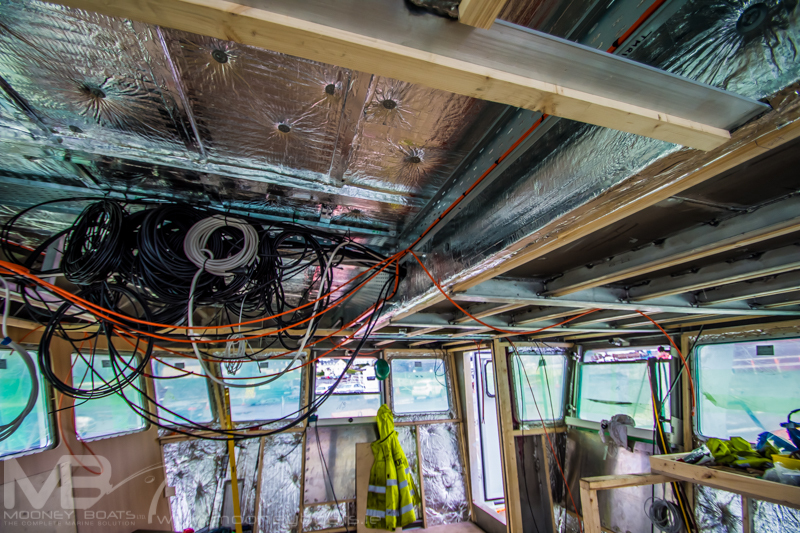 All wiring was completed to BV standards and inspected on completion. 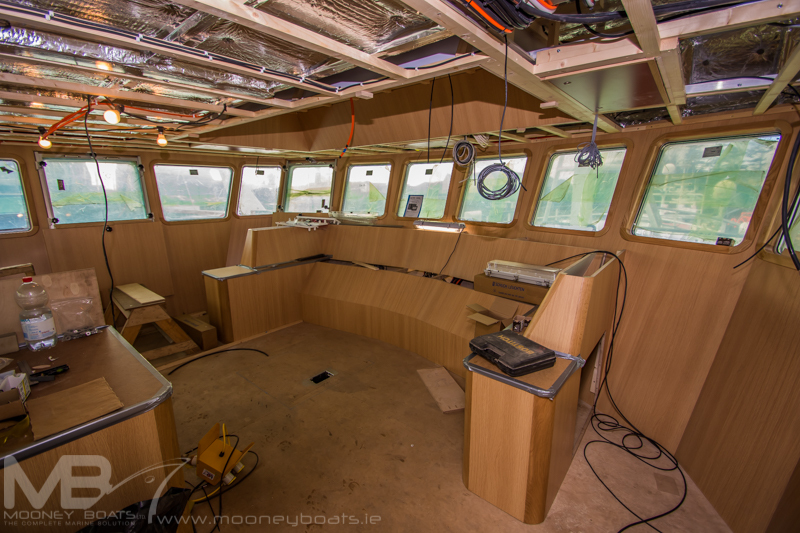 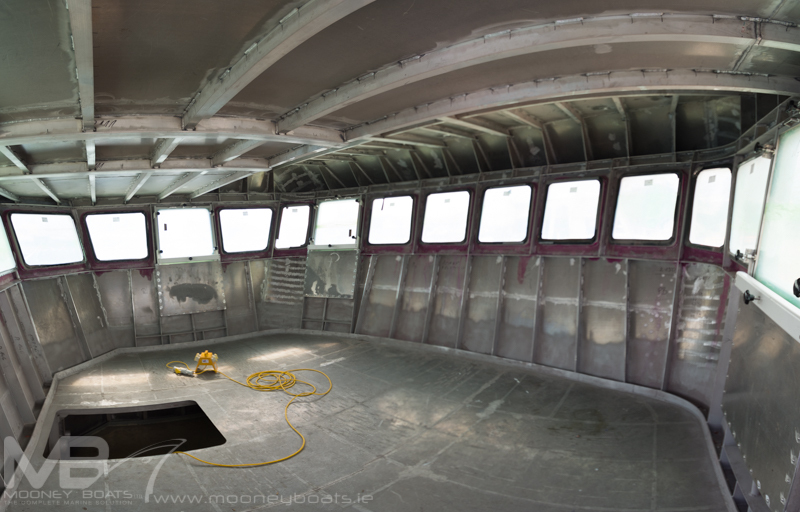 The internal fitout on the vessel is exceptional and was all completed by Mooney Boats Ltd carpenters with everything made in house. 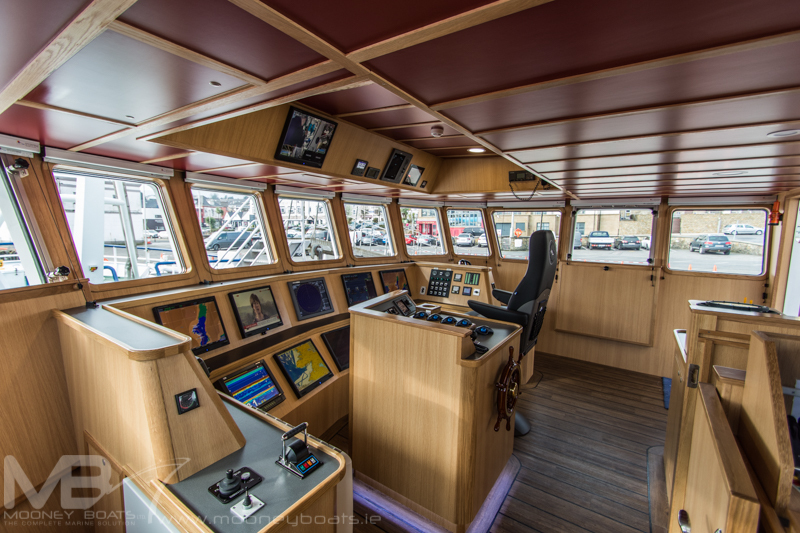 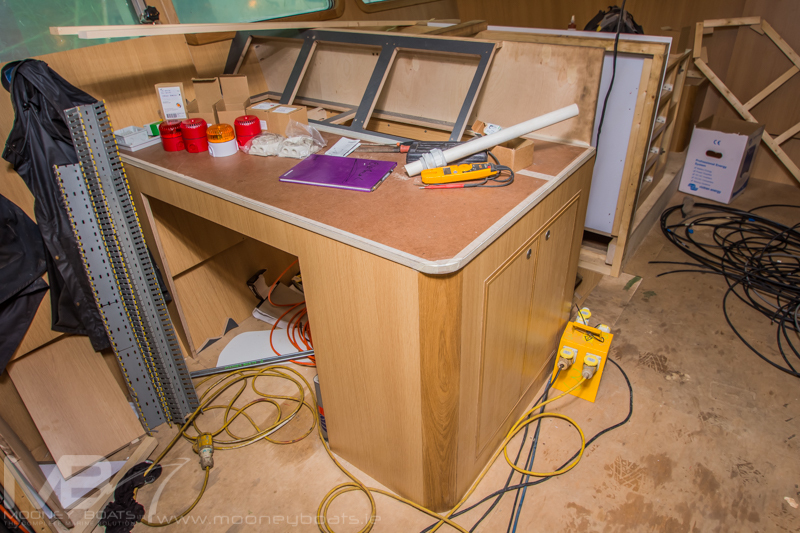 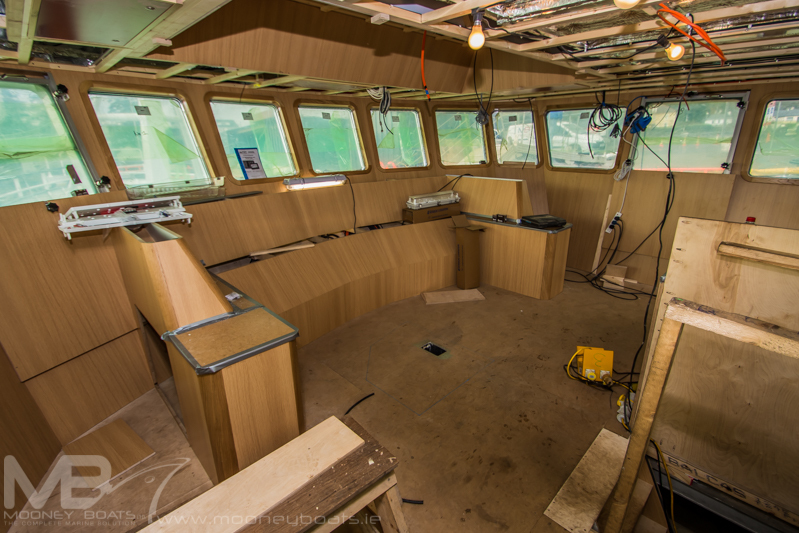 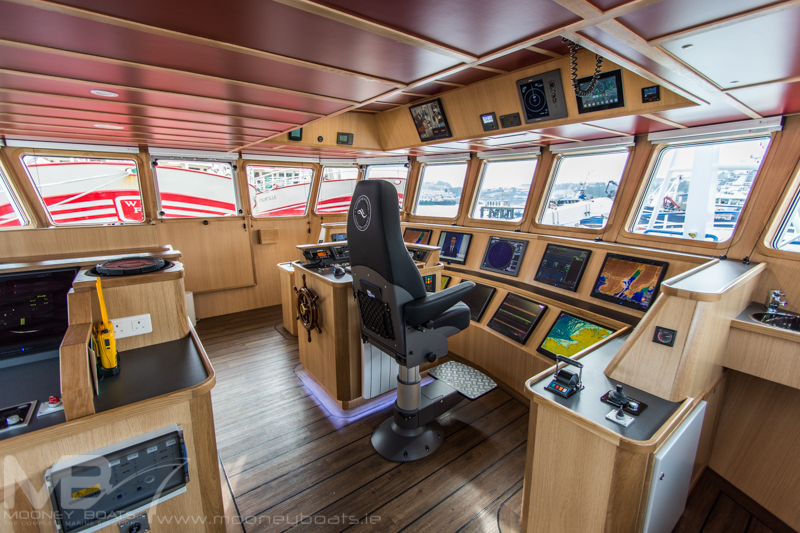 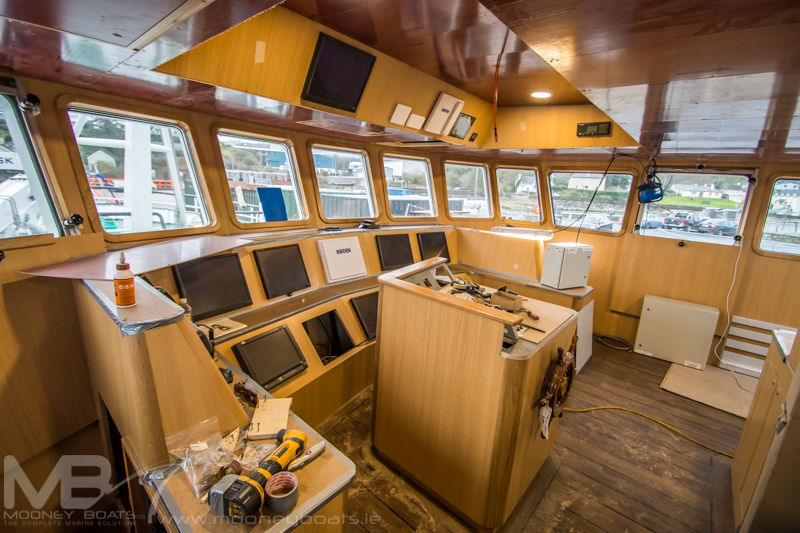 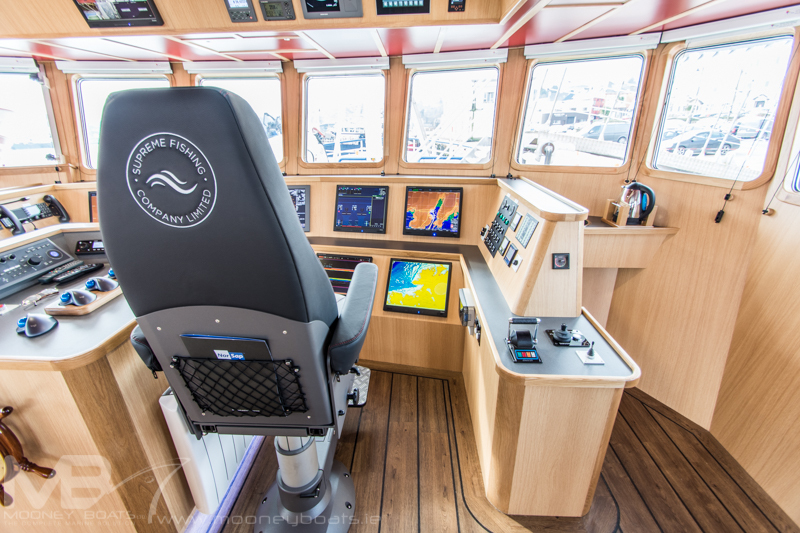 The wheelhouse is finished with solid oak and the console and control stations were finished to a bespoke design for the skipper. 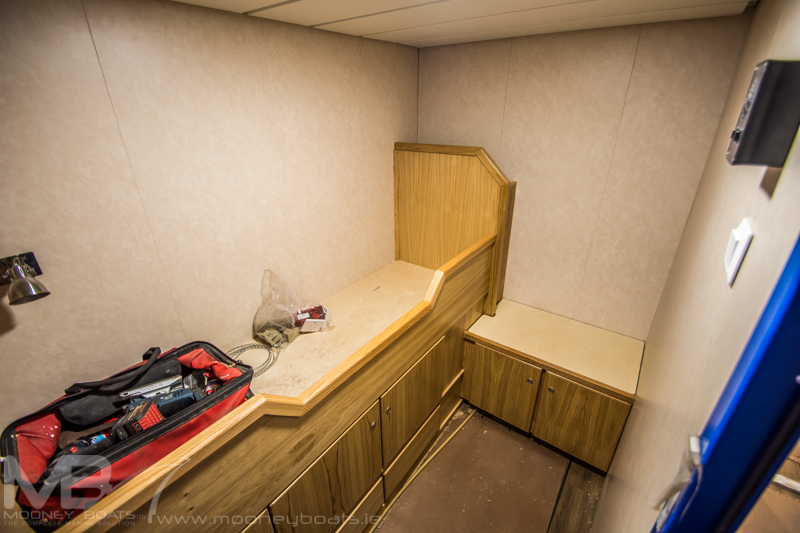 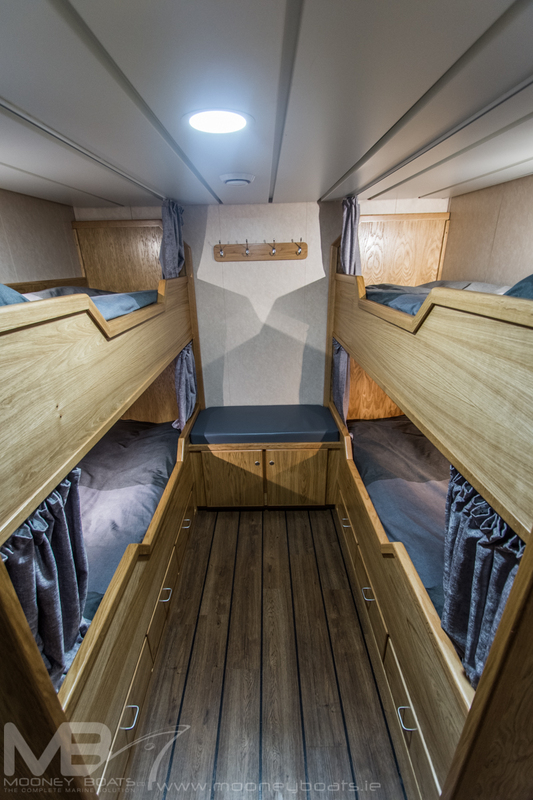 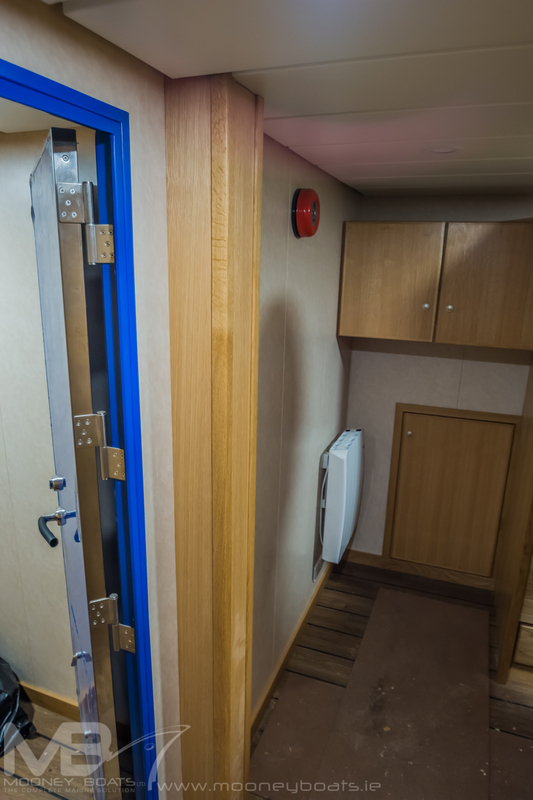 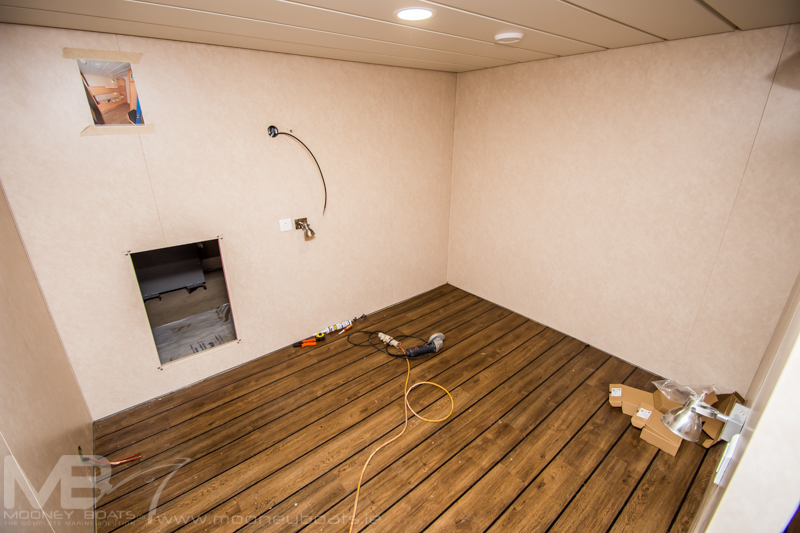 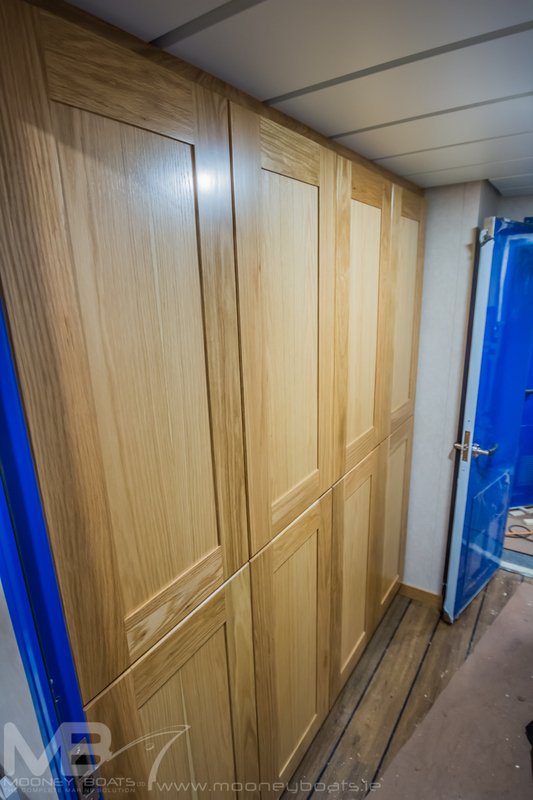 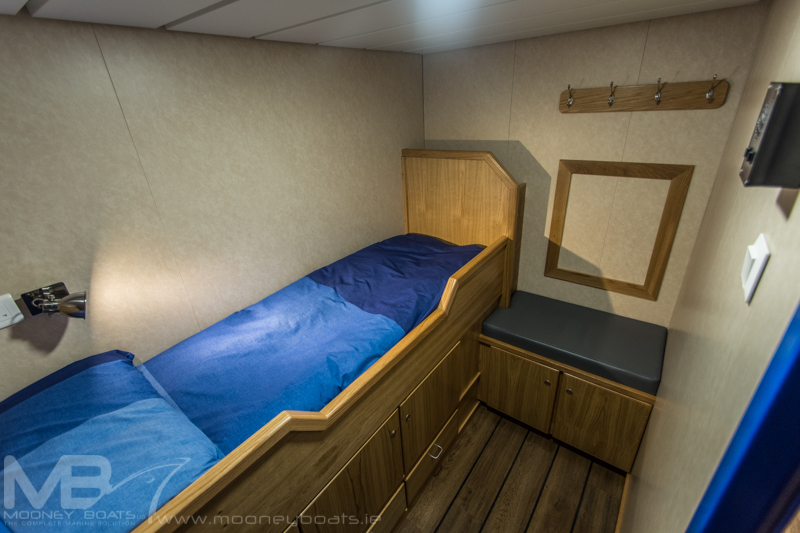 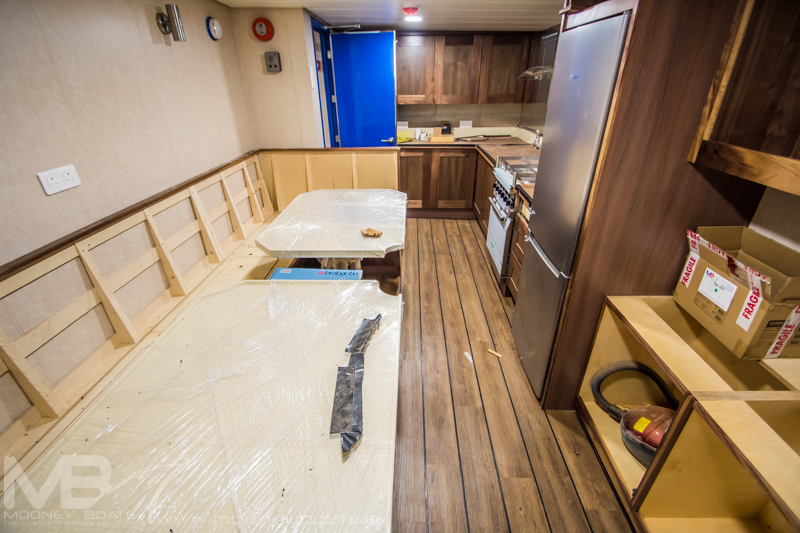 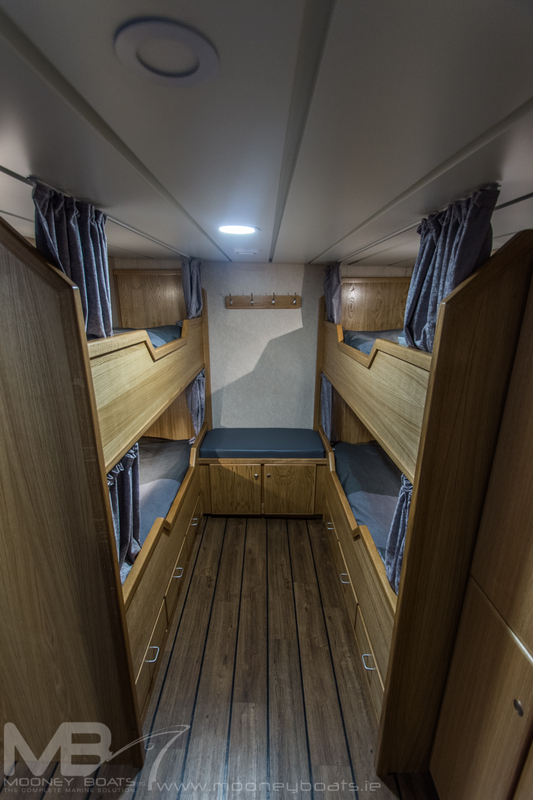 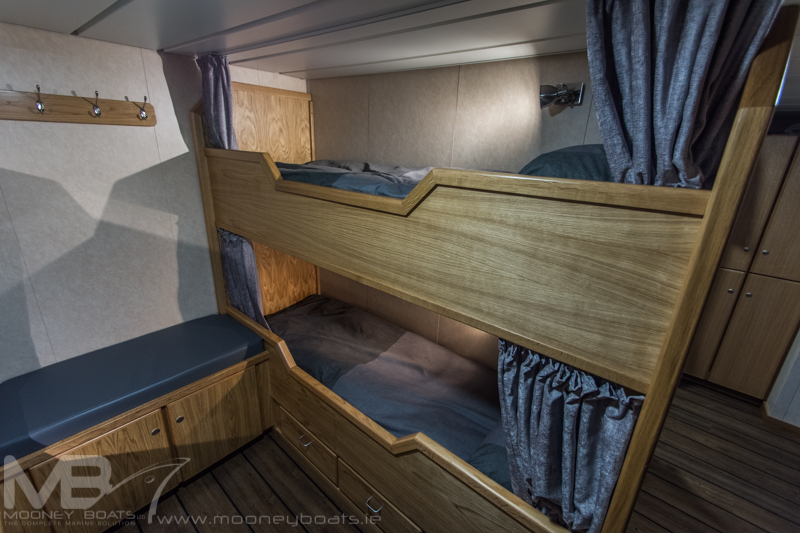 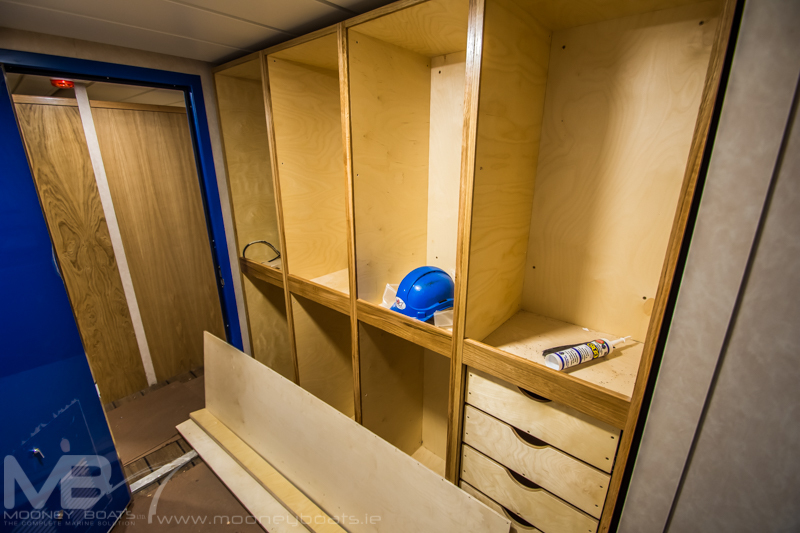 The accommodation for the crew is plush in the cabins areas and again finished in solid oak timberwork. 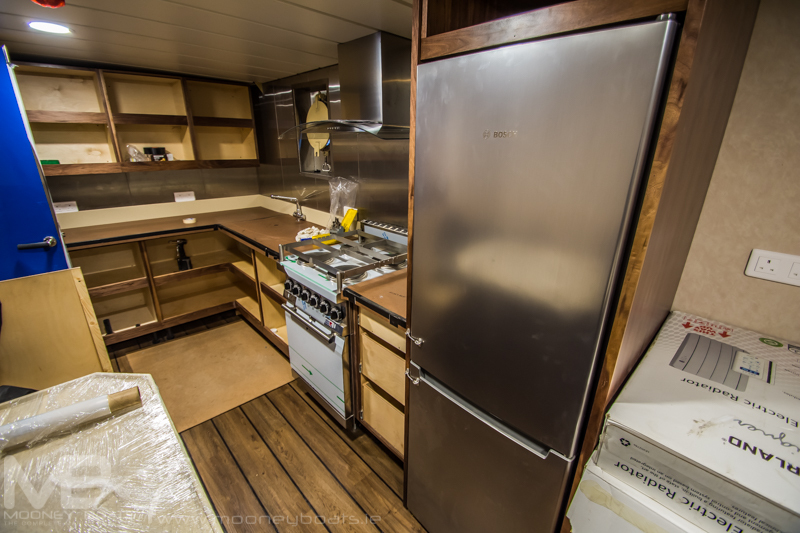 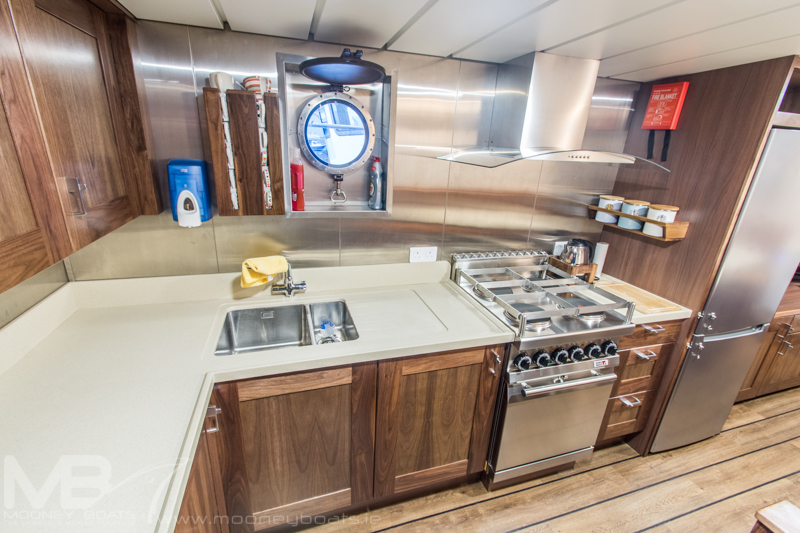 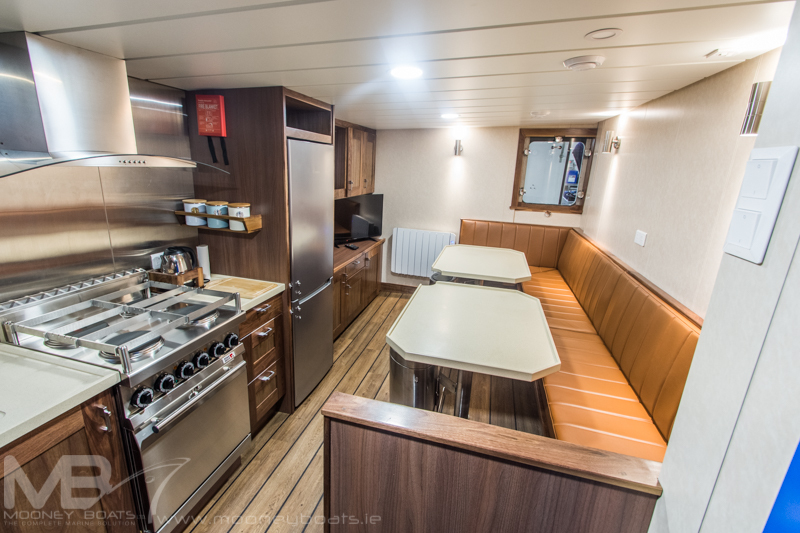 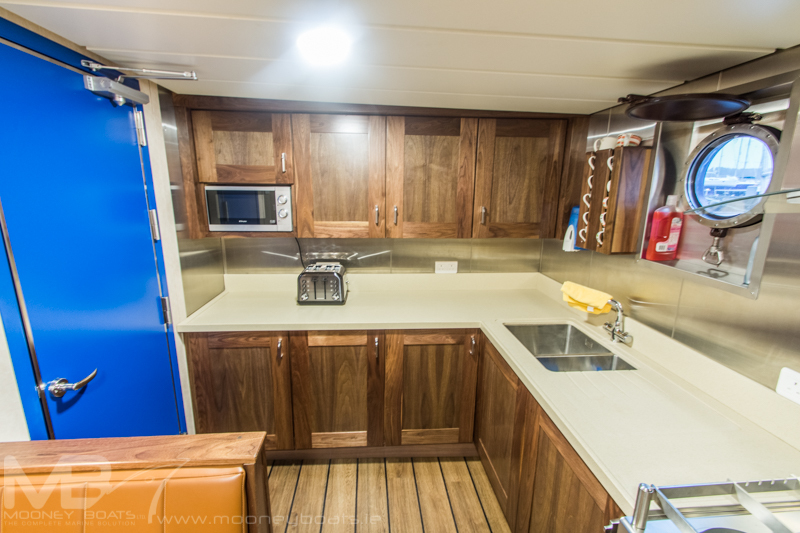 The galley was fitted out in walnut finish with solid walnut doors and seating. 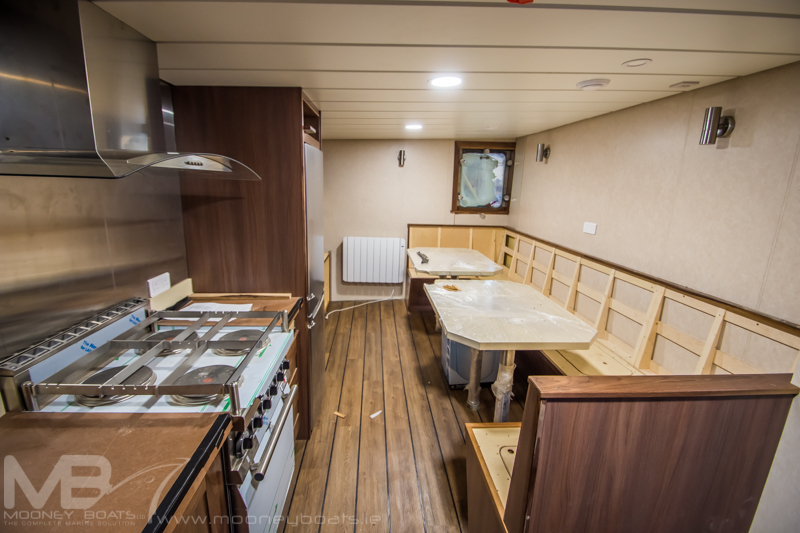 The counter top and tables are in a cream resin moulded design which was again bespoke to the vessel and walnut colour leather seating. 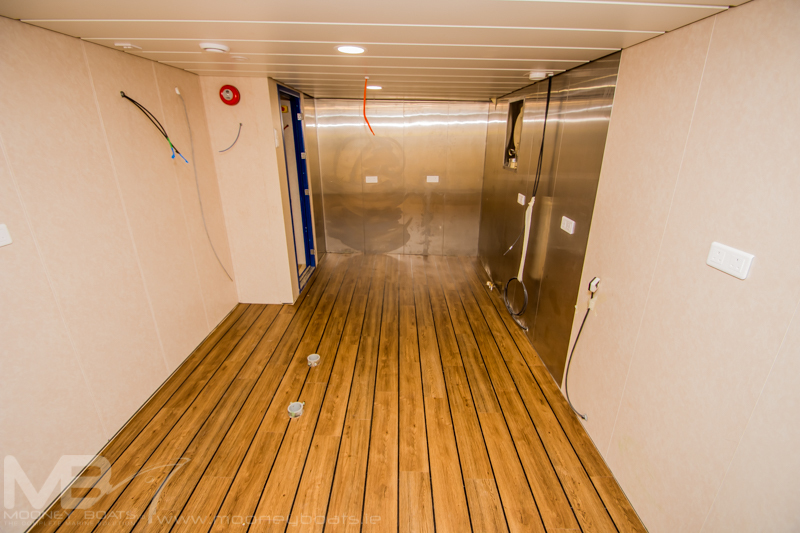 The flooring on the vessel is Karanden wood effect throughout. 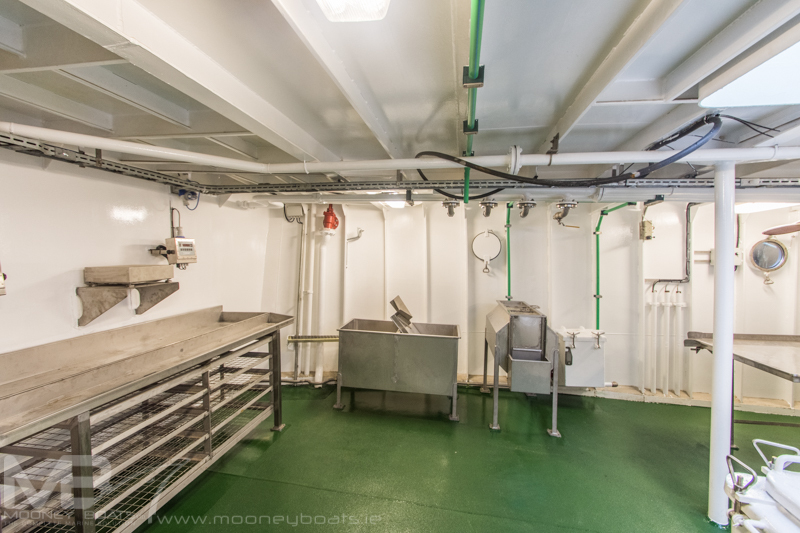 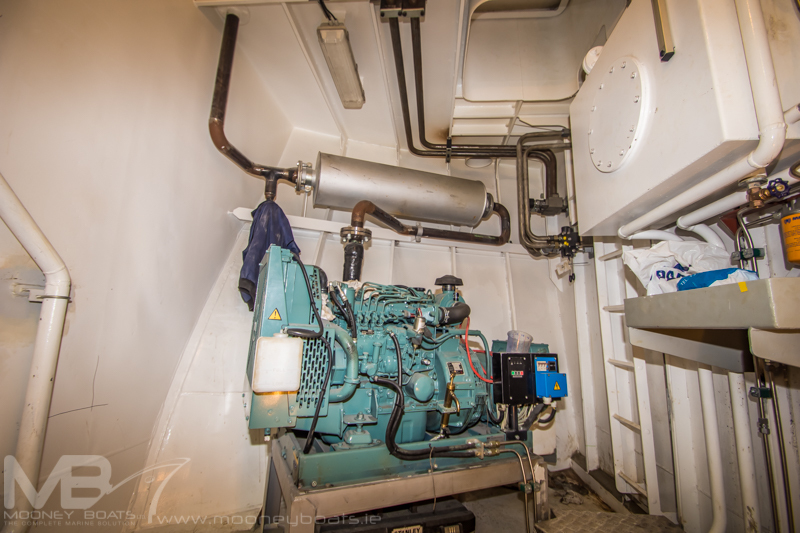 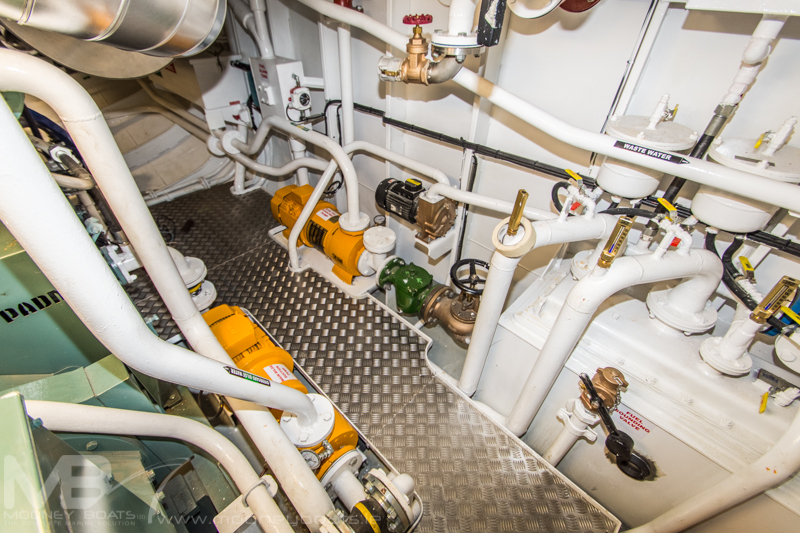 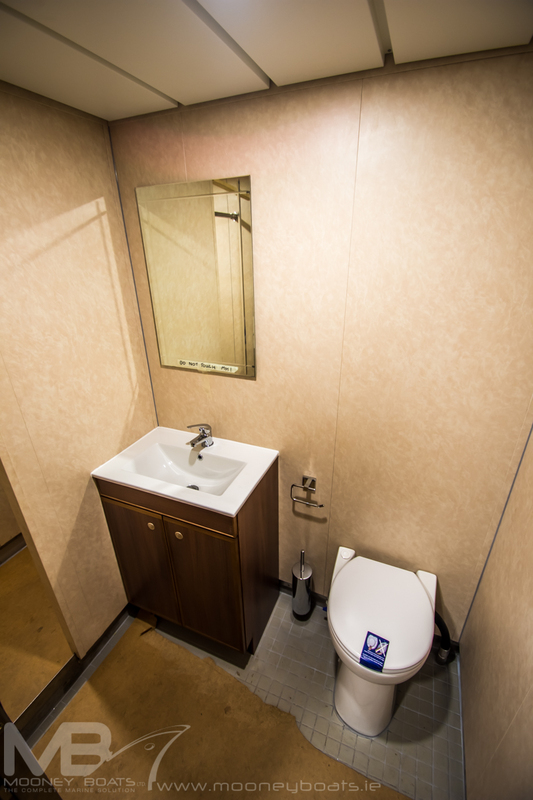 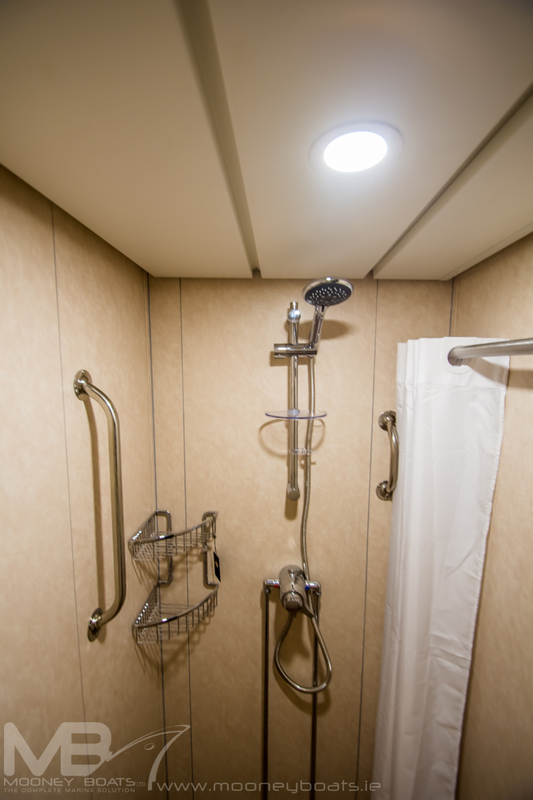 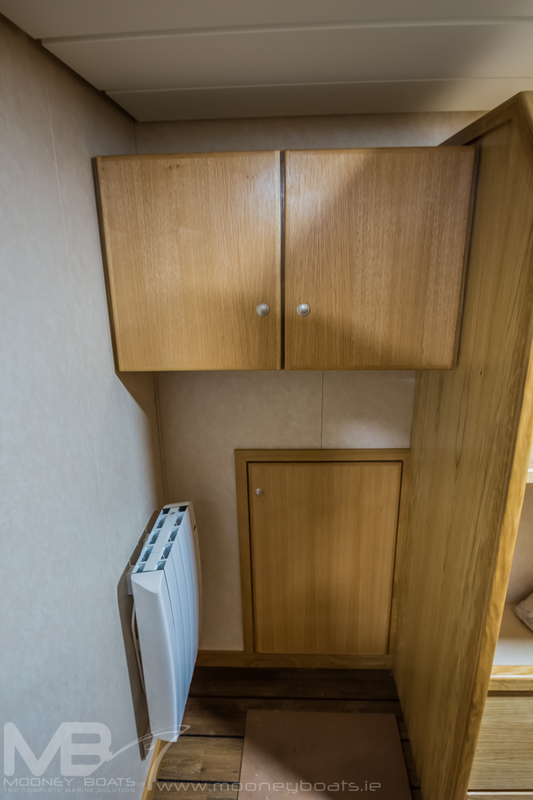 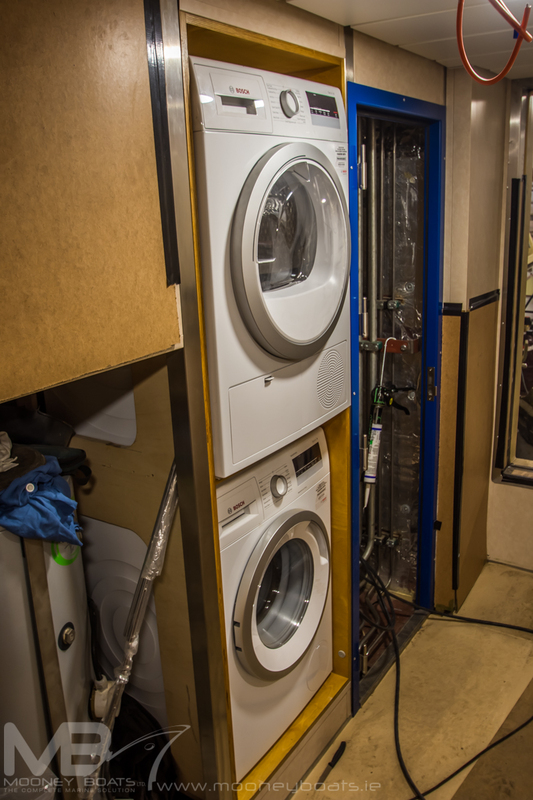 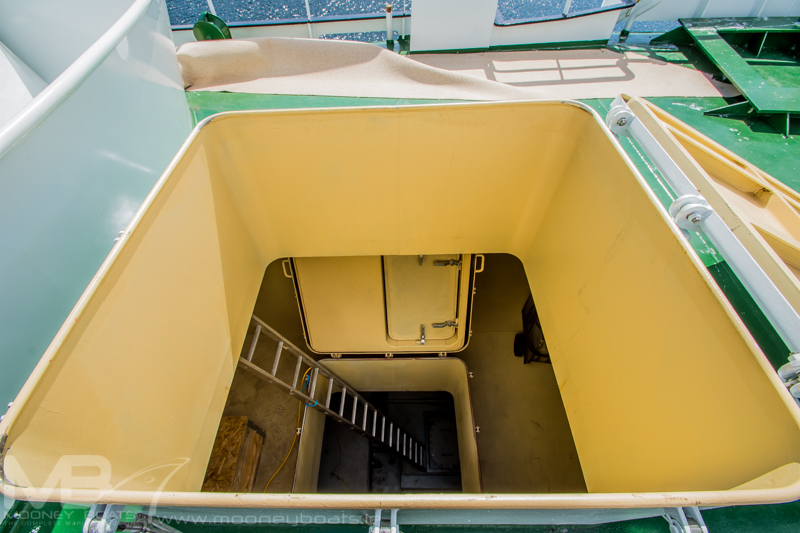 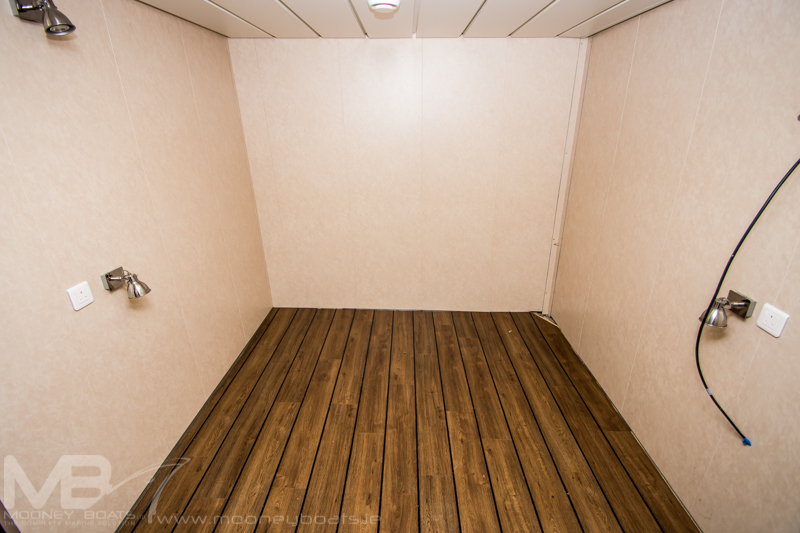 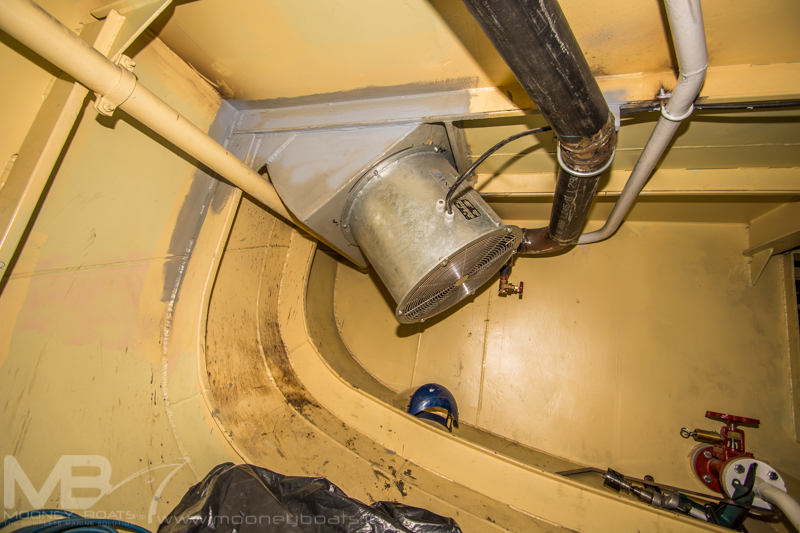 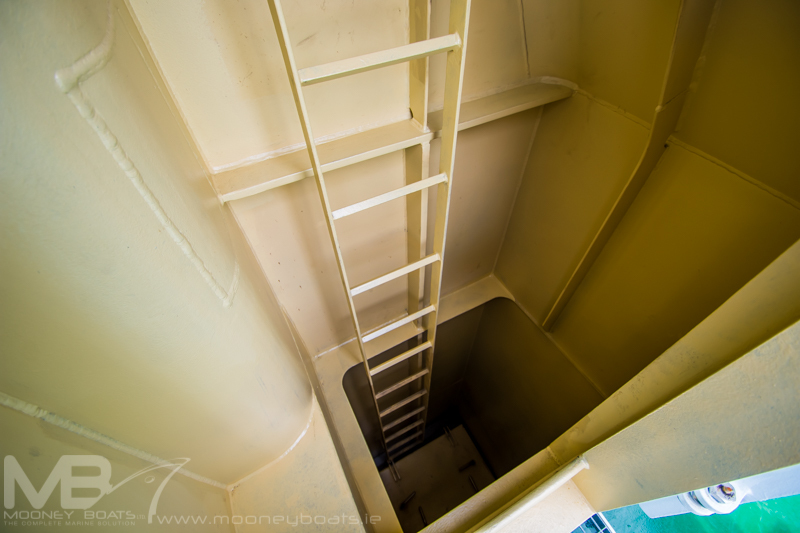 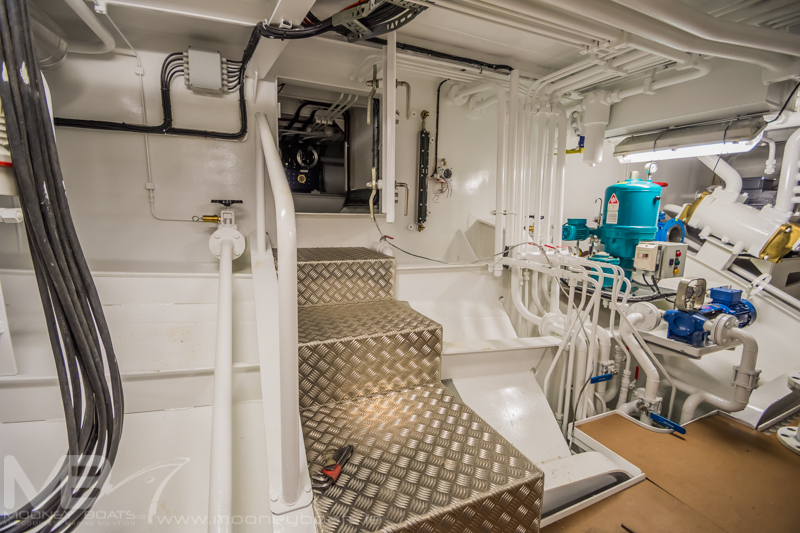 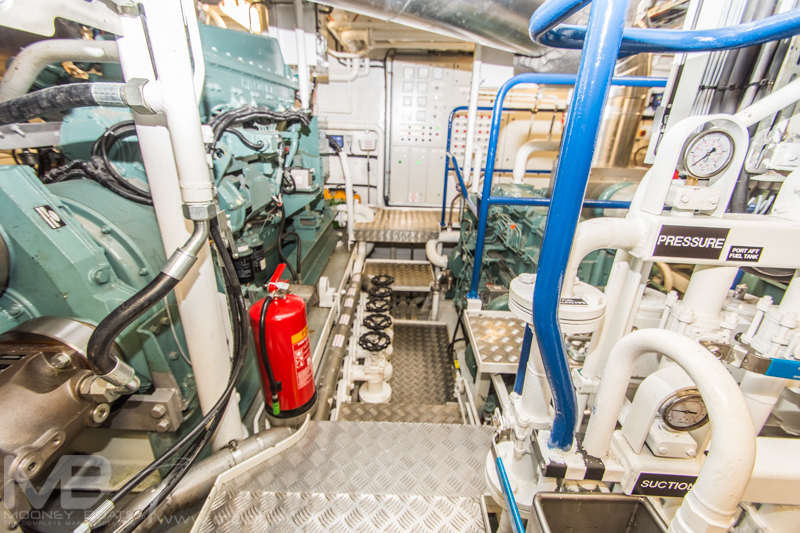 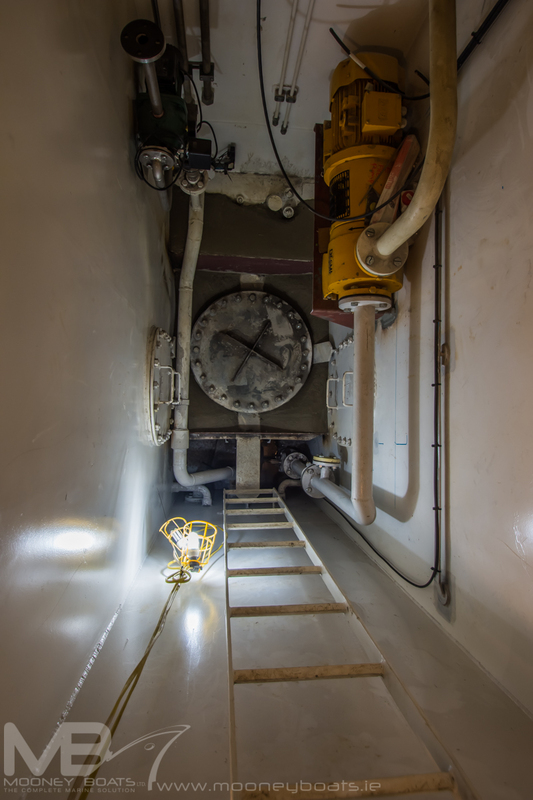 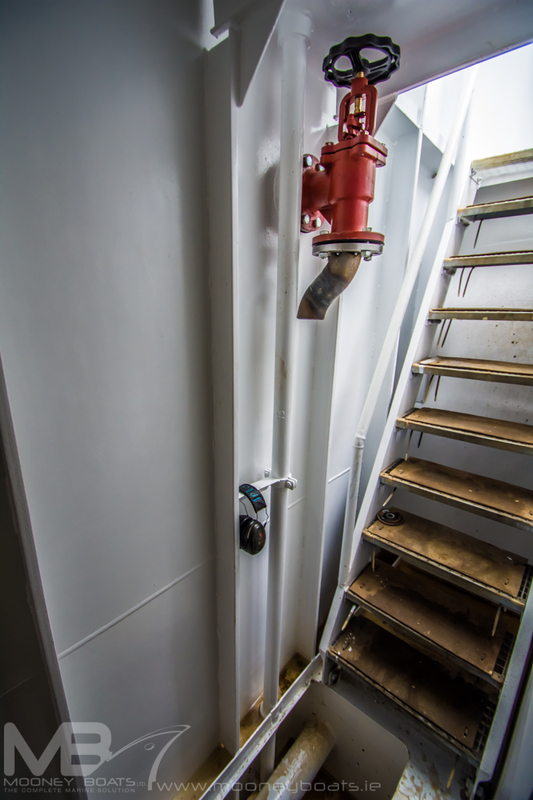 There is a large toilet and shower area to starboard side of the main deck and also washing machine and tumble drier located under the stairs to the wheelhouse. 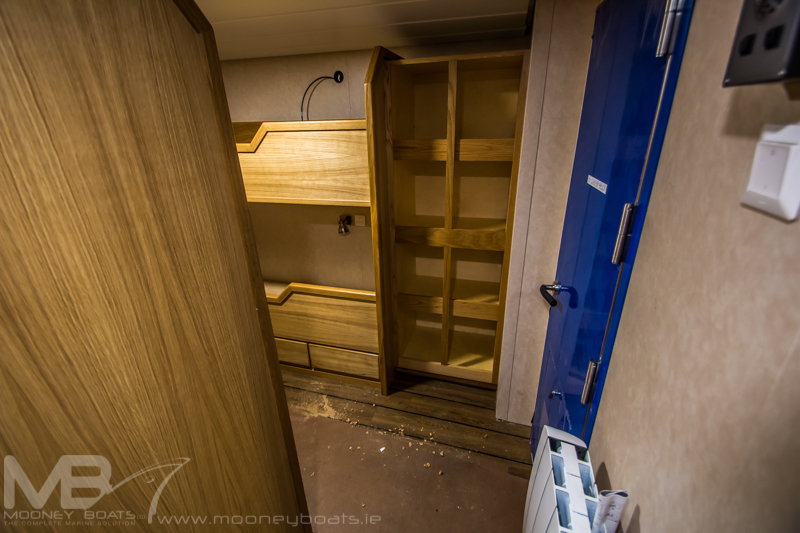 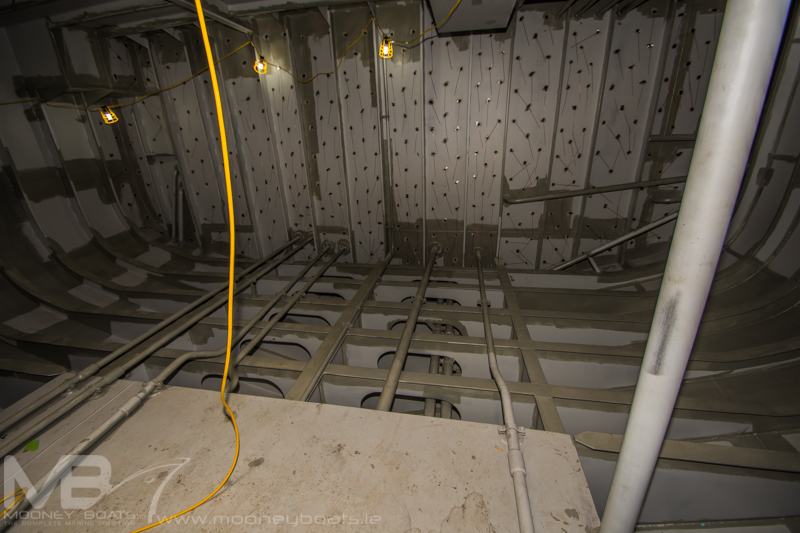 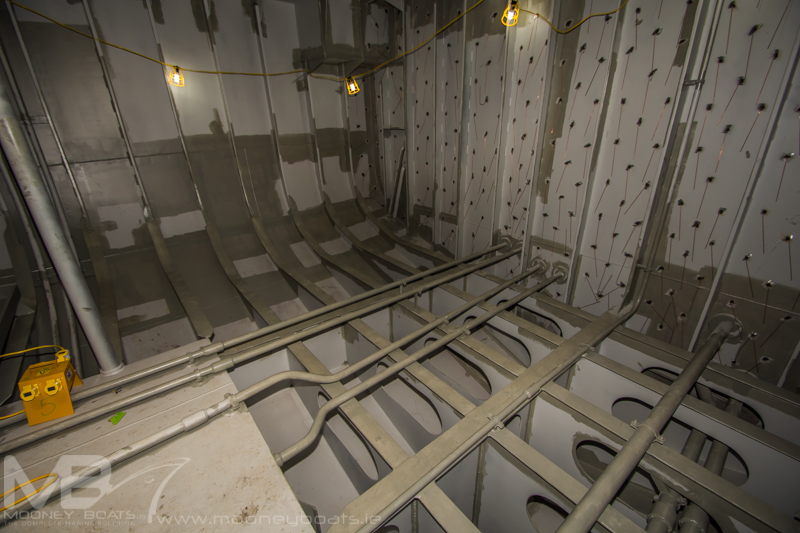 All space on the vessel was utilised to the maximum and the internal finish is really something to be desired. 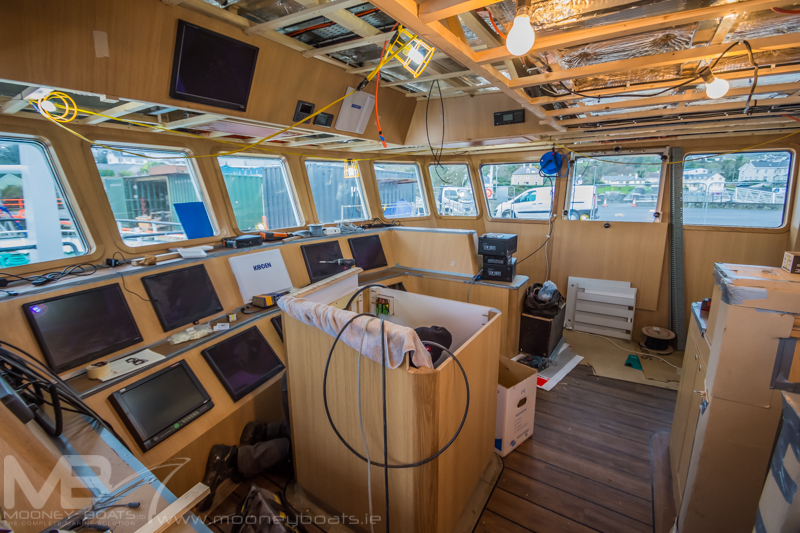 Swan Net-Gundry supplied the chandlery and hardware to the boat. 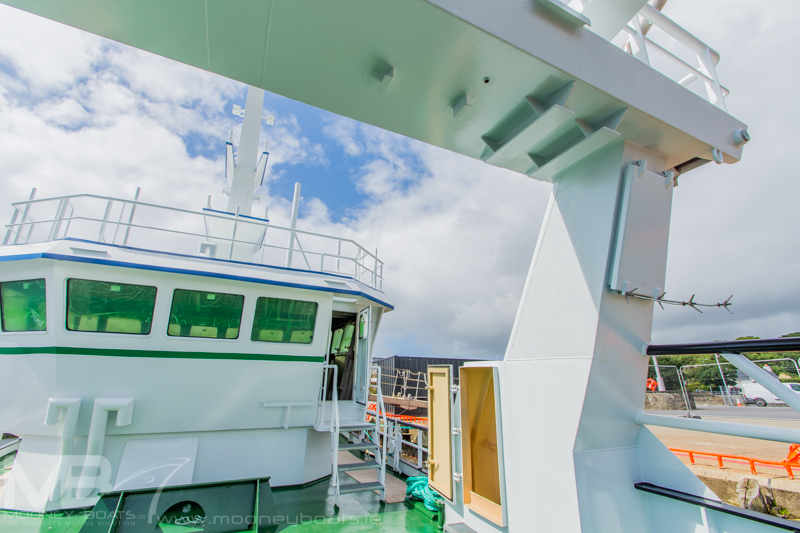 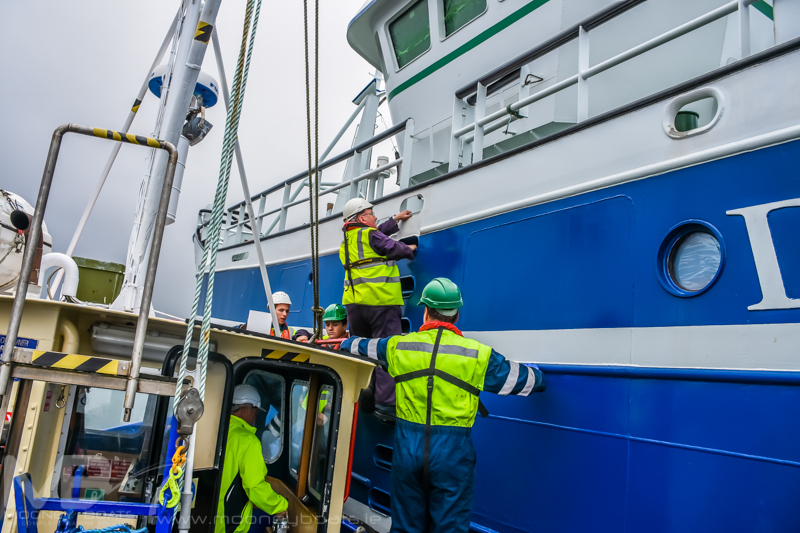 Painting was completed by Corrosion Solutions for the deck and factory deck area with Glen Campbell Painting finishing the hull and superstructure and the paint scheme was designed by Jotun and the paint was supplied by Mooney Boats. 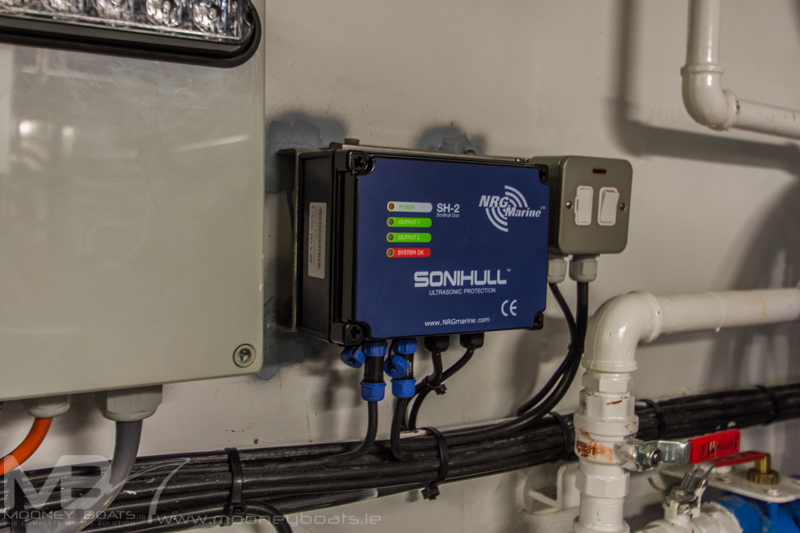 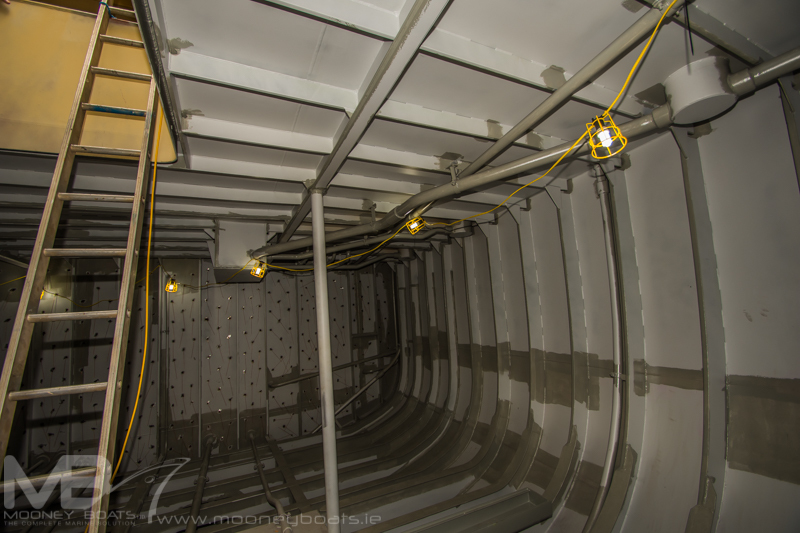 Mooney Boats Ltd also supplied and installed Sonihull Ultrasonic duo units for the vessel. 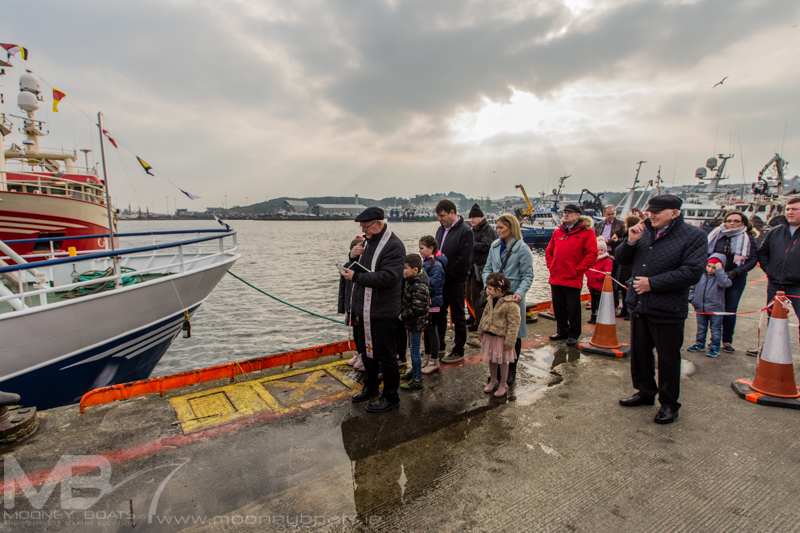 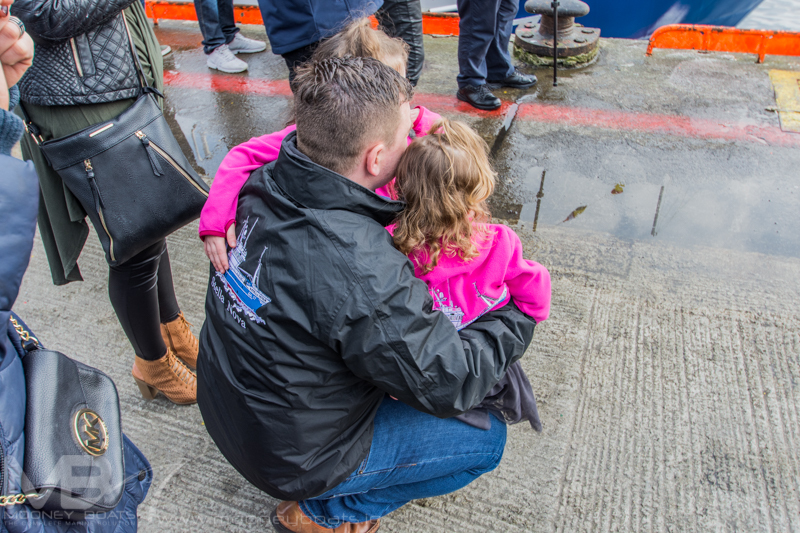 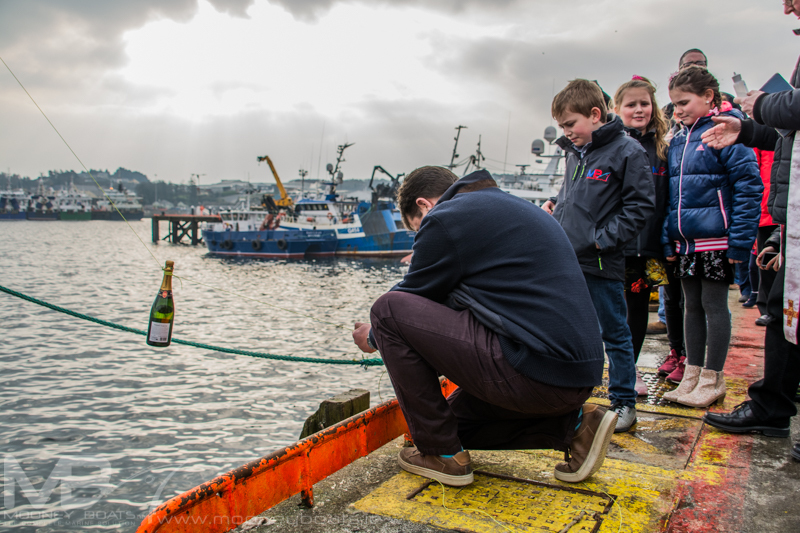 All at the Skipper wish Supreme Fishing Company Ltd, the Connolly family and crew safe and good fishing.